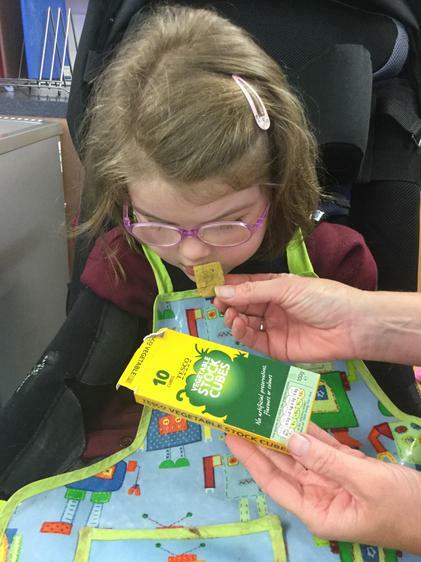 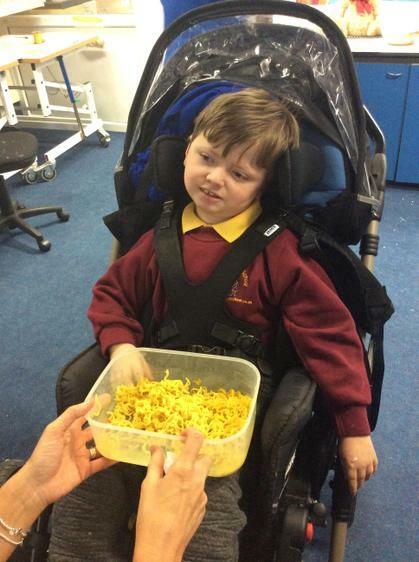 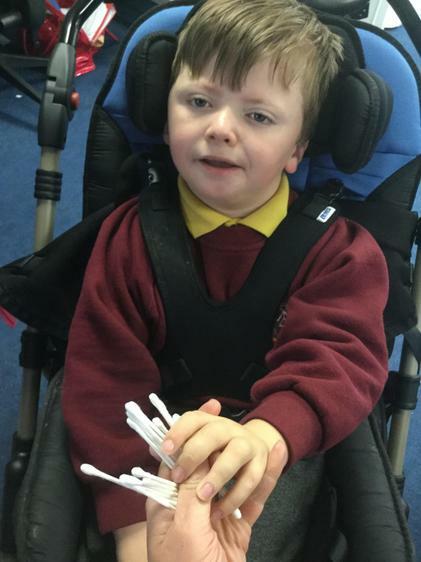 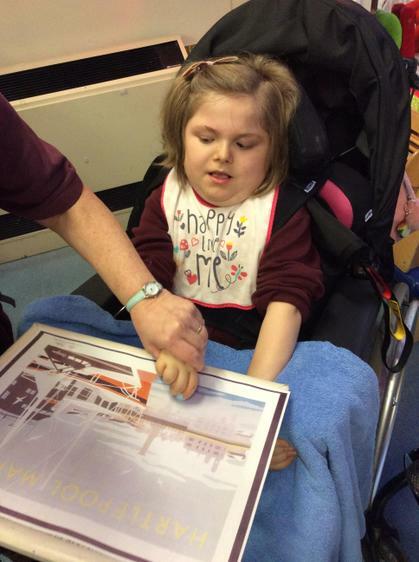 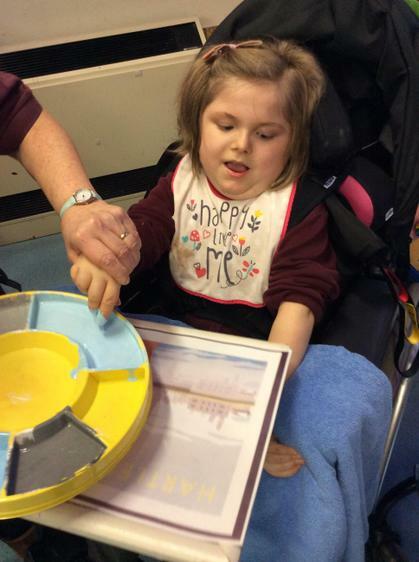 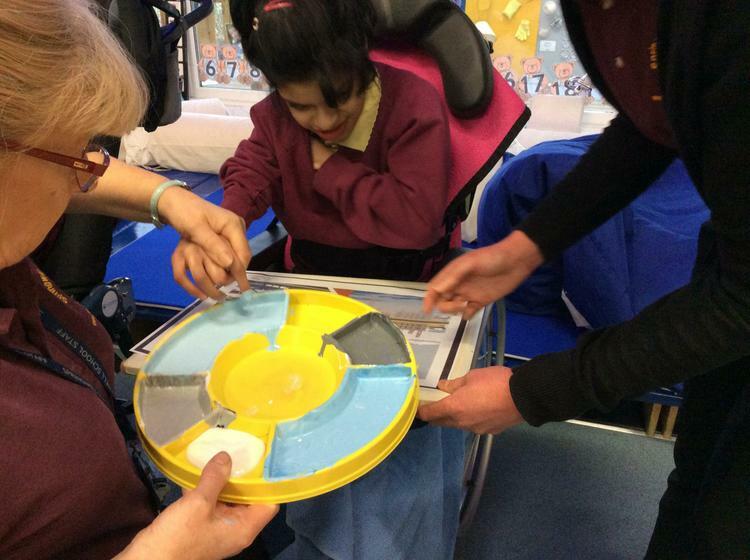 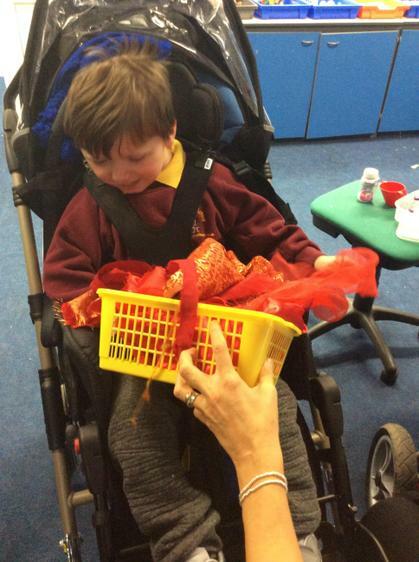 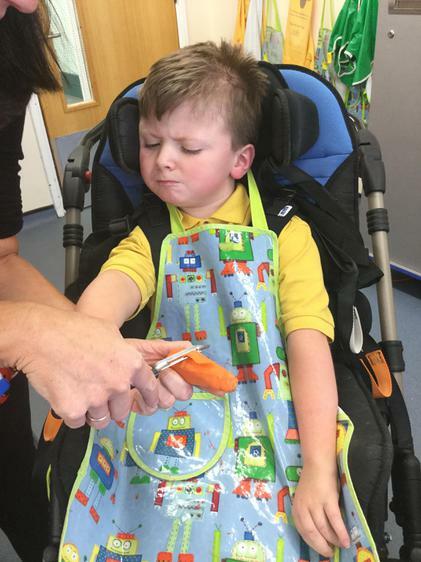 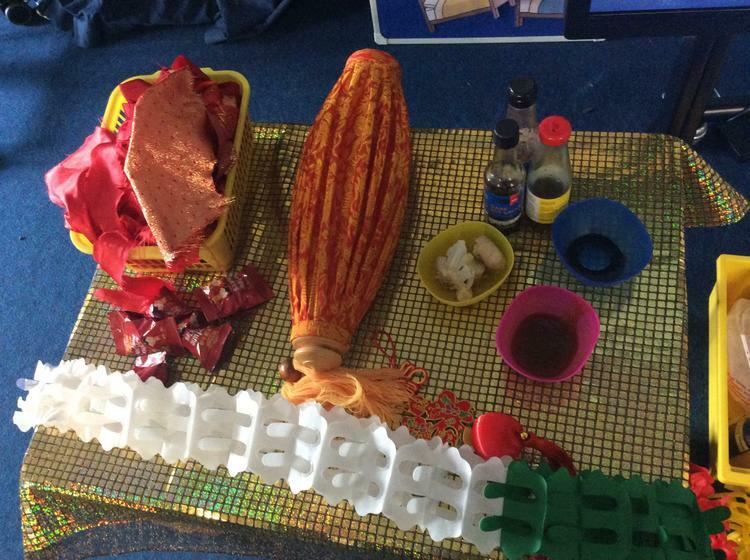 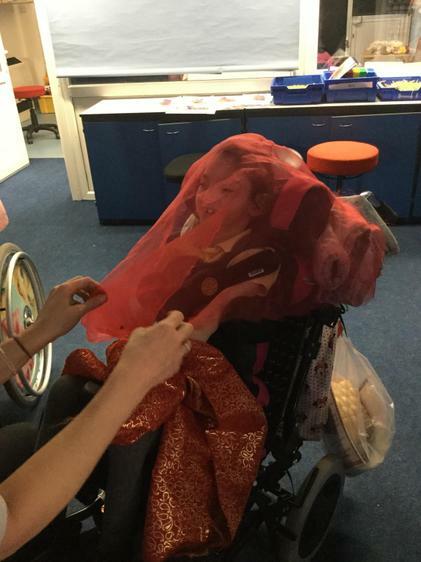 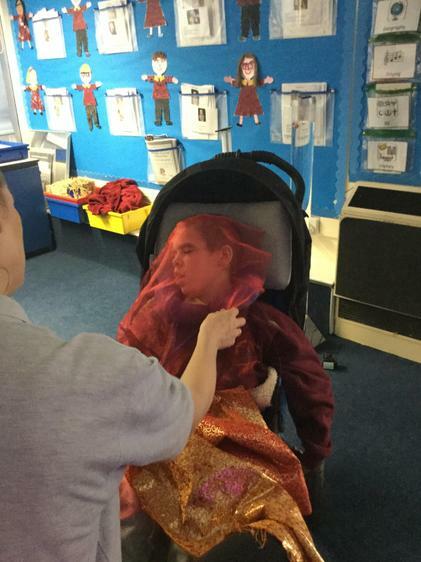 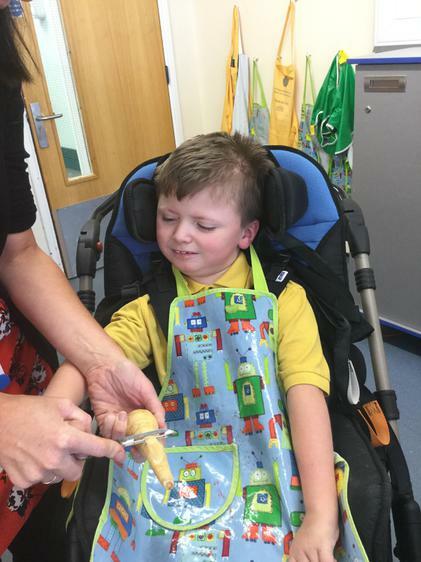 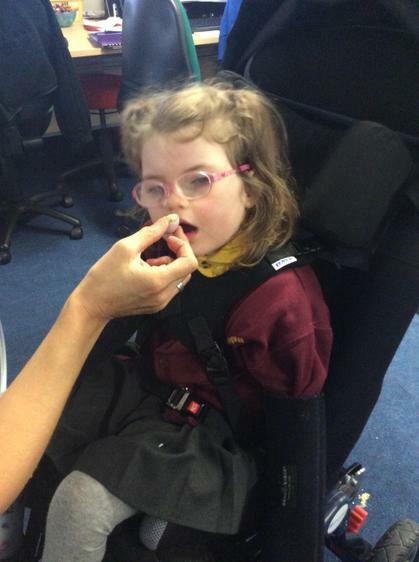 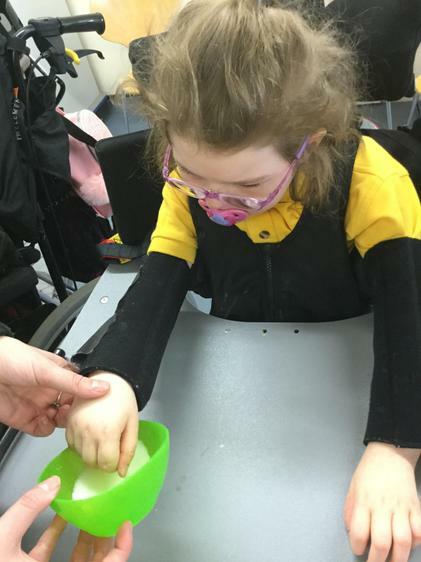 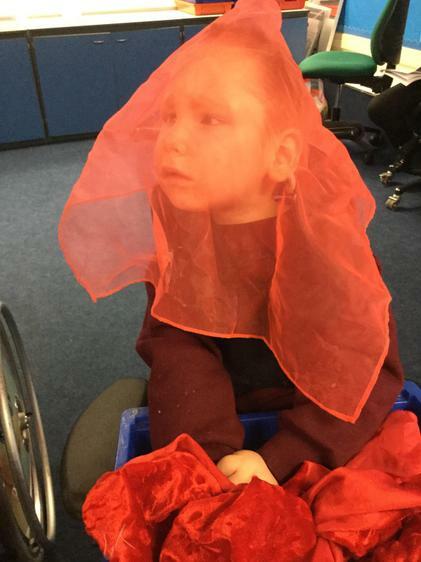 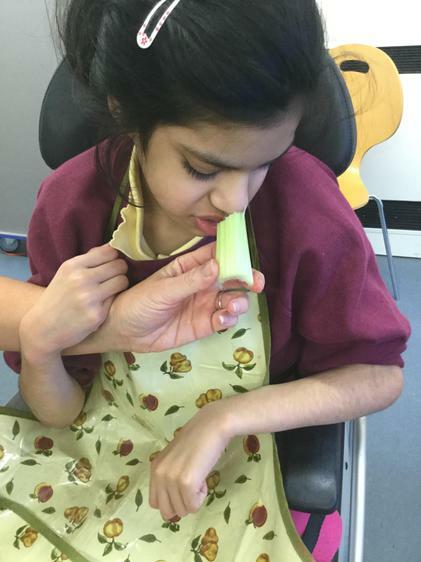 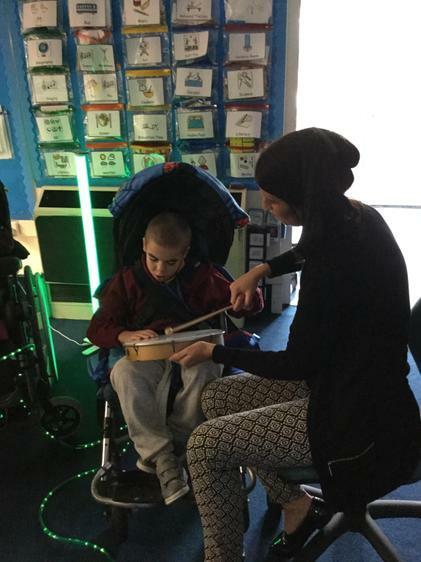 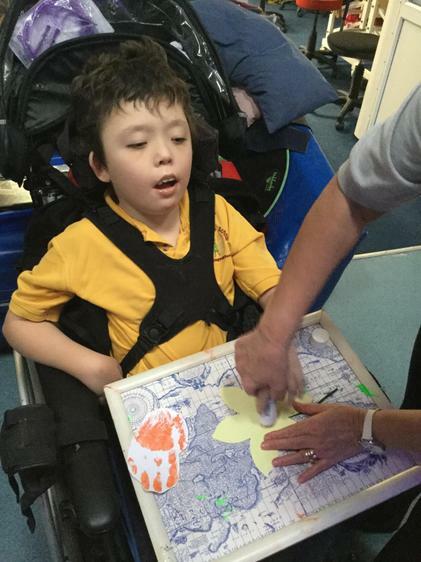 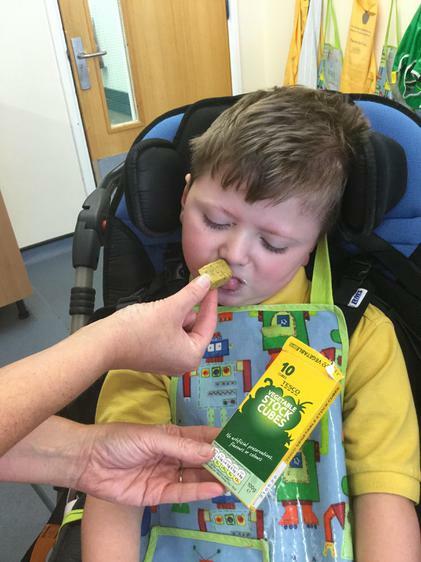 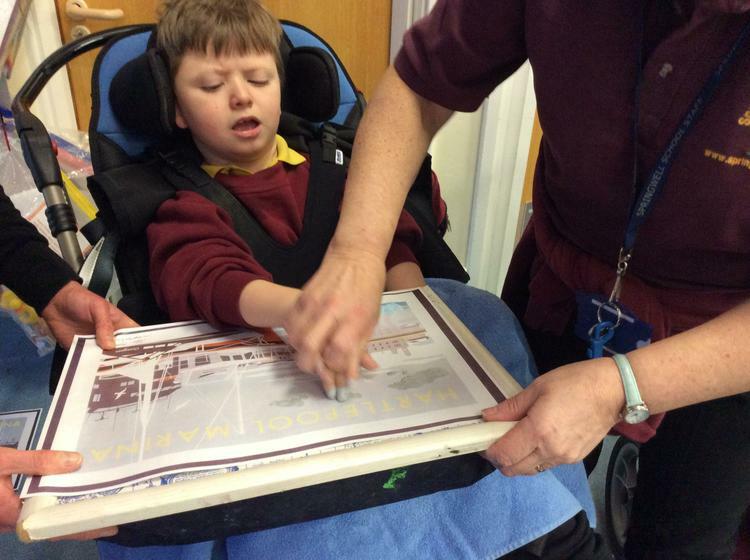 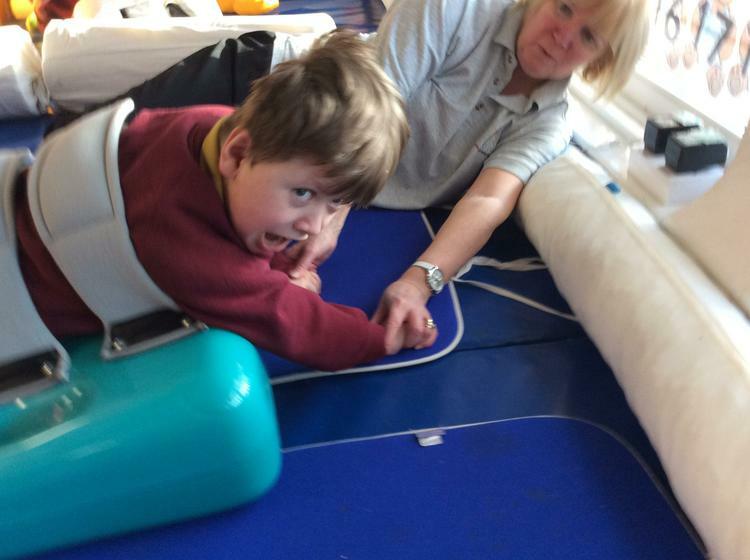 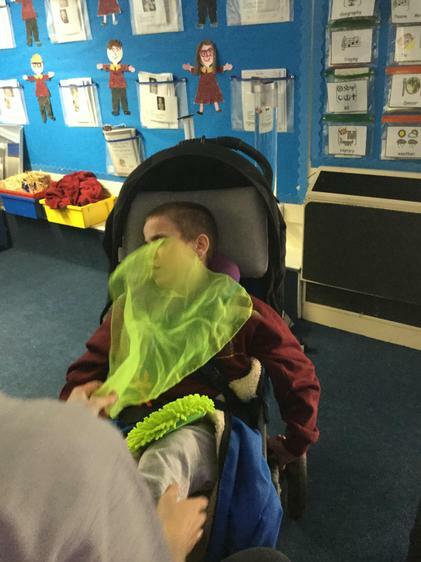 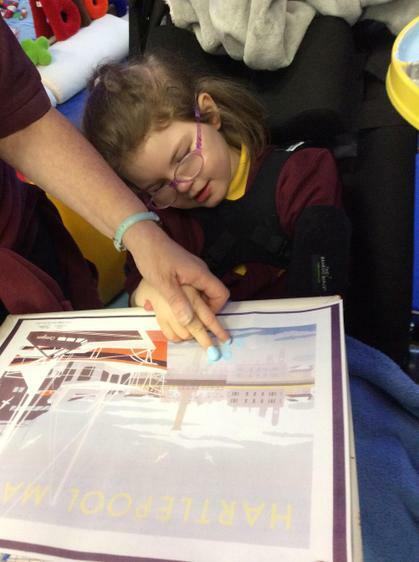 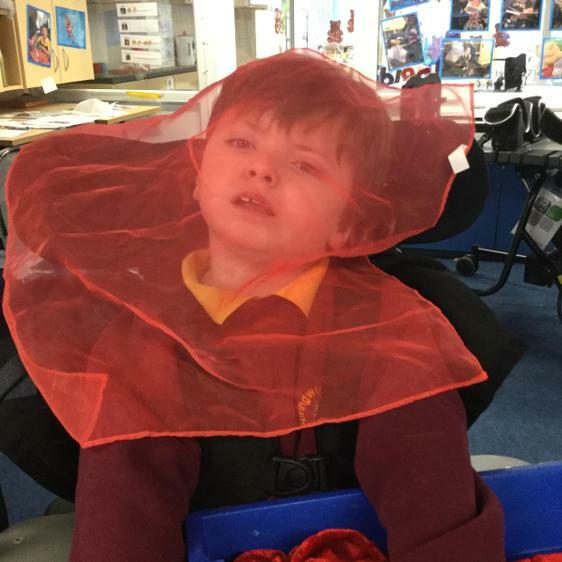 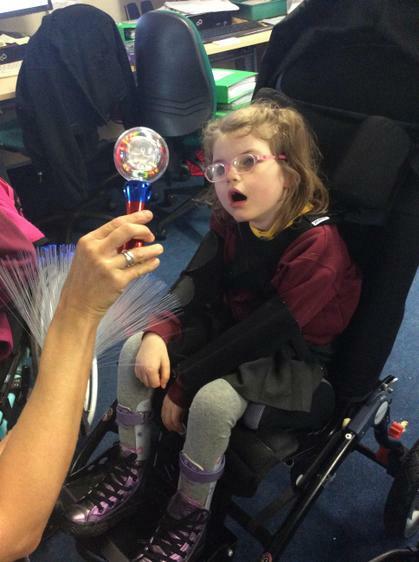 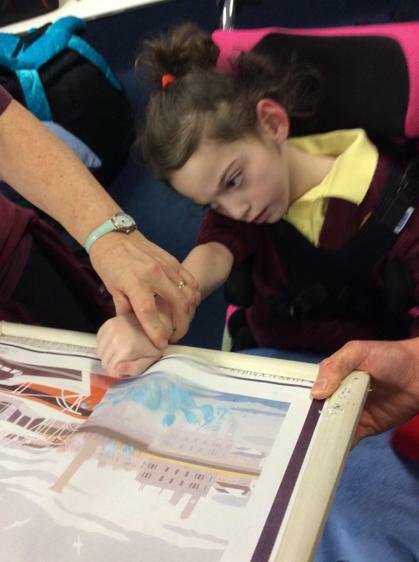 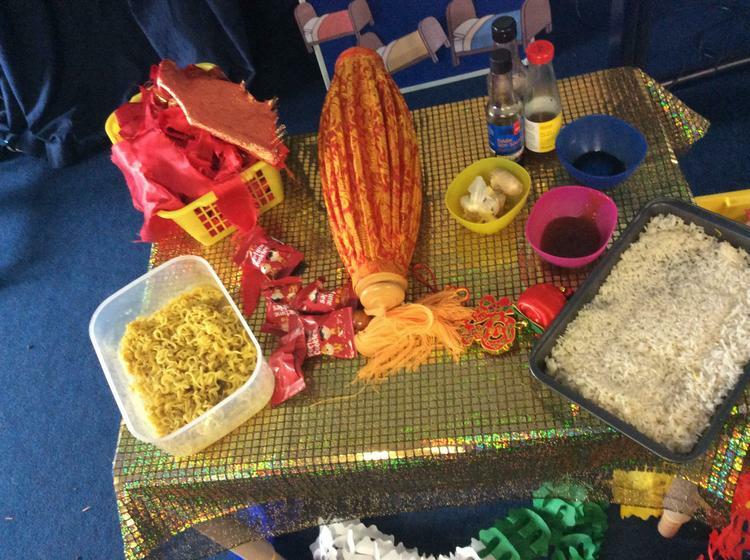 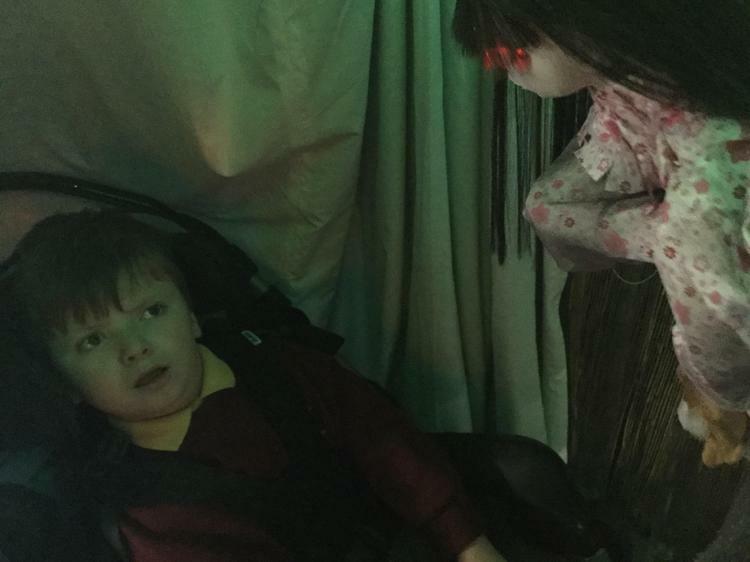 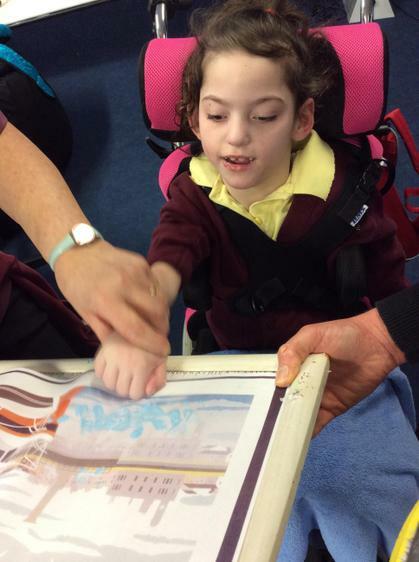 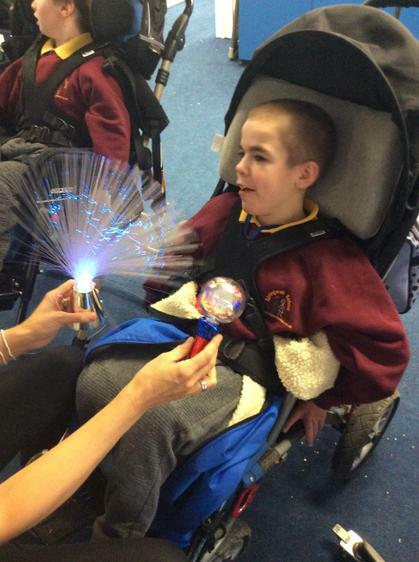 All the children follow an individualised multi-sensory curriculum. 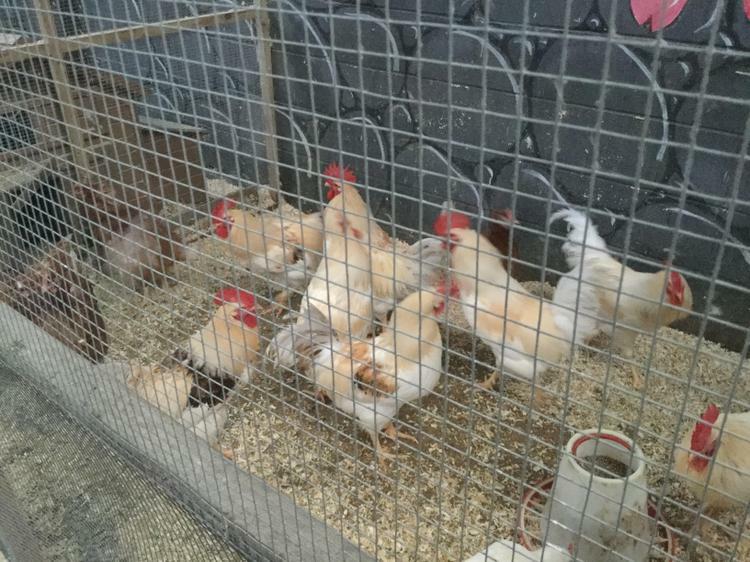 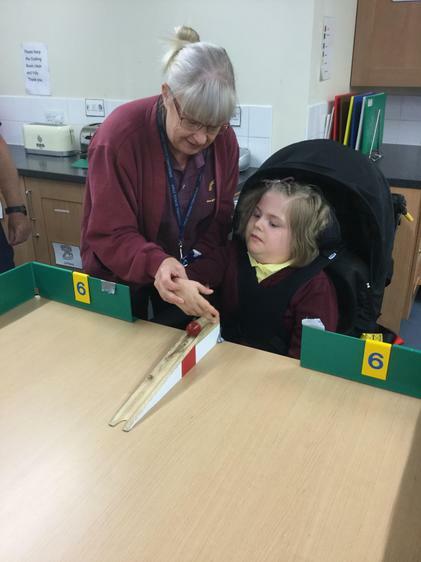 They are fully supported by experienced and skilled teaching staff at all times. 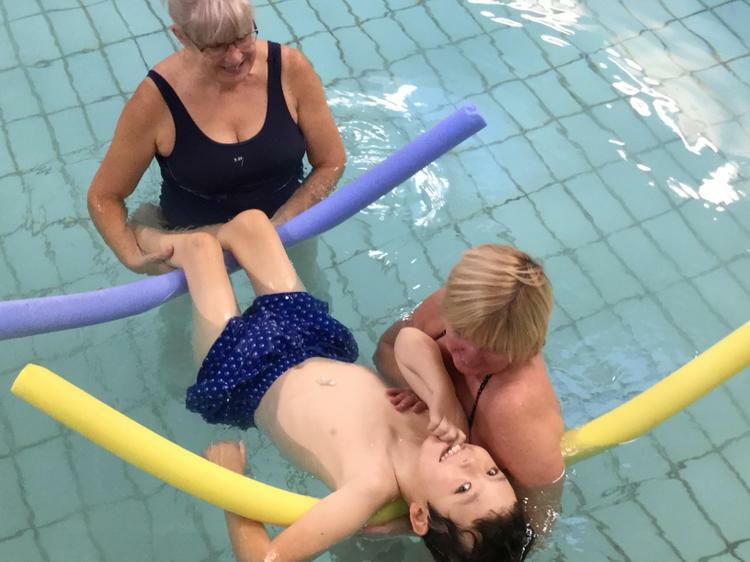 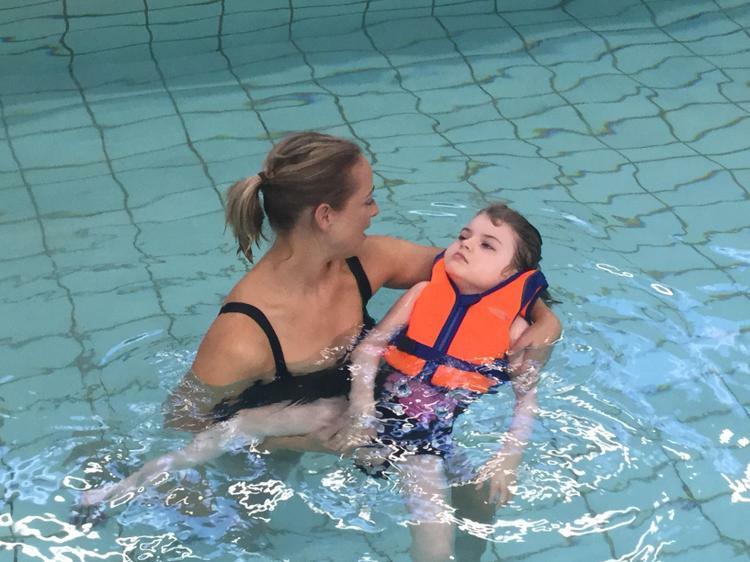 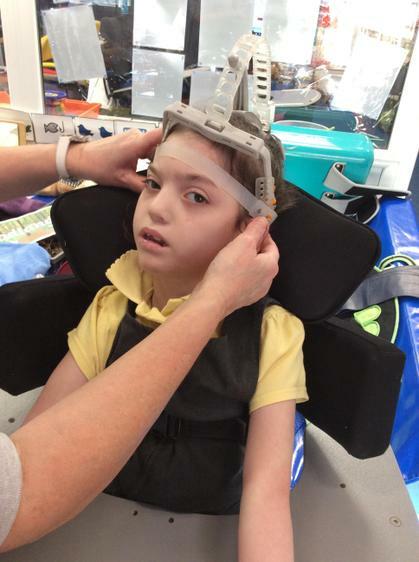 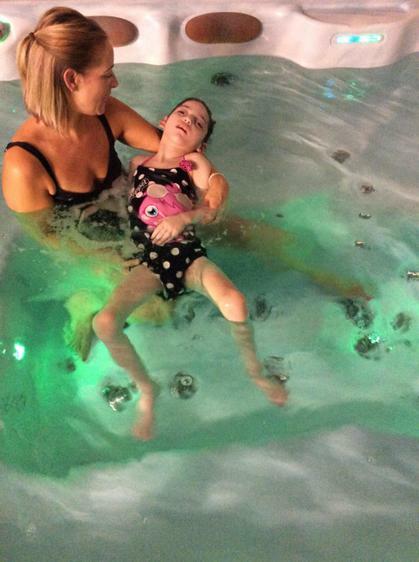 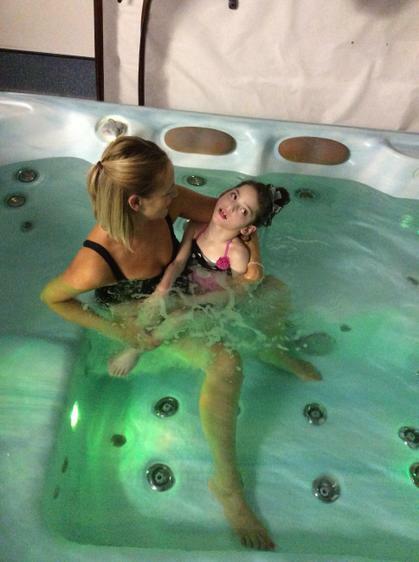 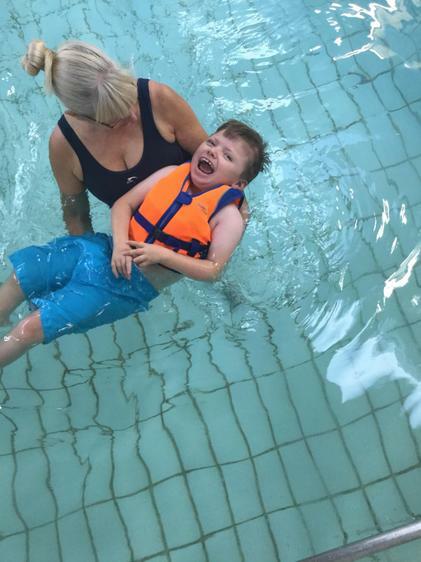 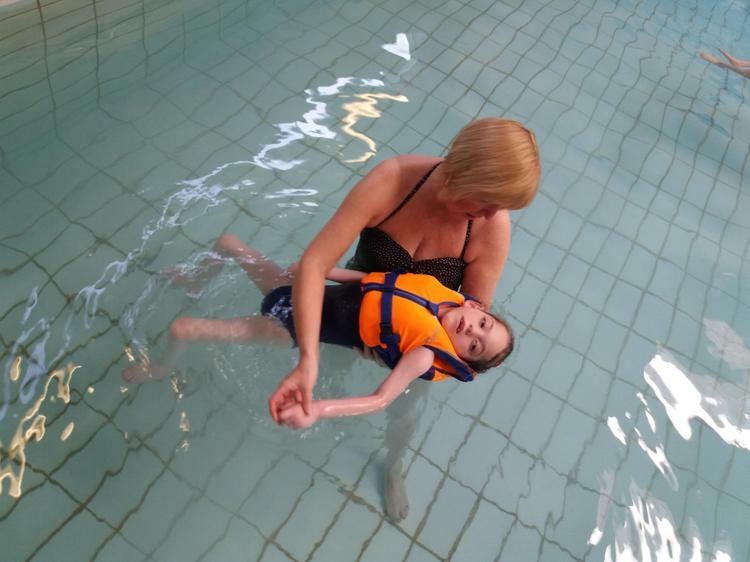 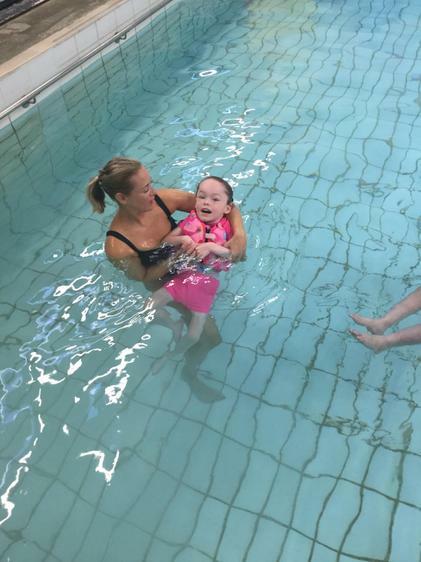 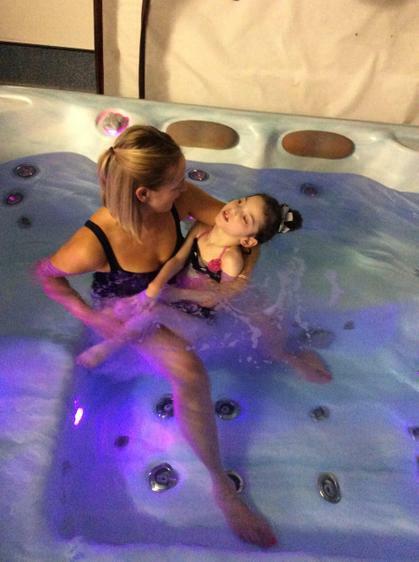 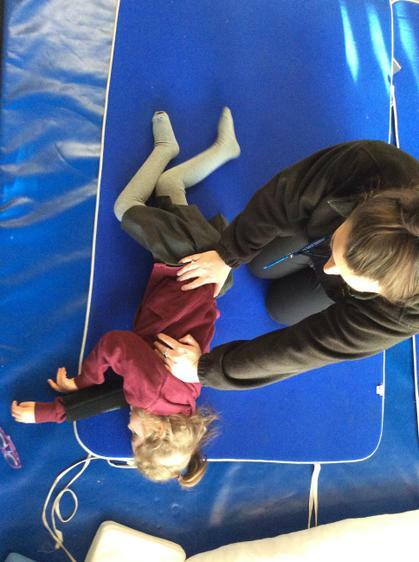 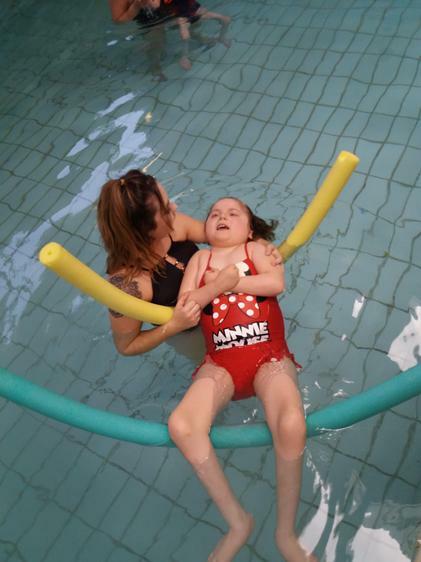 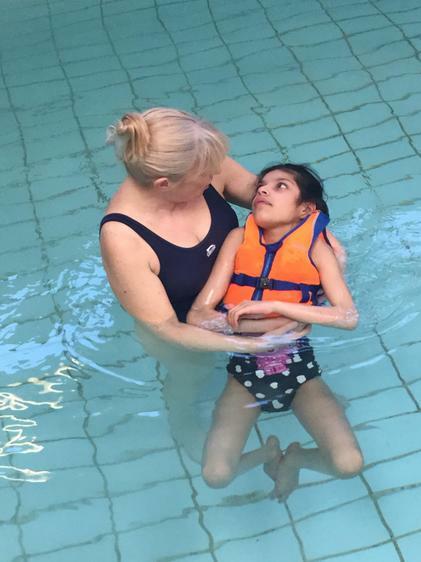 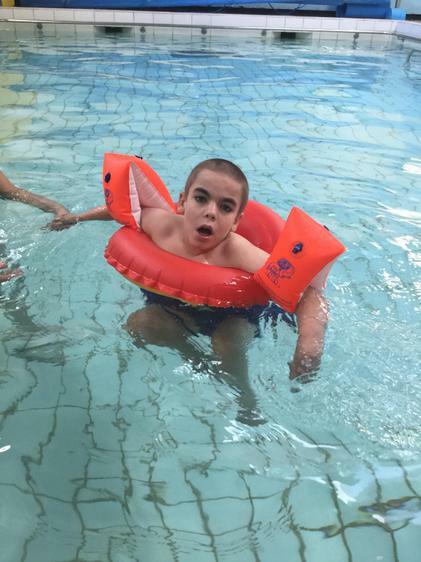 The children also have access to Hydrotherapy, Rebound Therapy, Passive Movements, Sensory Integration, Intensive Interaction, TacPac, Body Awareness, Occupational Therapy, Orthotics and Physiotherapy. 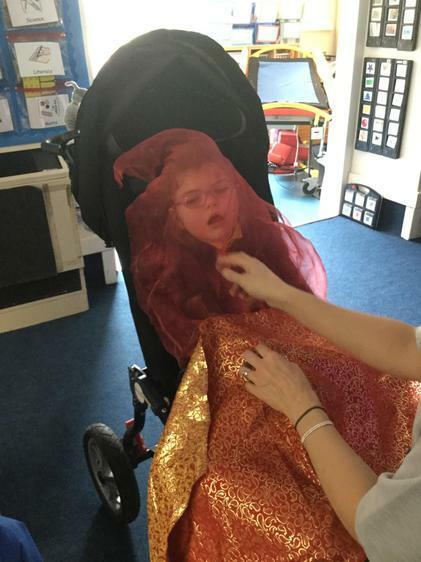 STORY CHARACTER/SENSORY ART - The children enjoyed sticking multi-textured fabric onto Goldilocks (16.01.19). 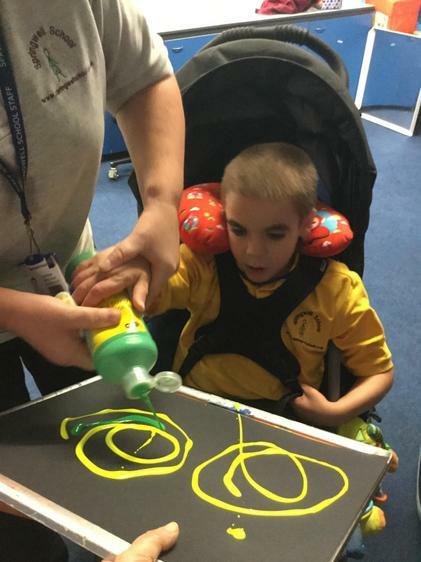 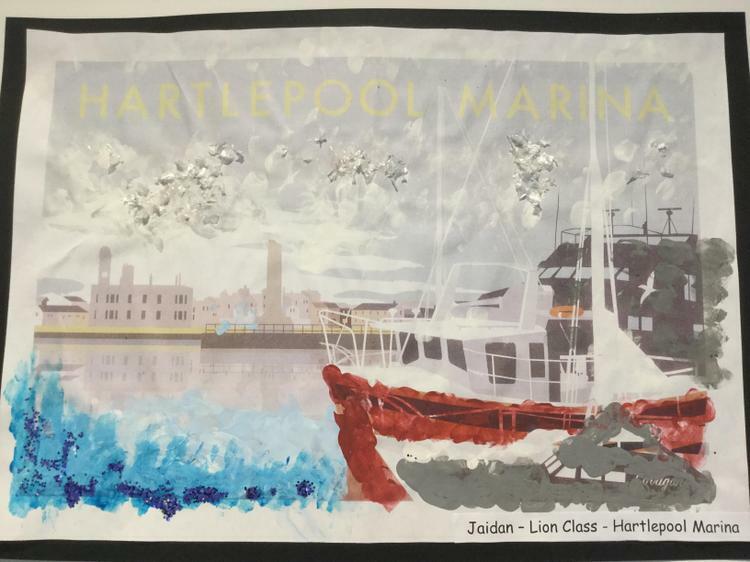 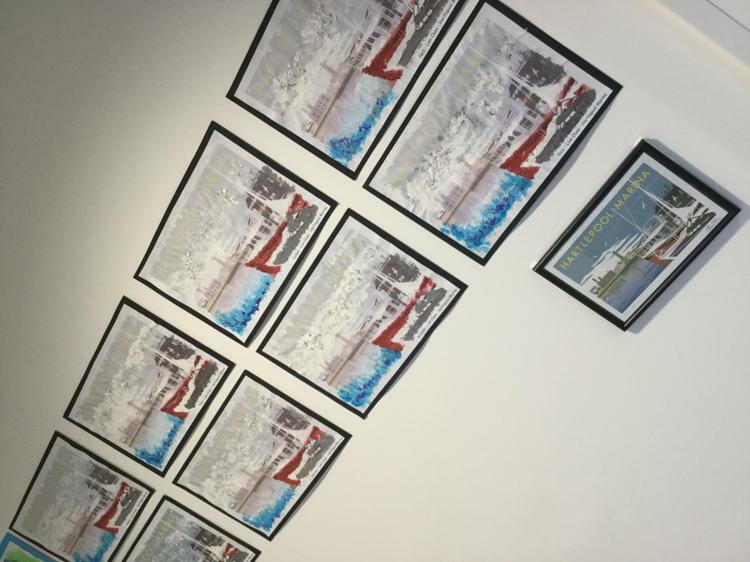 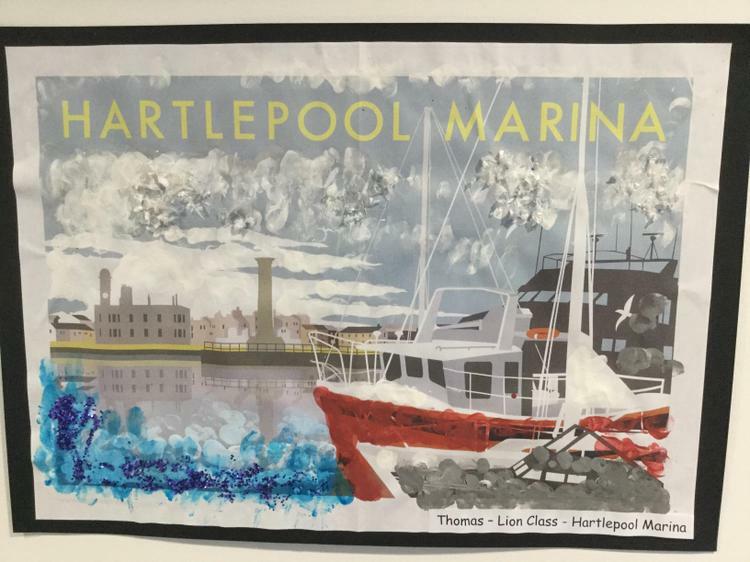 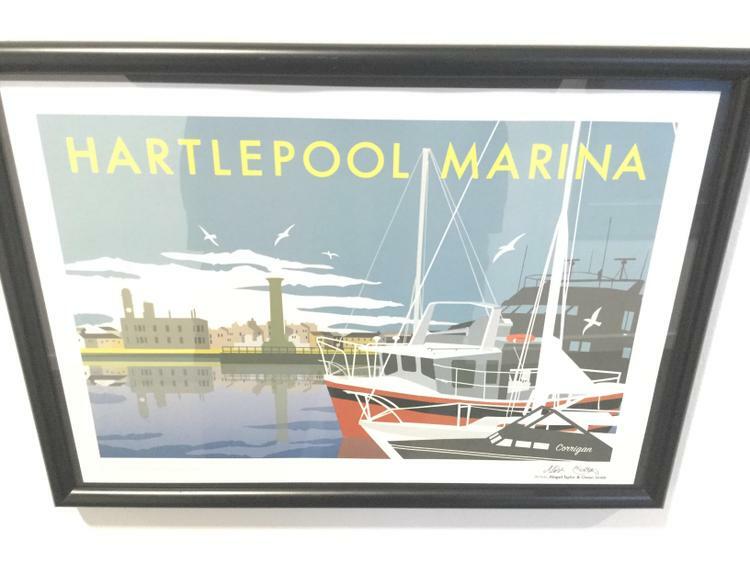 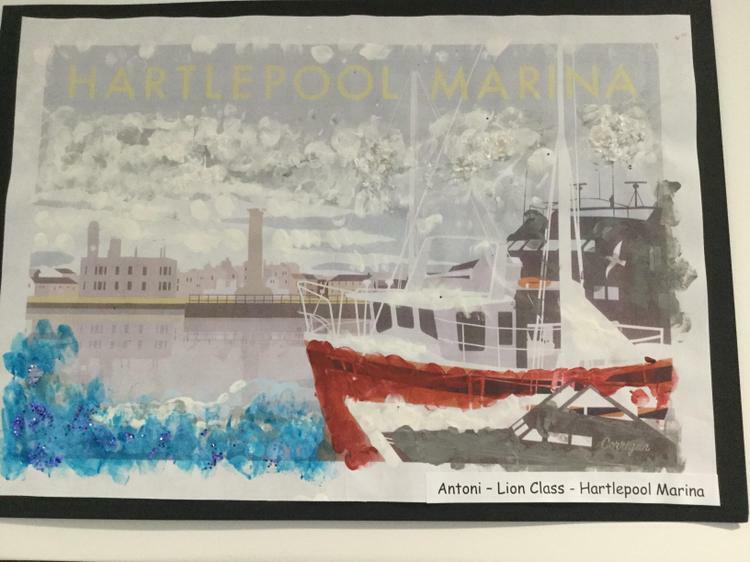 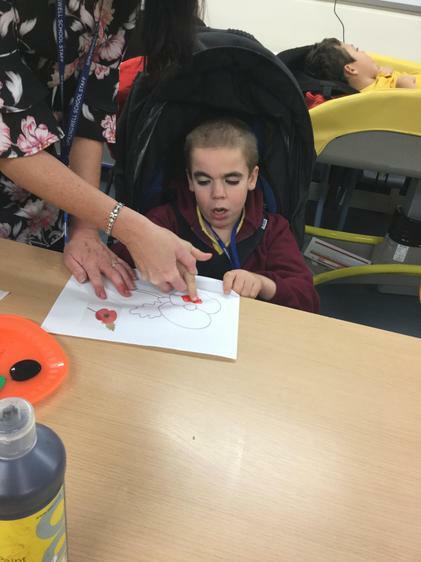 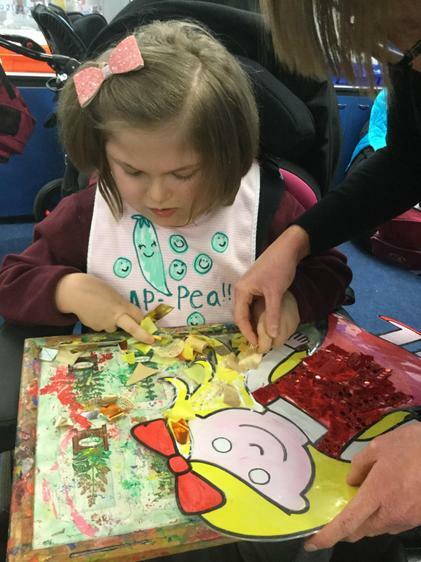 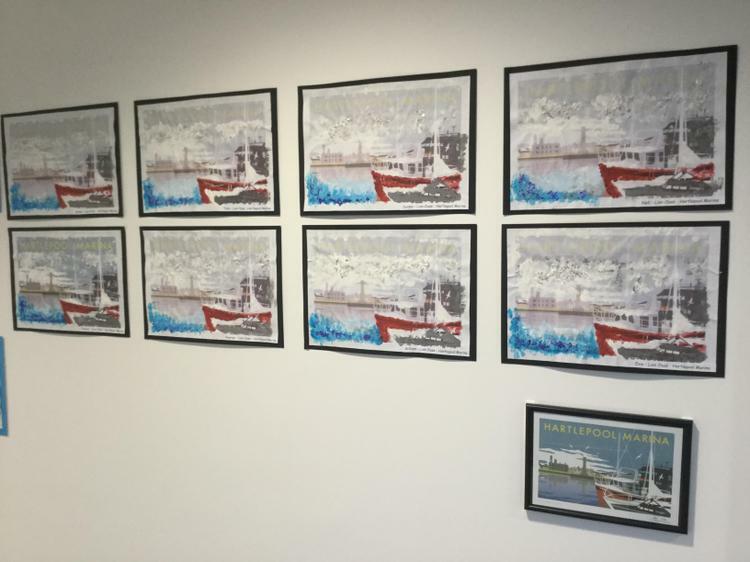 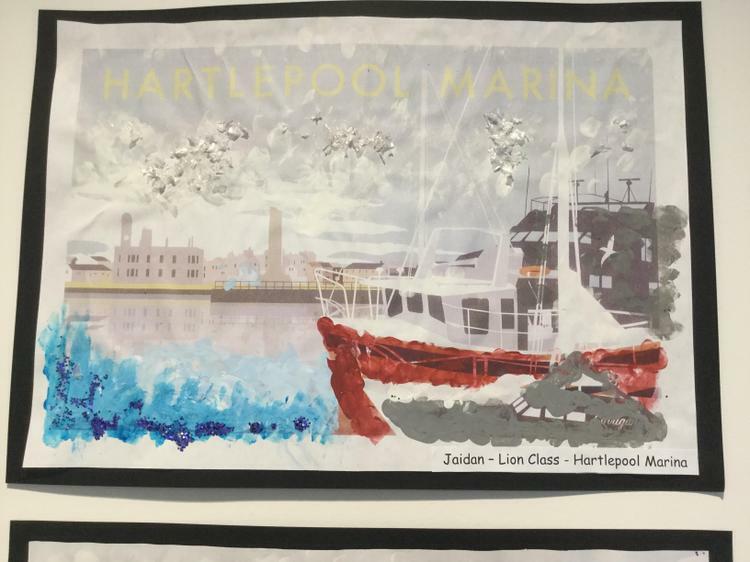 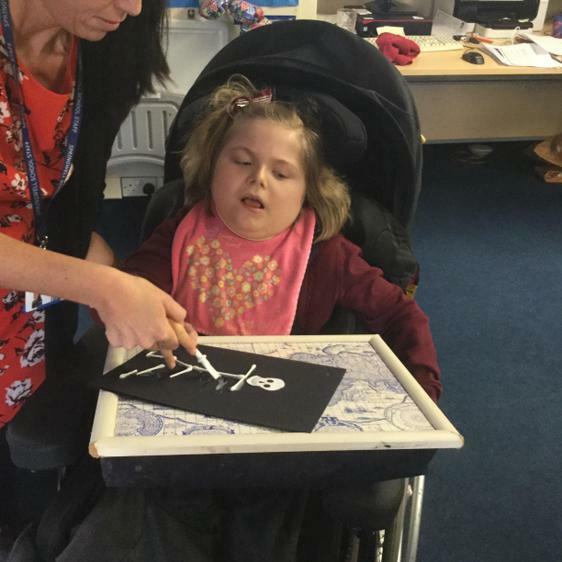 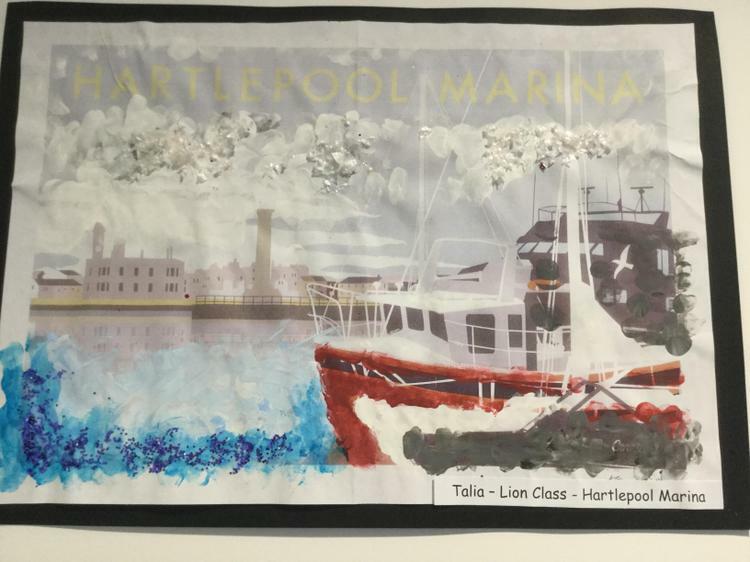 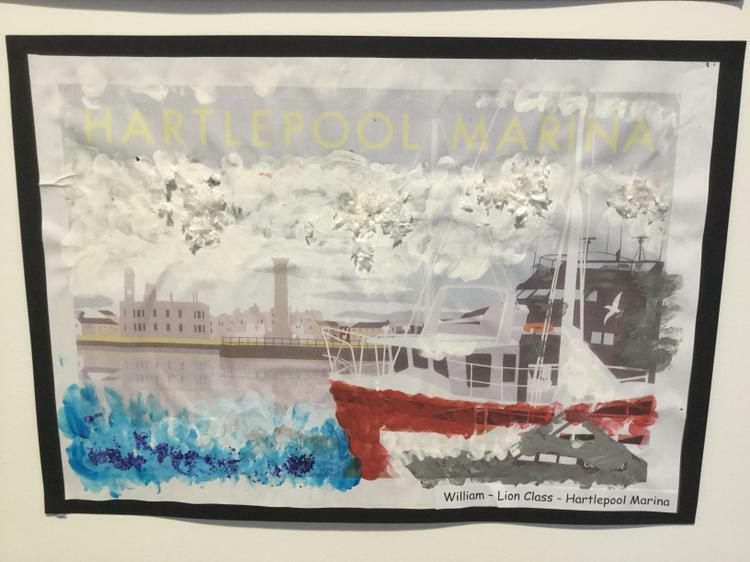 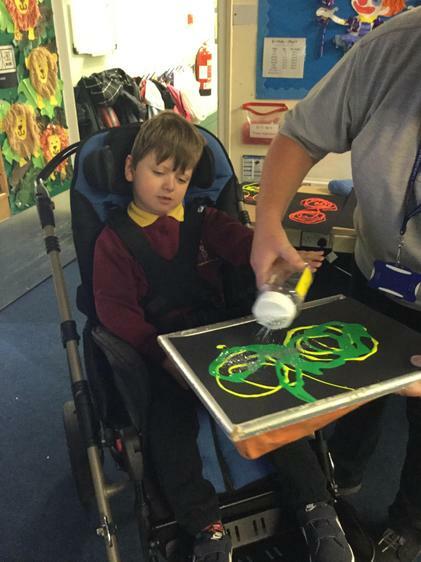 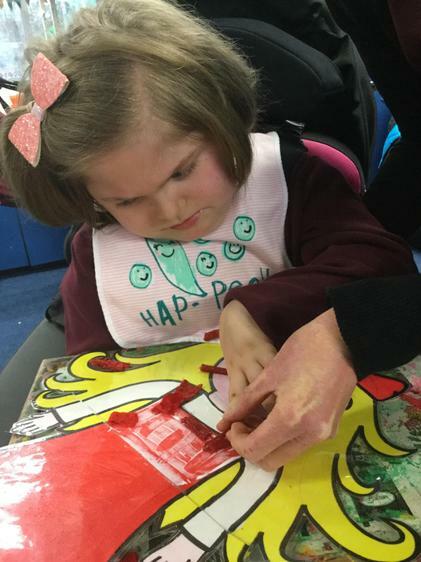 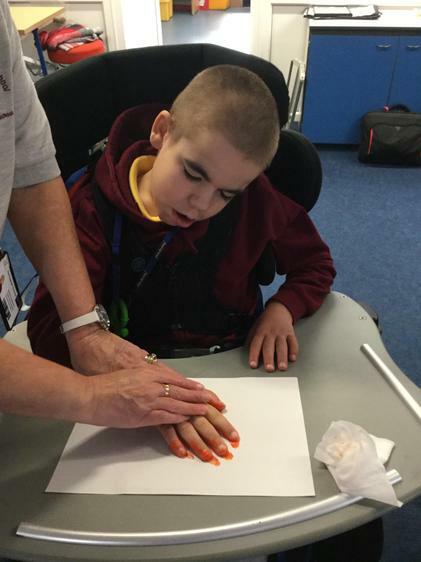 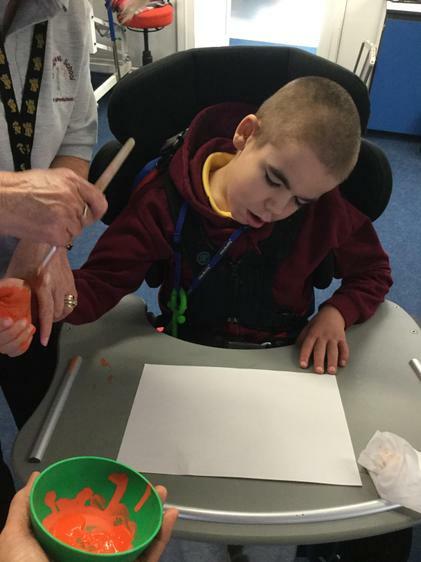 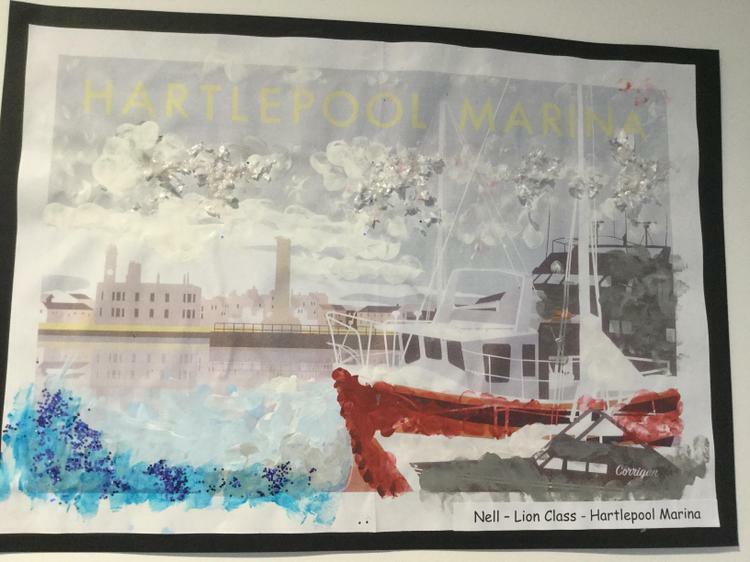 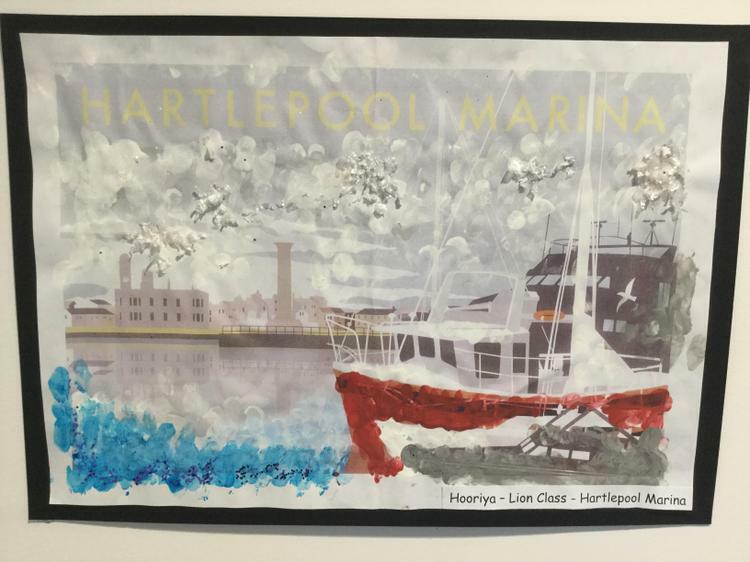 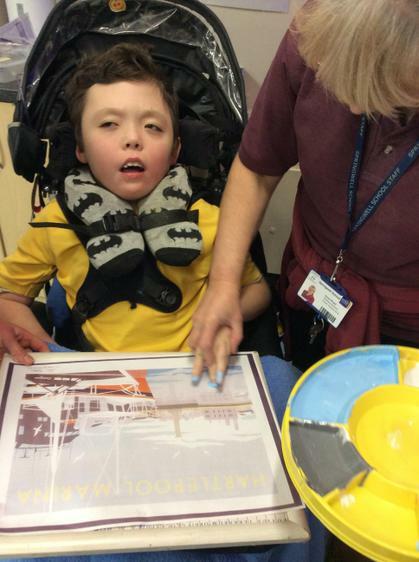 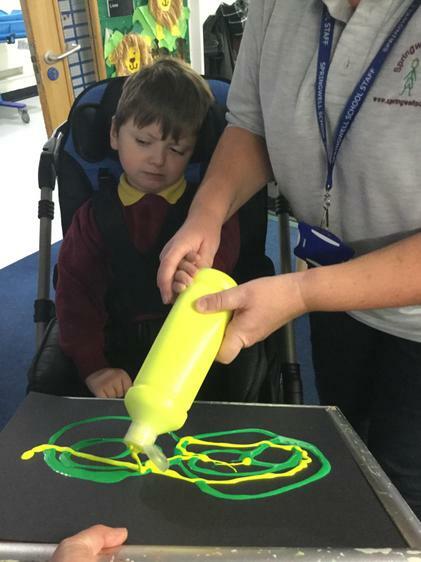 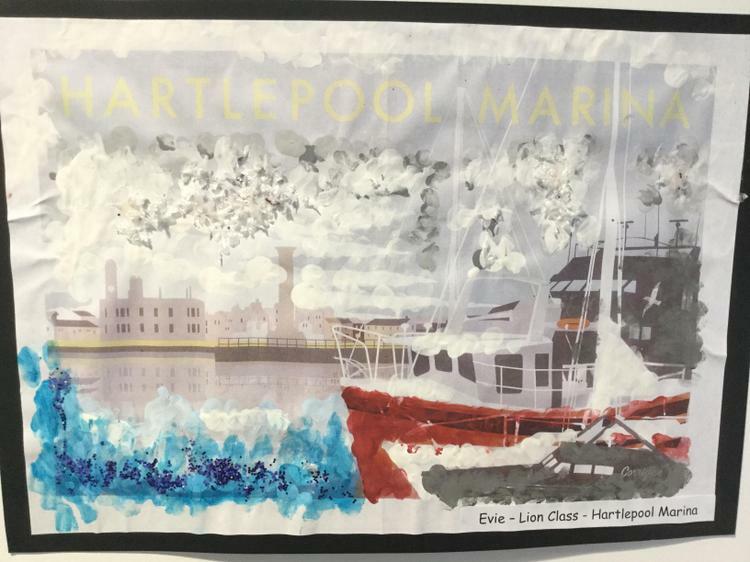 SENSORY ART - With adult support the children finger painted a landscape view of Hartlepool Marina using multi-coloured paints and glitter. 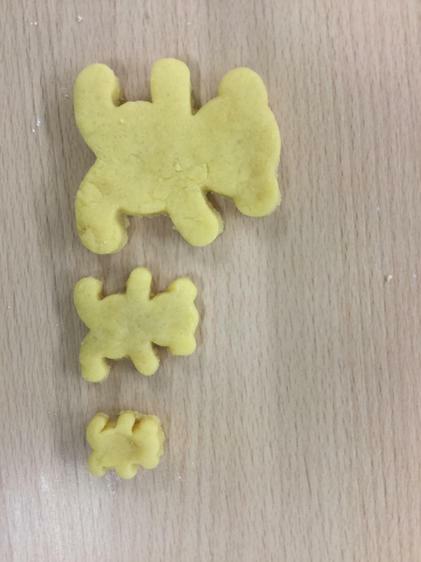 They are fantastic! 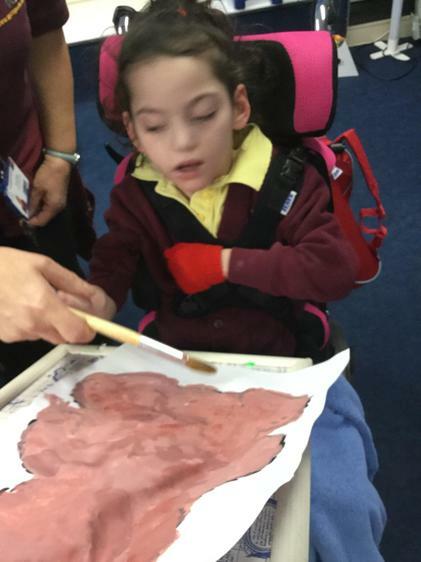 (15.01.19). 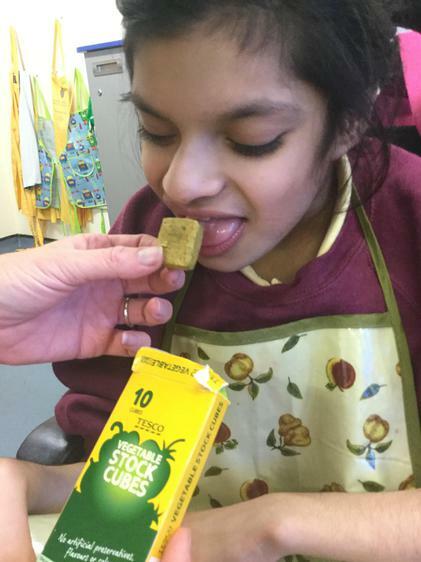 Our topic this term is 'stories'. 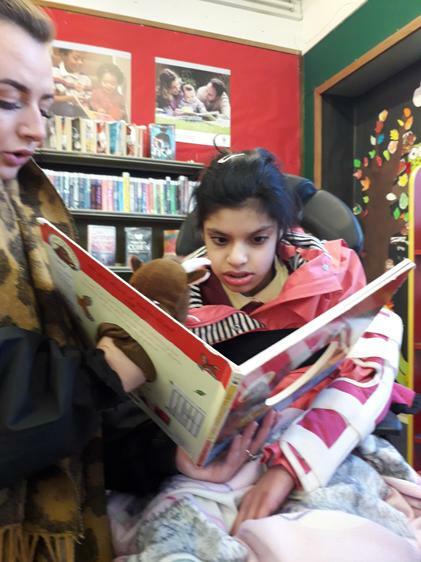 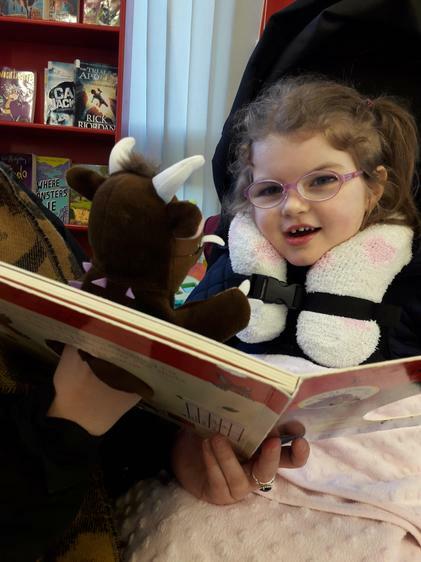 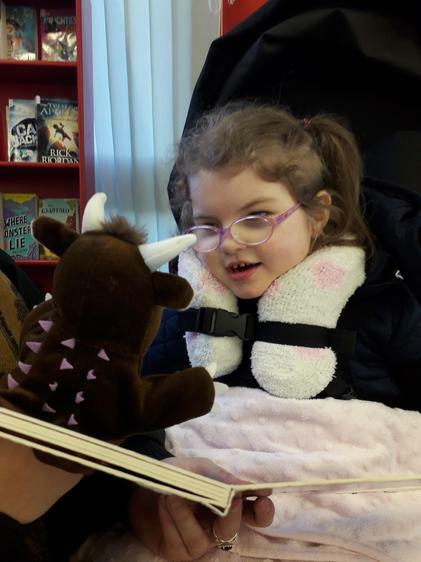 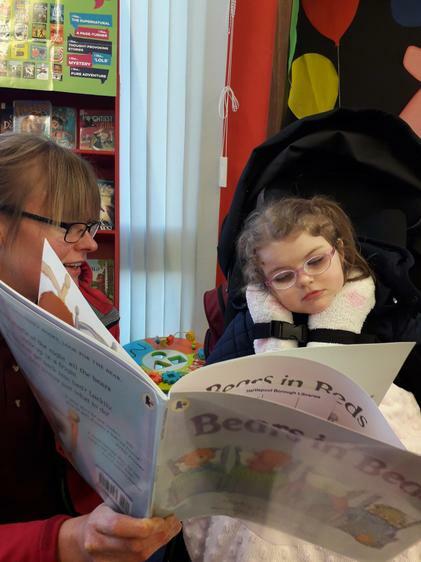 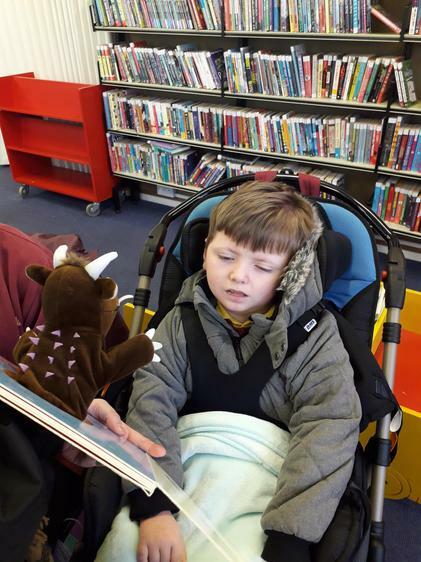 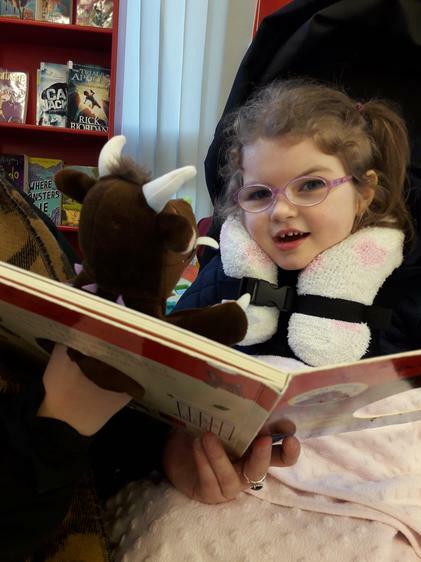 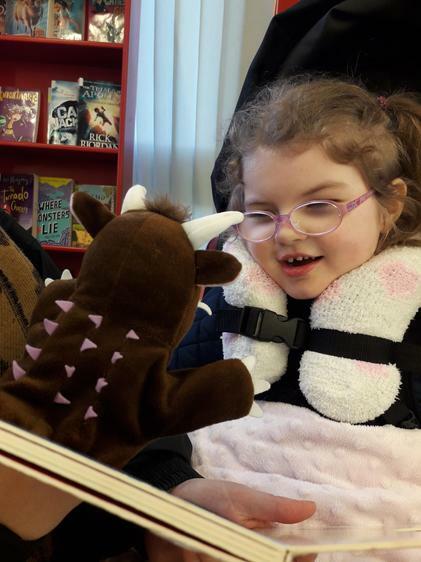 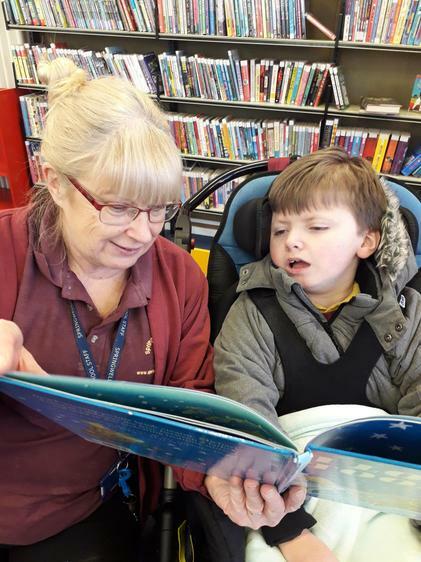 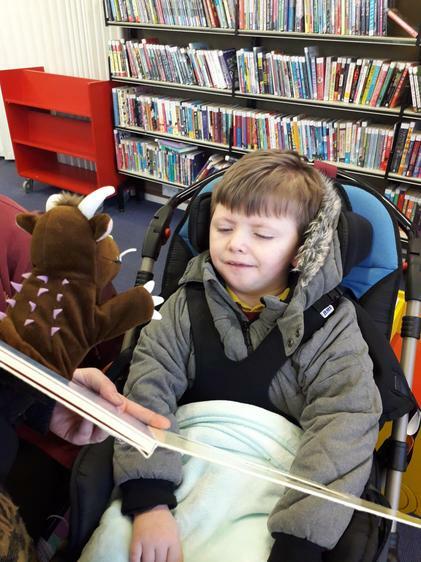 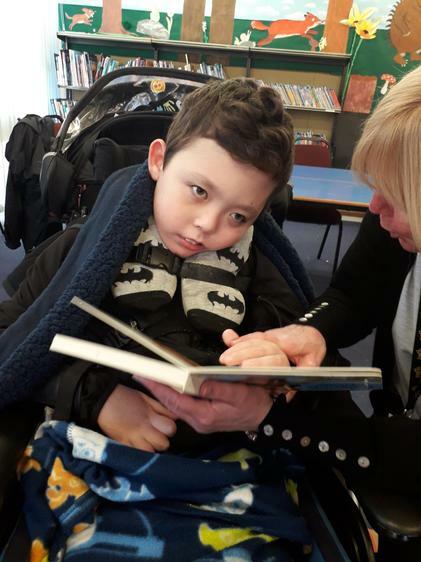 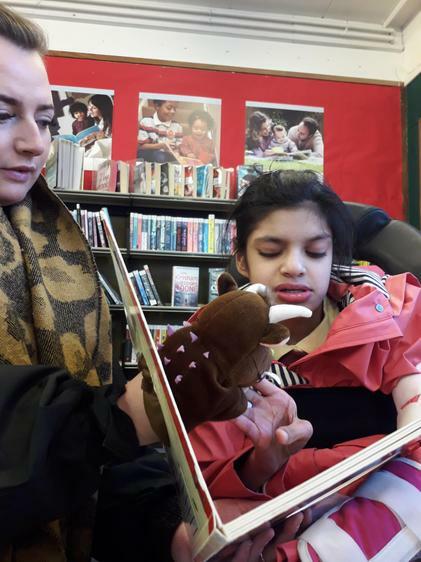 The children visited the library today and listened to an array of stories about bears (14.01.19). 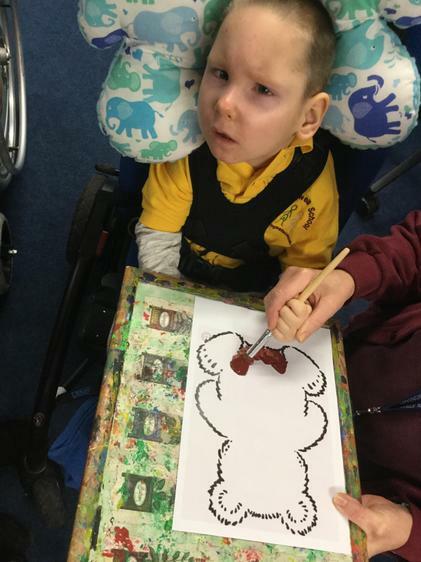 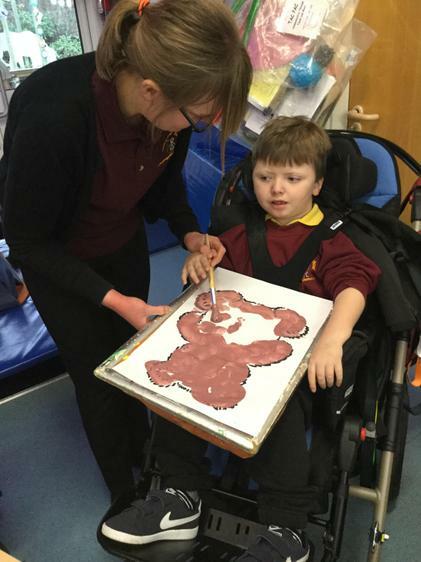 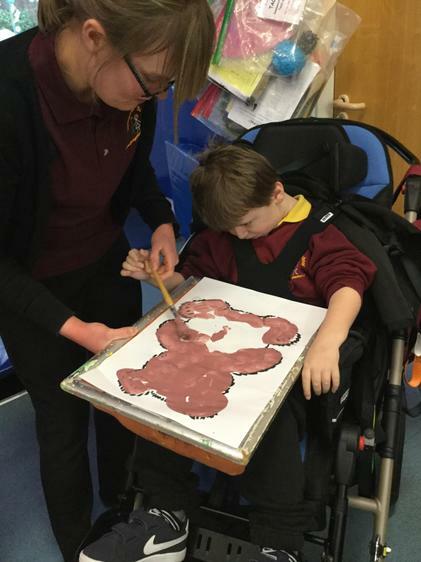 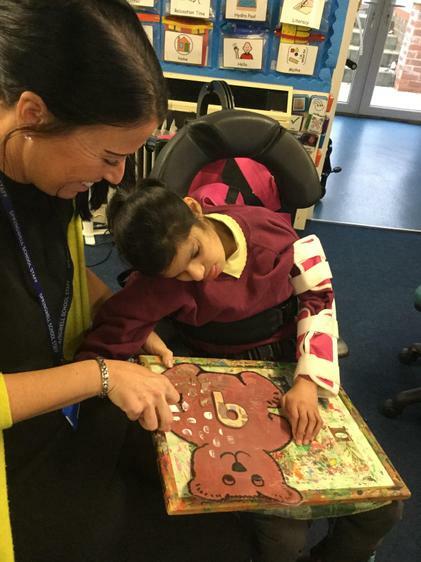 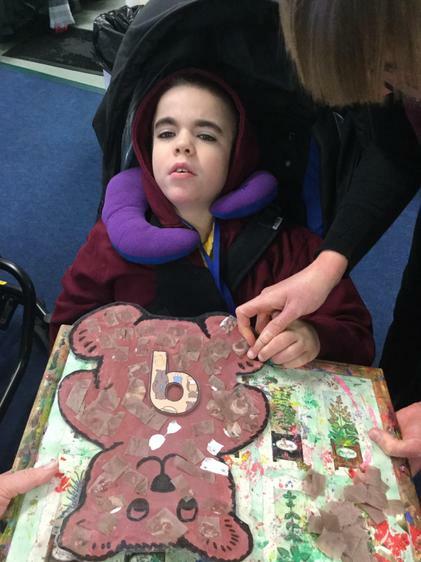 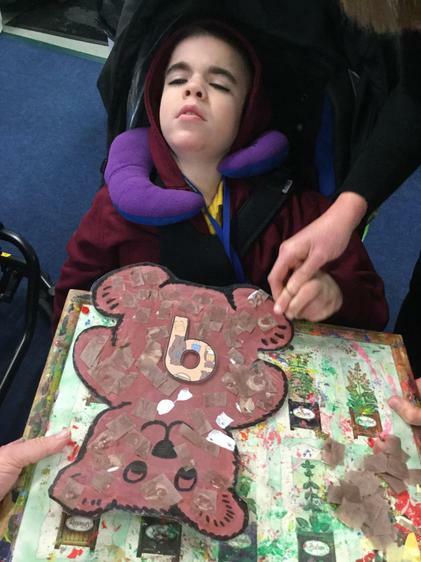 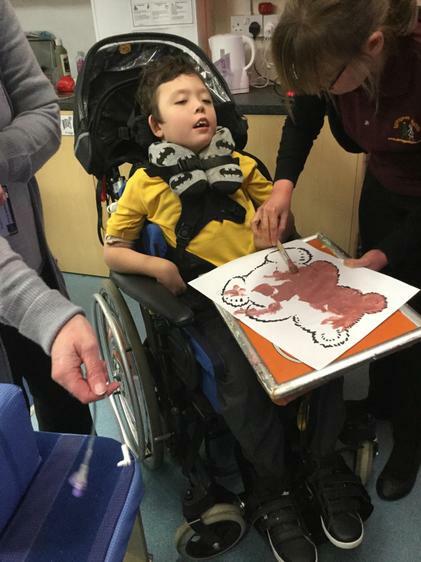 SENSORY ART - The children painted the bears with adult support. 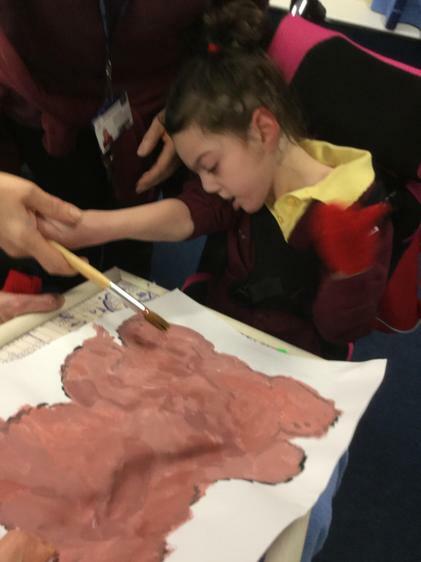 Once the paint was dry, we stuck tiny pieces of brown tissue paper onto each bear (11.01.19). 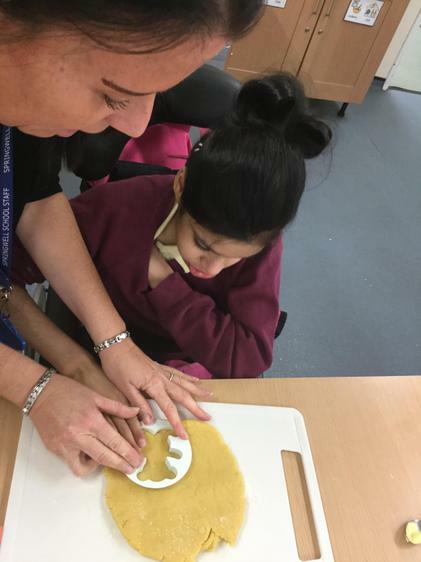 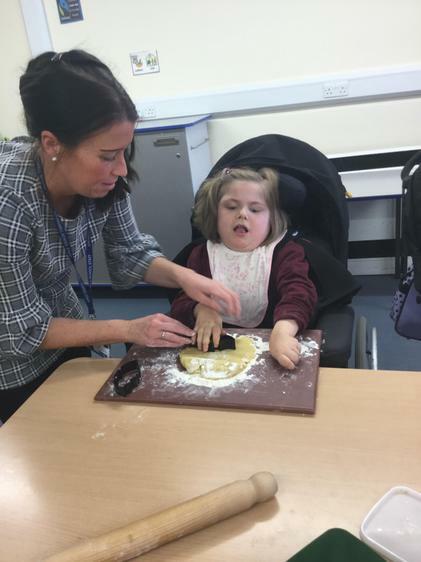 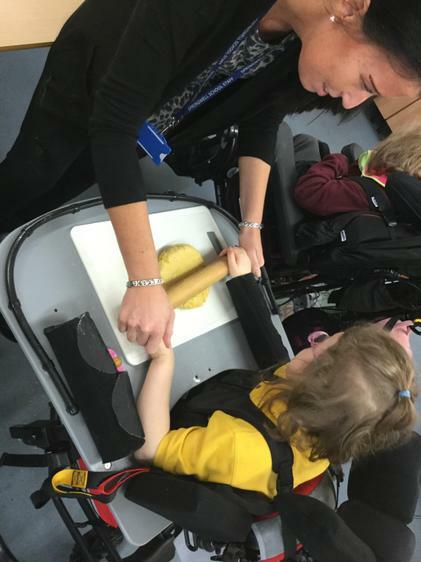 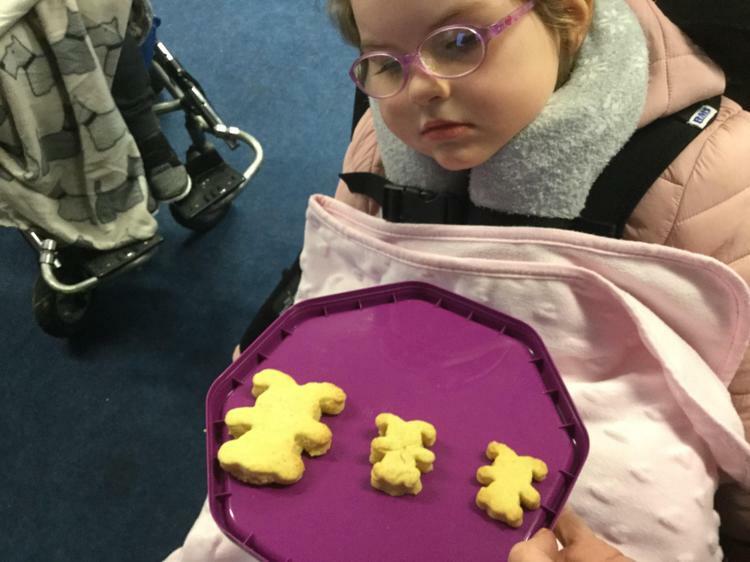 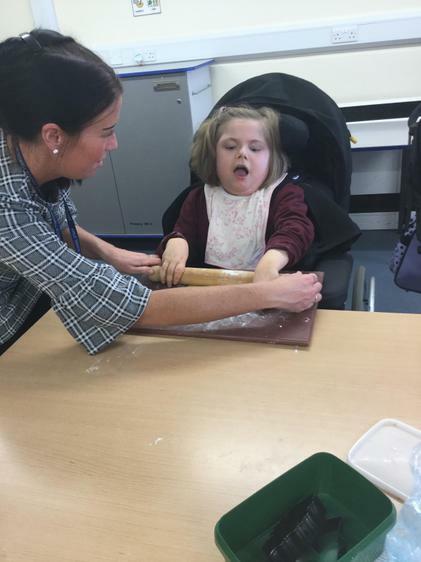 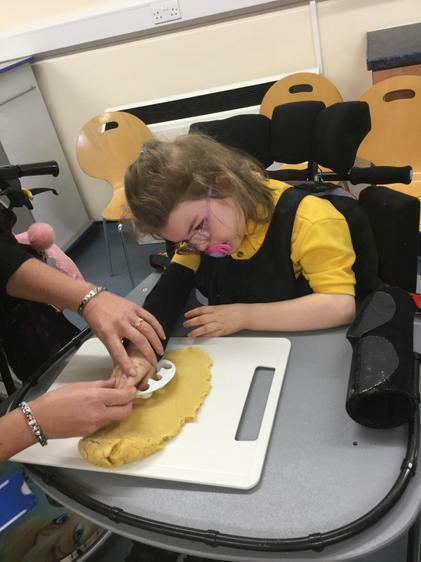 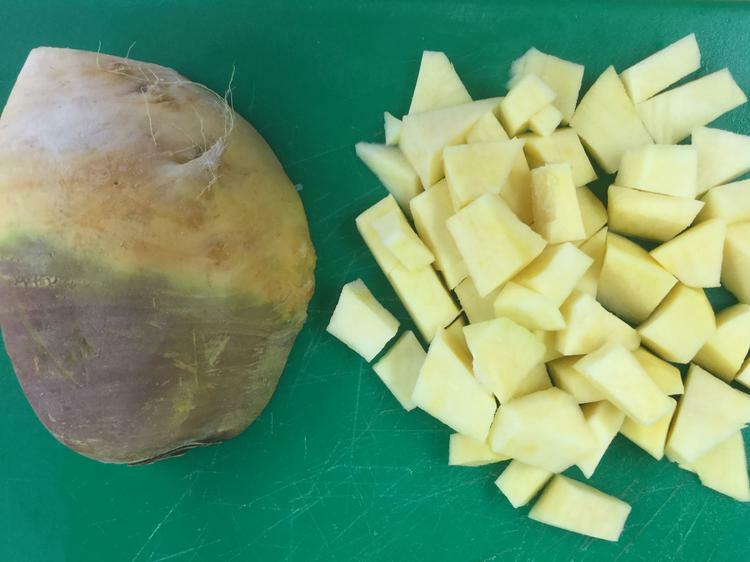 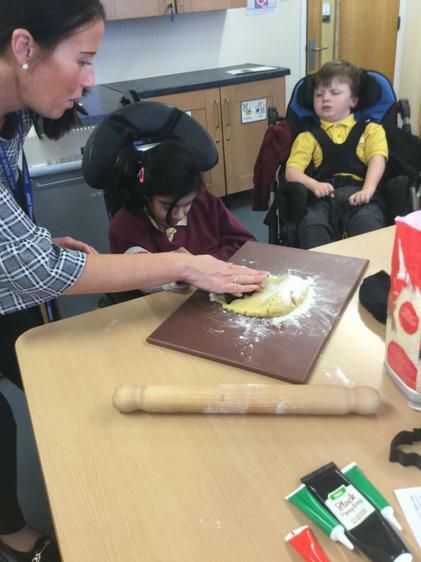 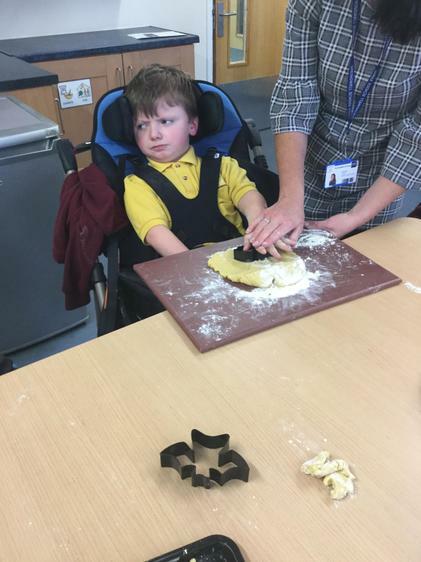 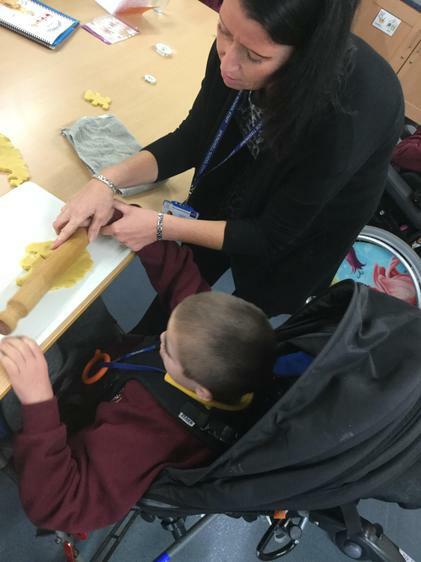 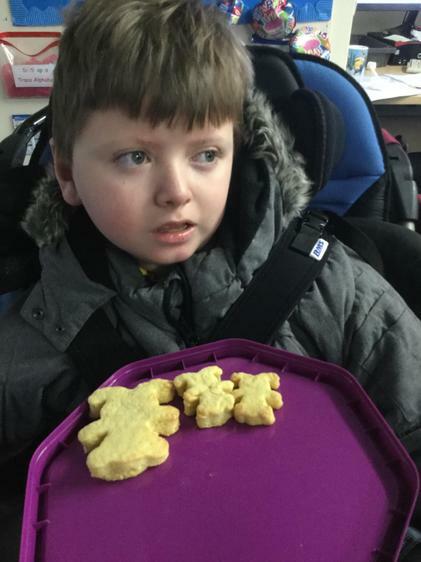 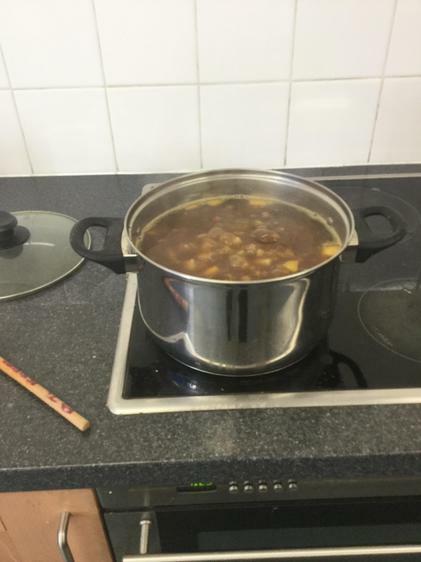 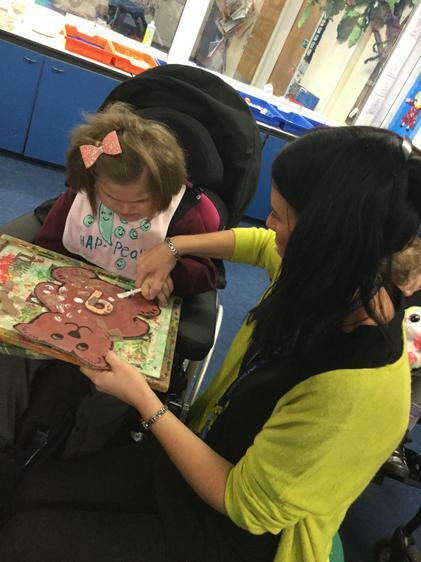 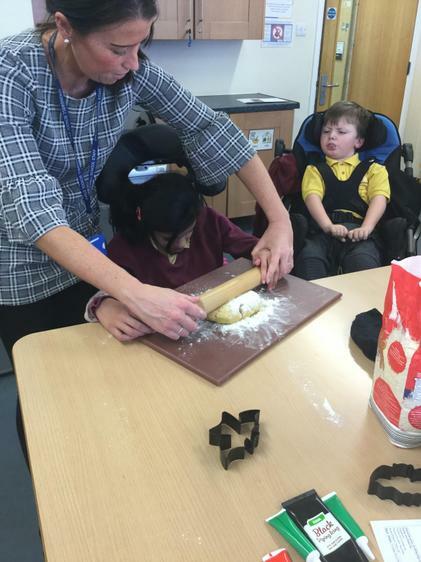 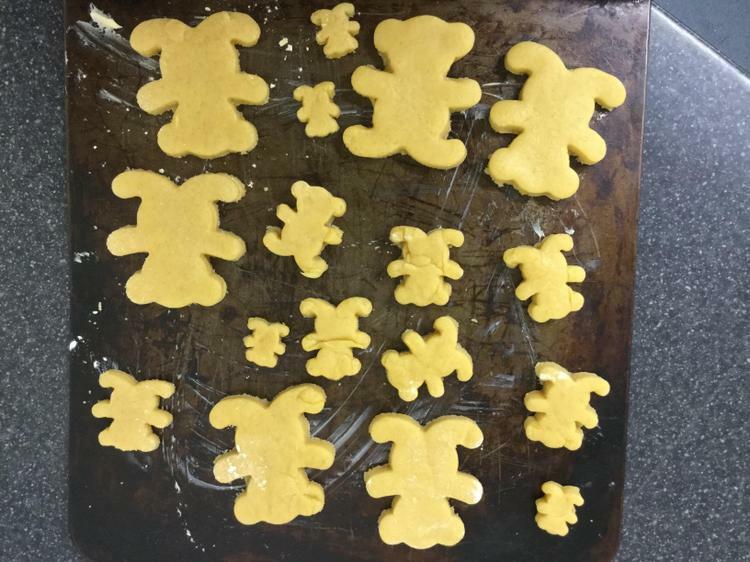 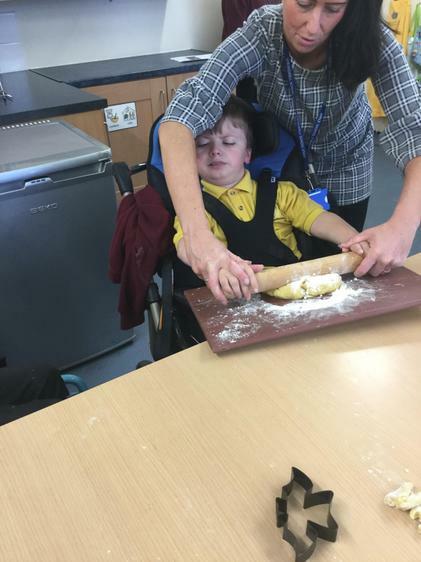 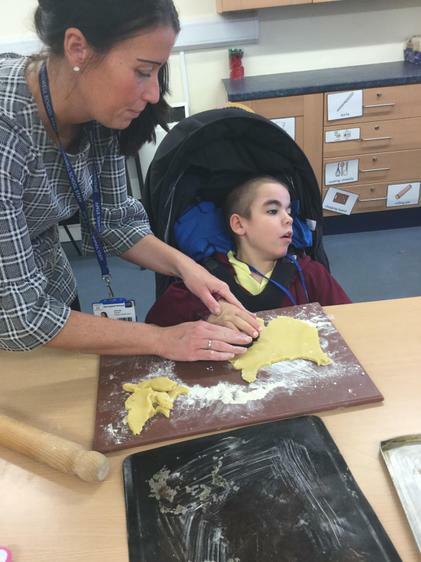 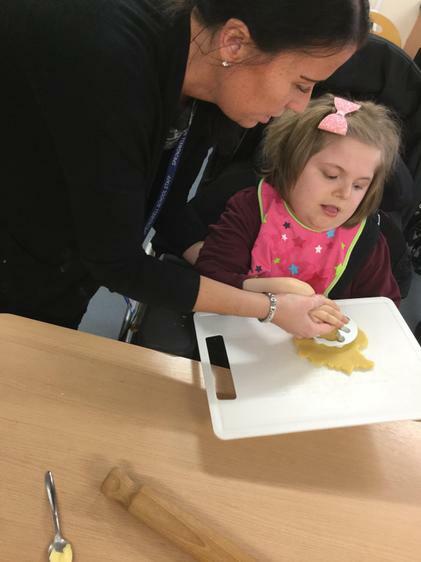 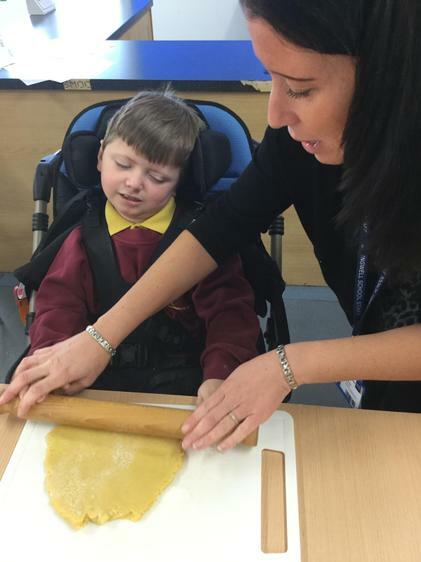 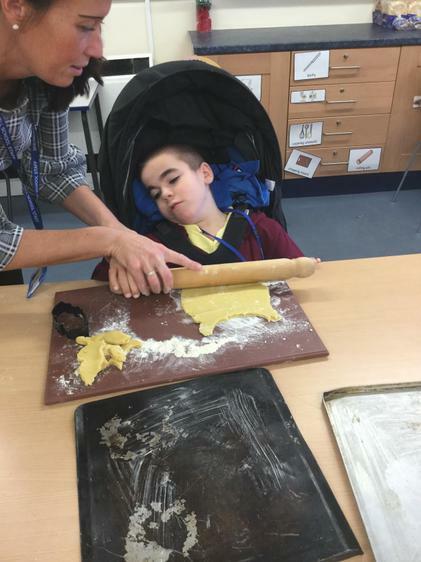 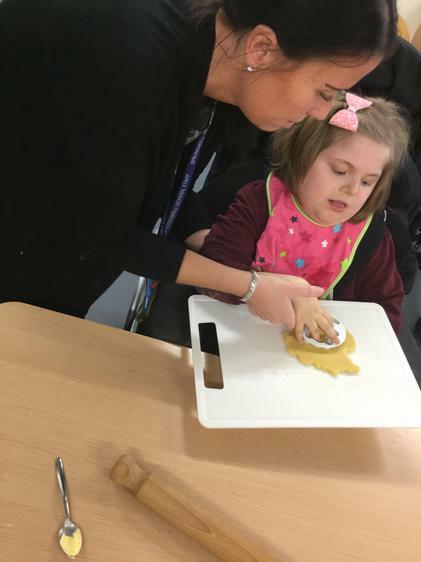 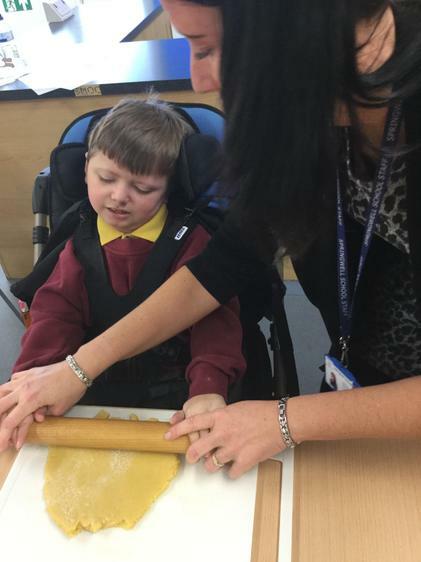 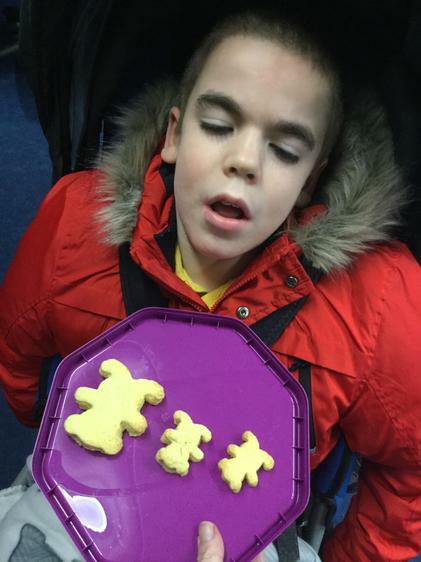 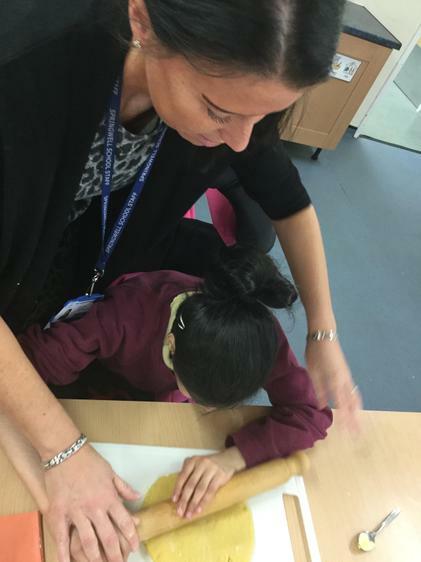 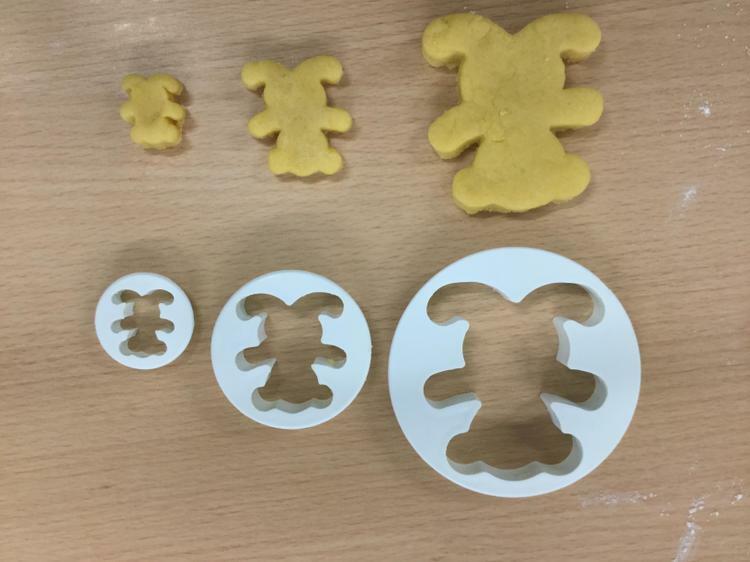 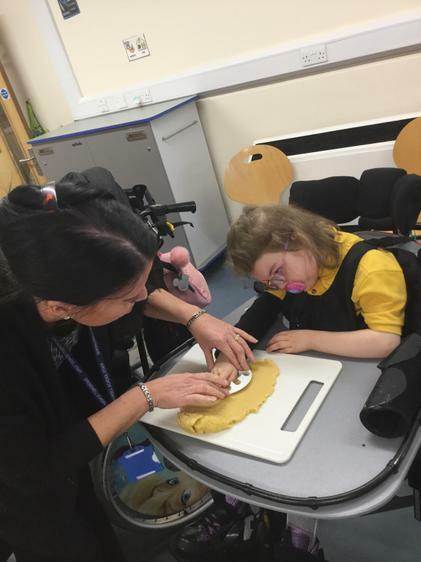 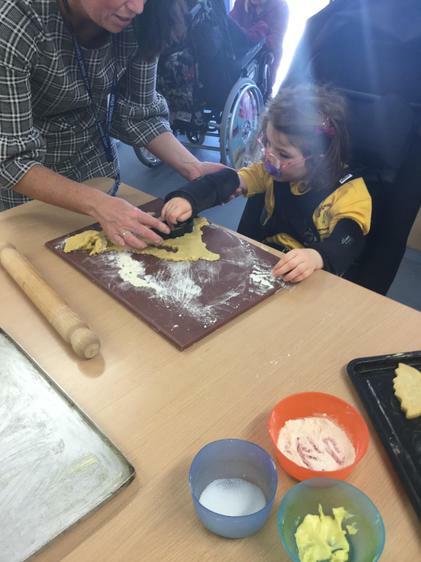 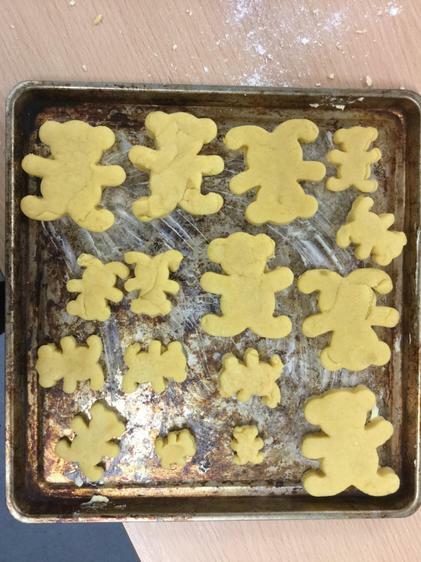 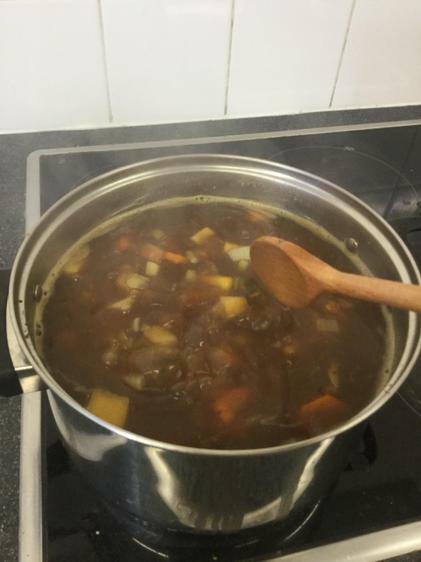 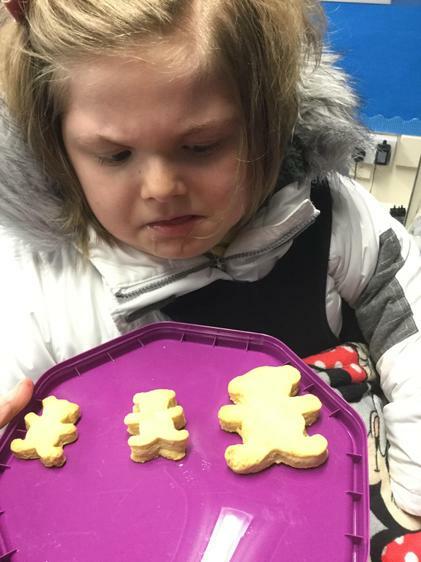 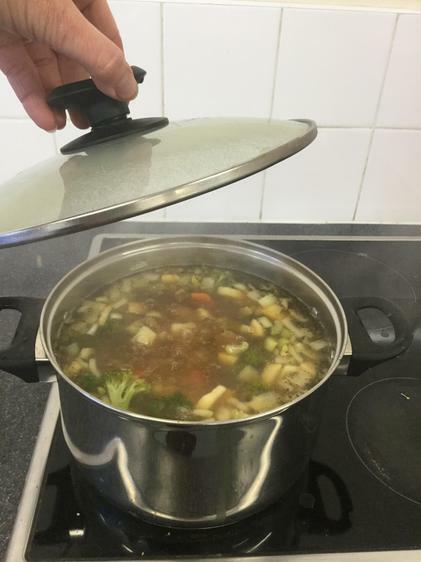 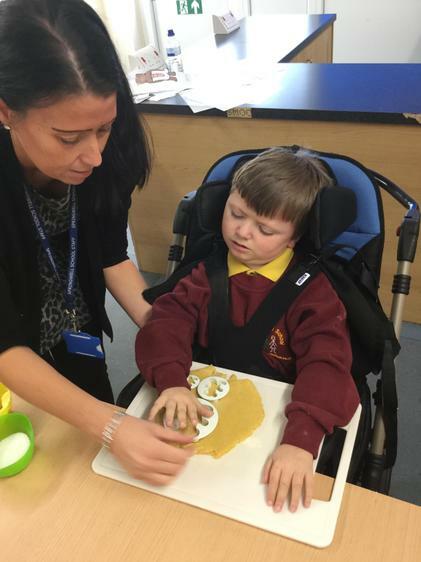 Sensory Cooking - The children enjoyed making different sized bear shaped, shortbread biscuits (08.01.19). 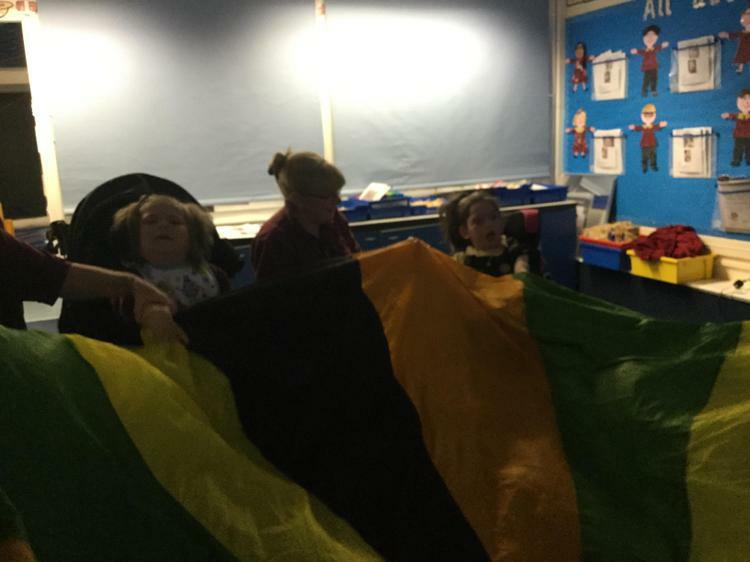 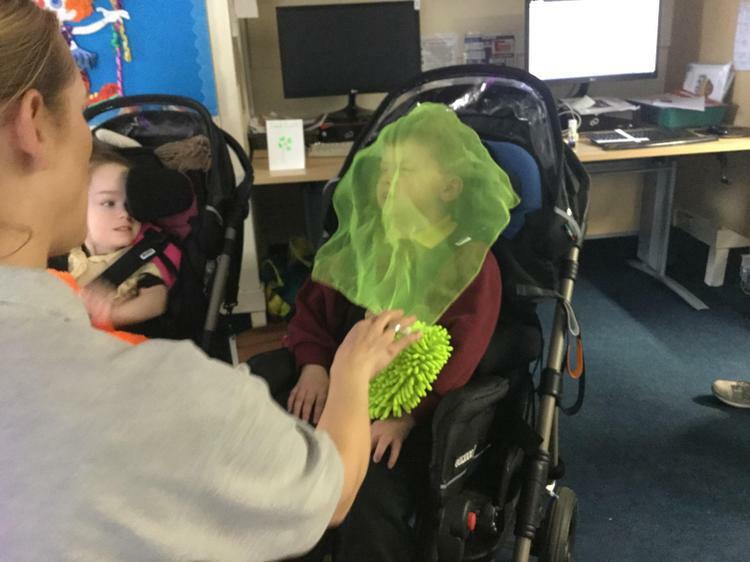 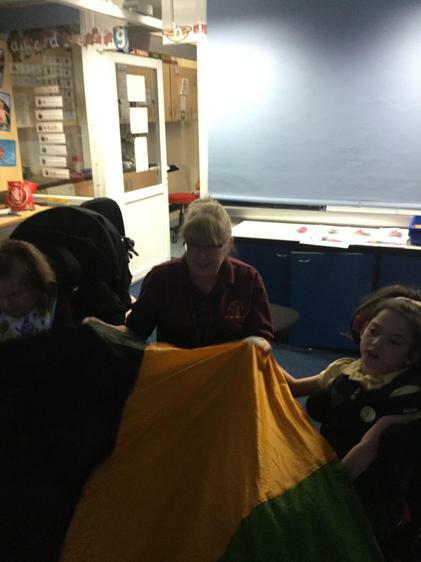 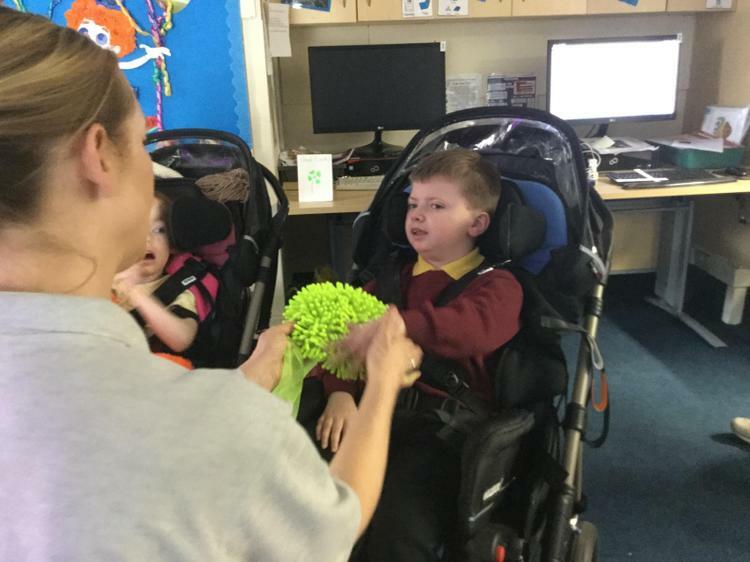 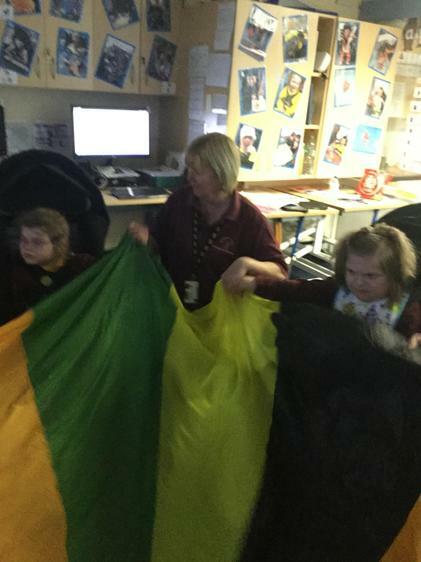 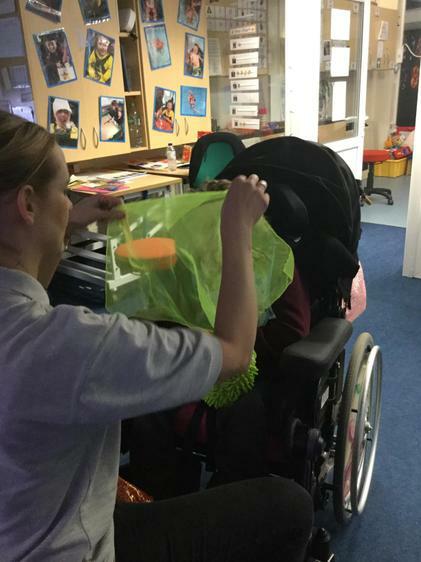 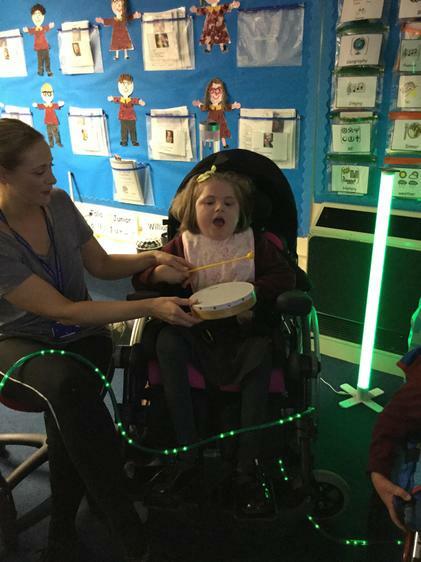 Sam and Jane have been working together this term, creating a new ‘Sparkle Multi-Sensory Curriculum’ for Lion Class and Pangolin Class. 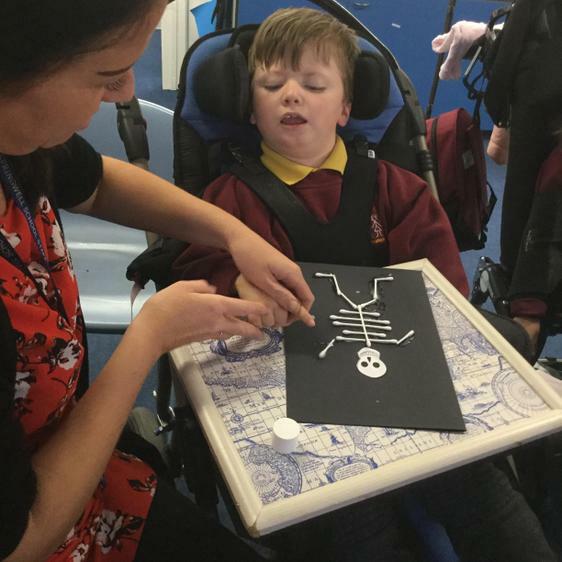 Our new curriculum will start in January 2019 and it will be fantastic for our children. 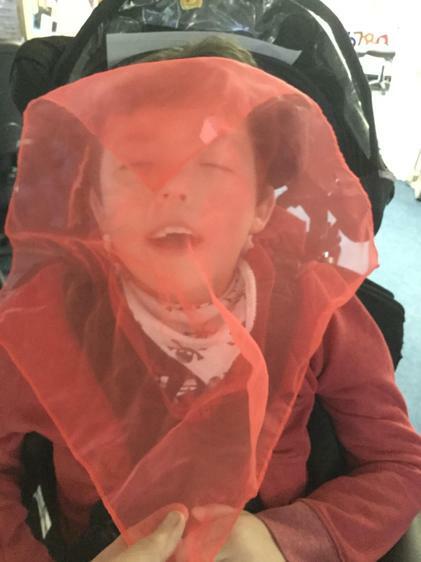 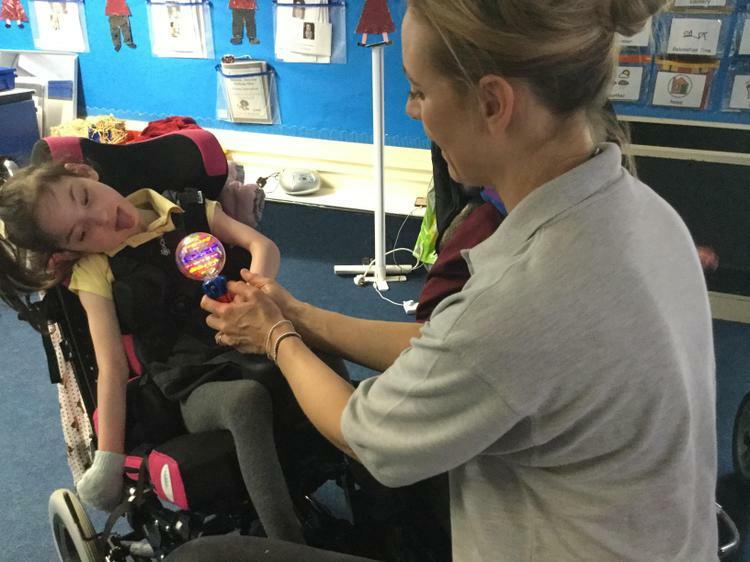 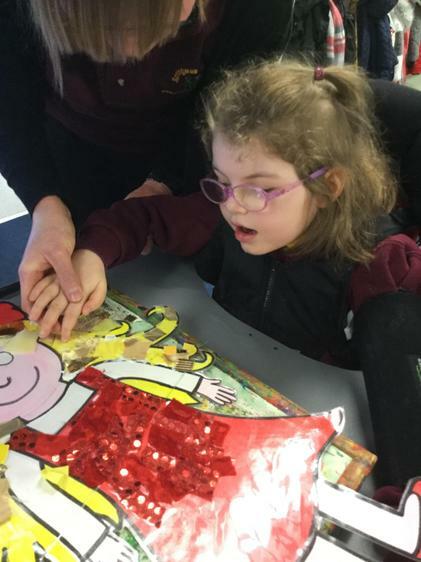 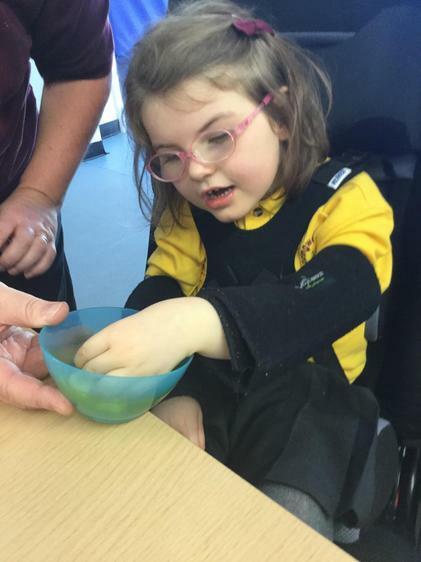 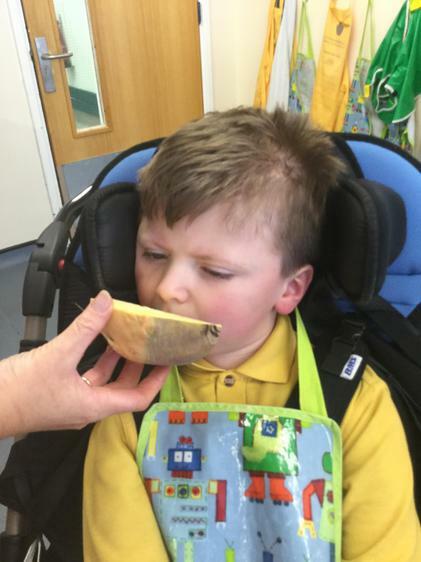 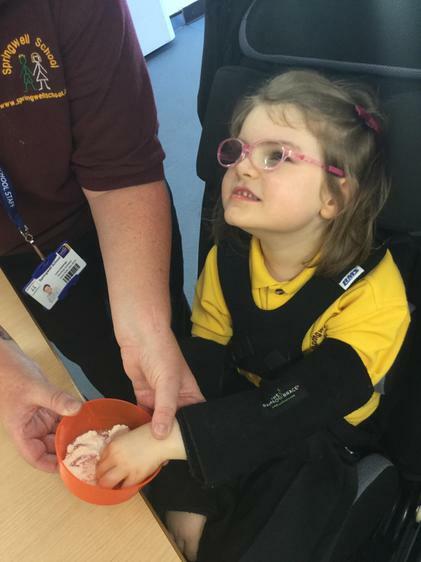 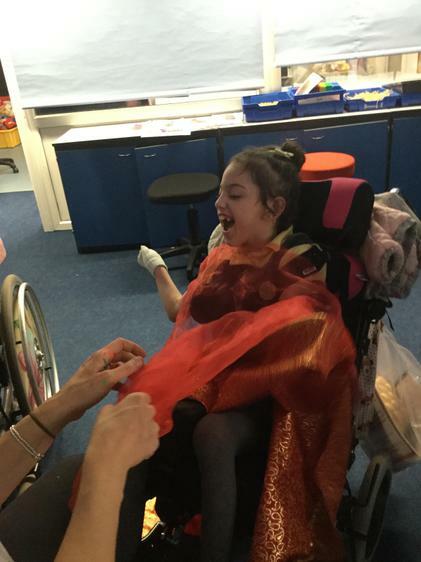 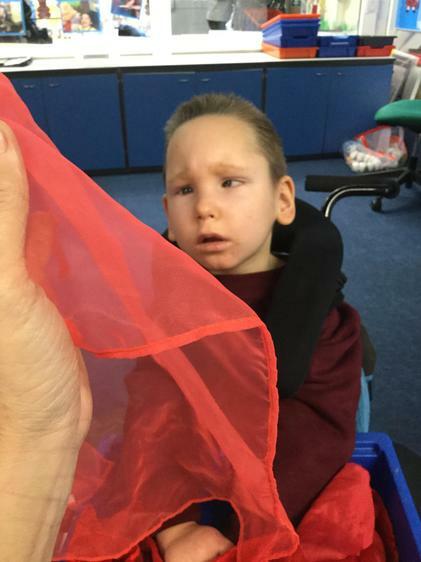 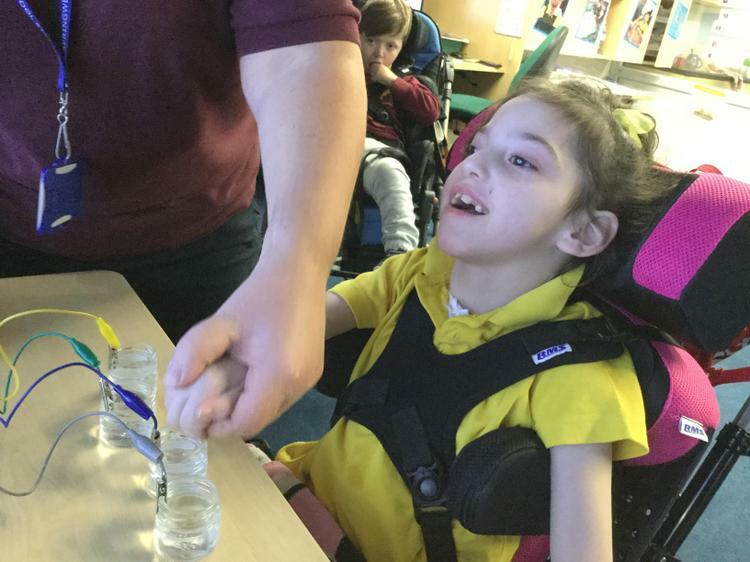 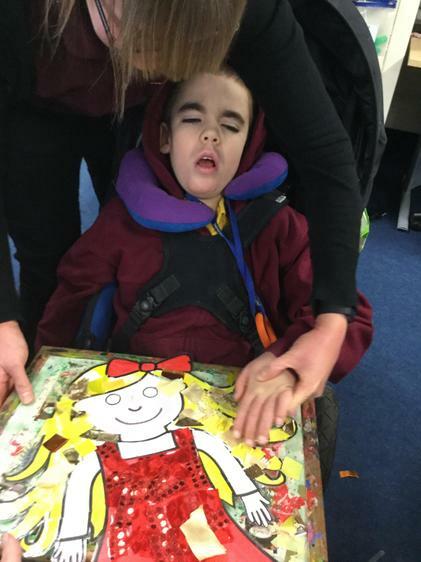 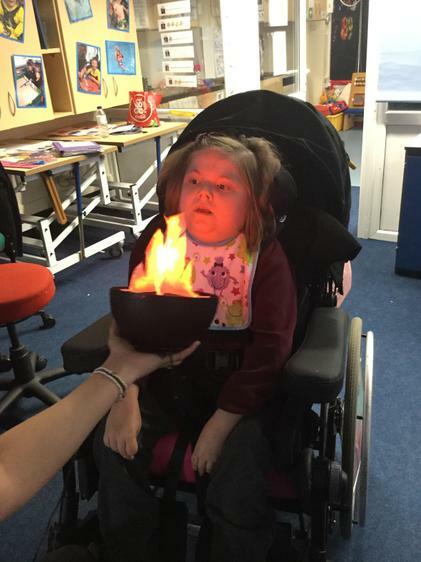 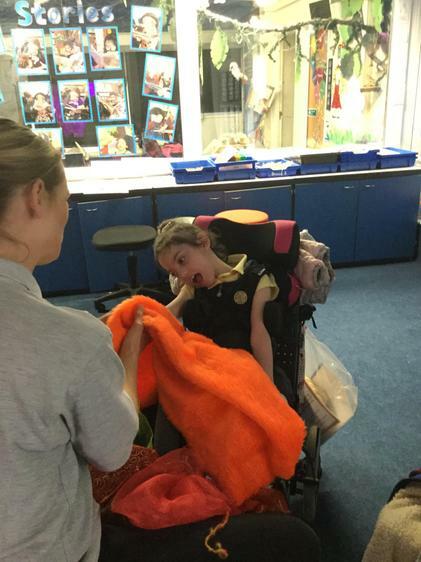 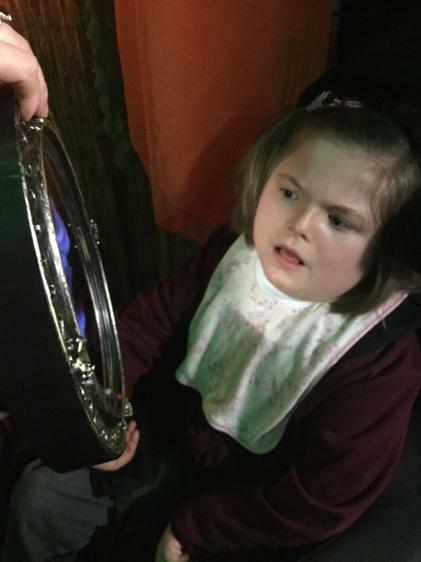 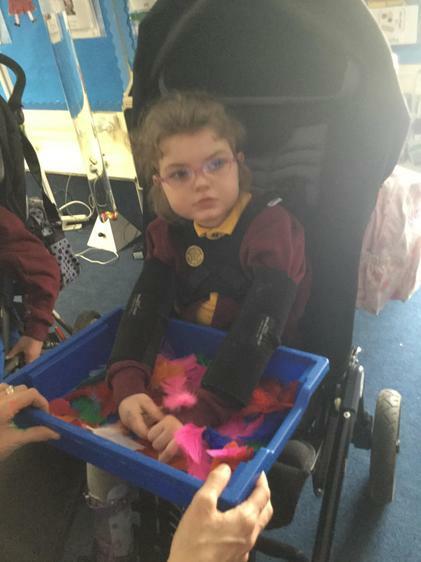 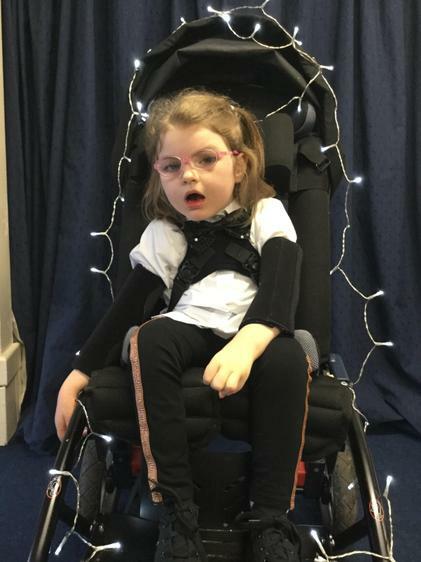 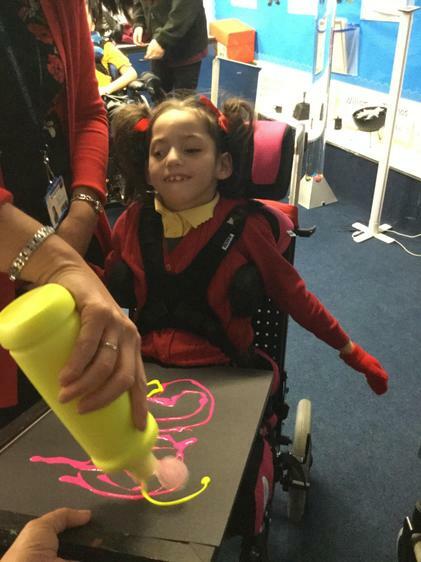 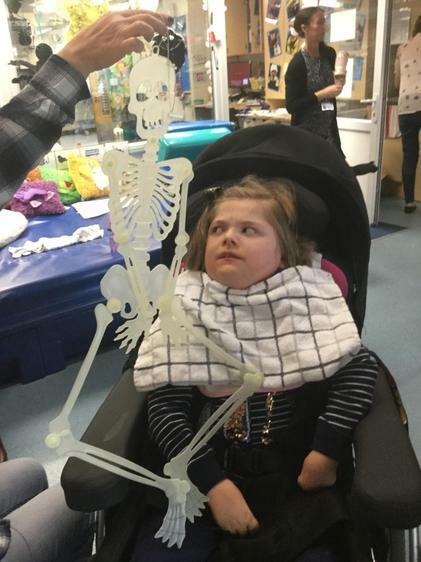 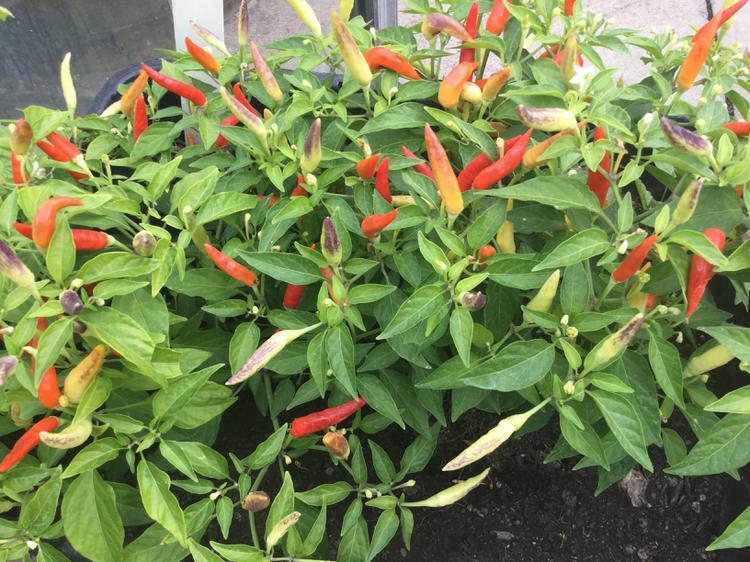 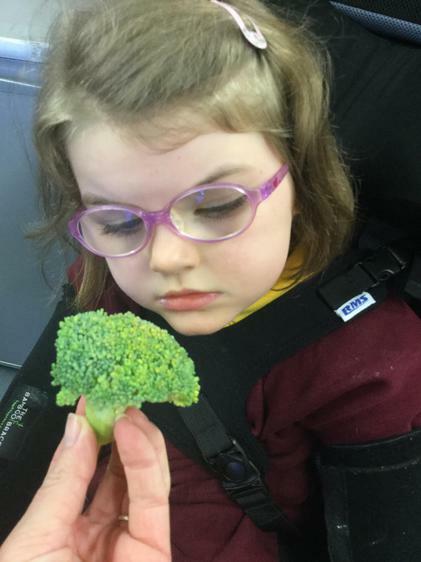 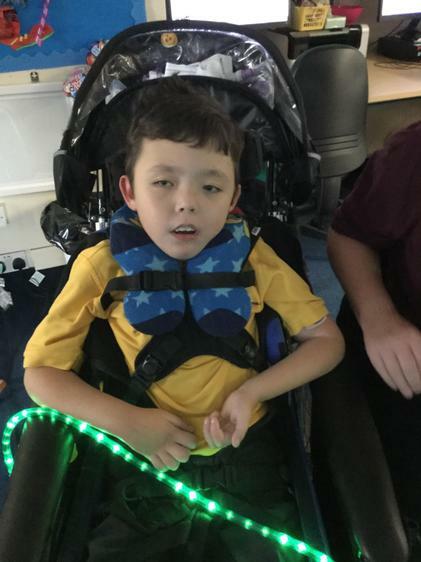 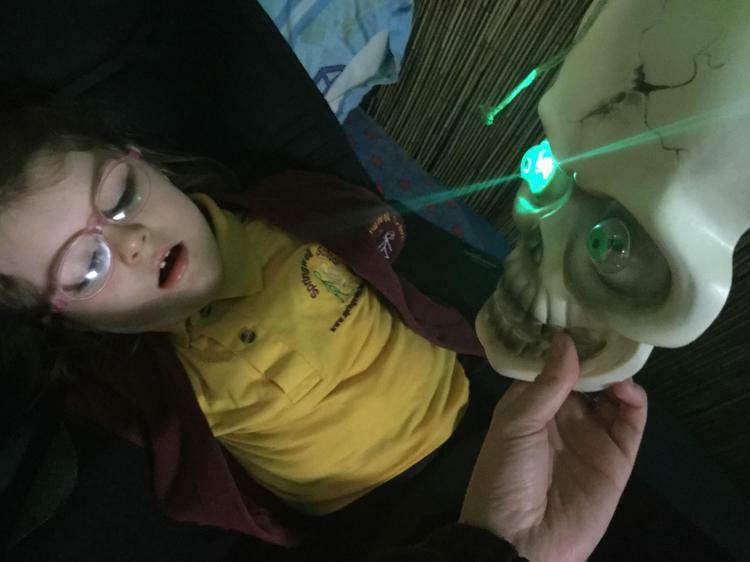 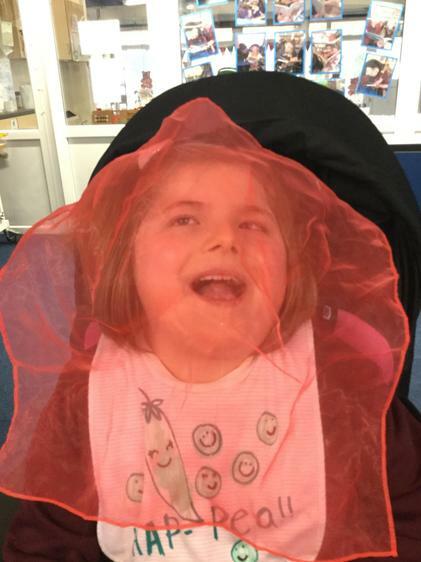 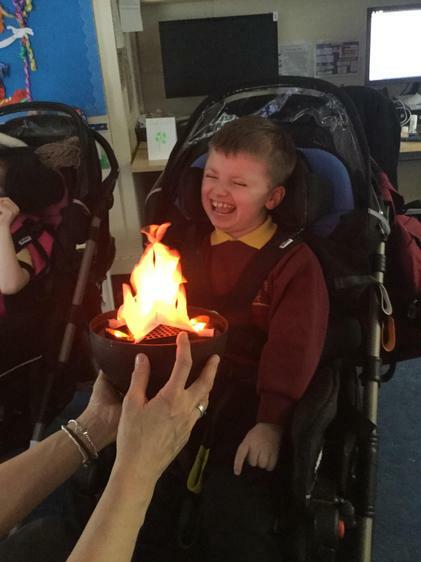 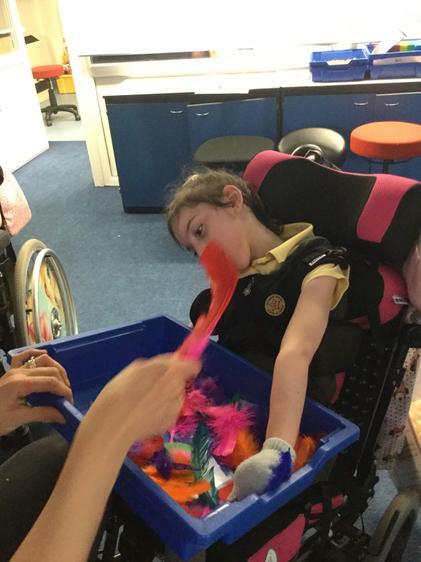 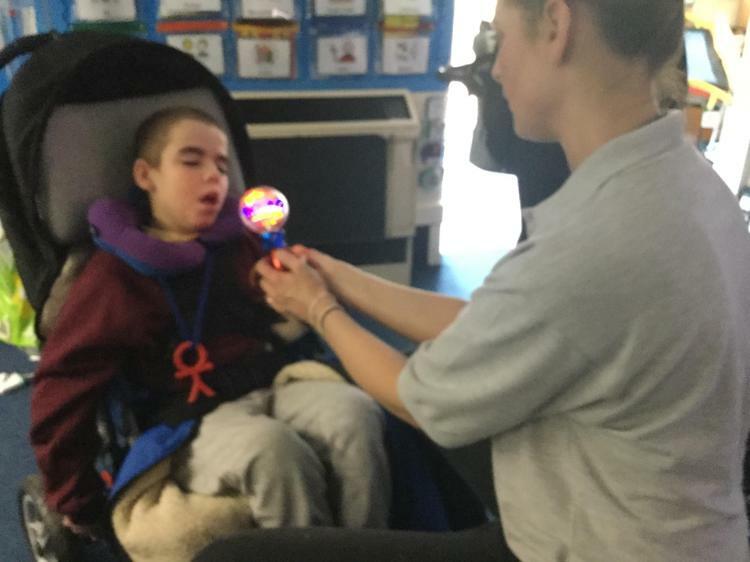 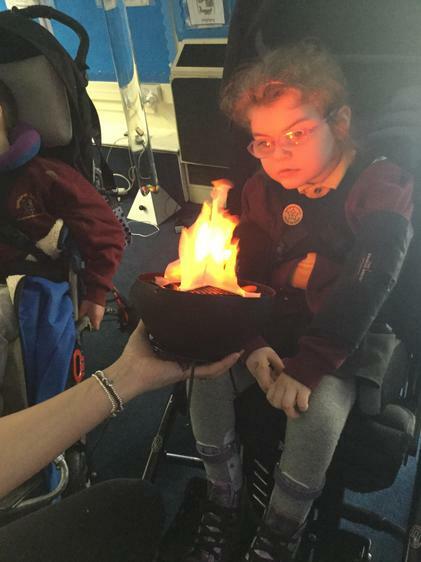 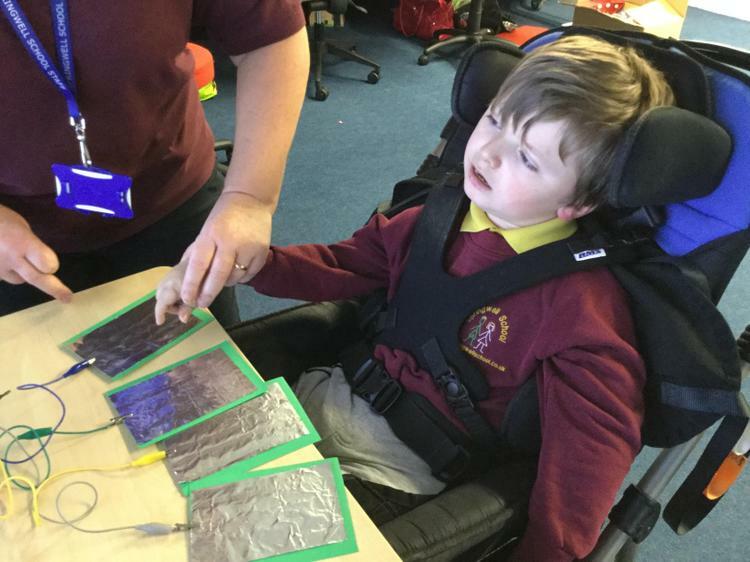 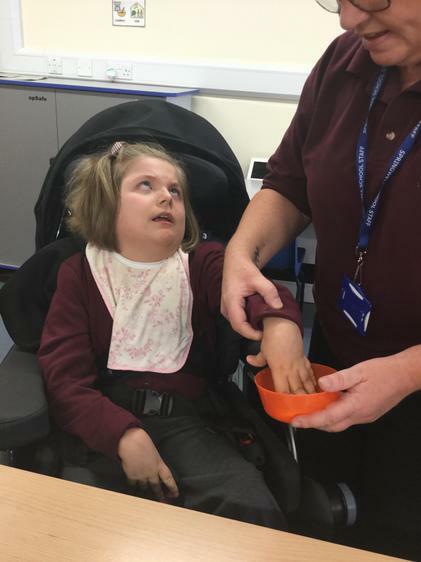 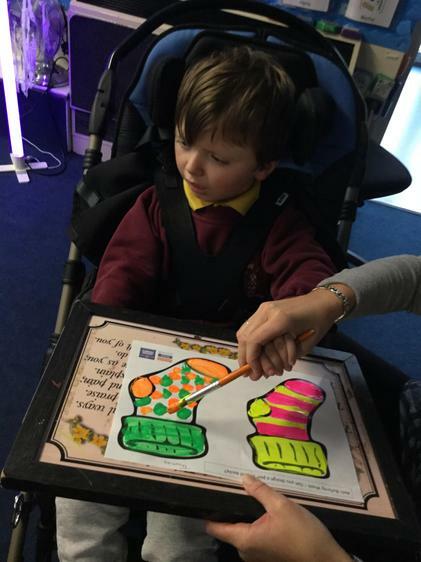 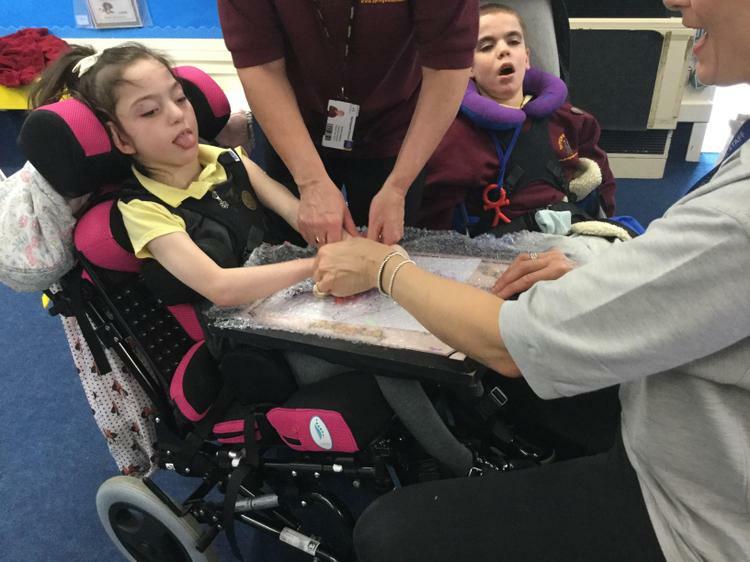 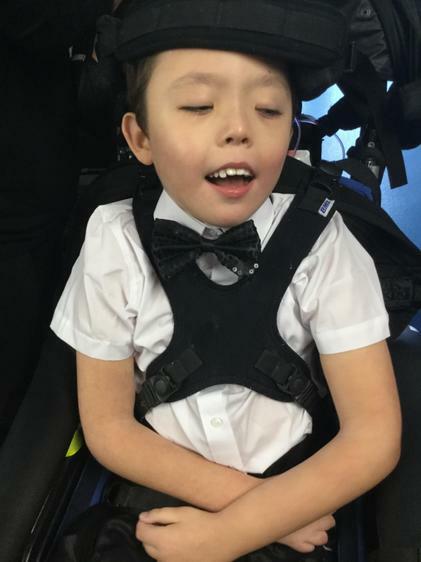 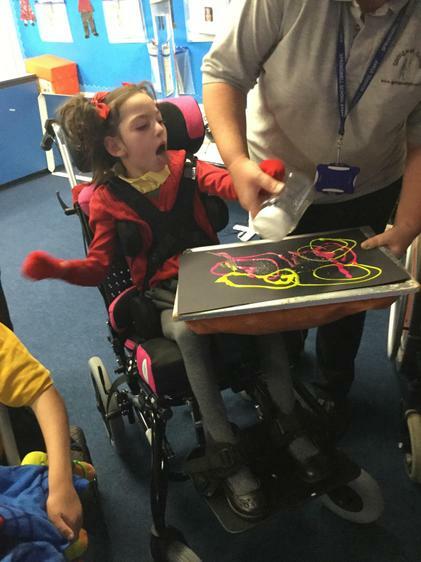 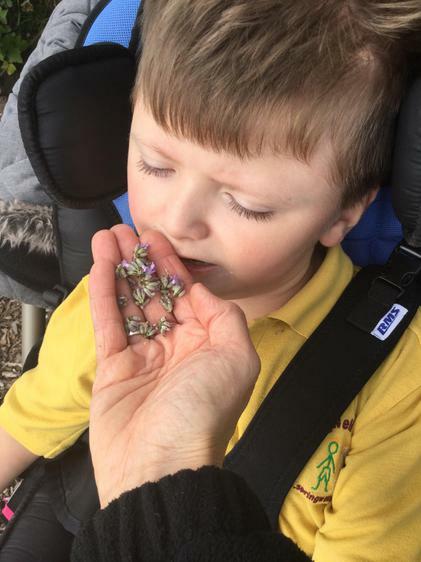 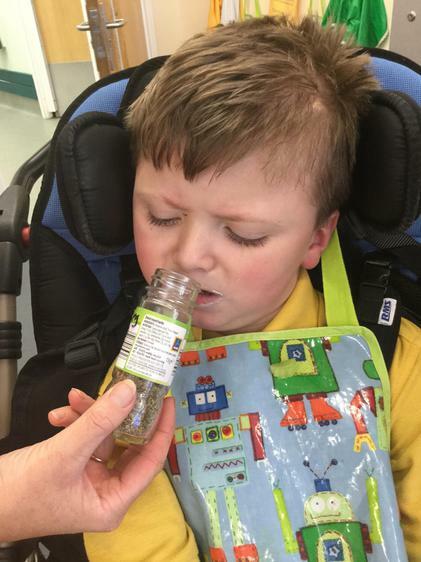 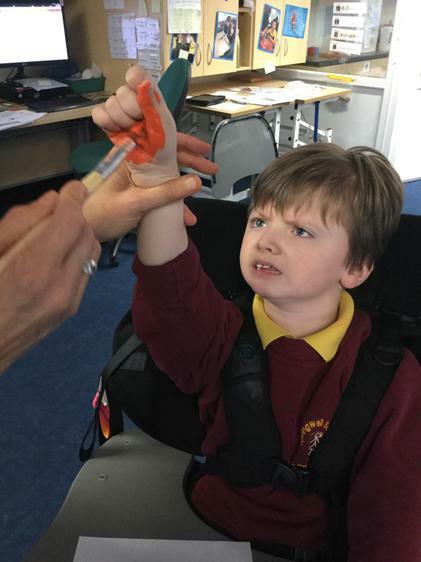 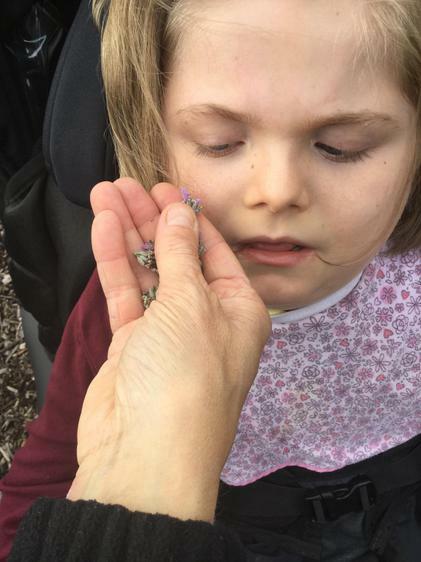 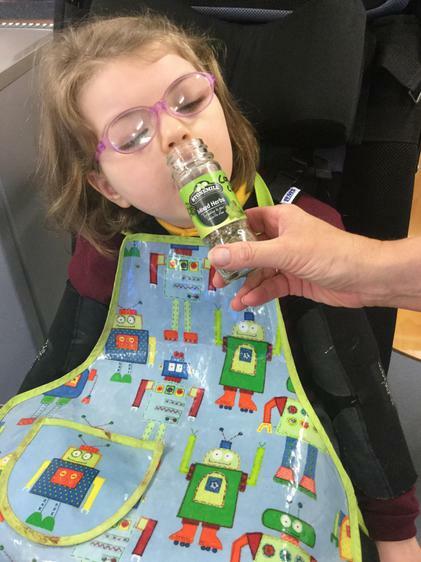 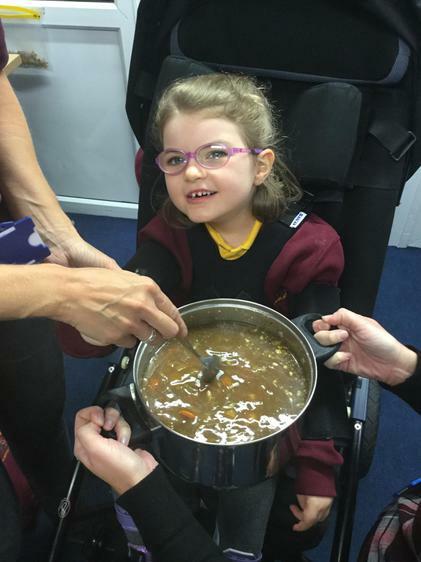 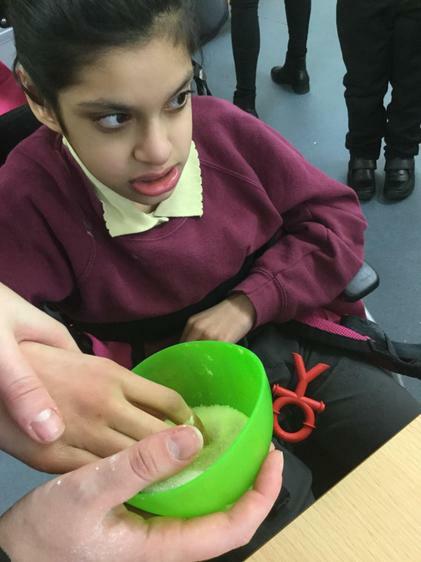 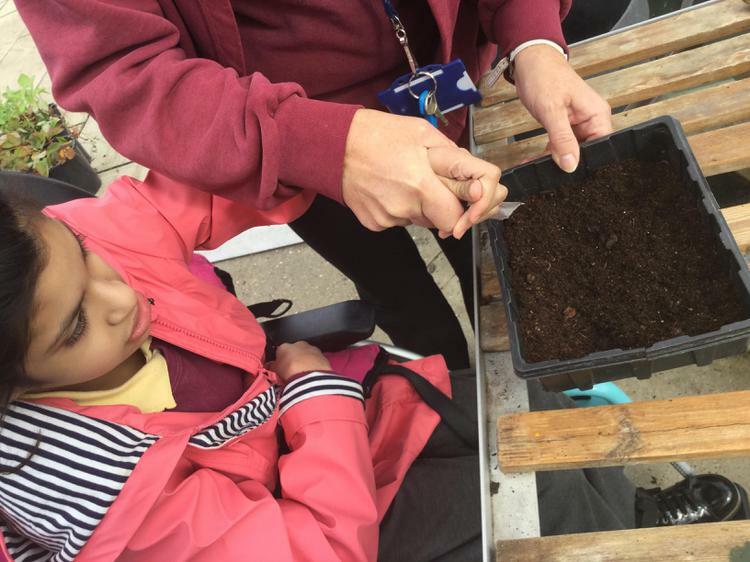 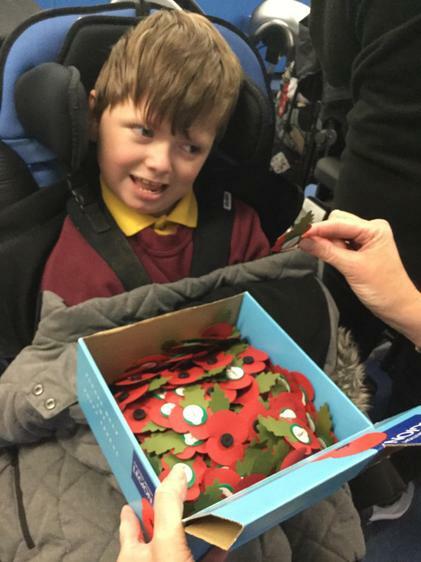 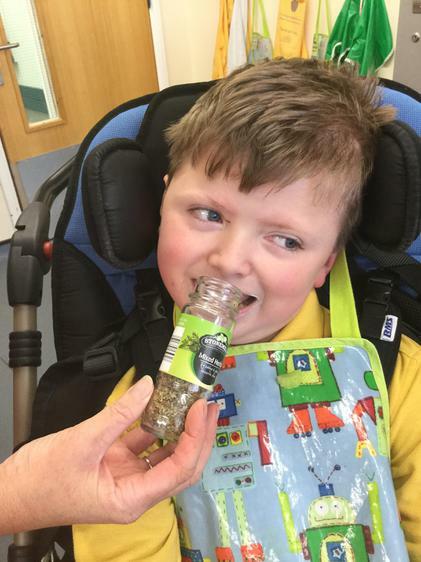 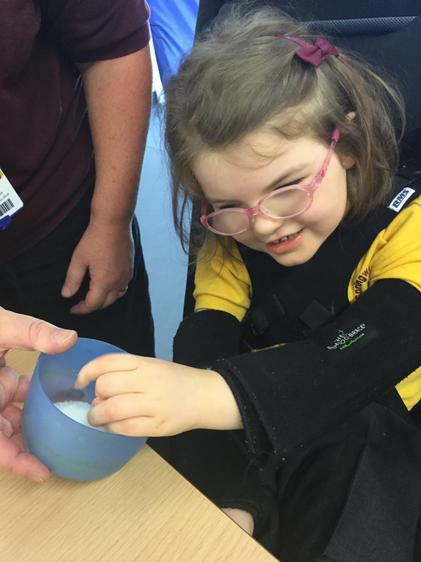 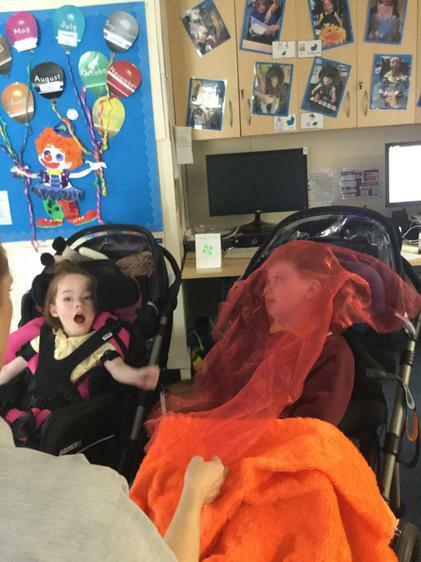 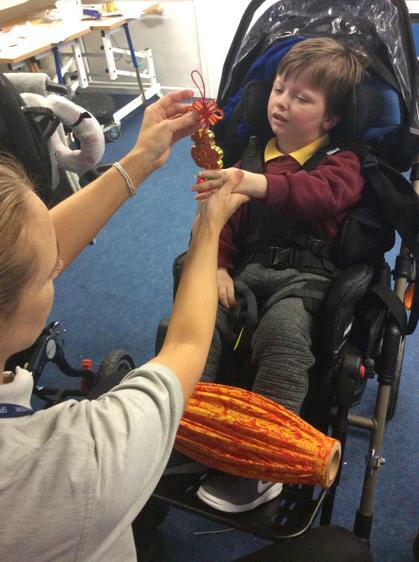 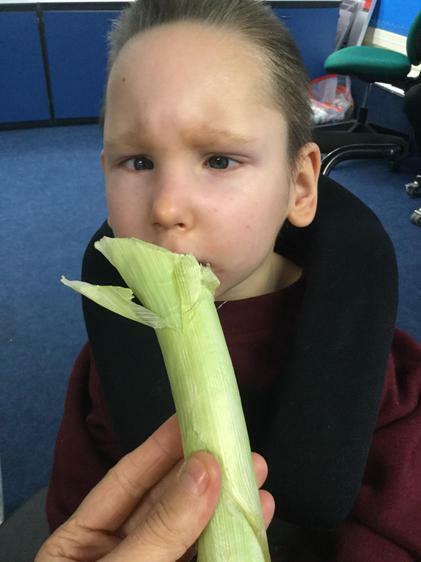 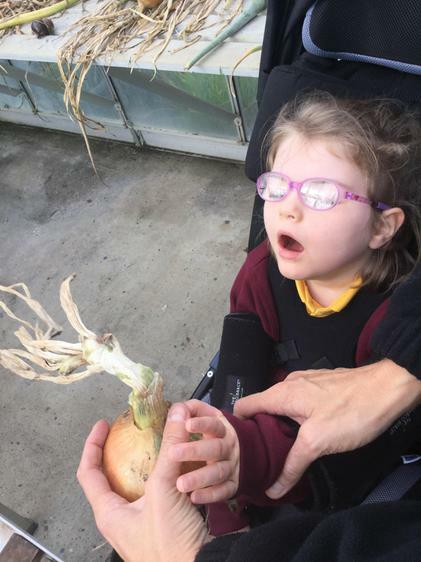 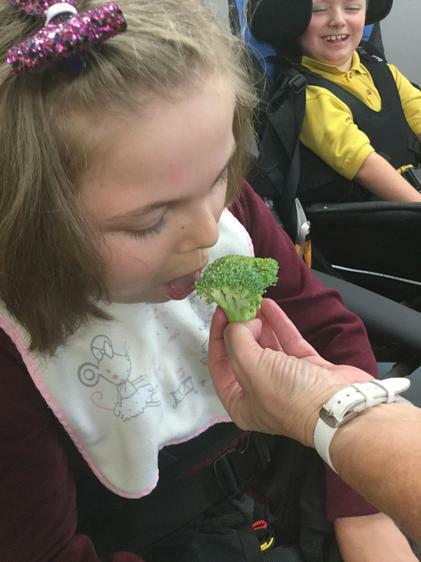 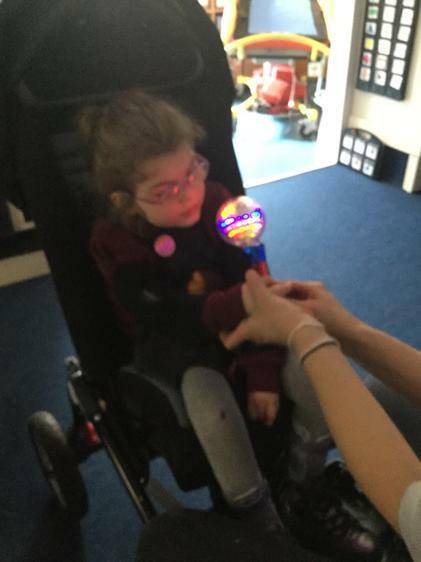 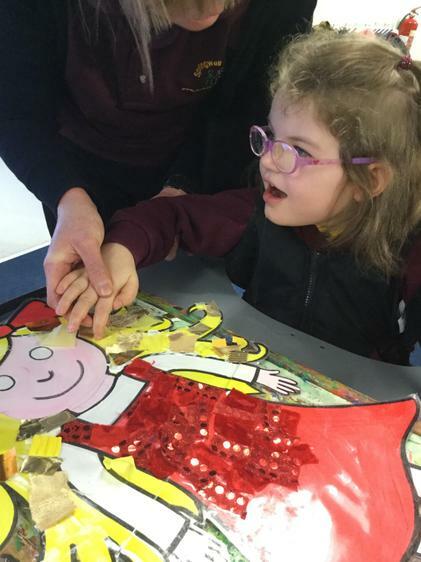 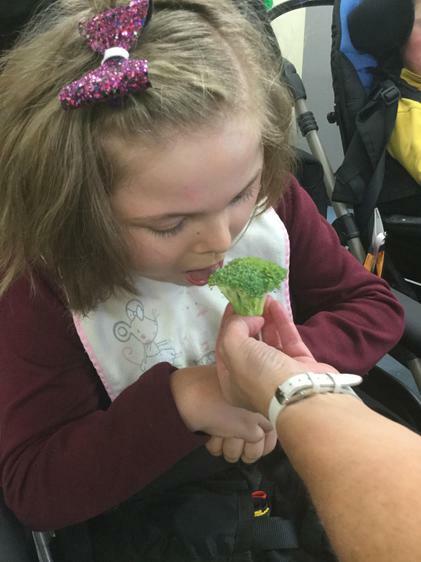 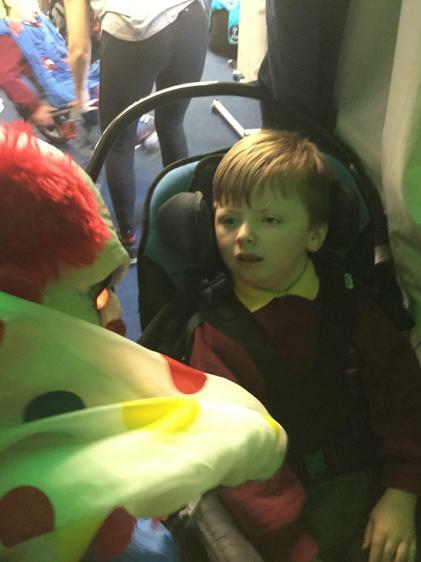 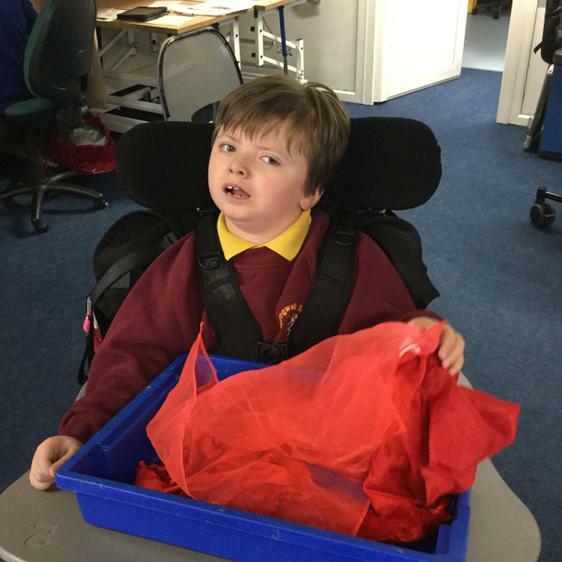 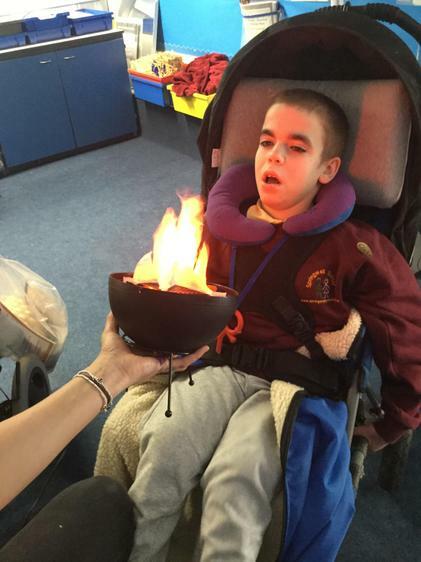 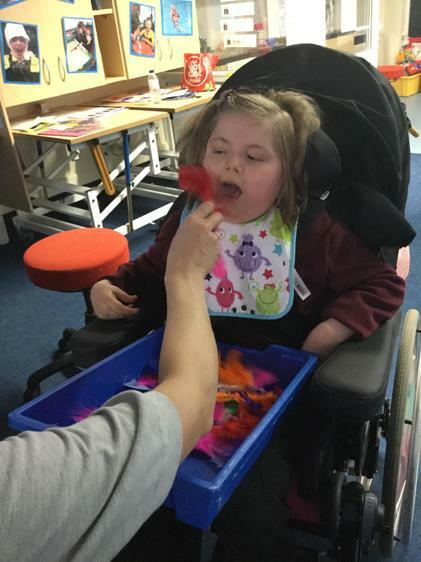 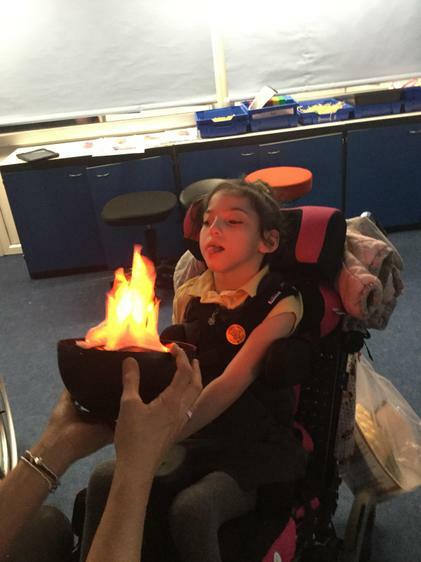 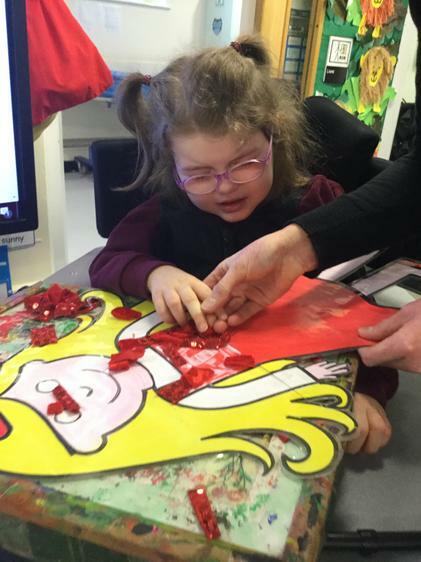 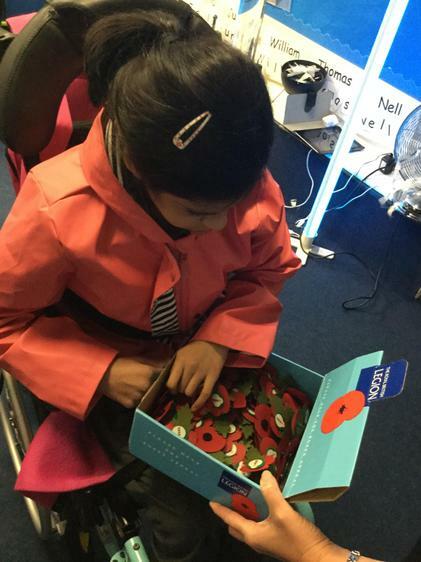 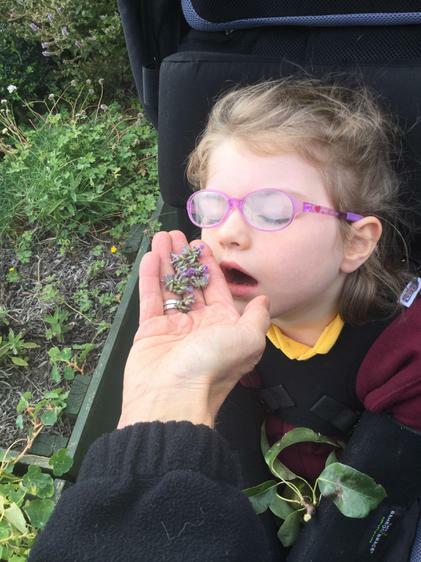 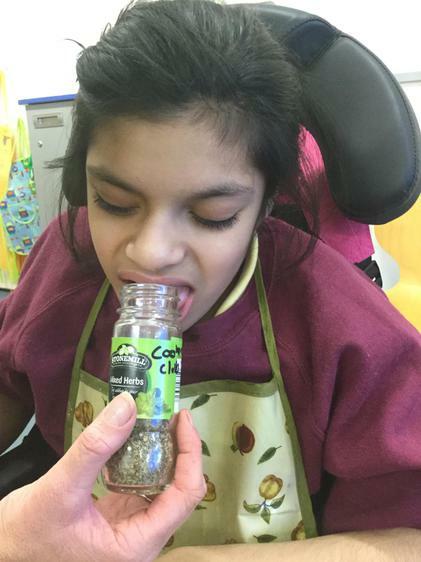 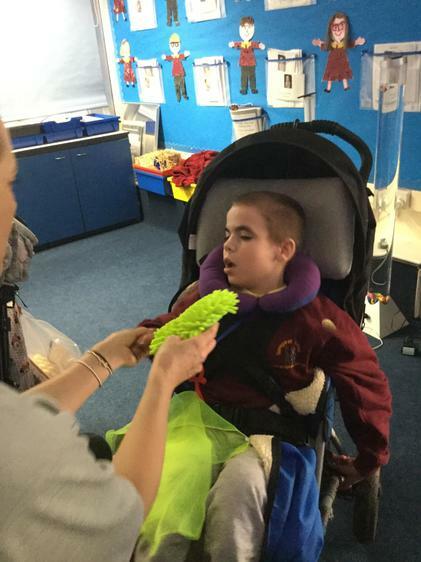 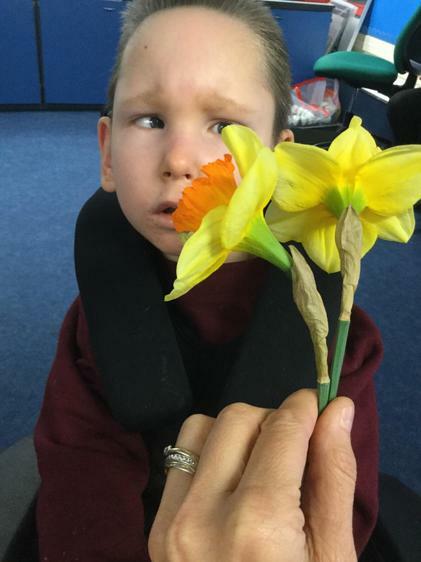 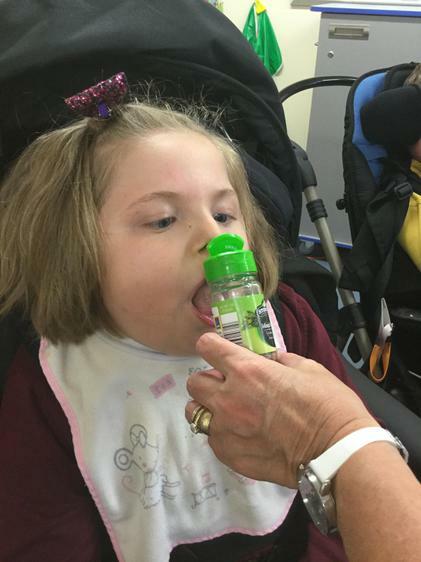 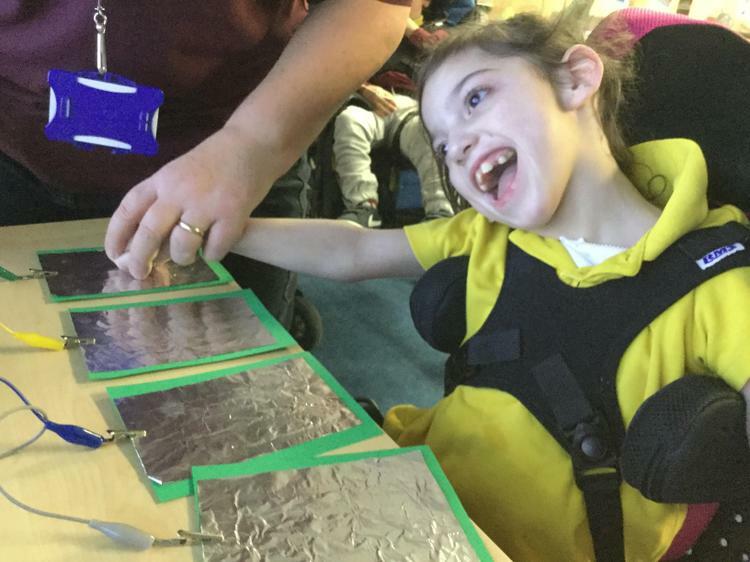 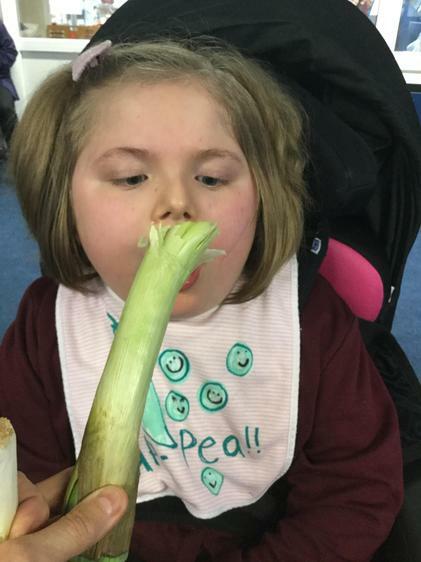 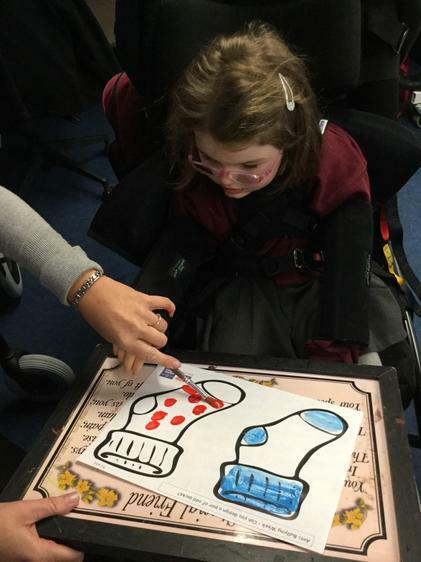 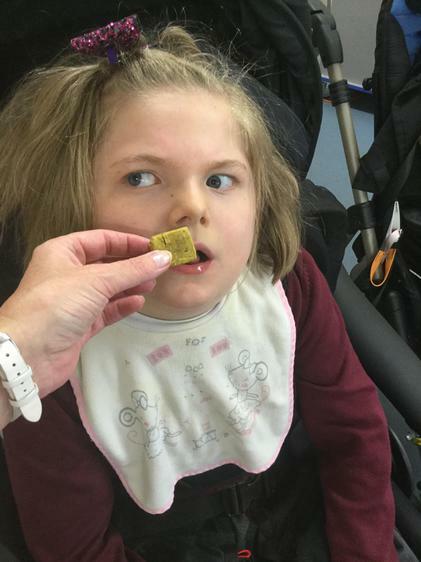 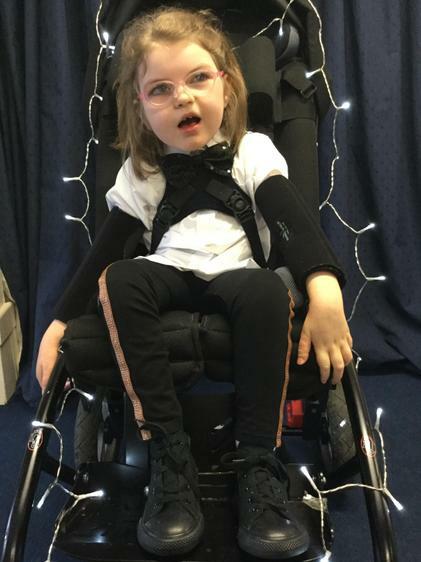 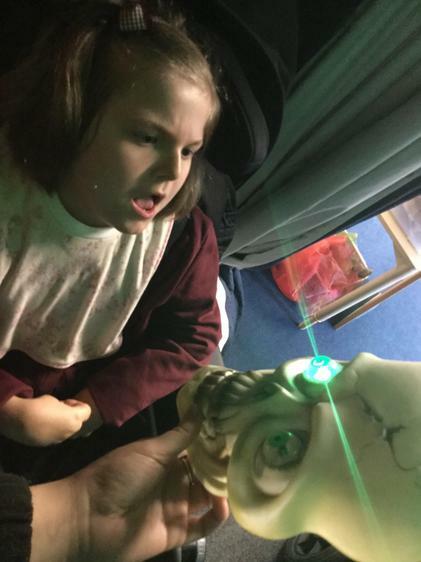 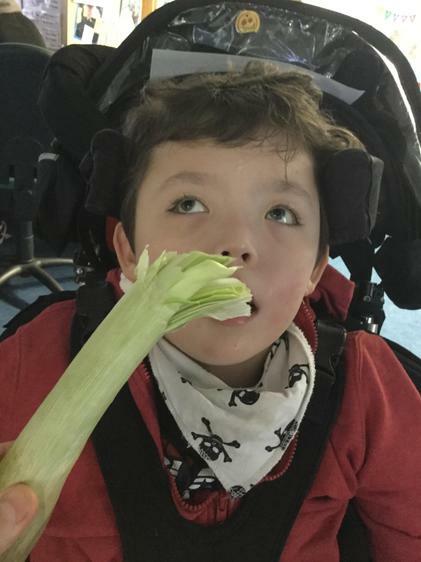 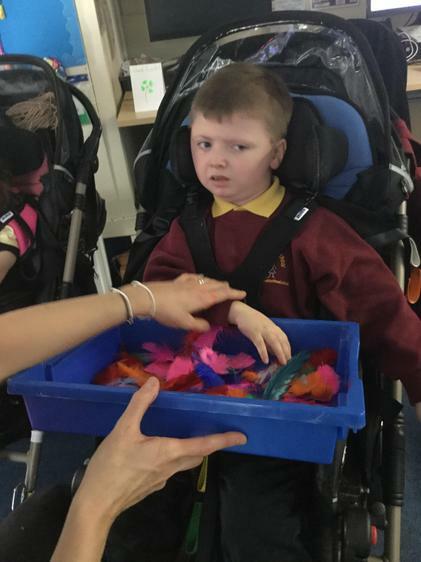 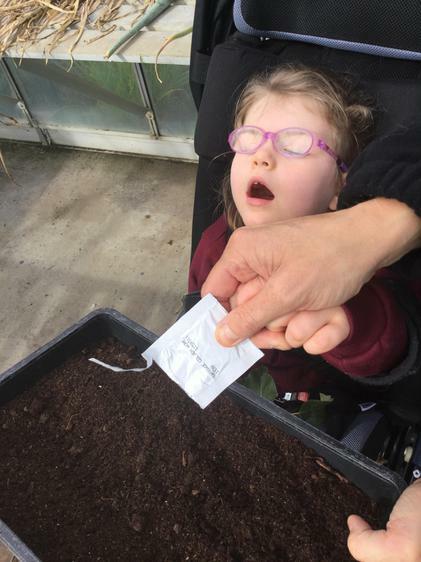 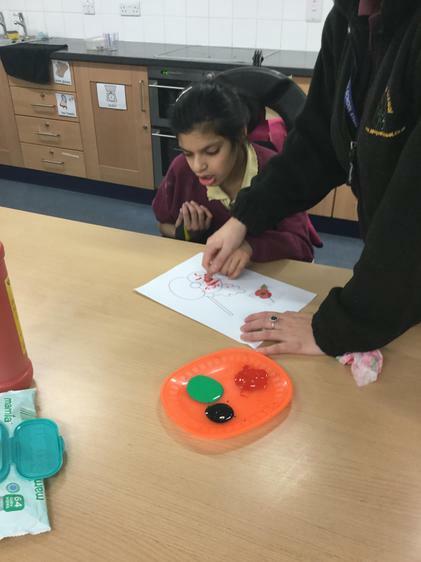 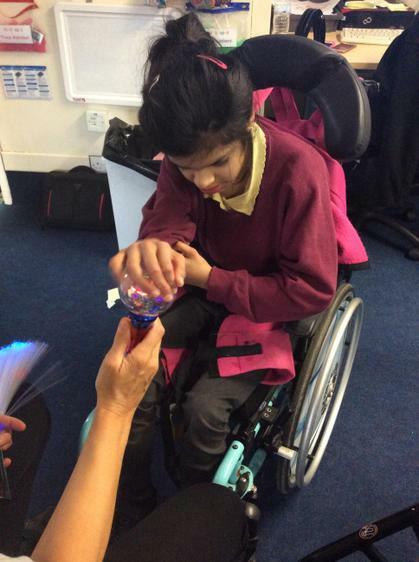 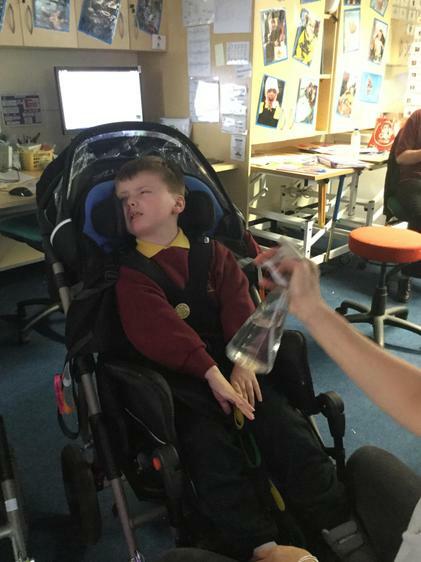 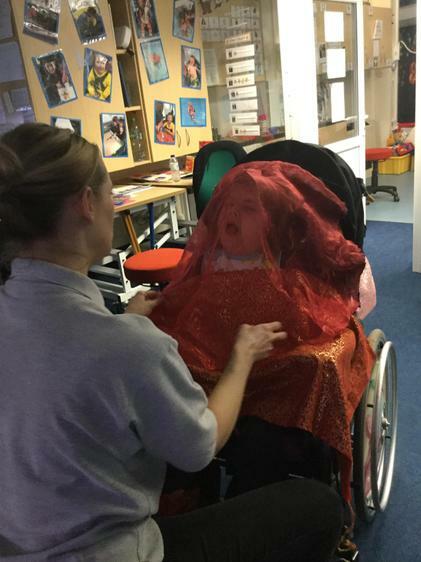 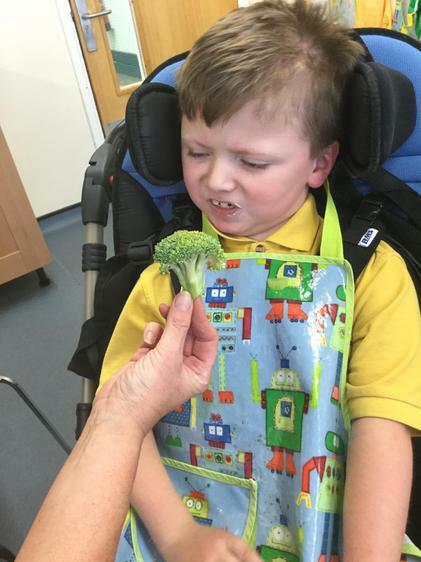 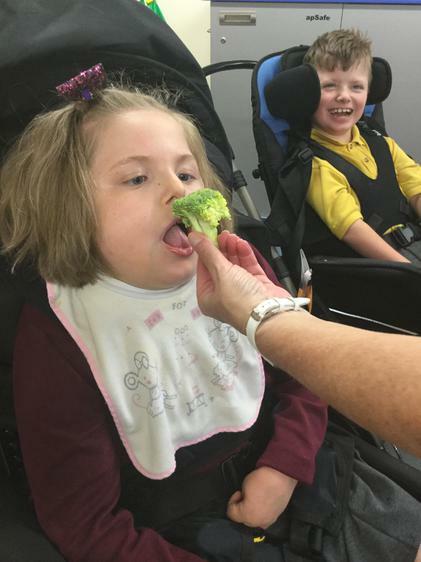 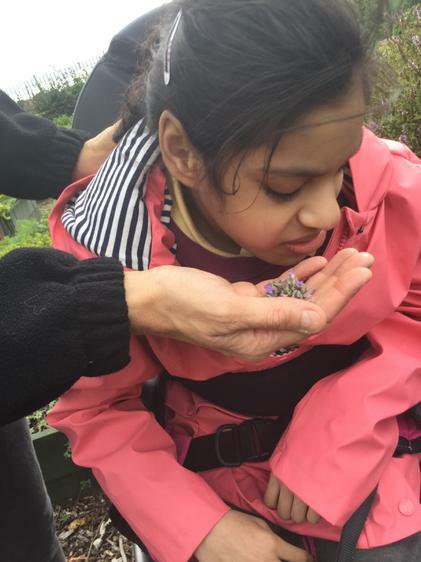 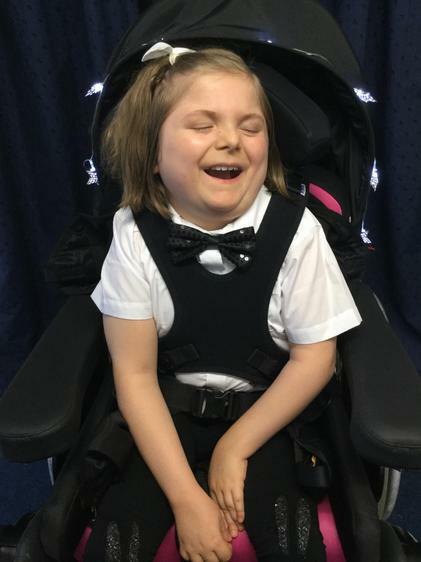 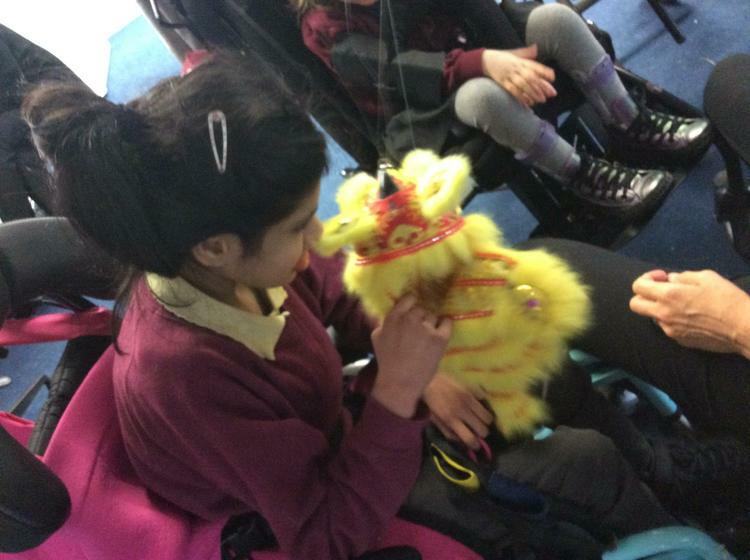 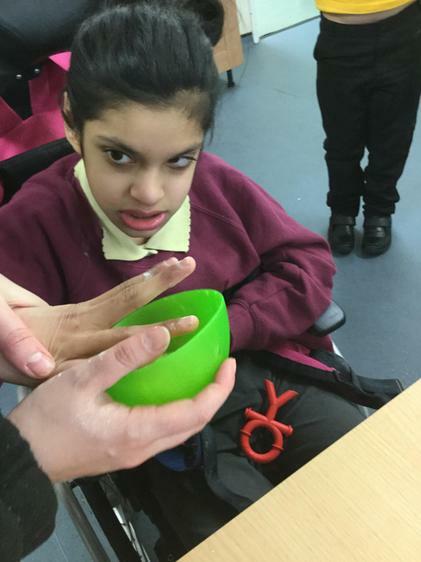 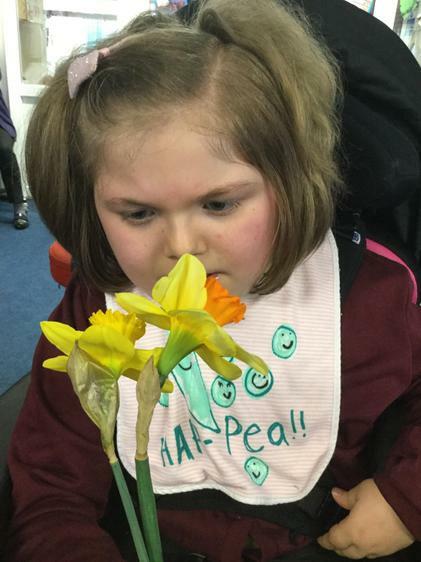 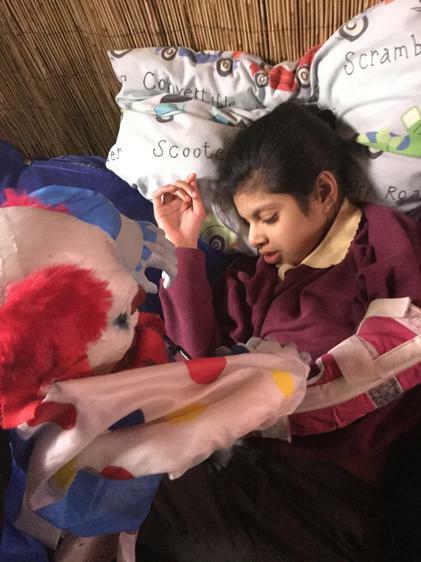 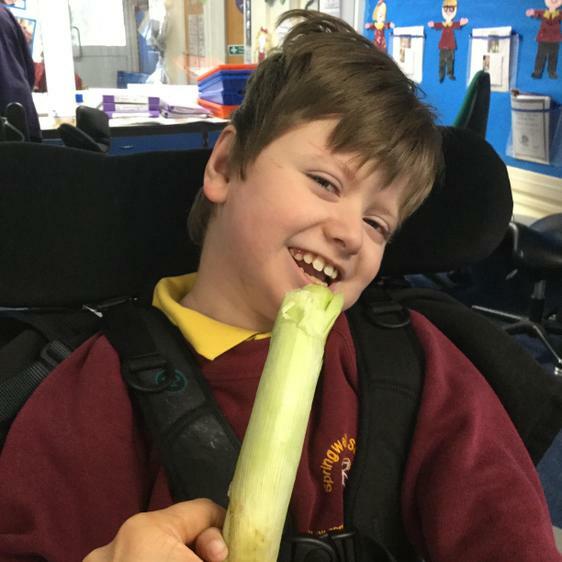 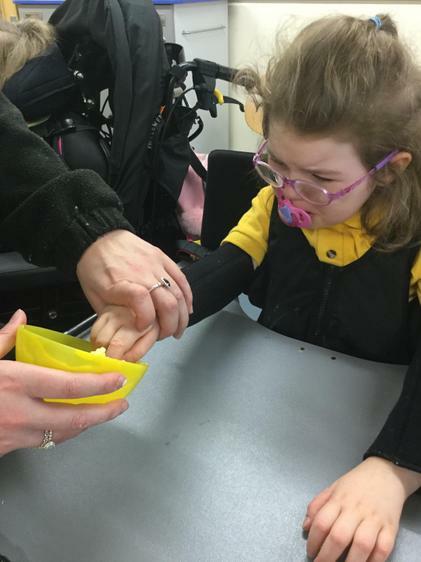 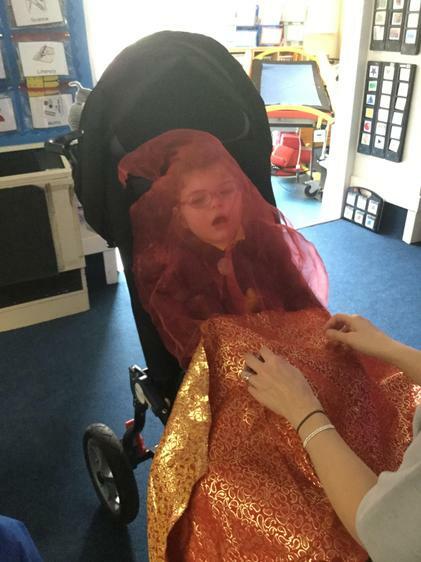 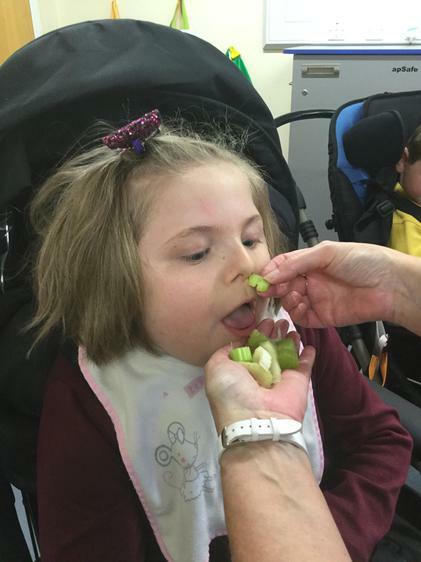 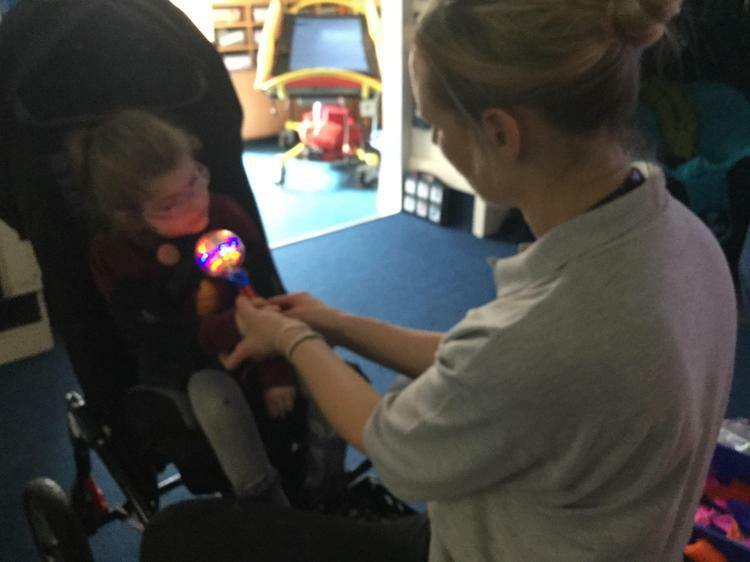 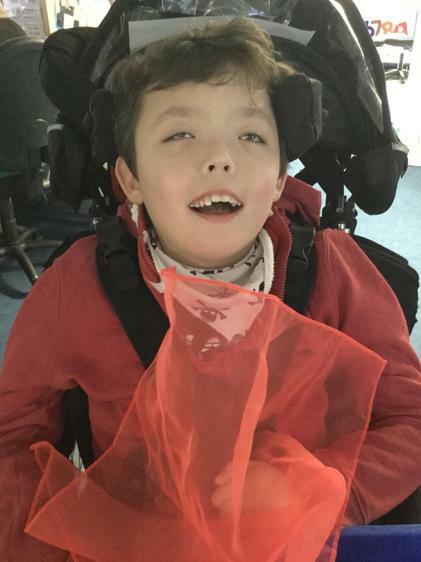 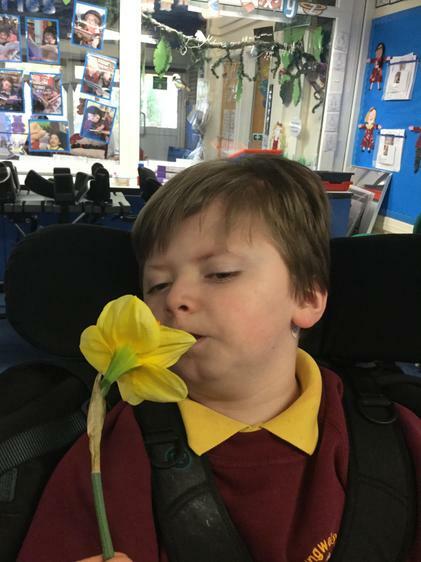 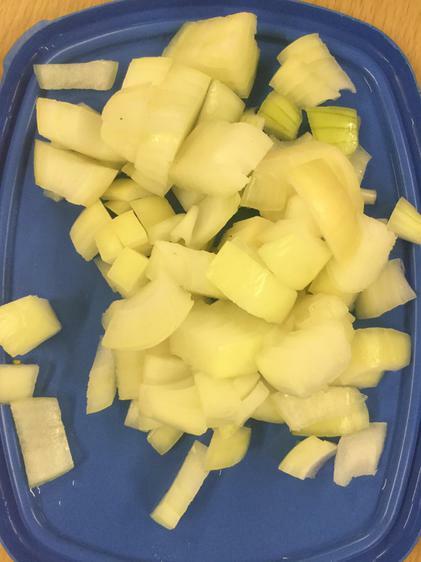 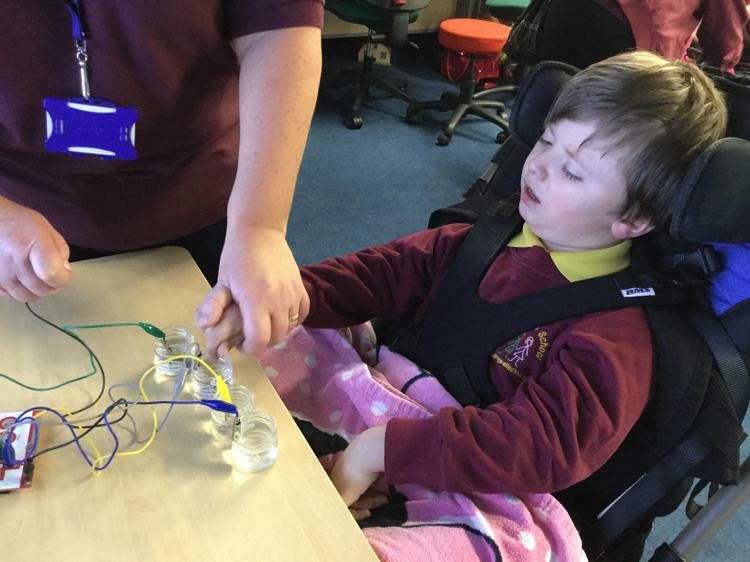 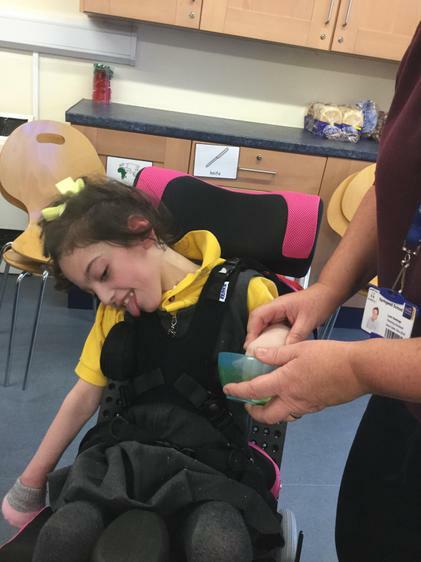 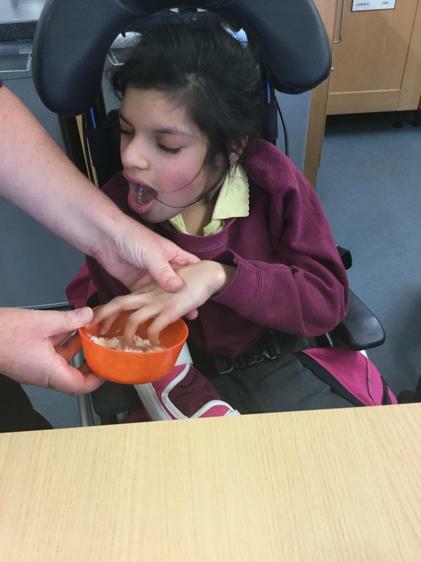 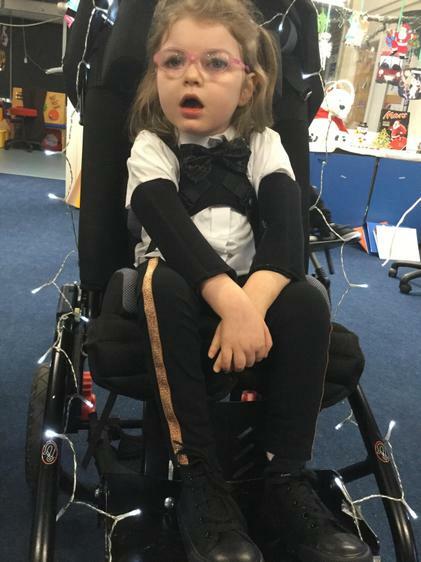 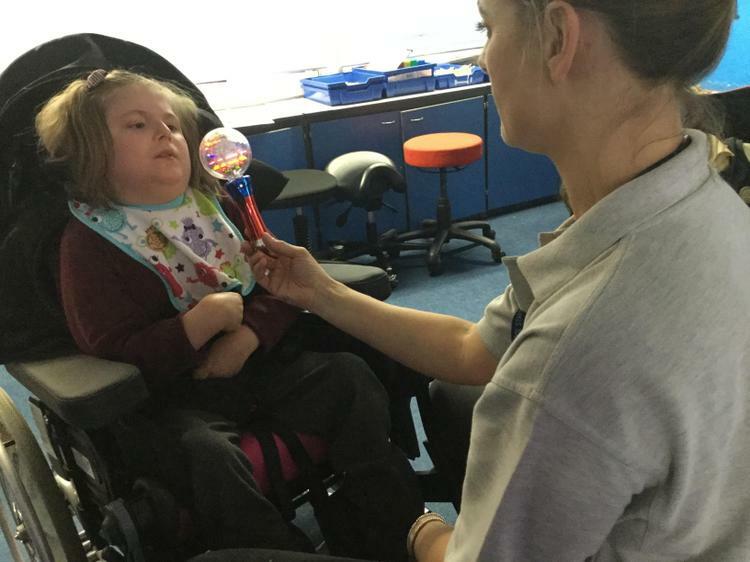 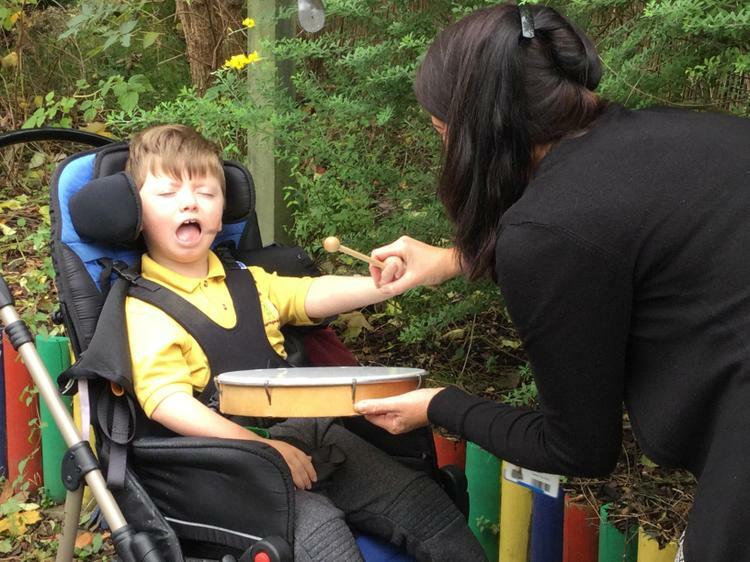 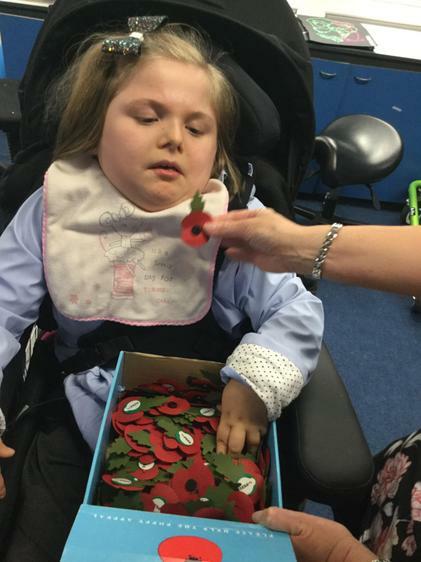 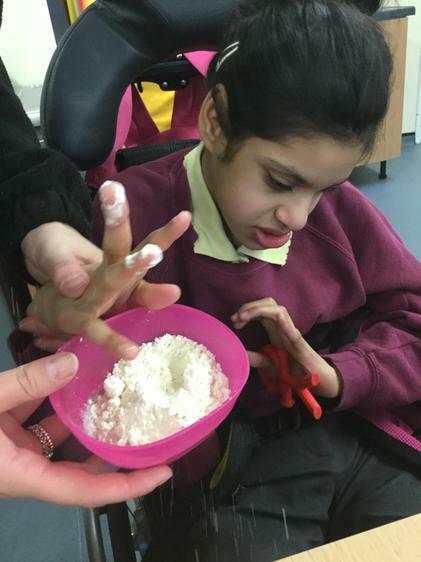 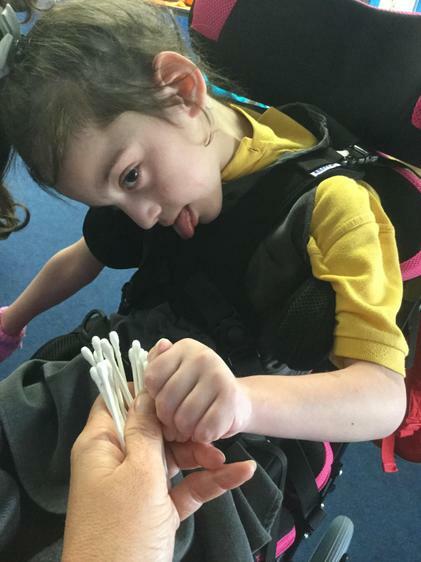 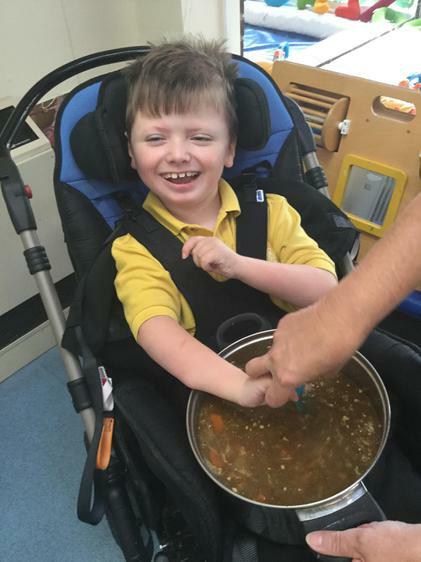 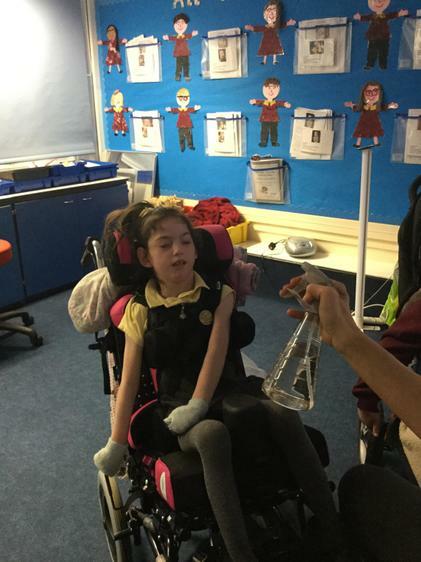 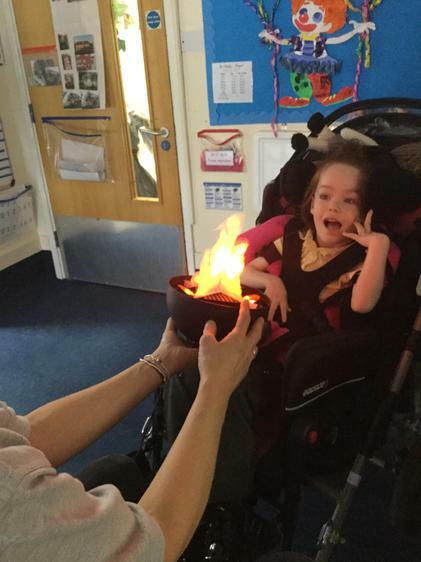 Sparkle curriculum will be delivered in a multi-sensory, creative way which will enable pupils to access learning using their senses through a holistic approach. 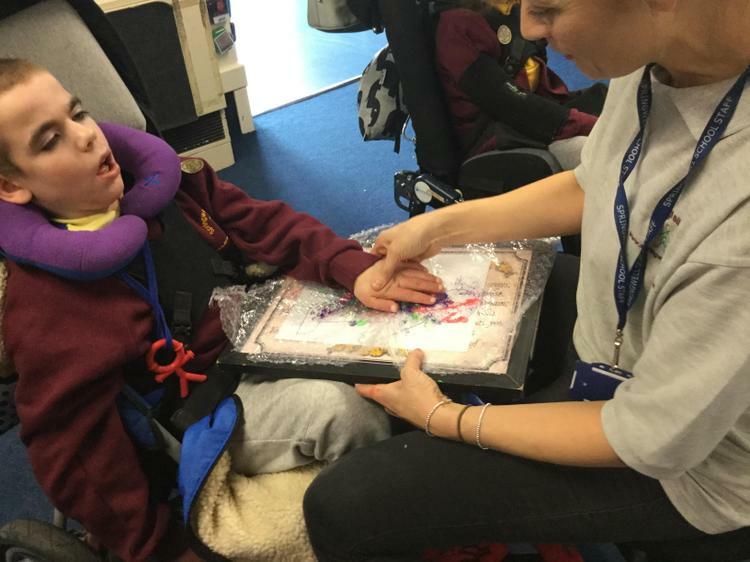 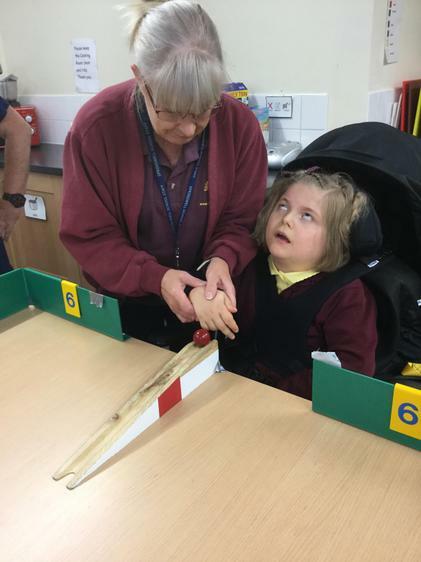 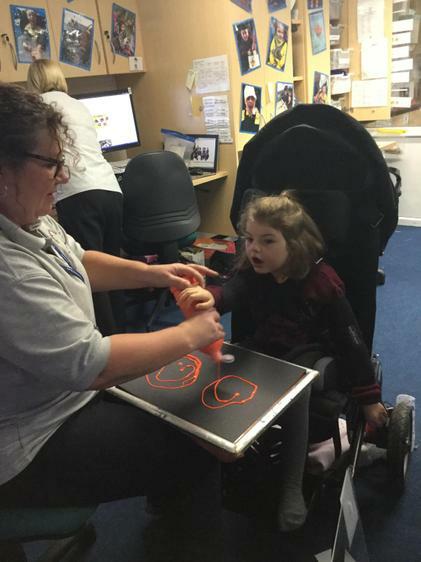 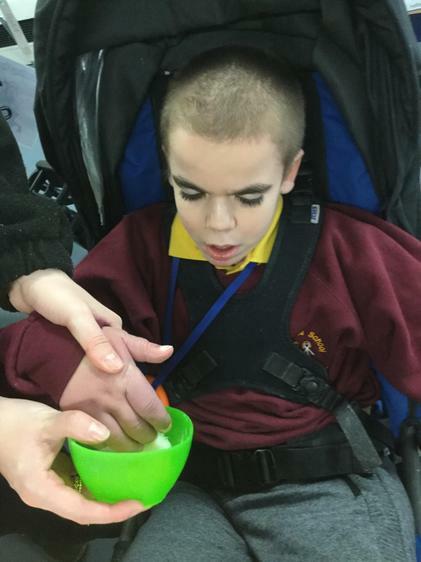 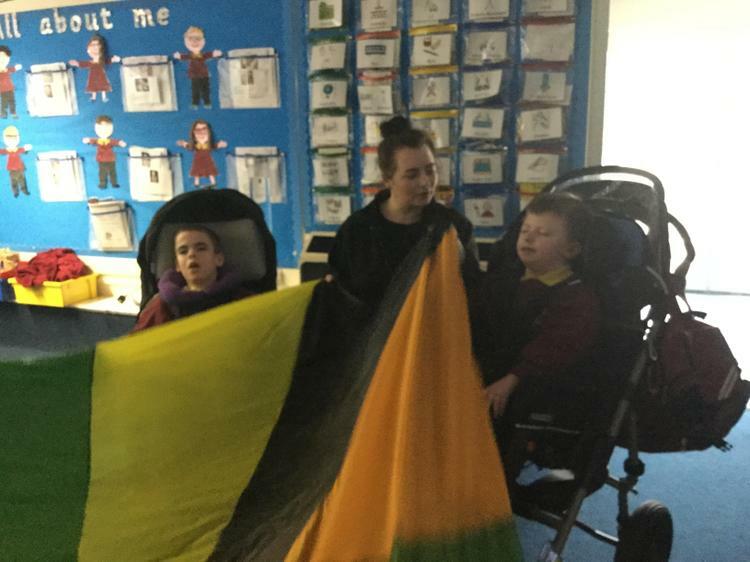 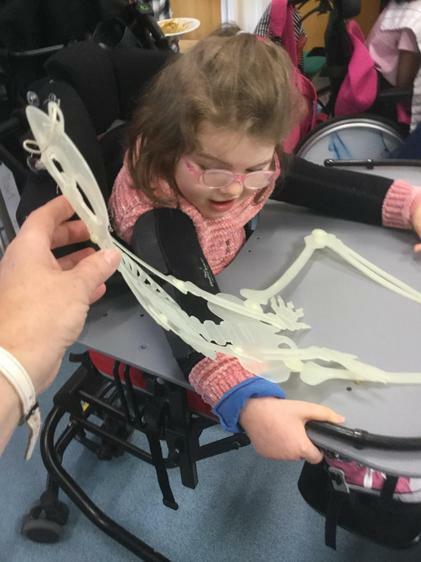 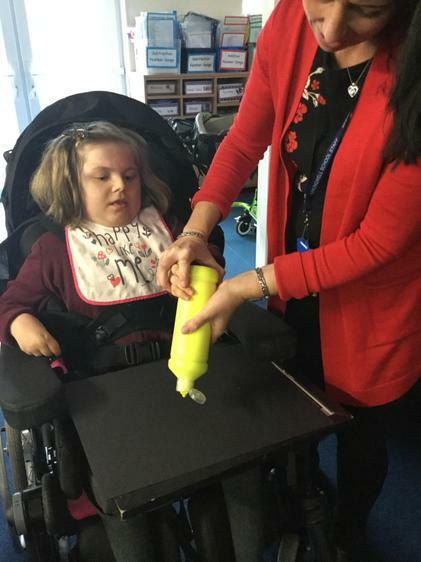 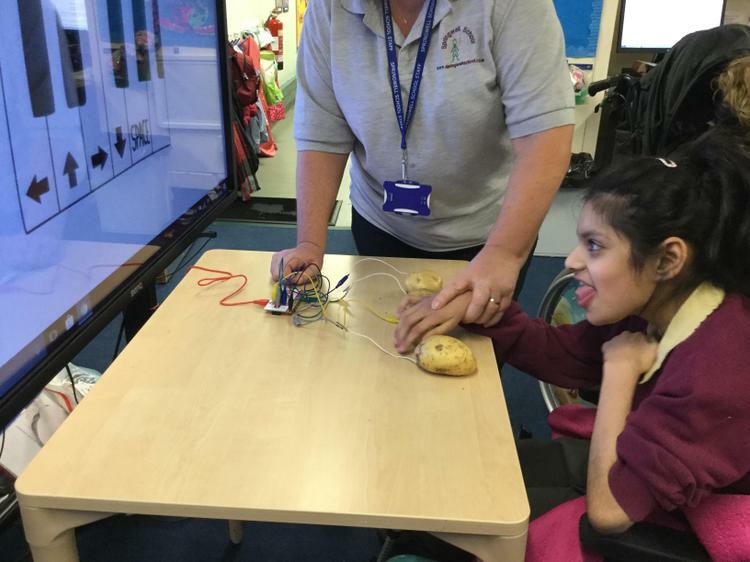 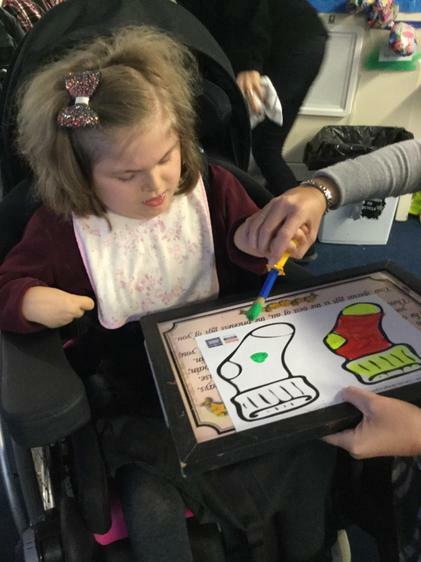 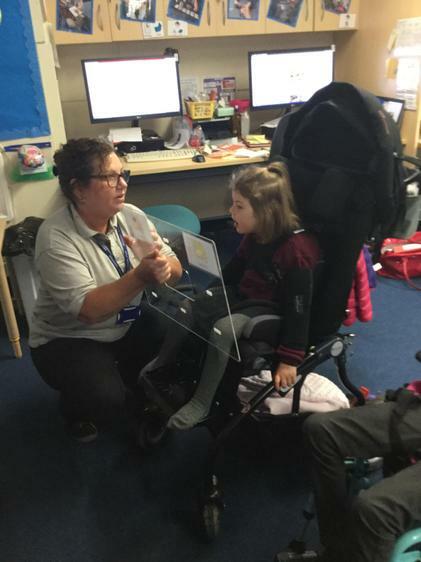 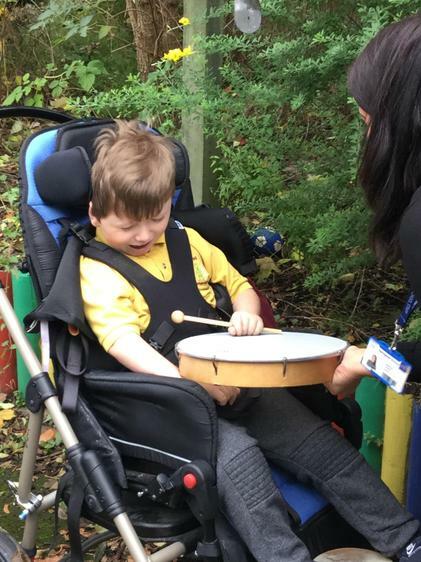 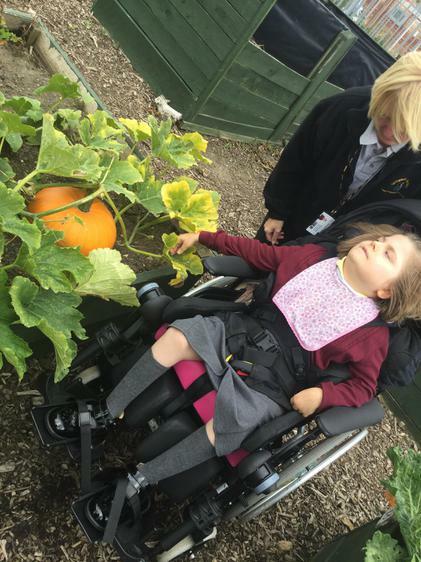 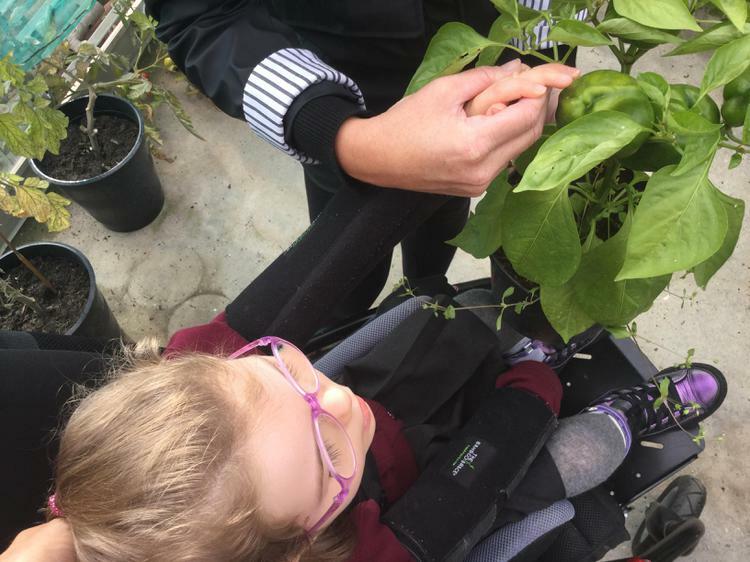 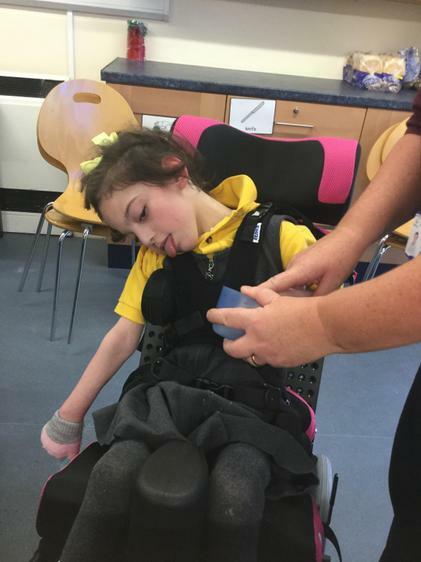 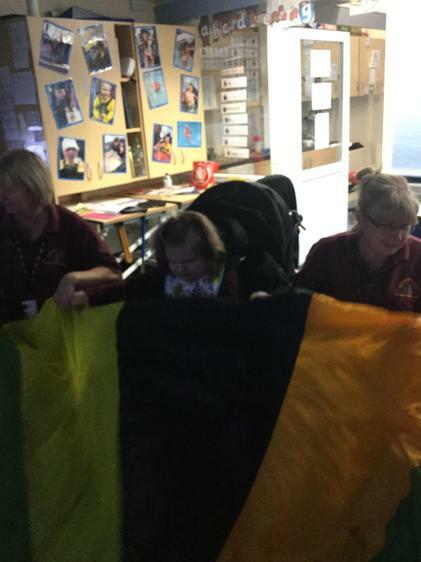 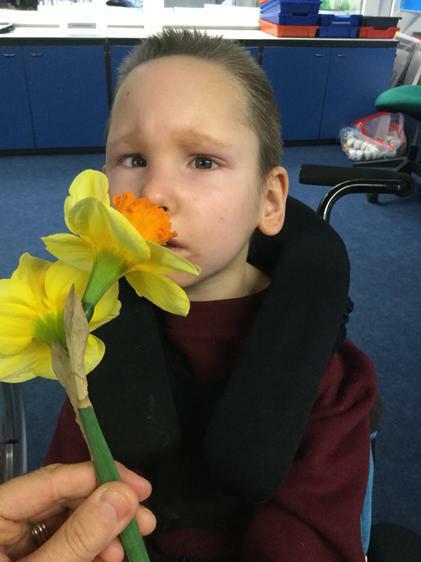 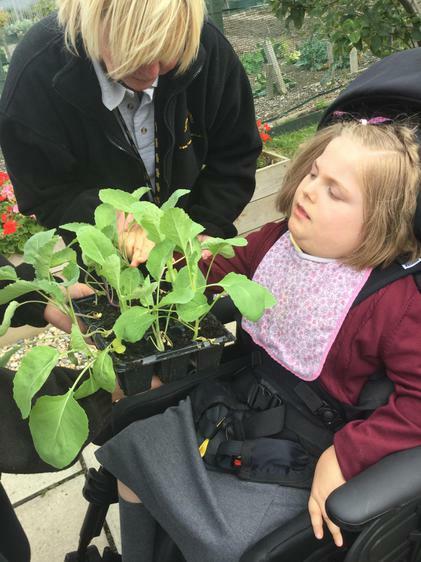 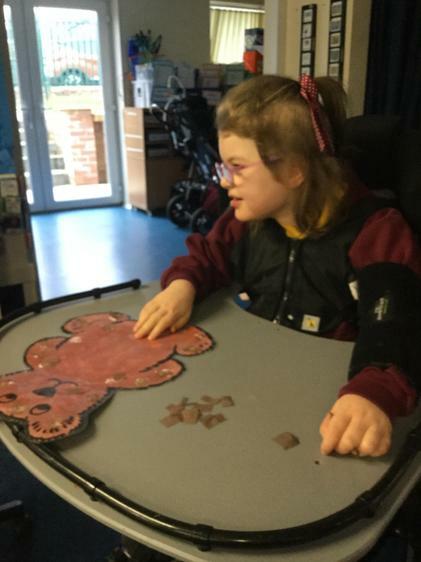 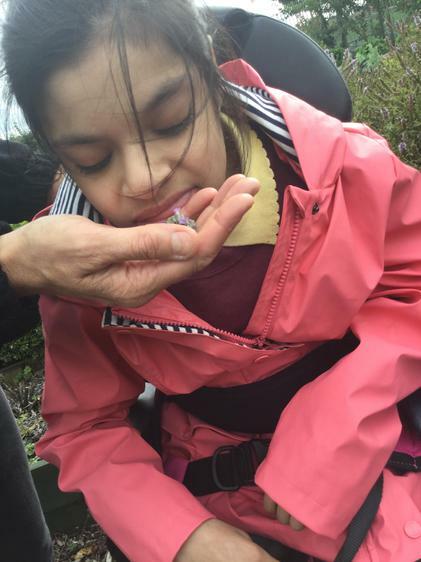 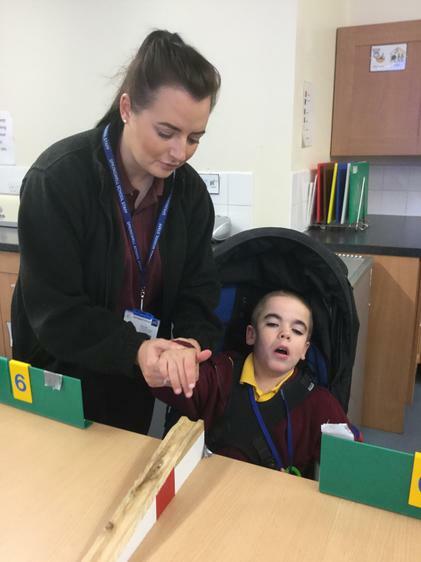 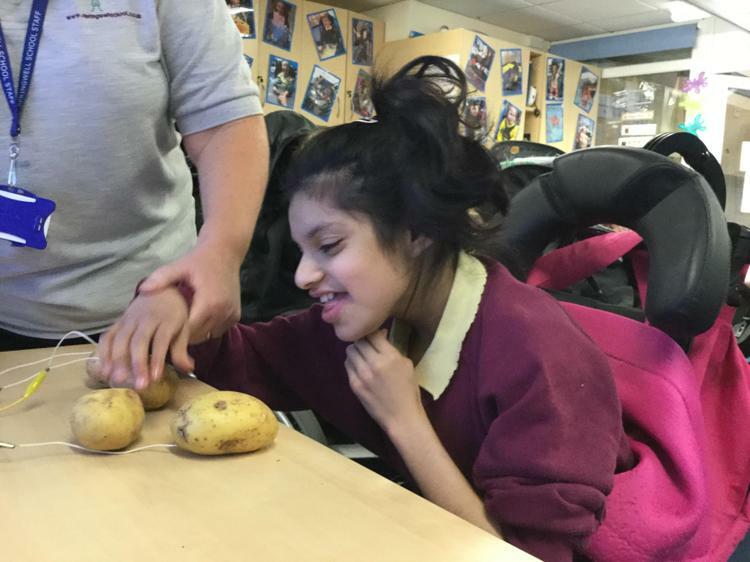 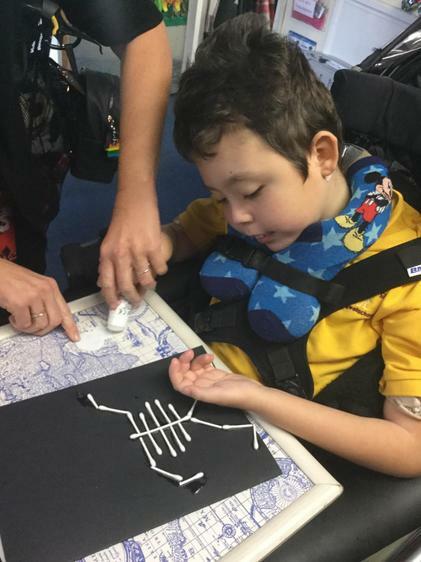 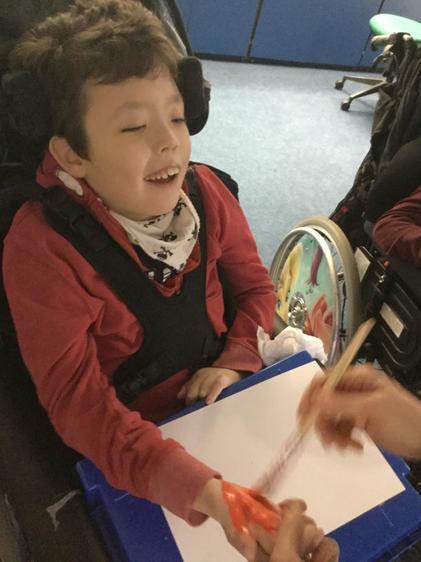 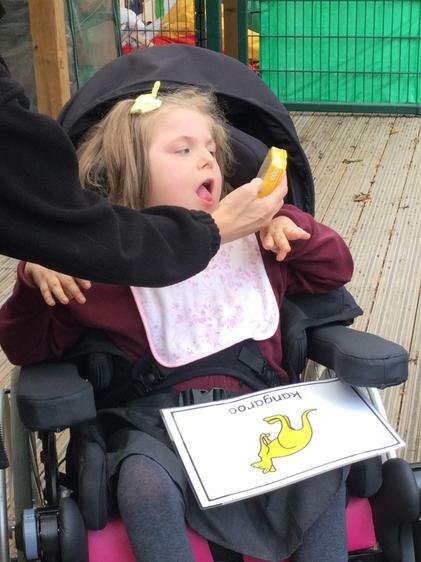 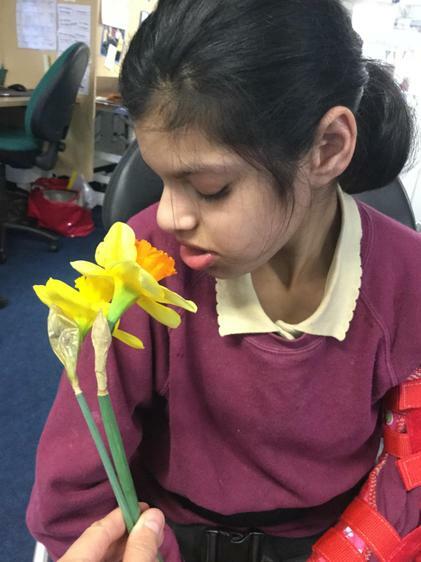 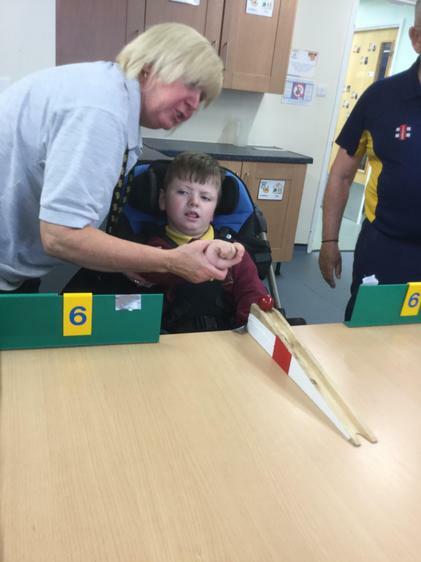 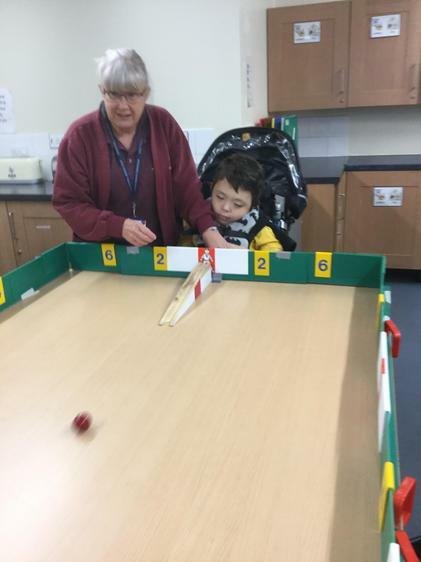 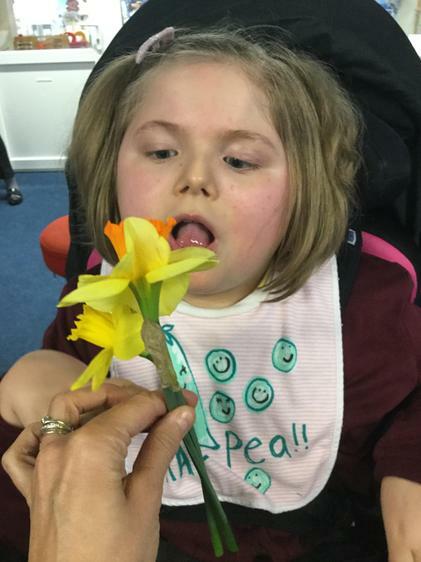 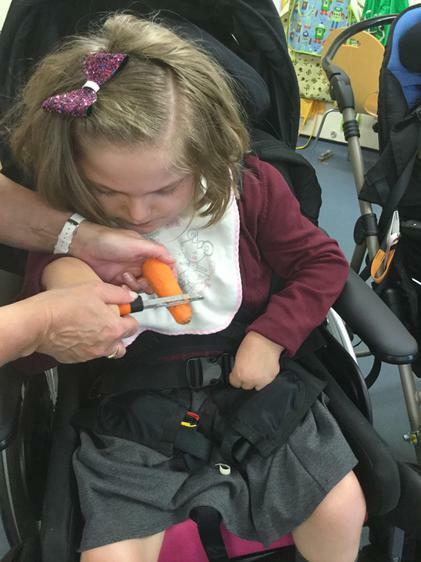 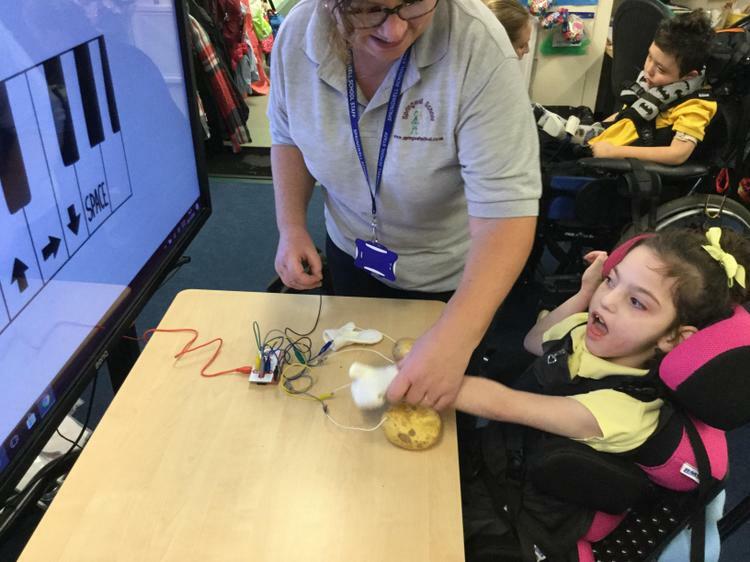 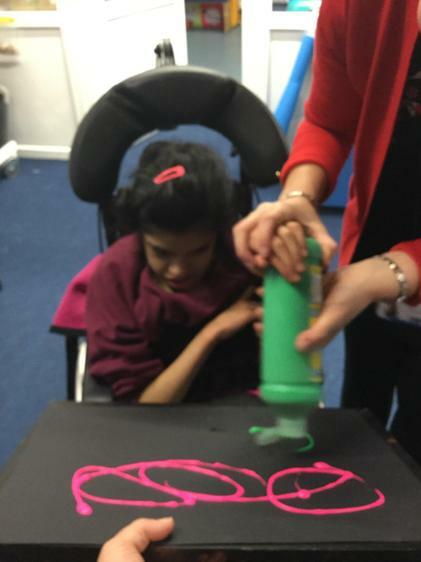 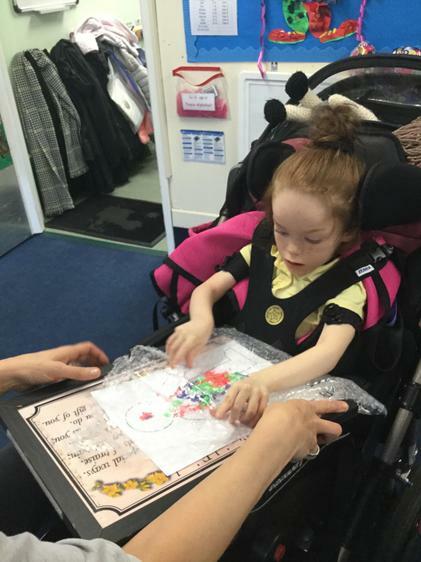 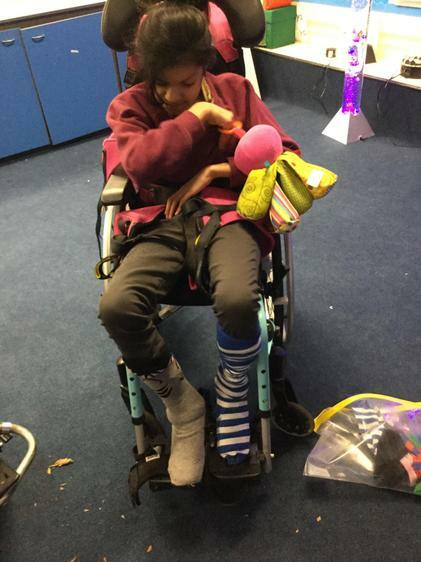 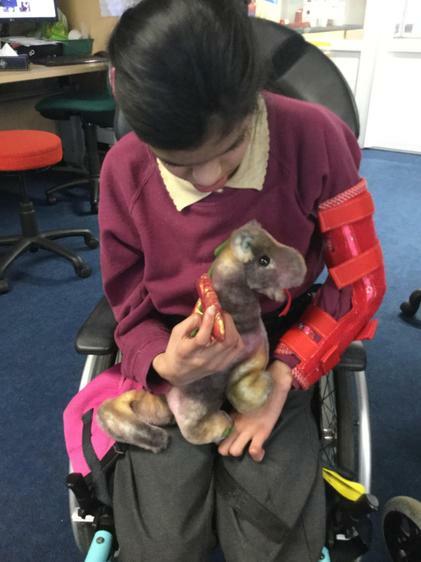 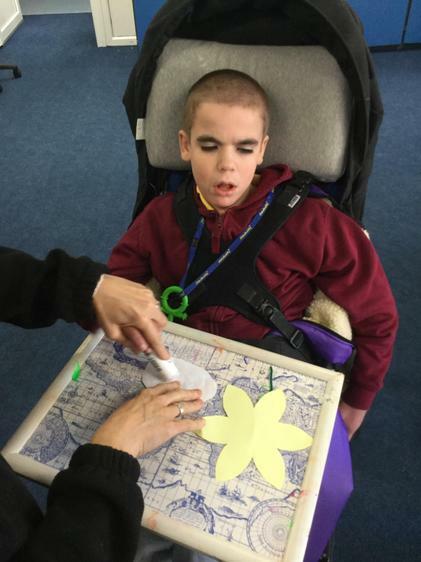 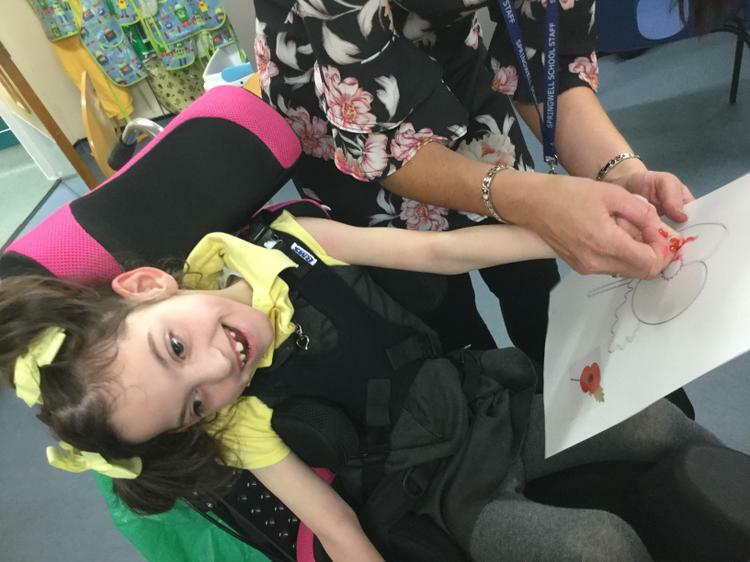 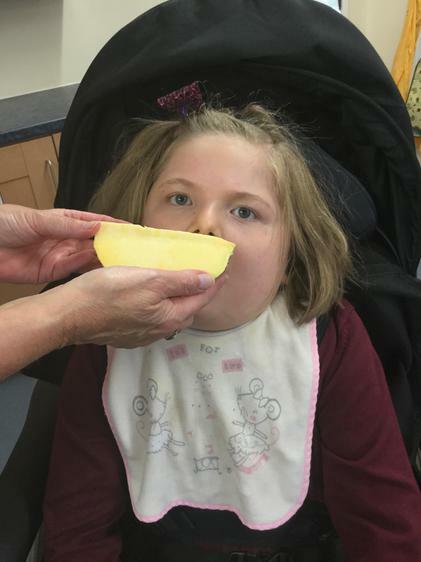 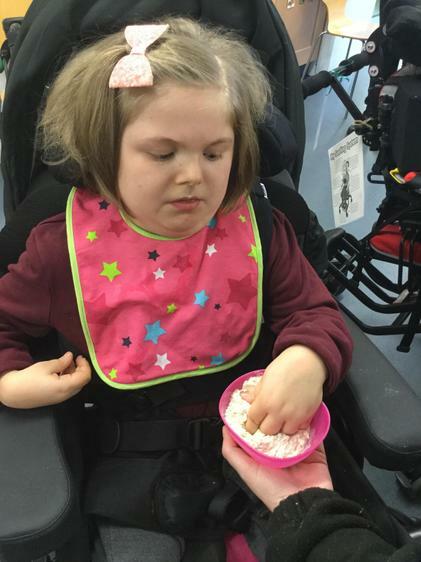 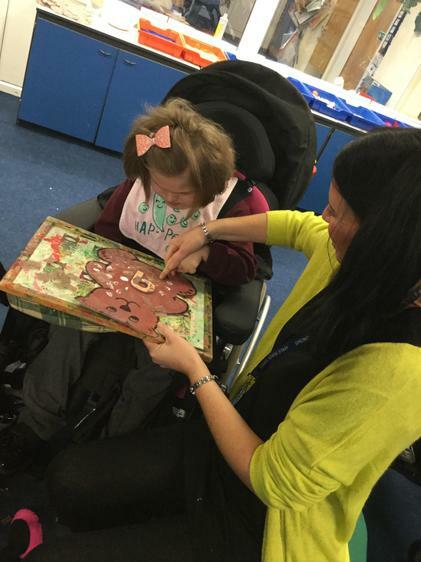 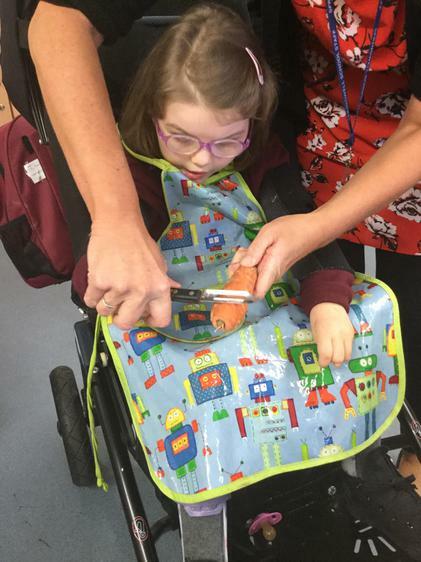 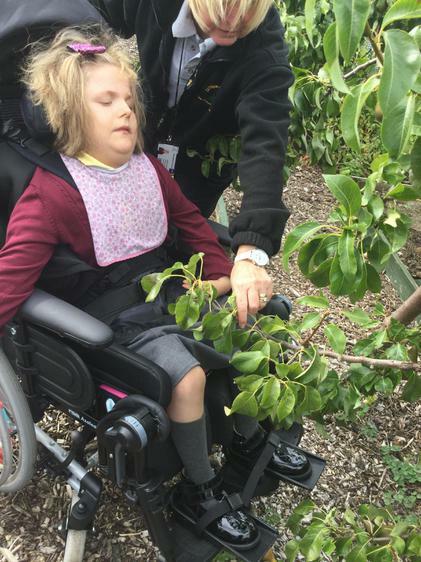 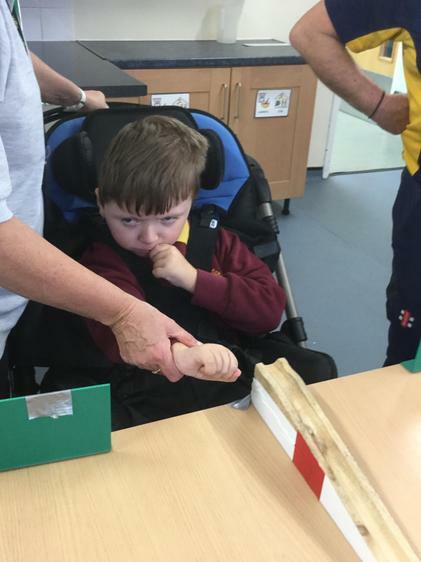 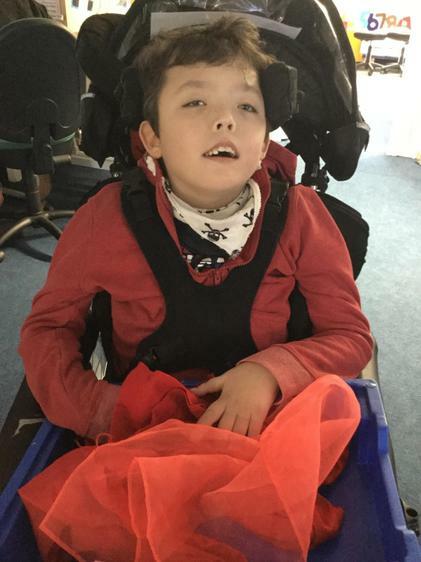 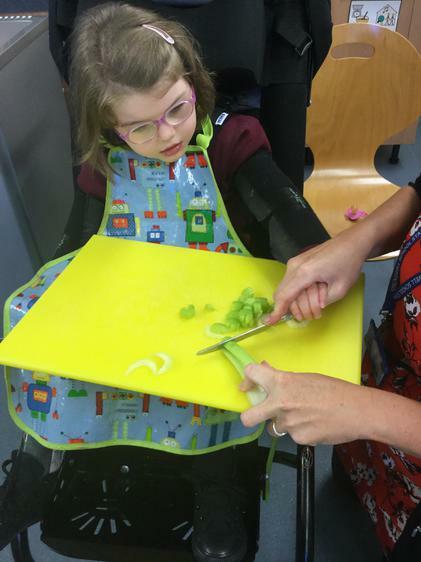 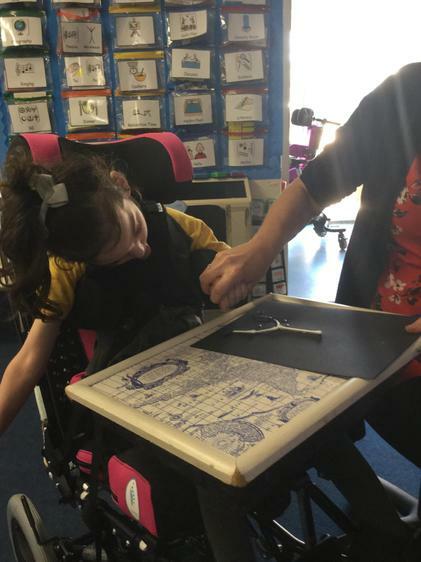 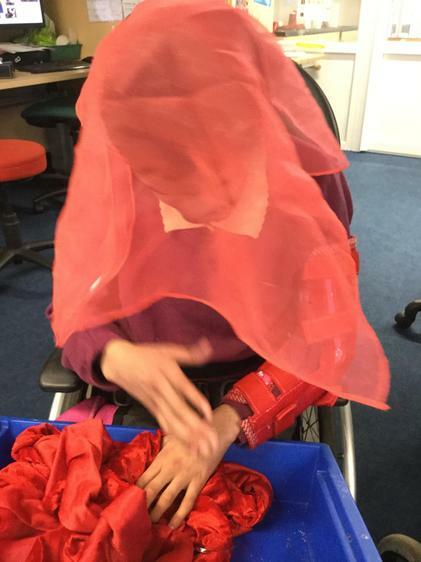 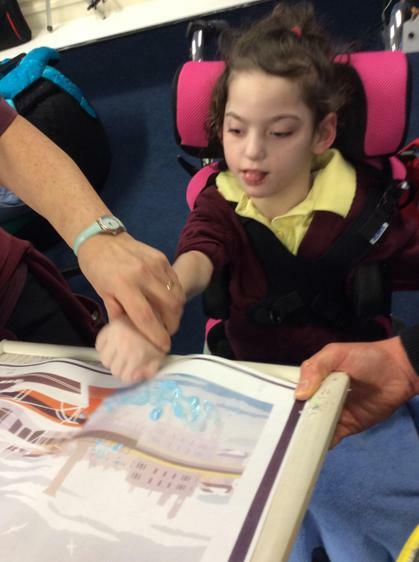 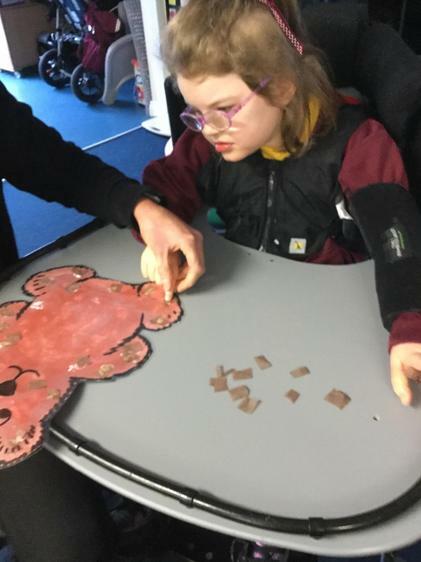 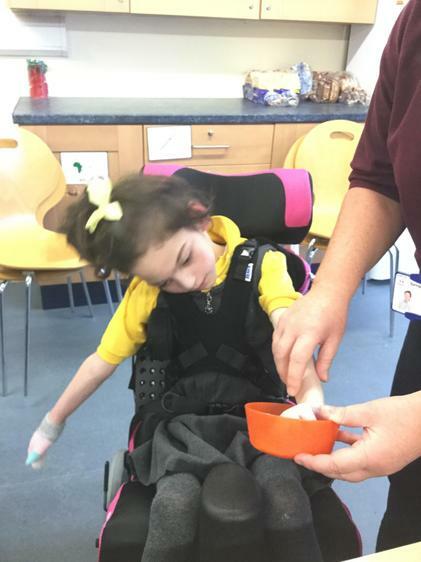 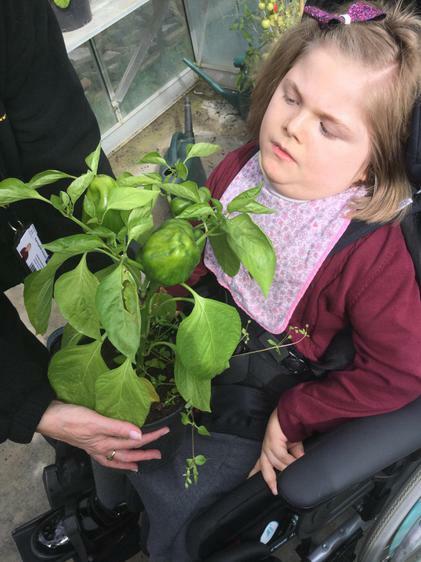 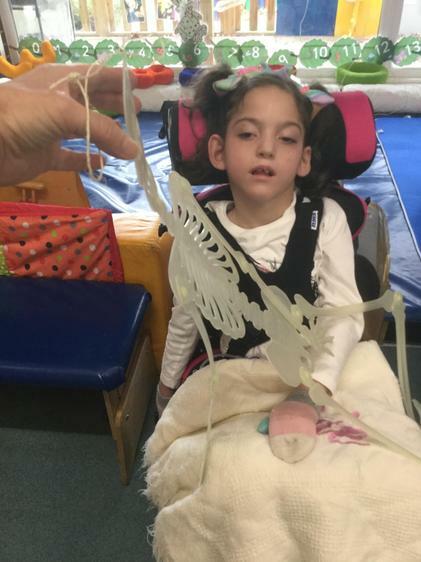 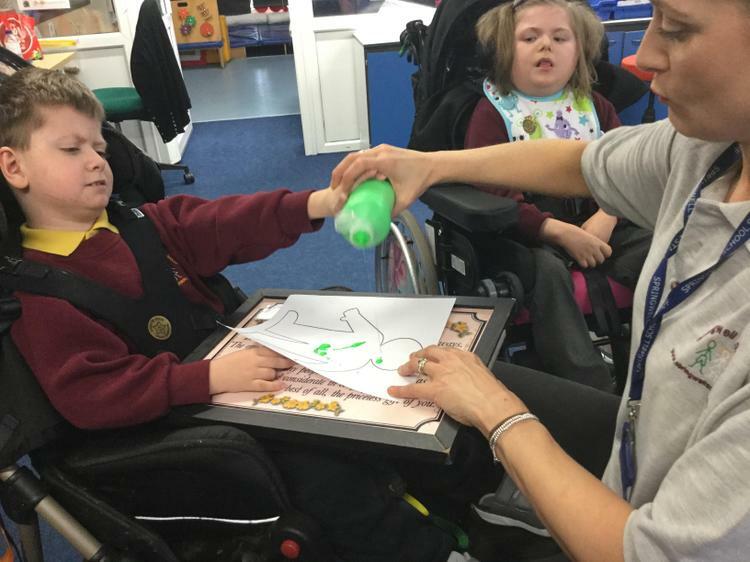 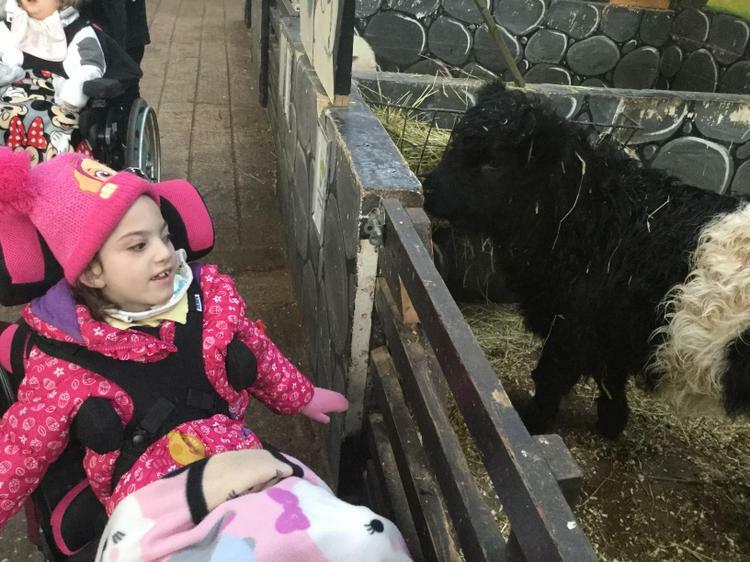 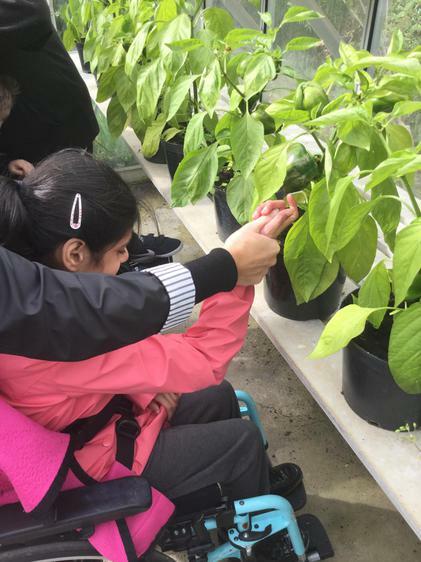 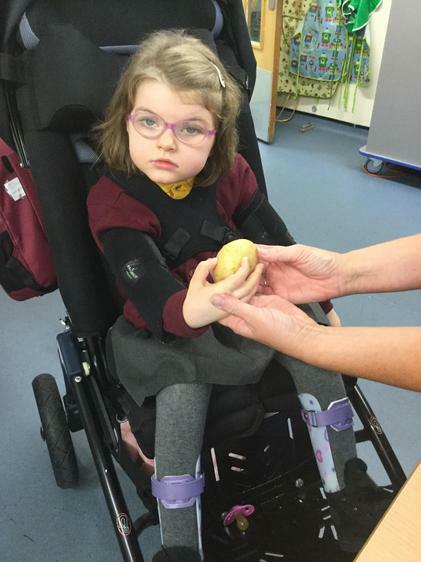 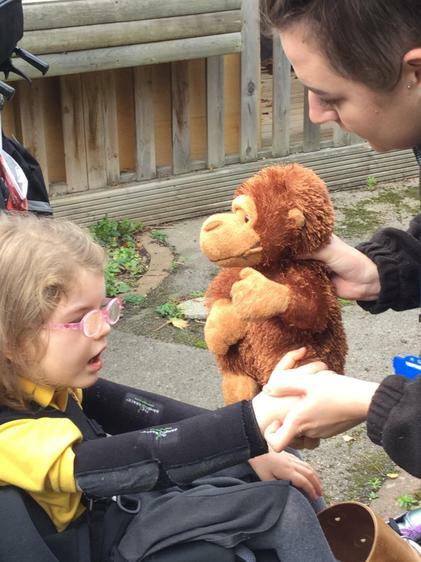 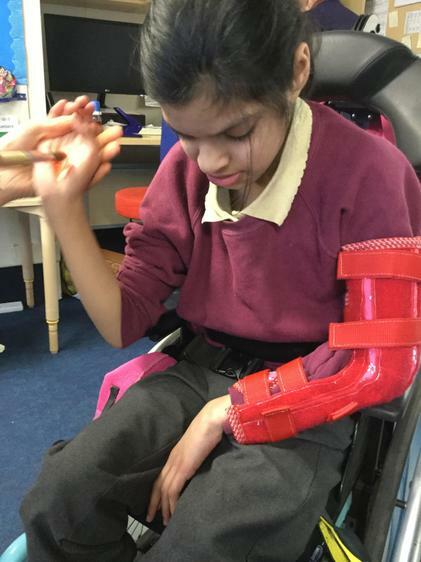 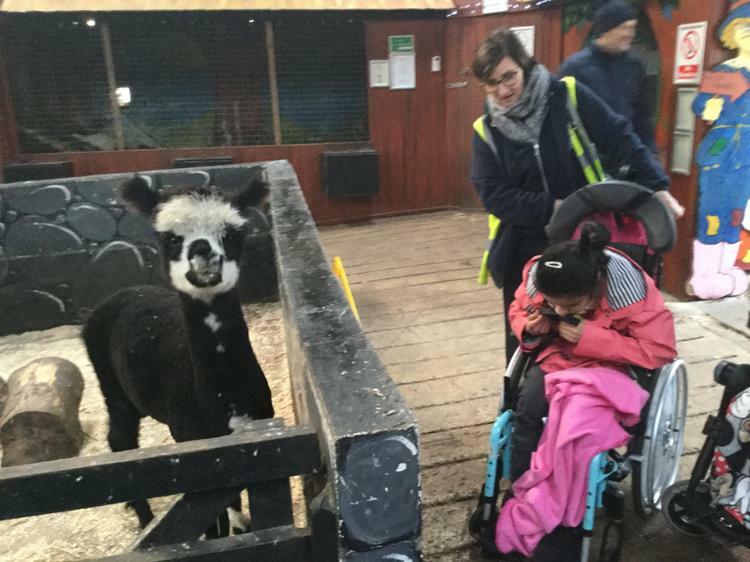 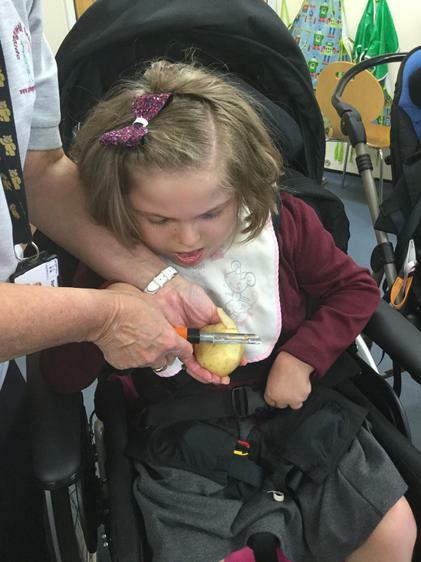 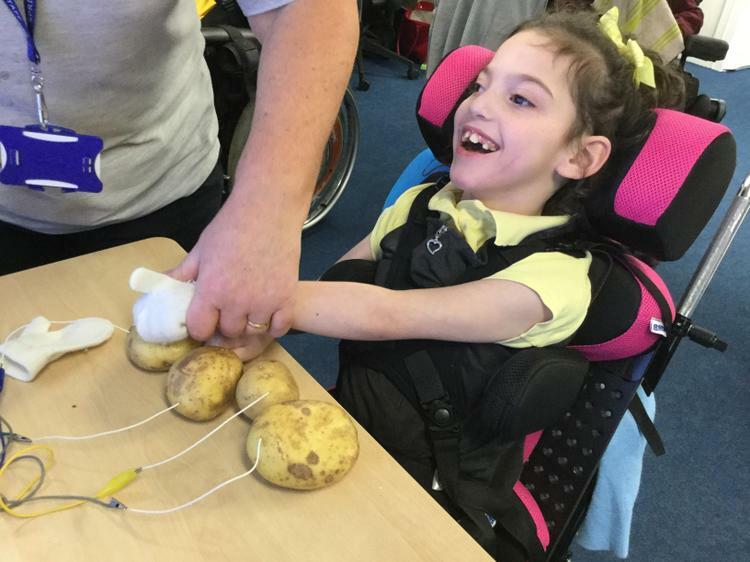 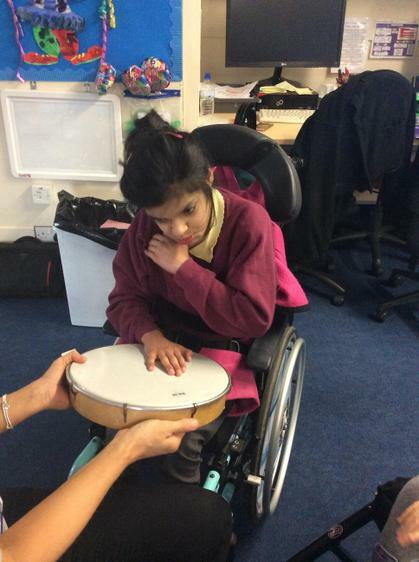 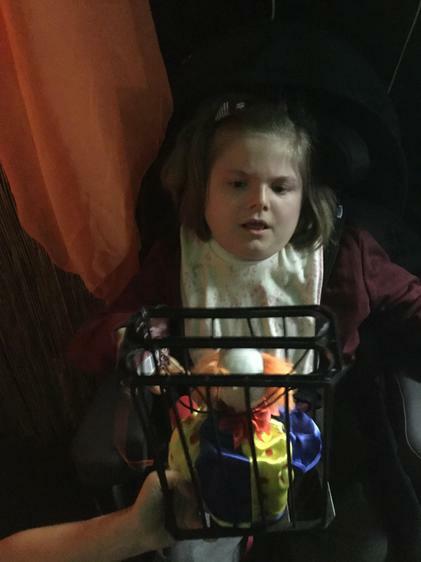 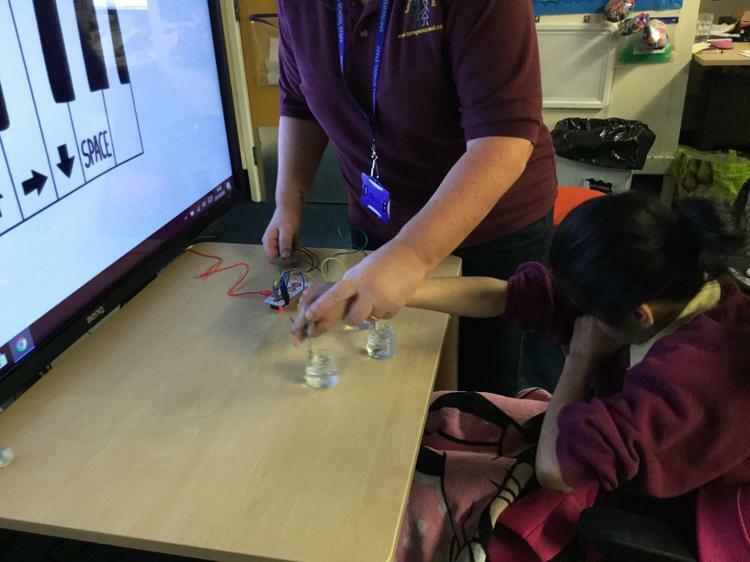 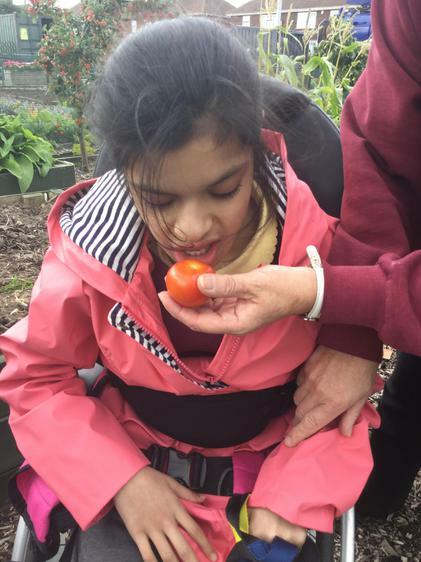 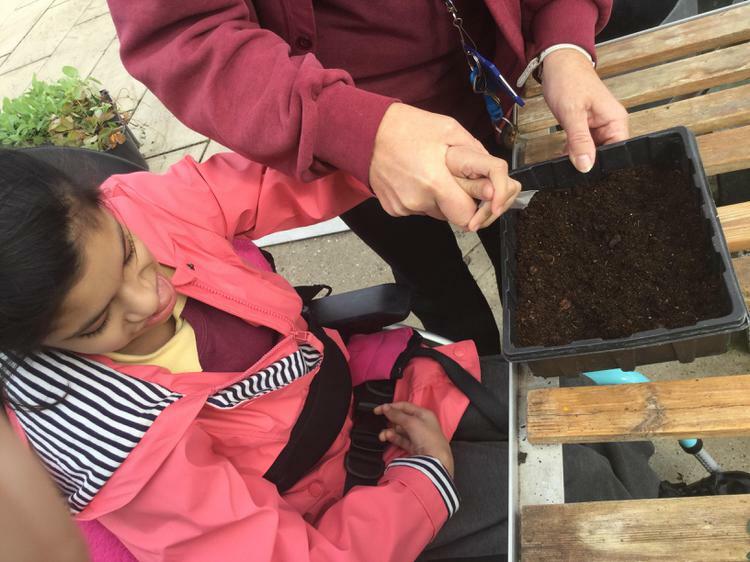 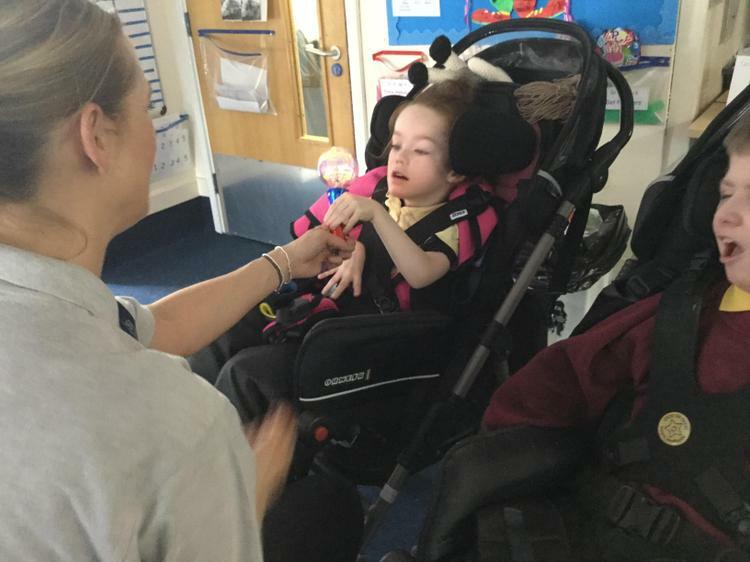 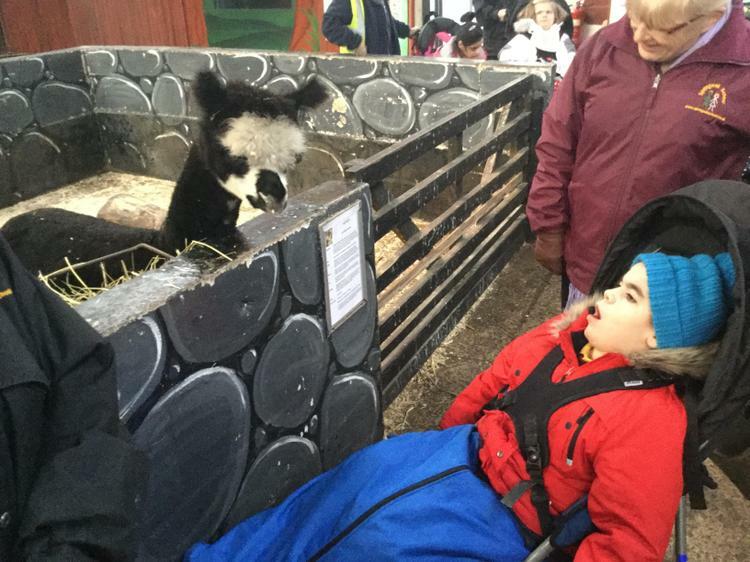 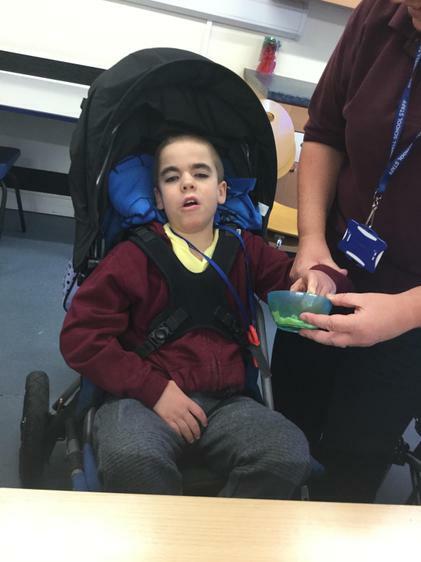 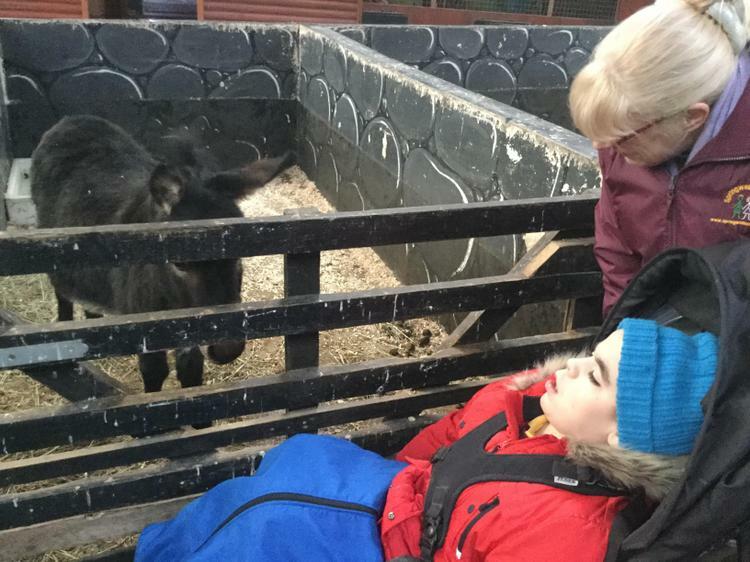 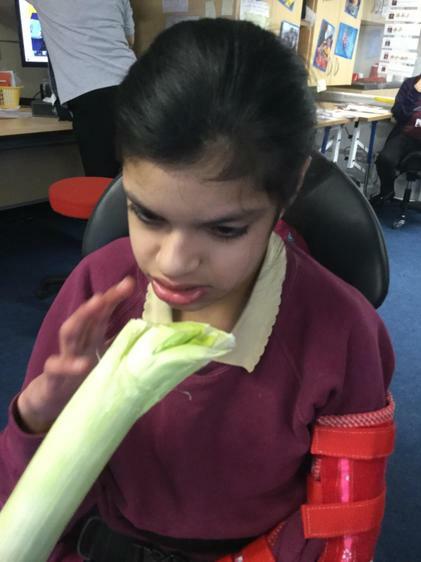 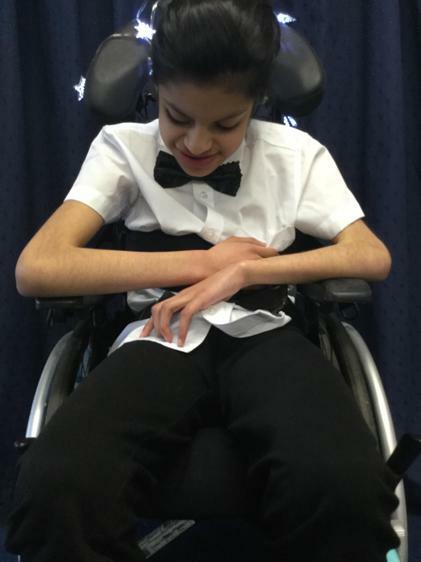 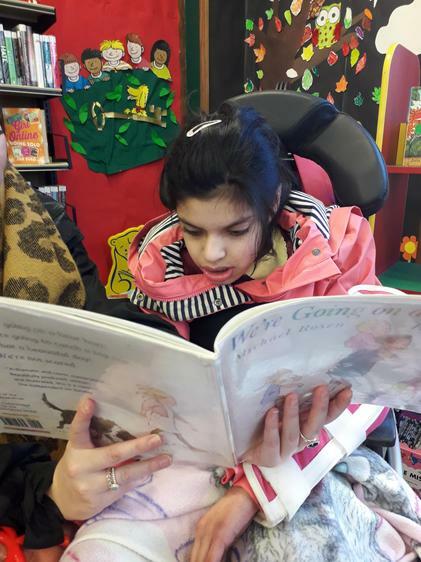 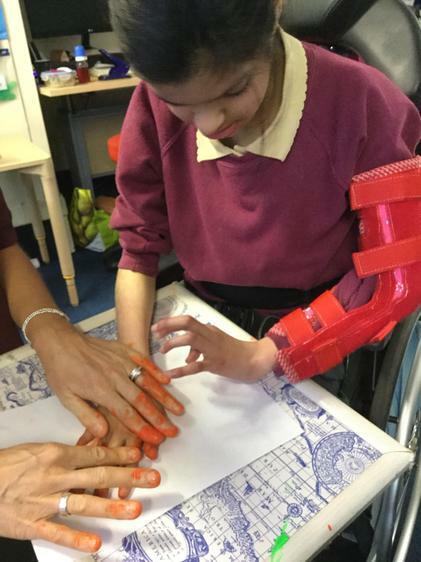 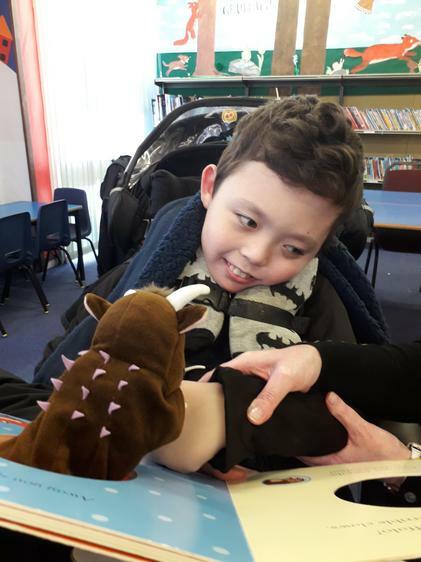 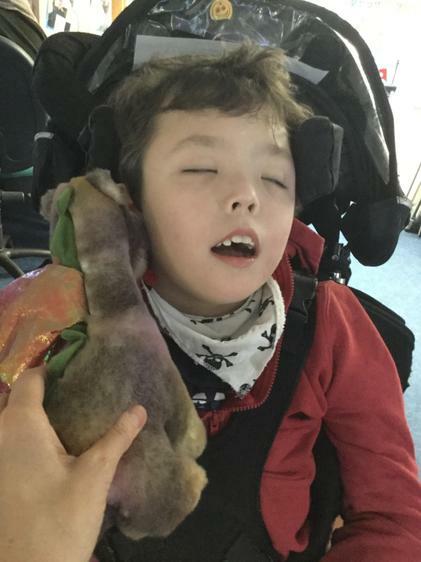 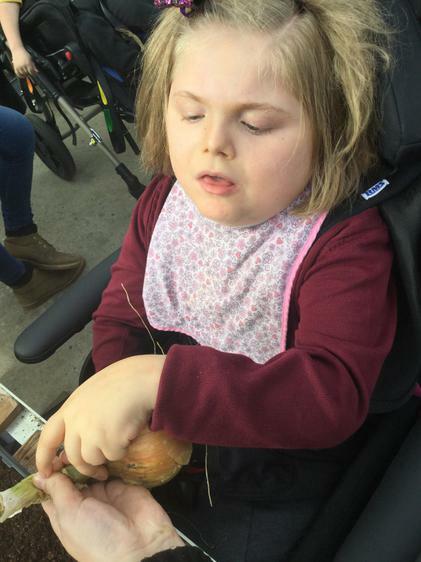 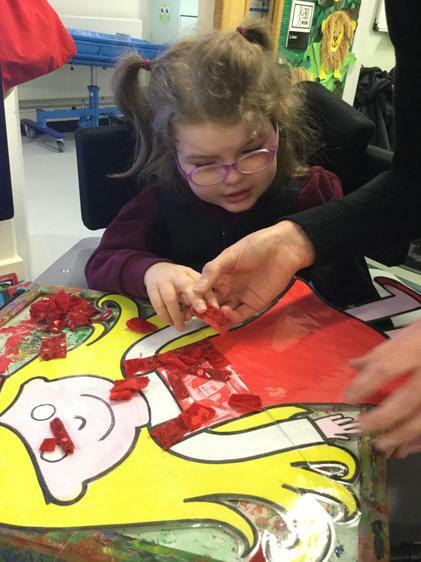 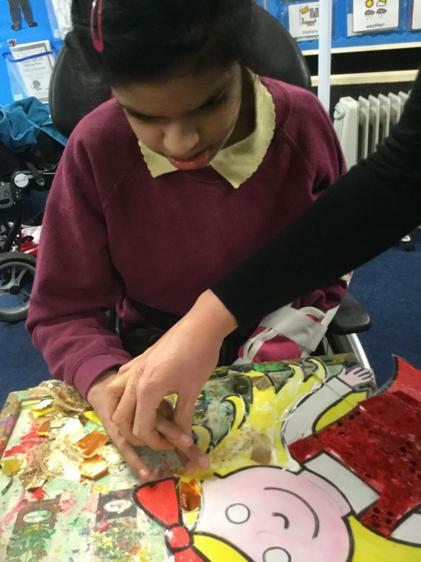 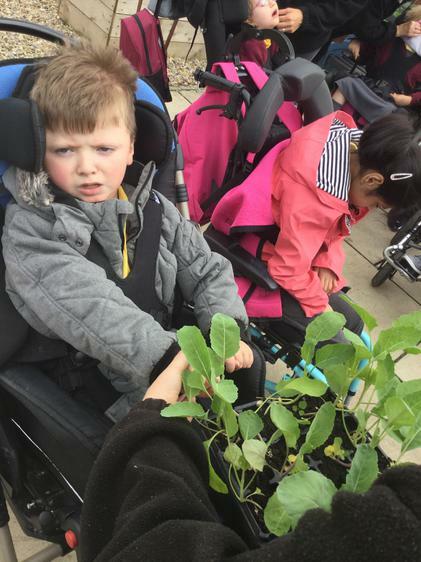 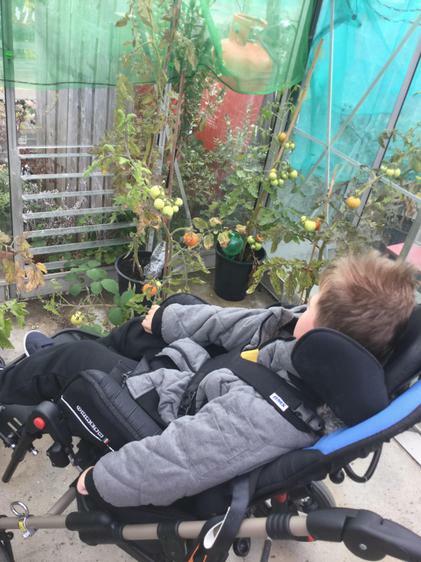 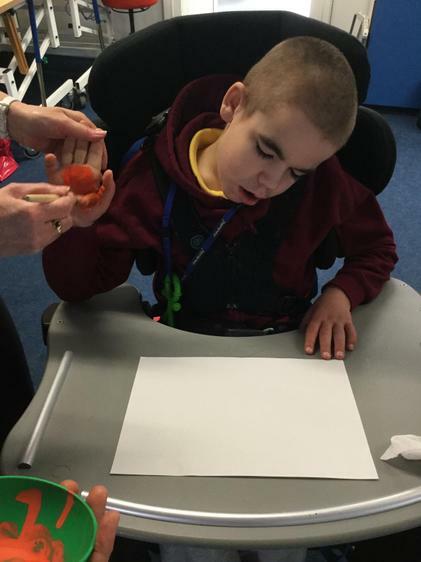 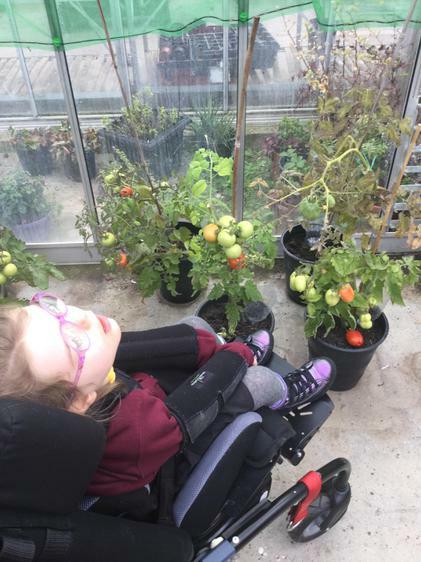 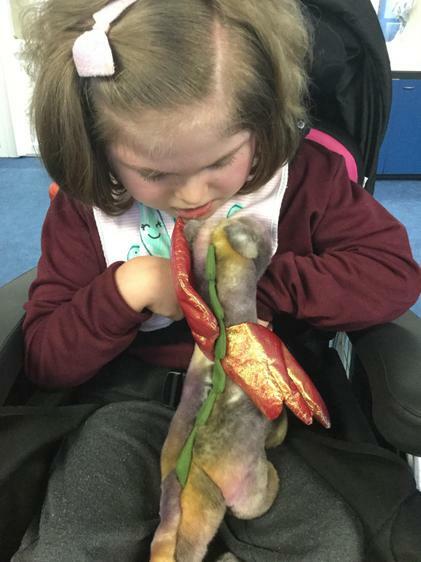 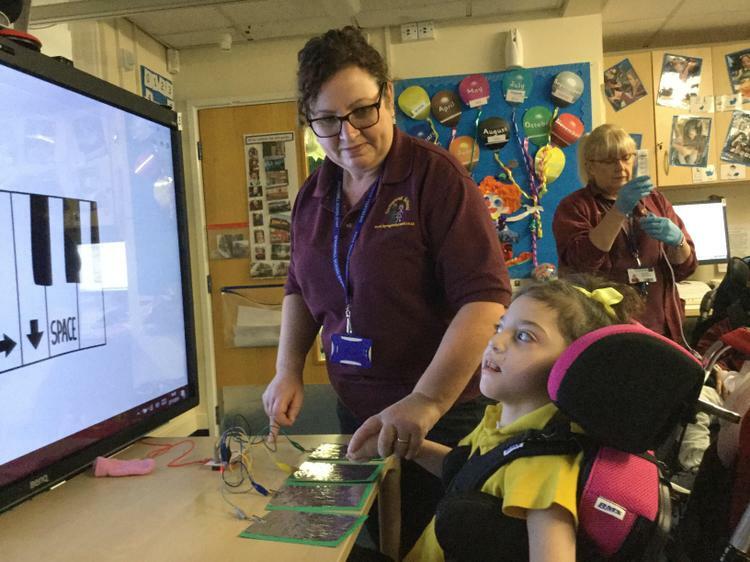 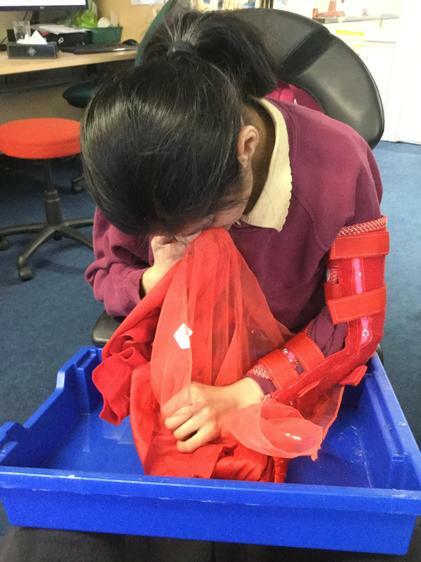 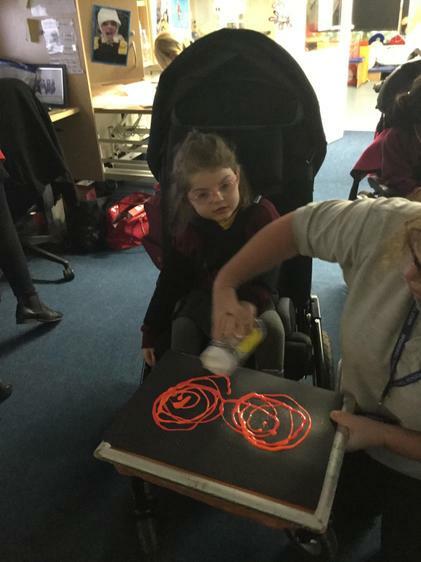 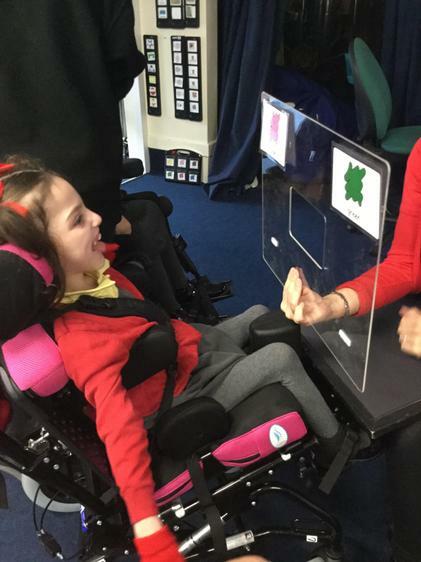 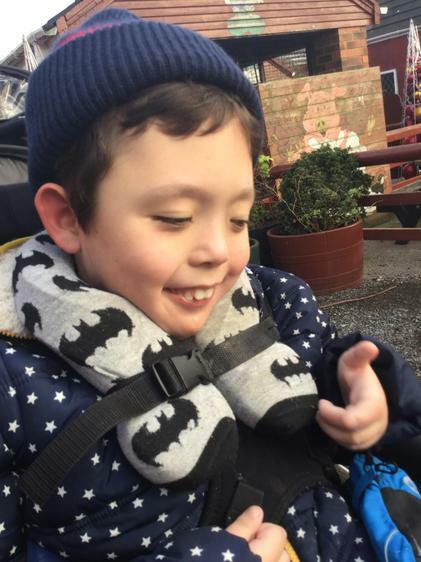 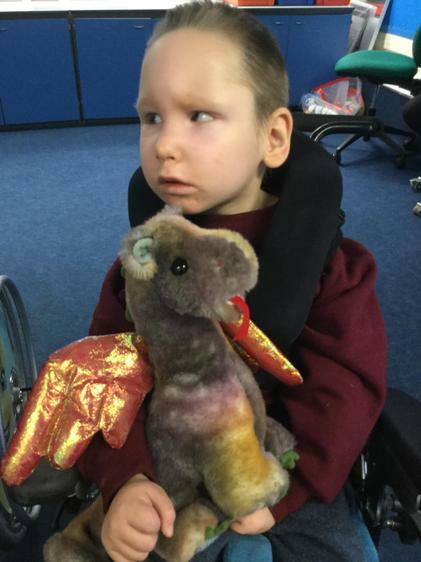 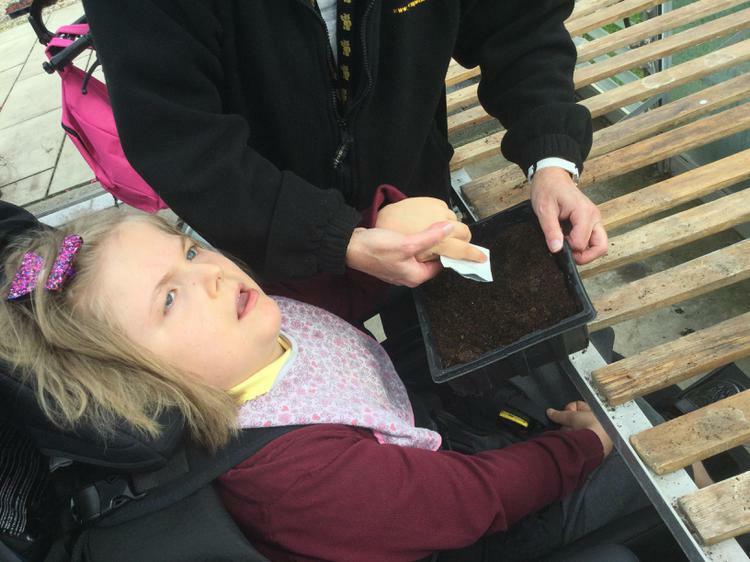 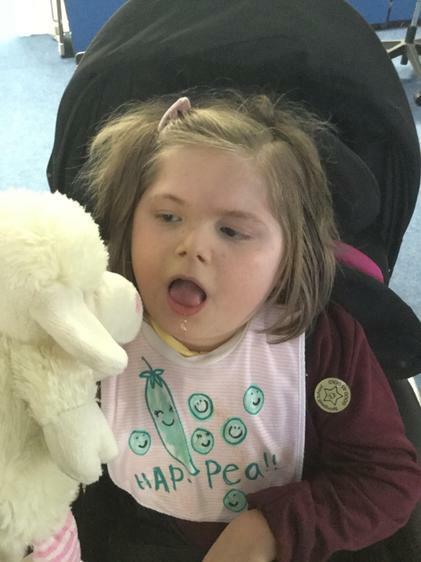 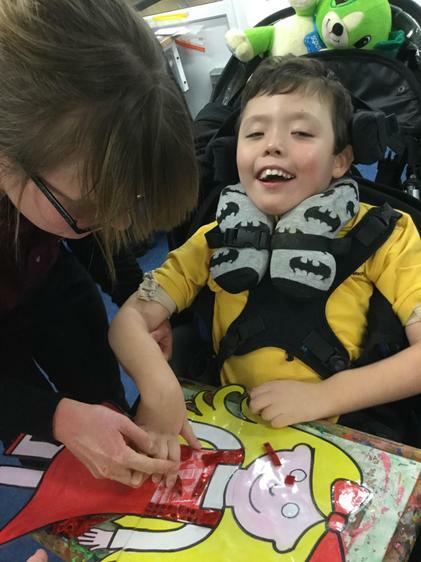 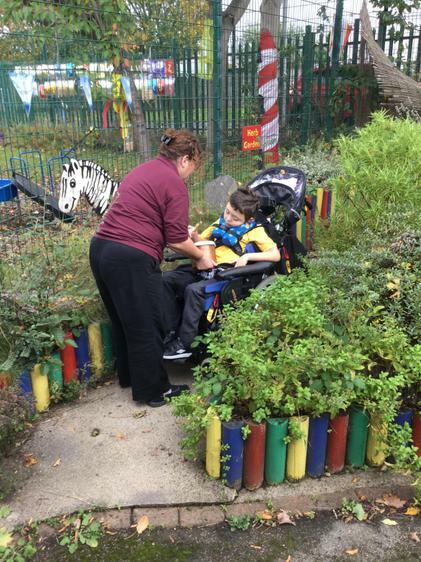 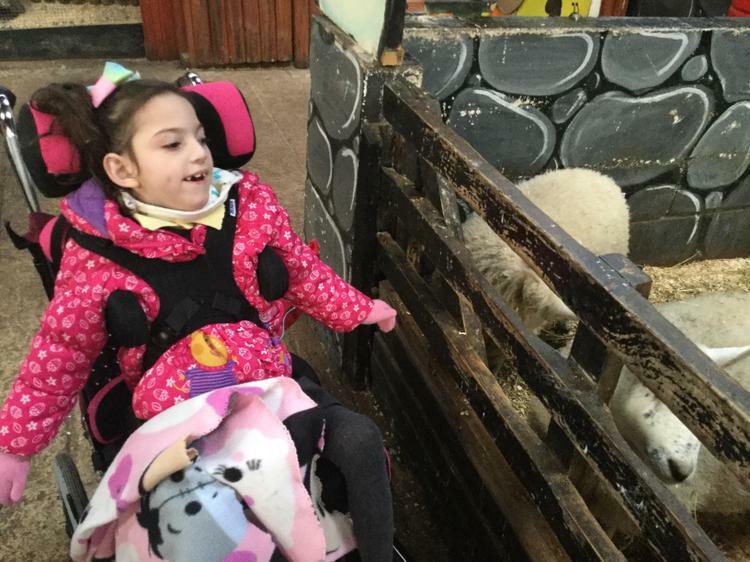 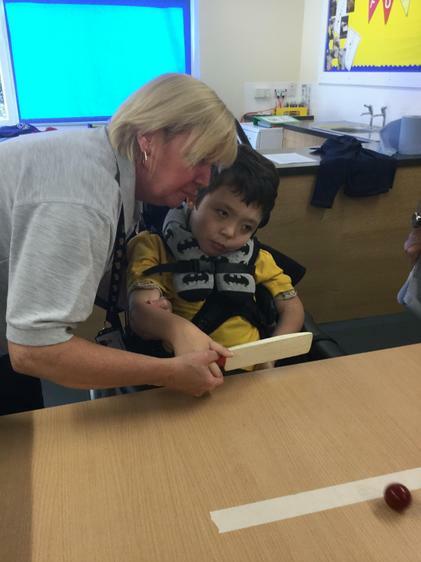 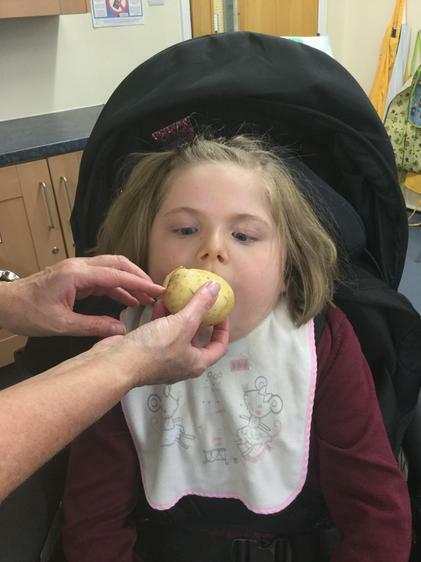 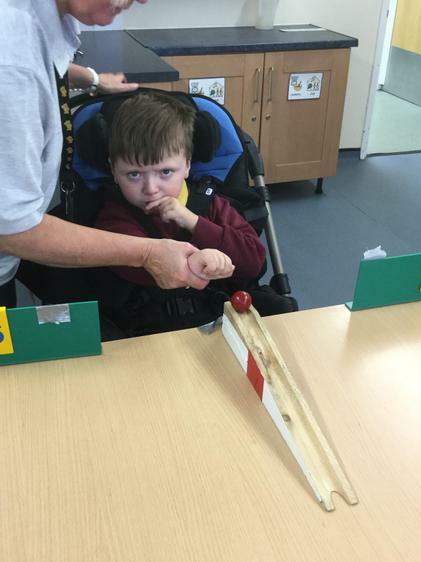 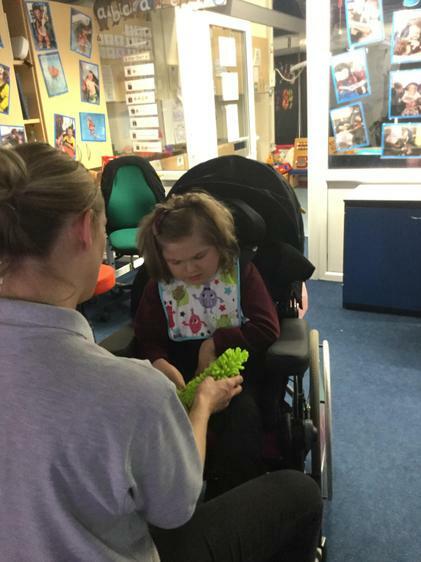 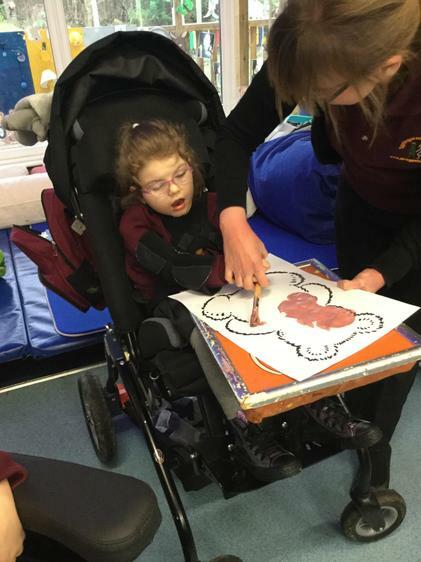 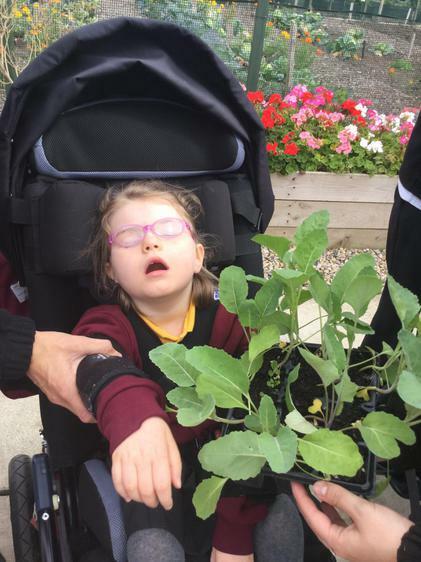 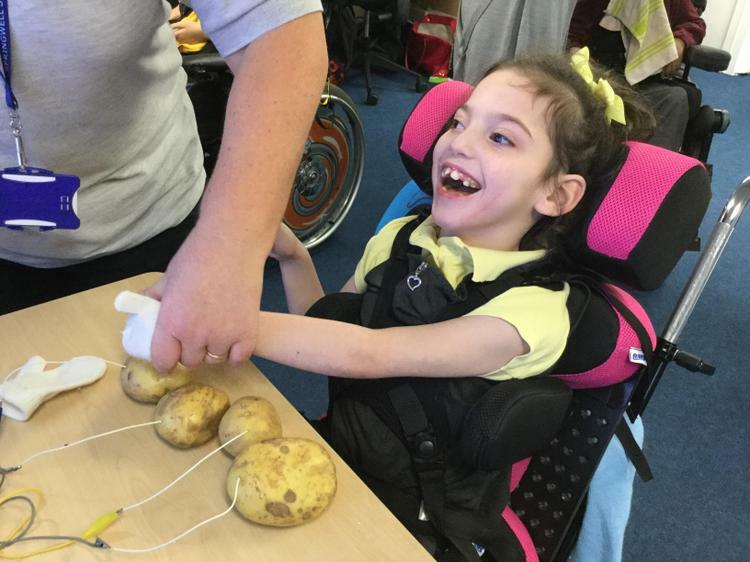 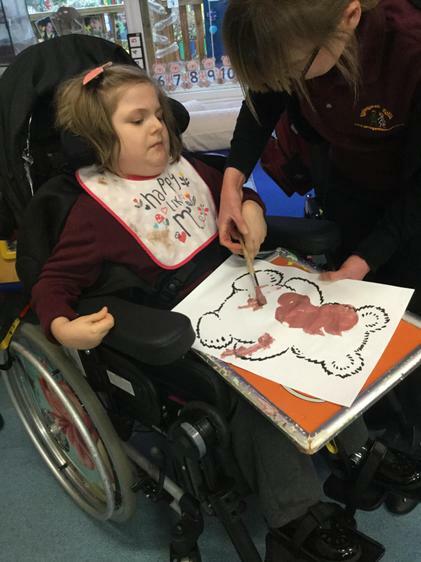 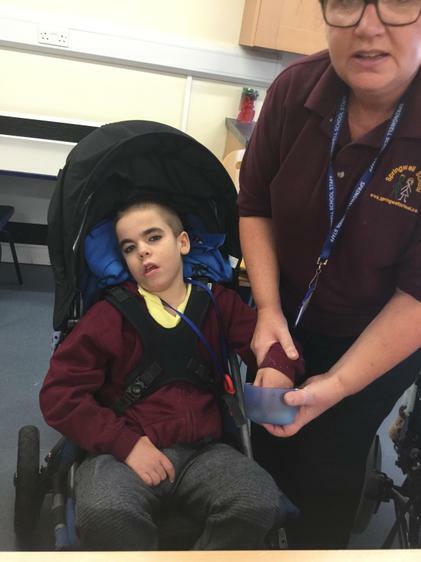 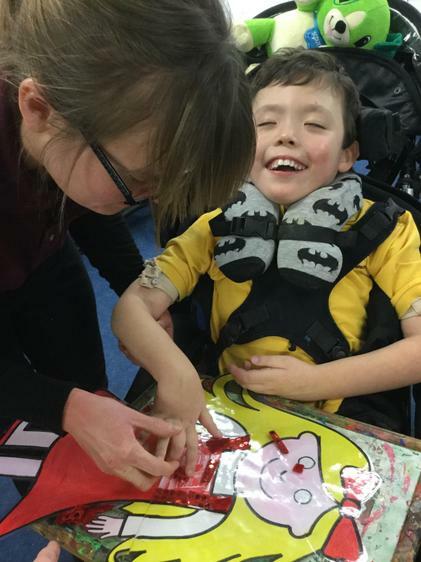 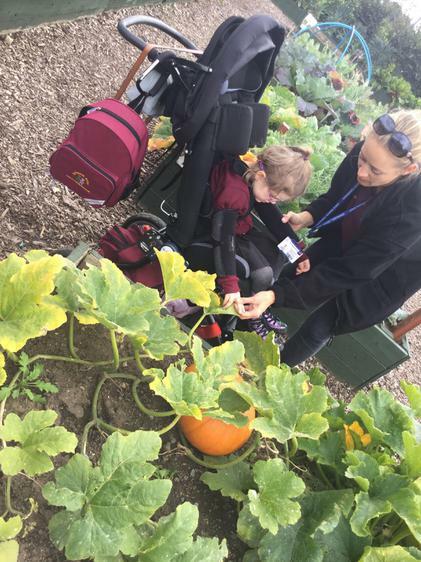 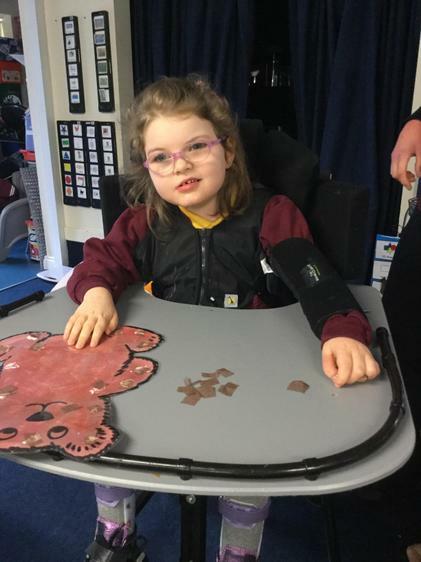 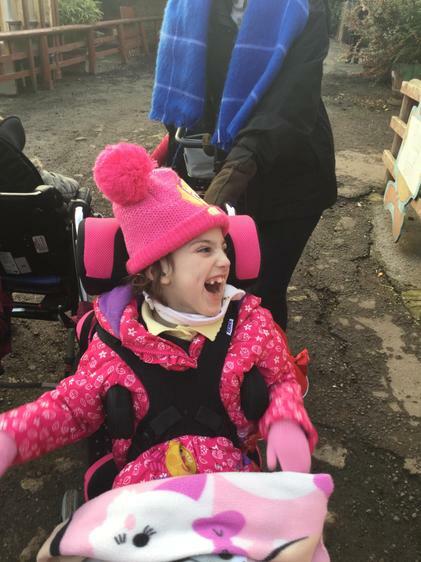 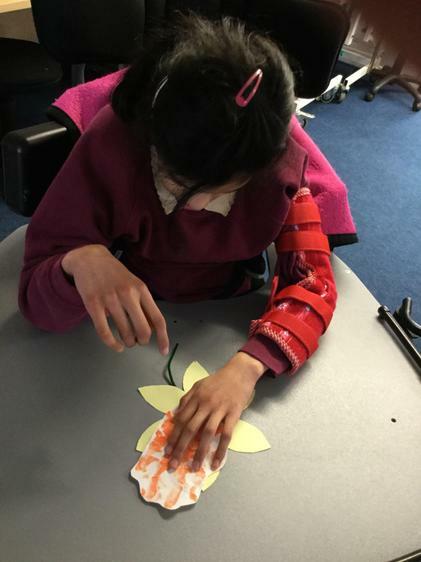 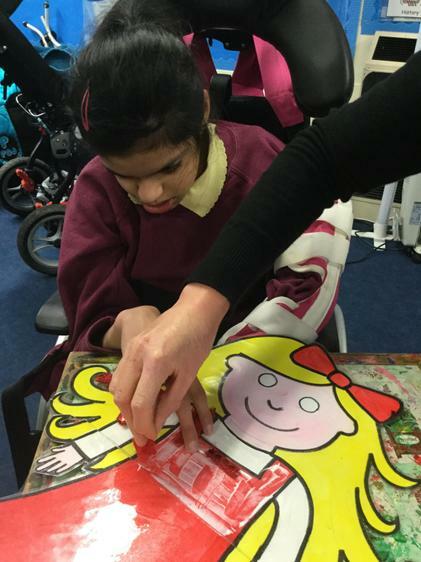 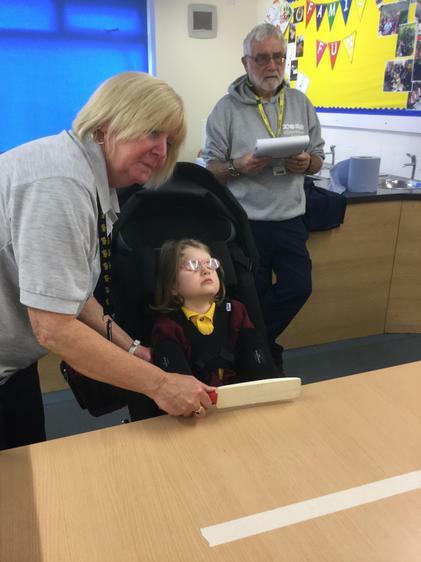 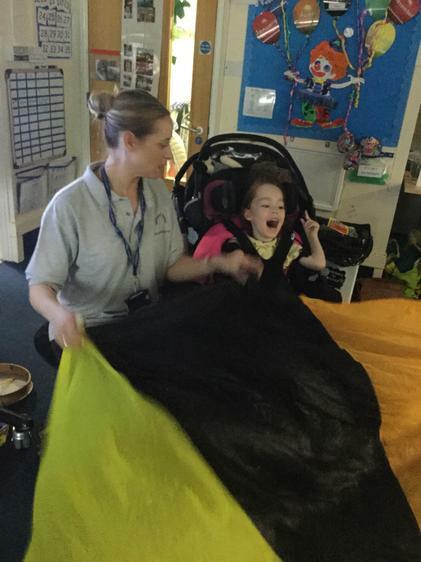 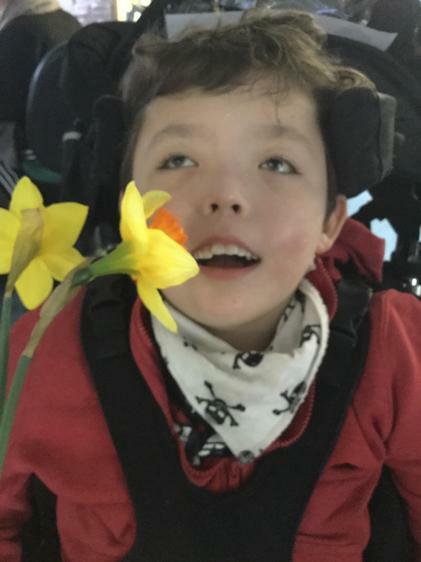 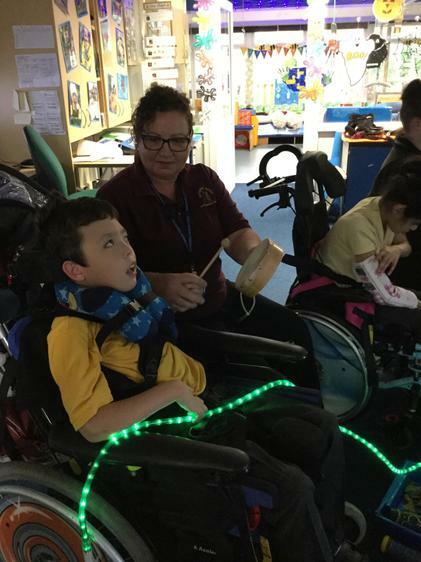 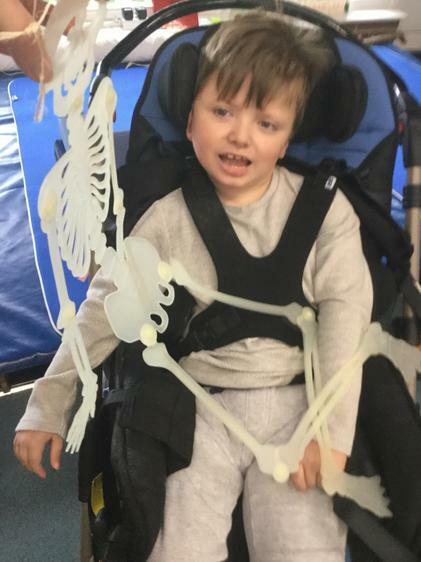 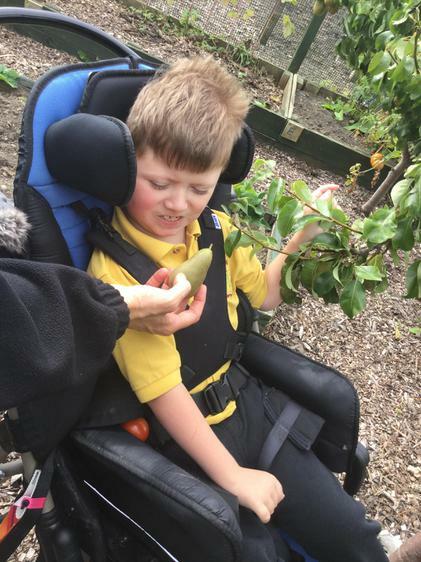 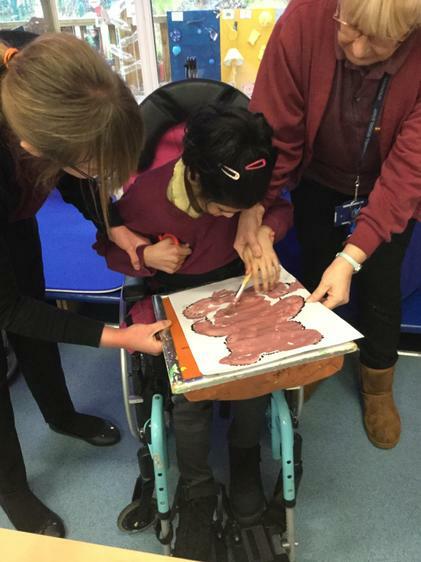 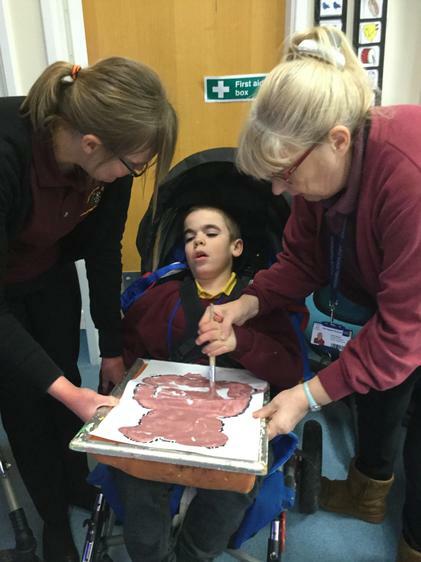 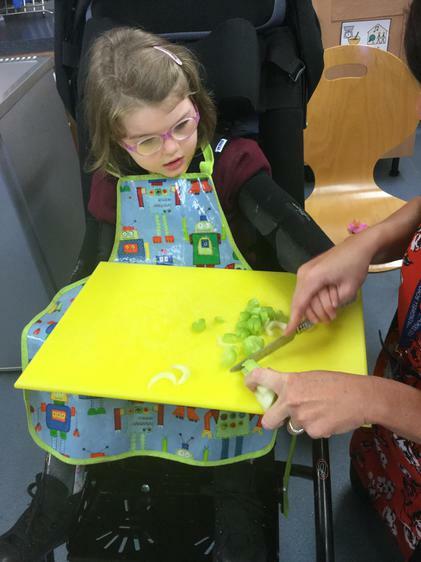 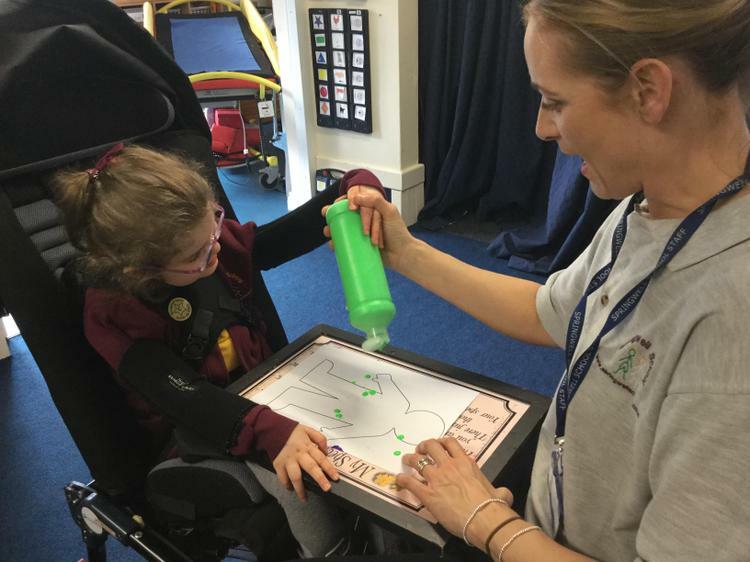 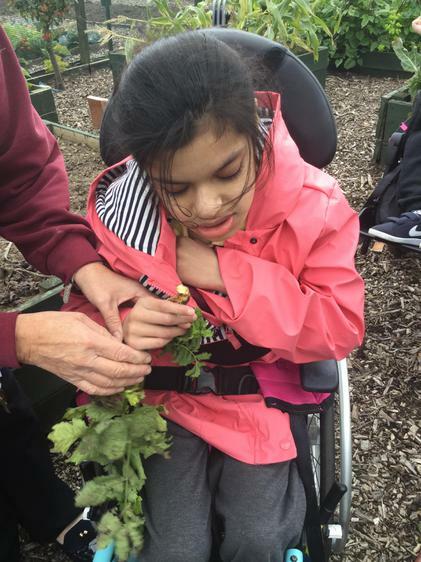 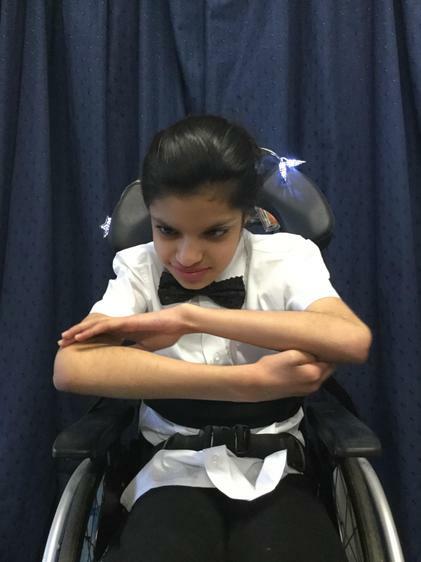 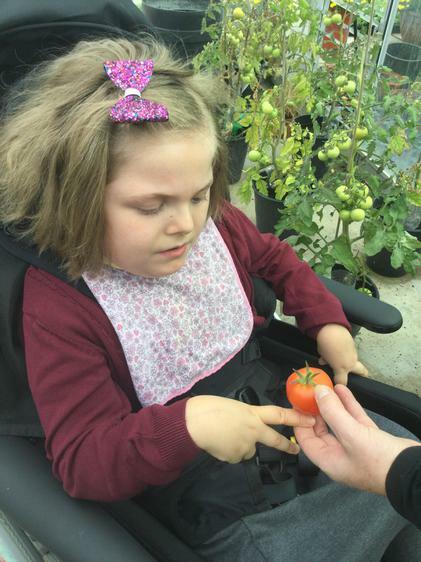 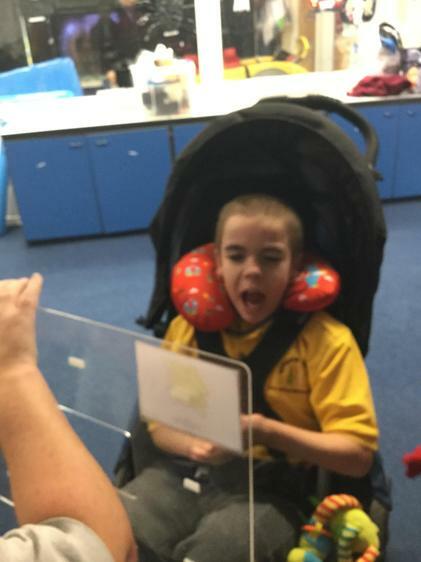 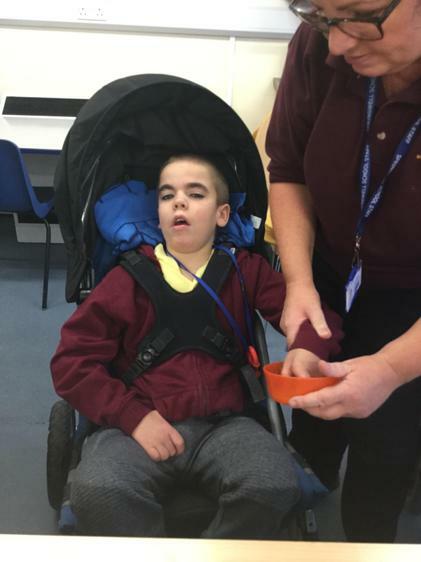 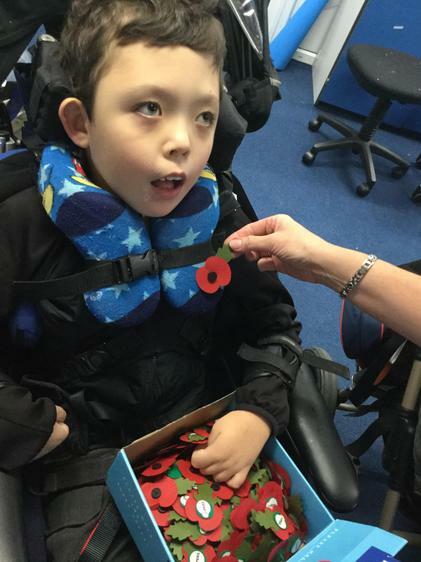 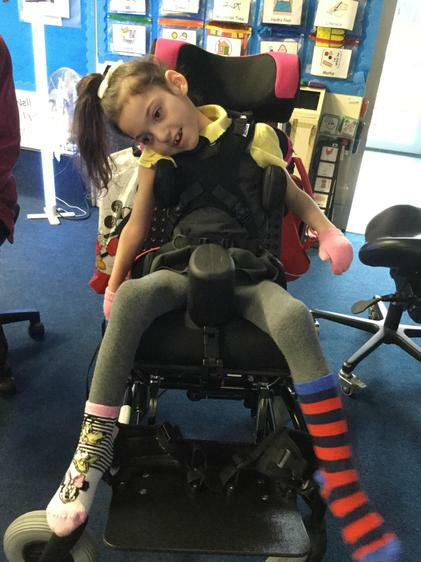 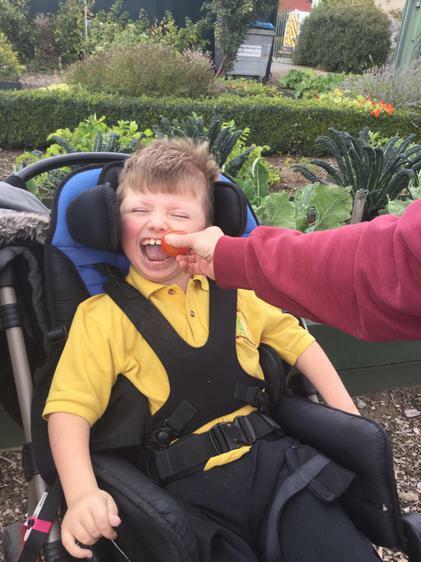 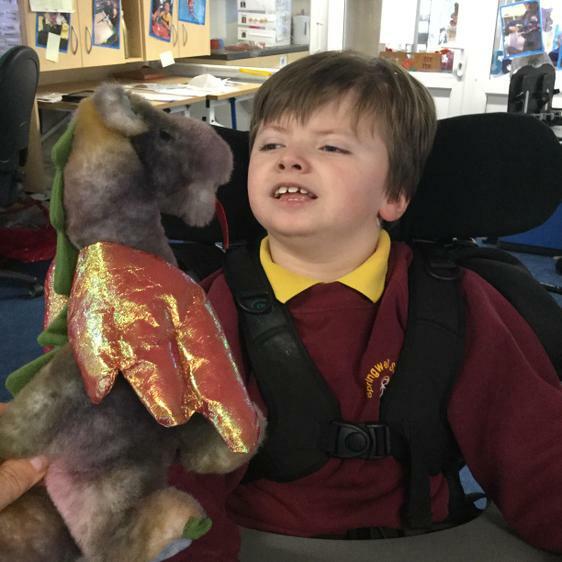 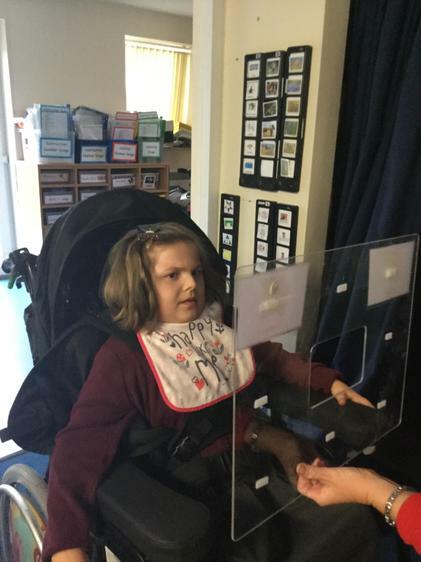 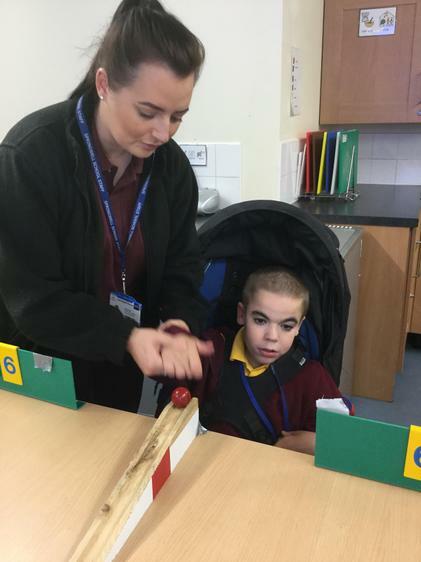 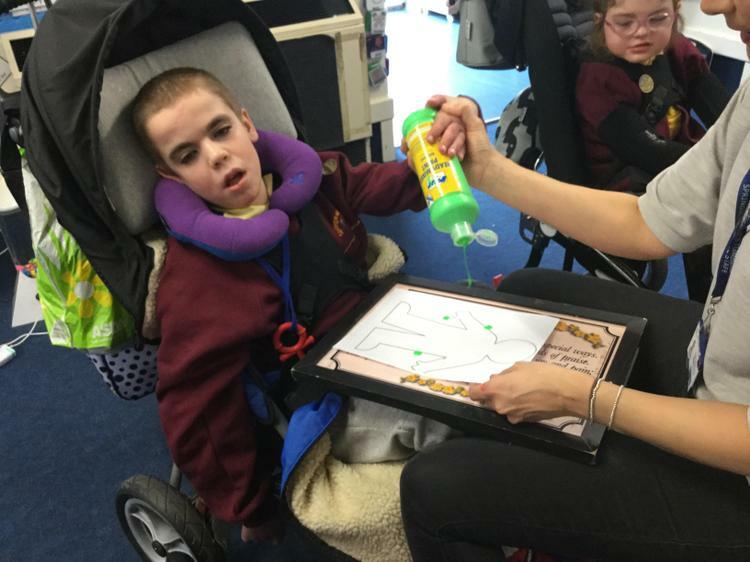 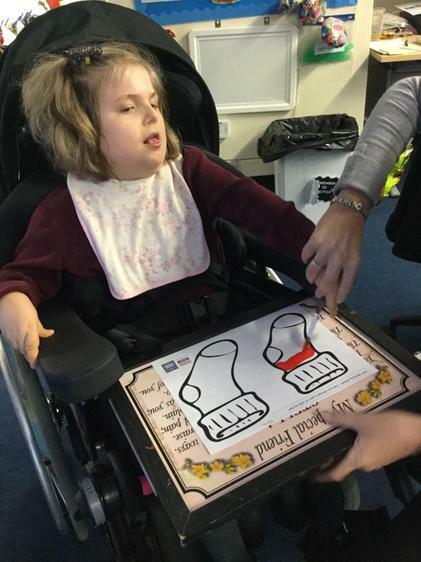 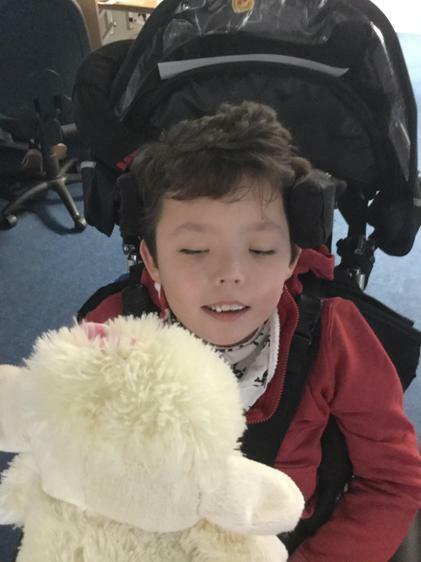 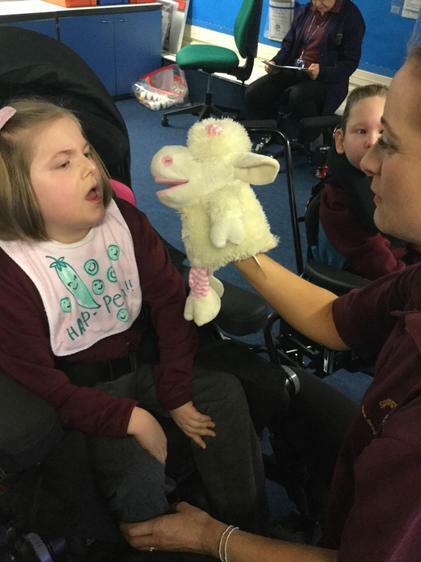 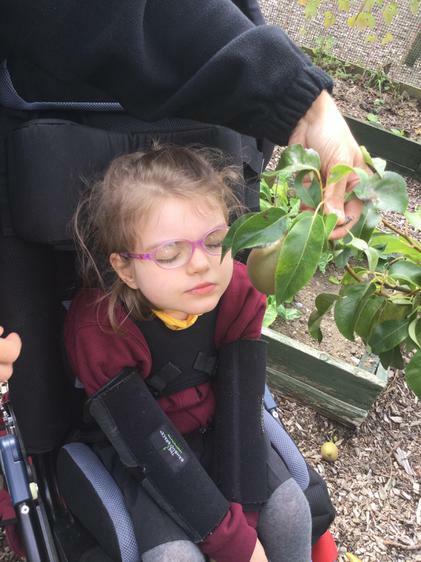 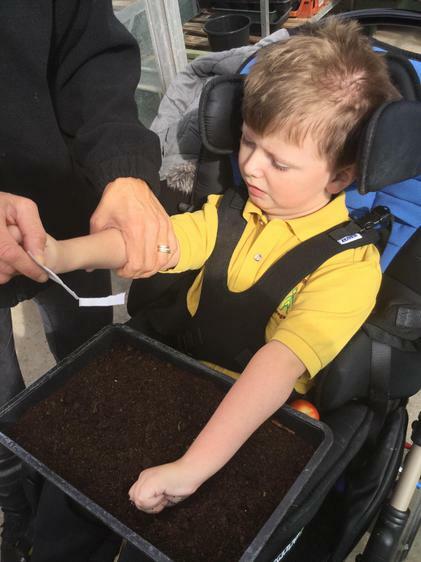 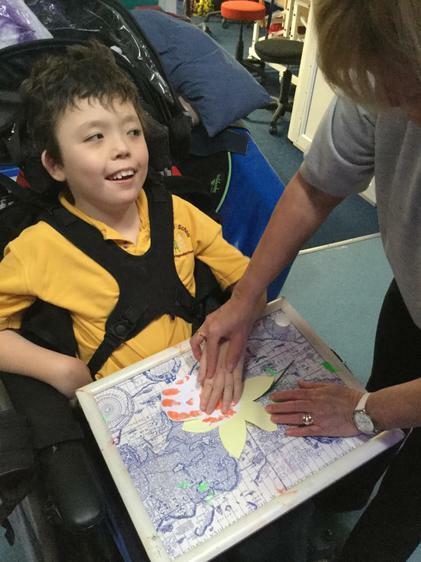 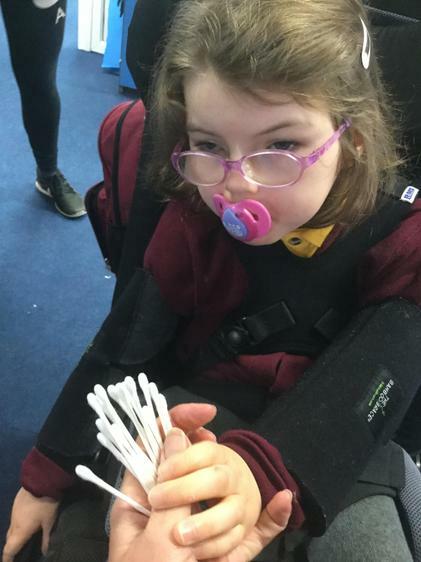 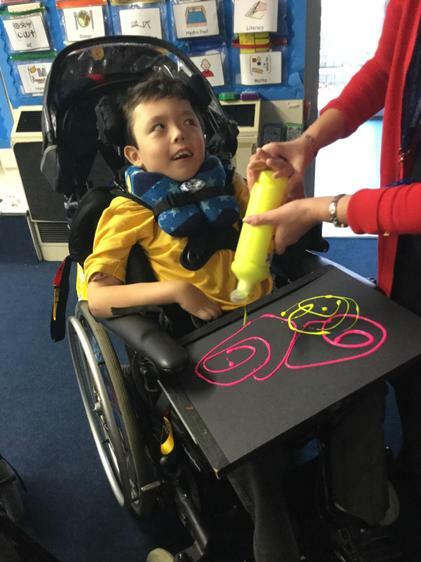 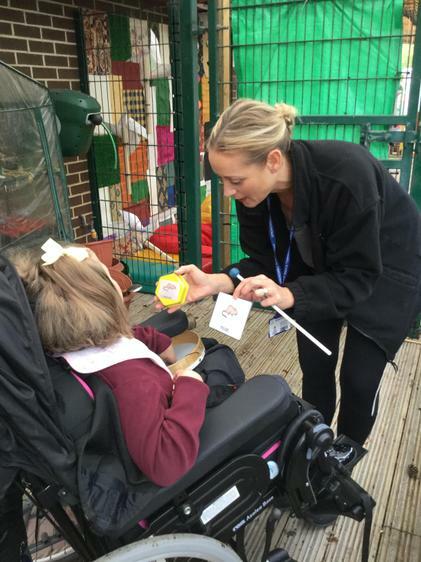 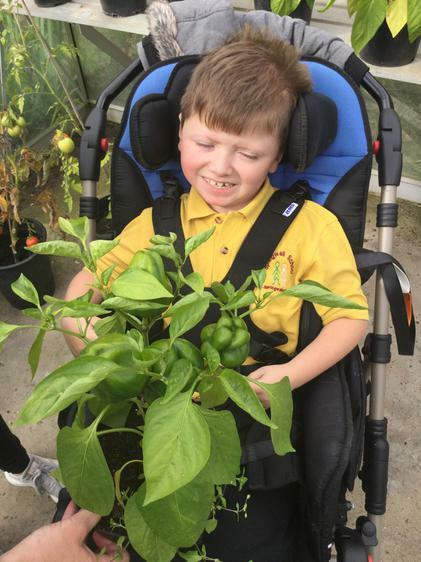 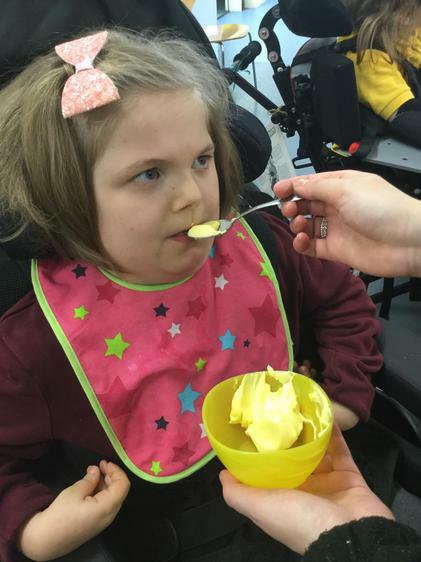 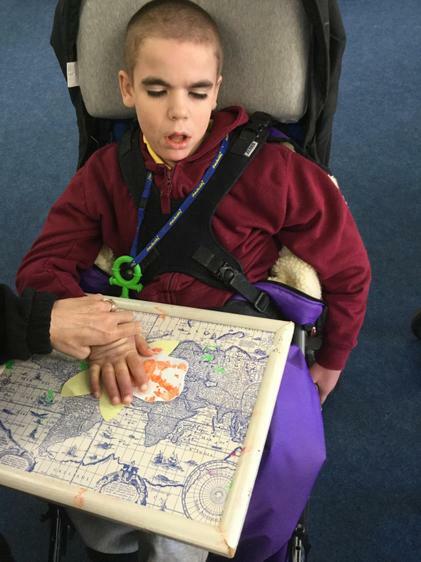 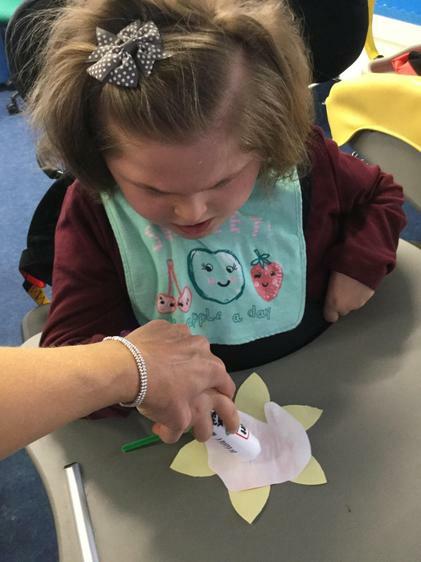 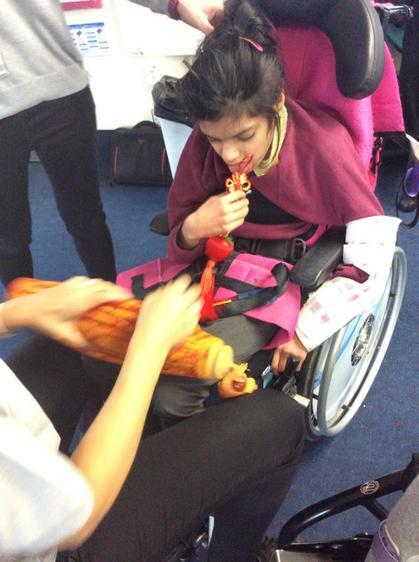 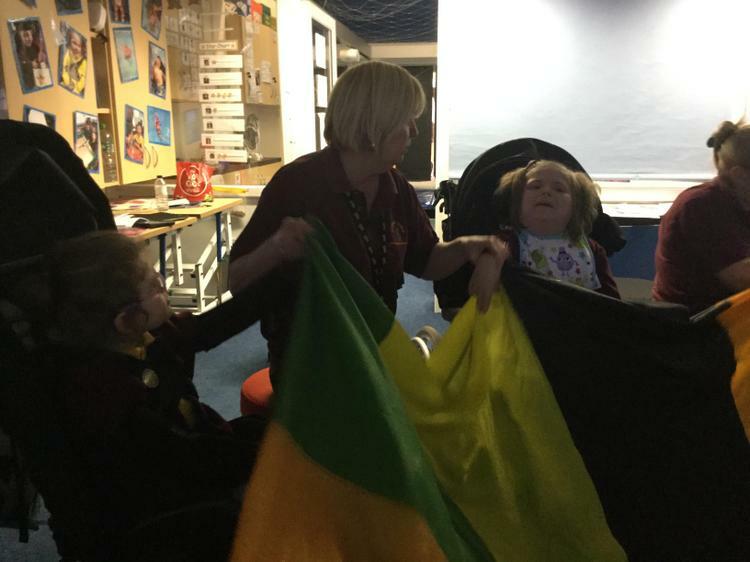 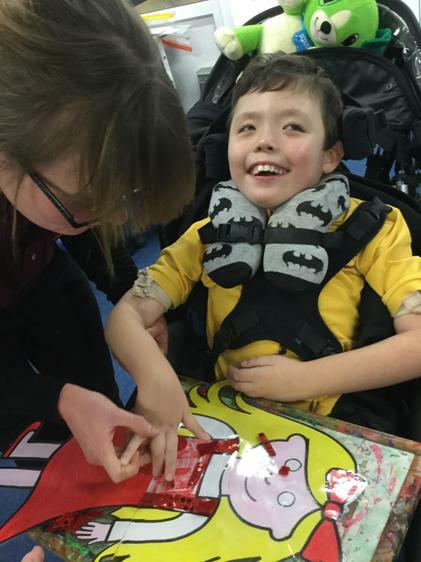 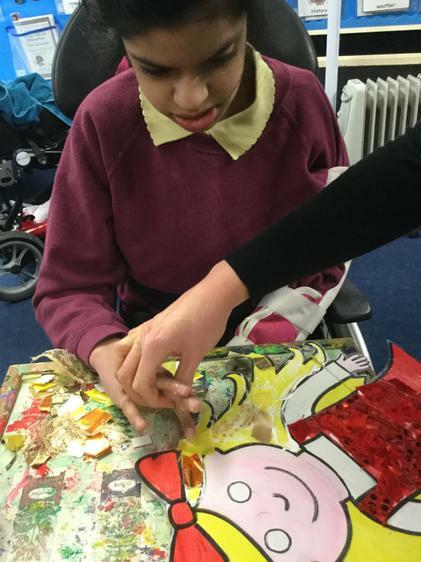 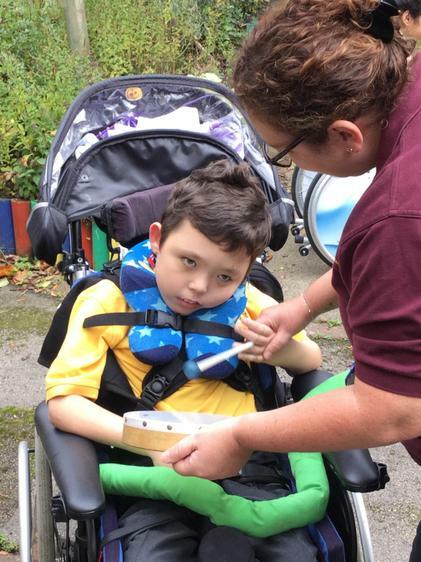 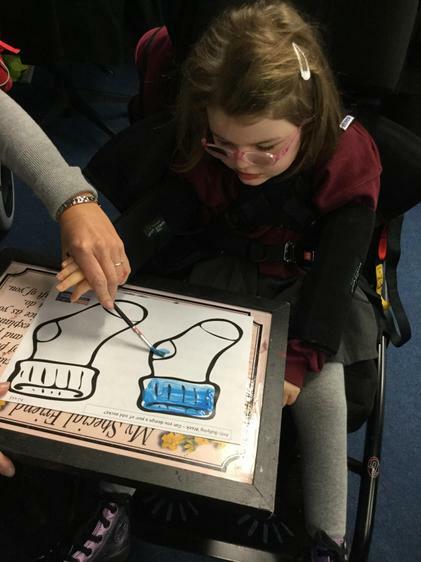 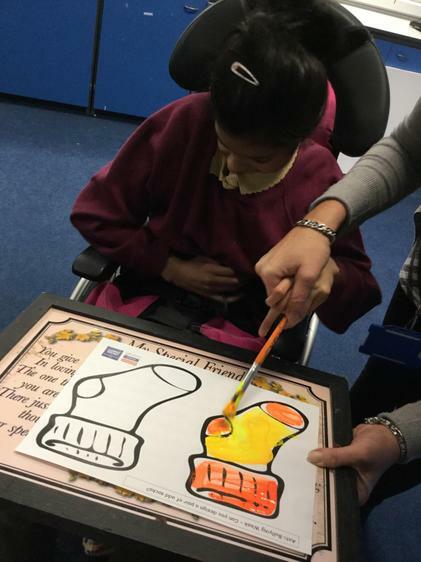 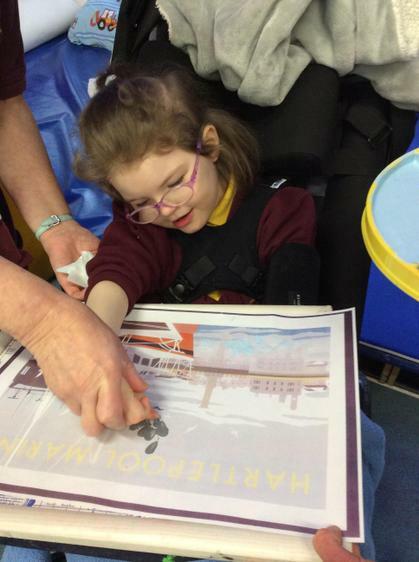 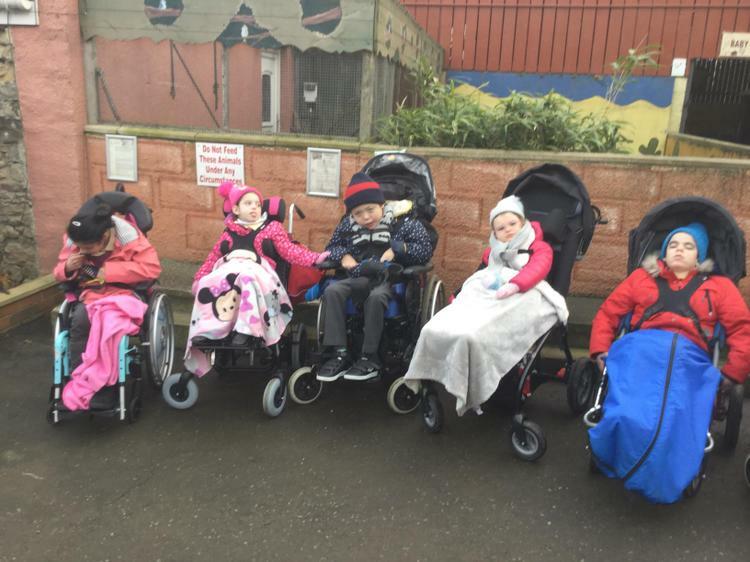 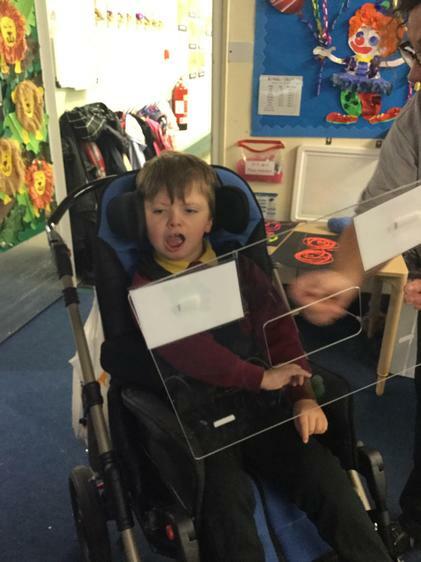 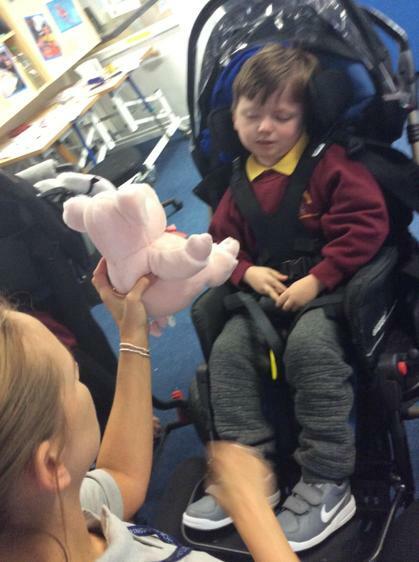 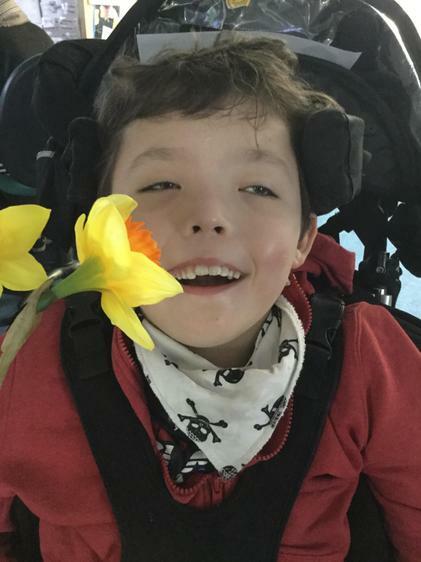 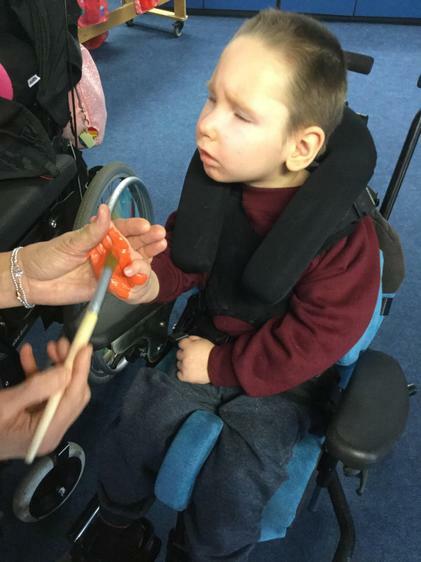 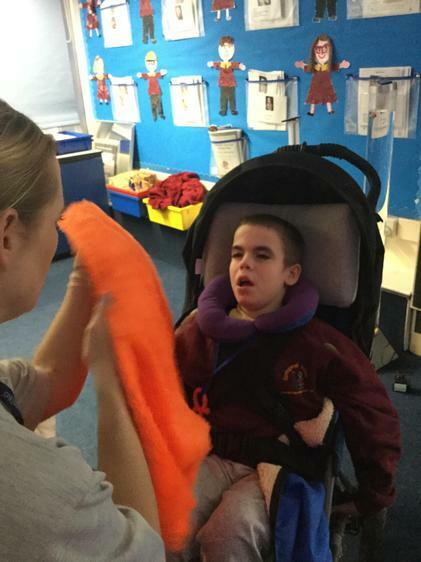 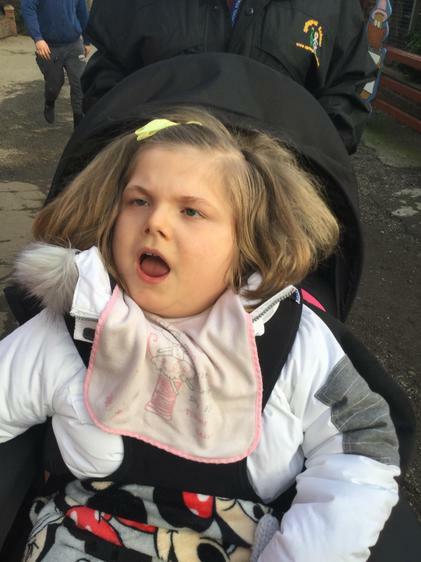 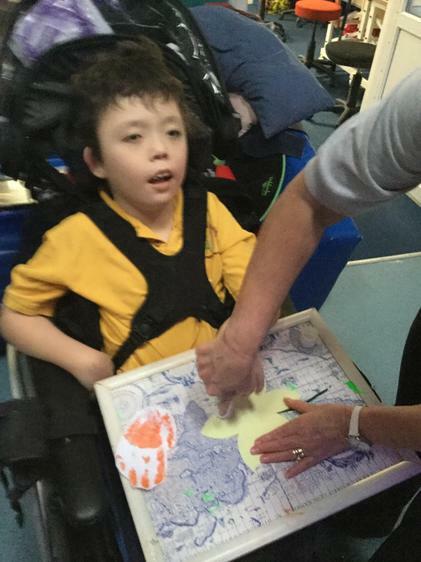 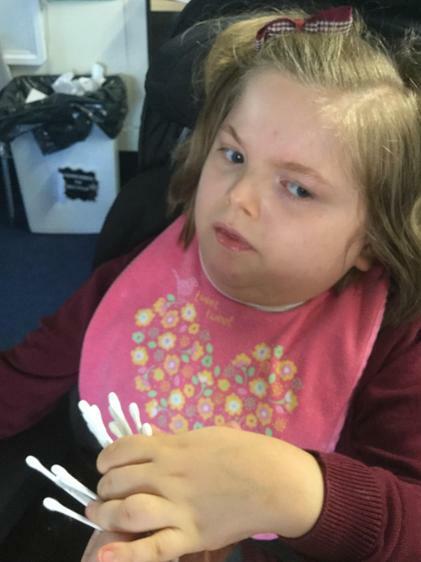 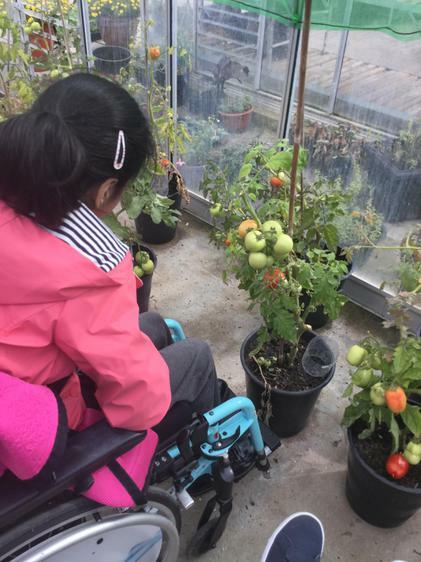 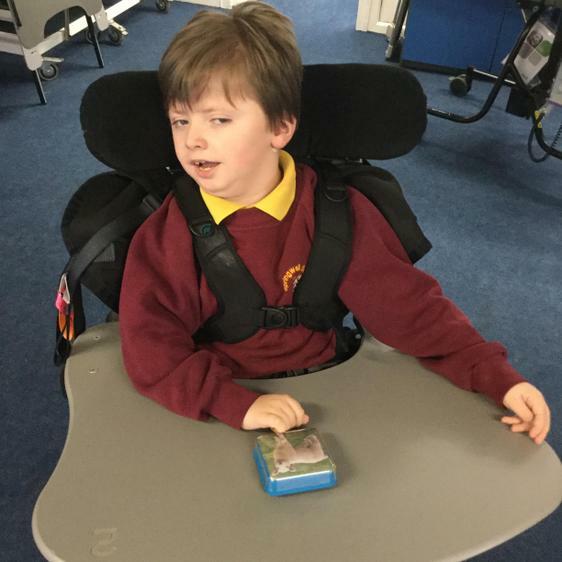 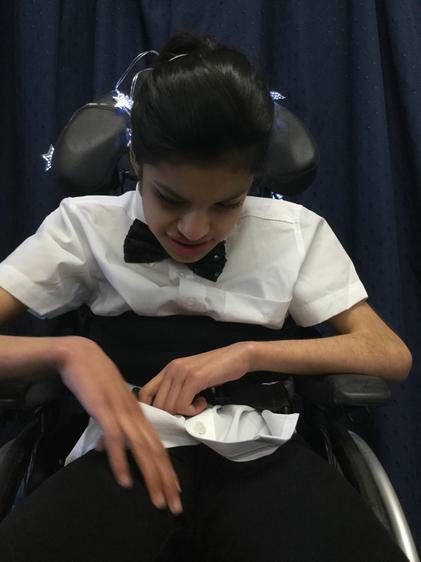 It has been designed for our pupils with Profound and Multiple Learning Difficulties (PMLD) and Severe Learning Difficulties (SLD) who require specialised management for physical disabilities, sensory impairments and complex medical needs. 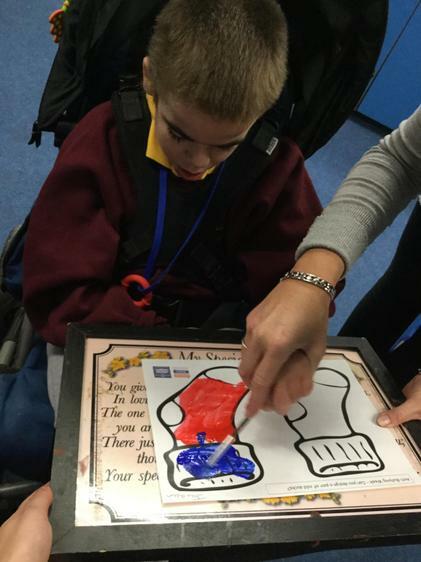 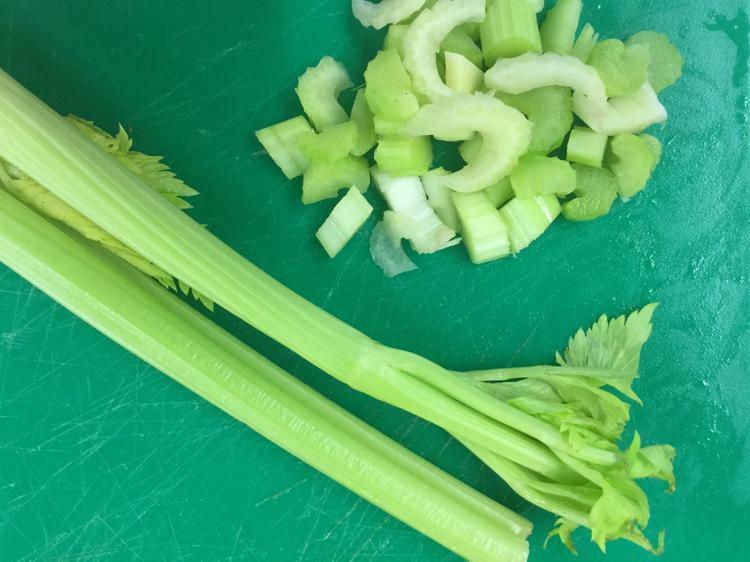 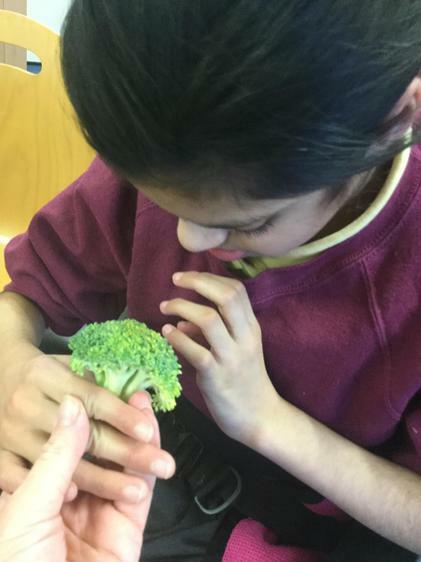 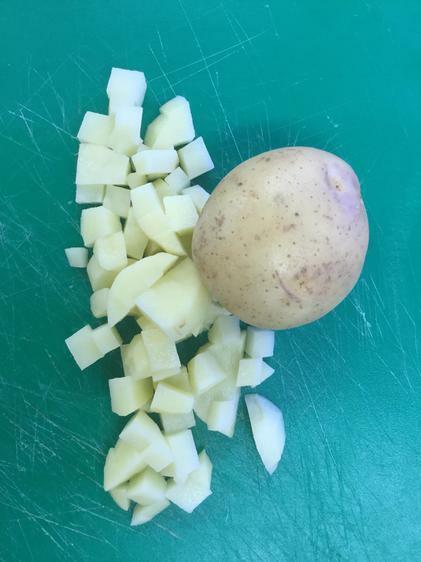 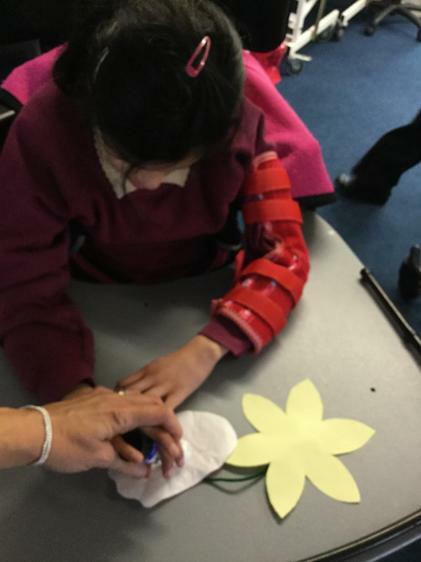 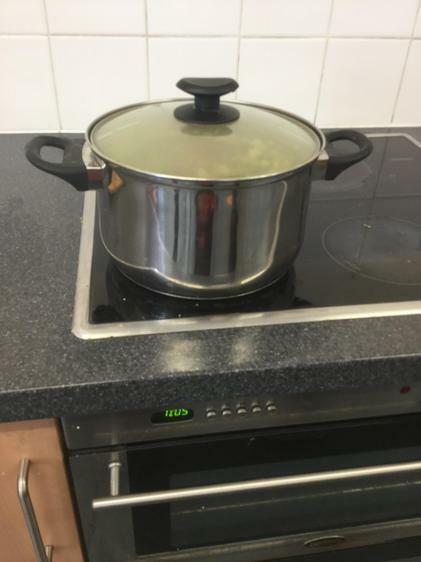 · MOTIVATING Our pupils learn when they are interested, stimulated and engaged. 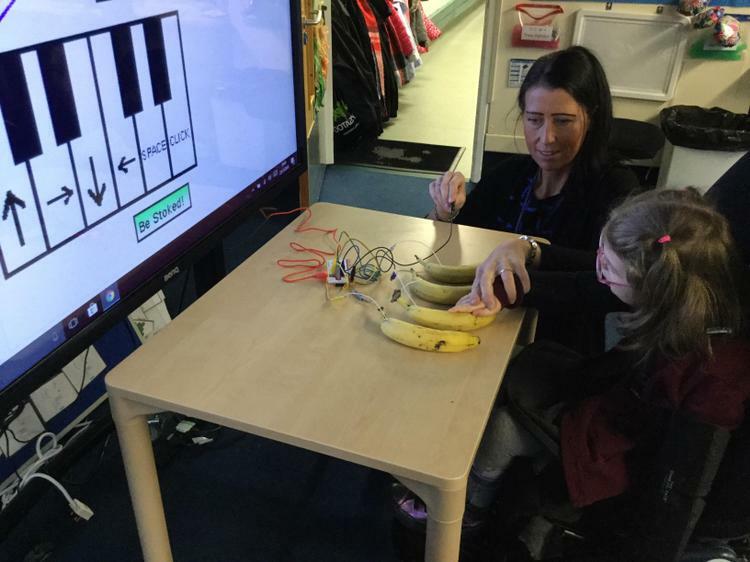 · RELEVANT It is relevant to the learning styles of the pupils and takes into account their prior knowledge and learning needs. 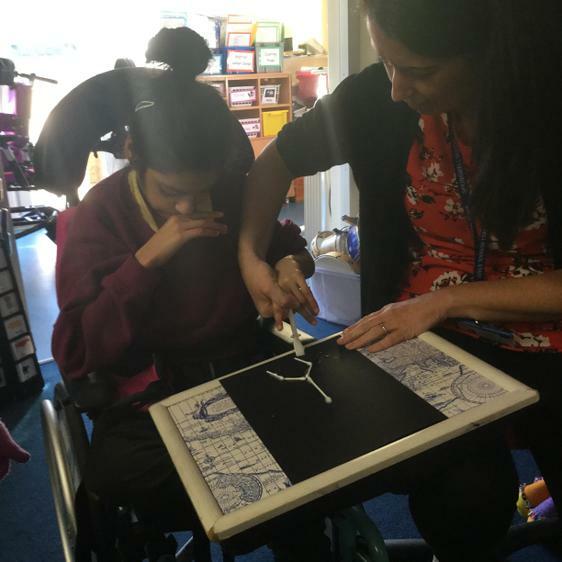 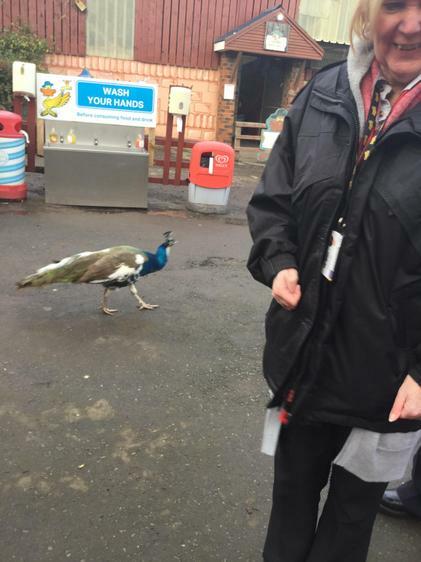 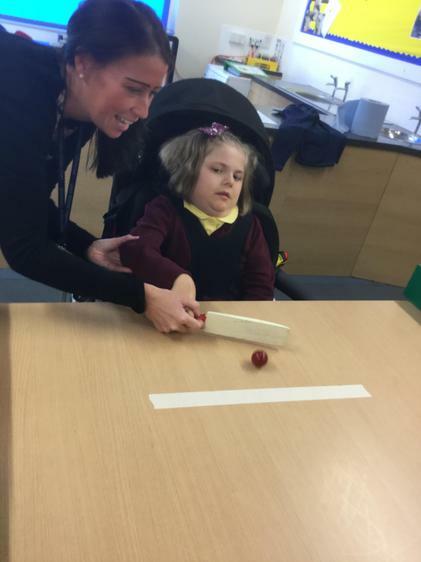 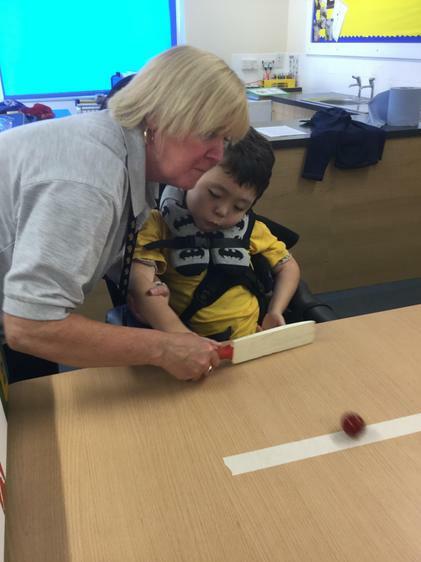 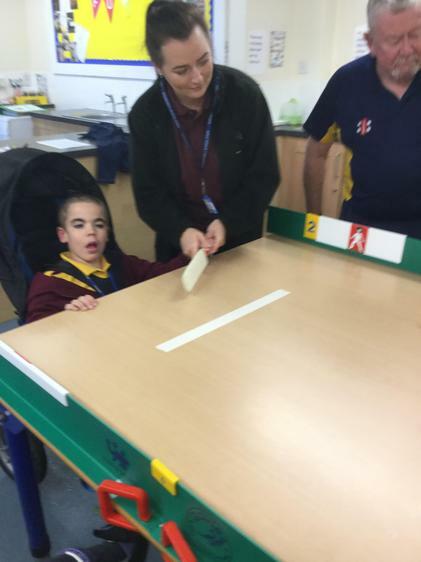 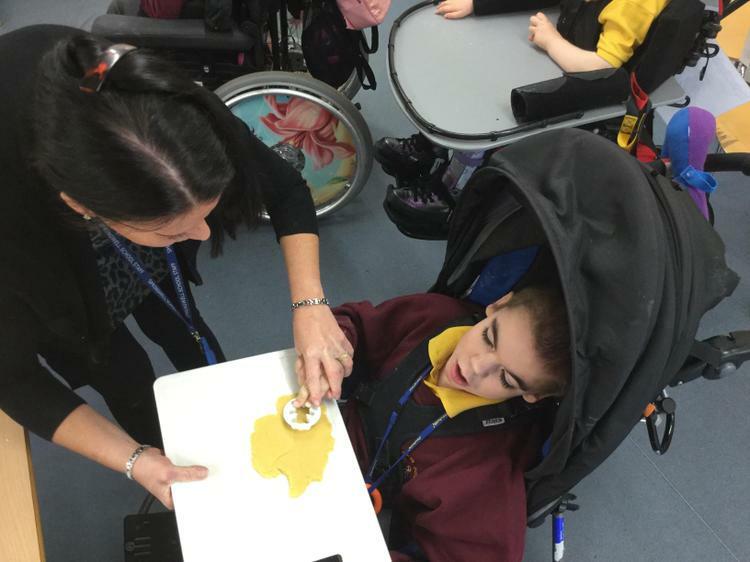 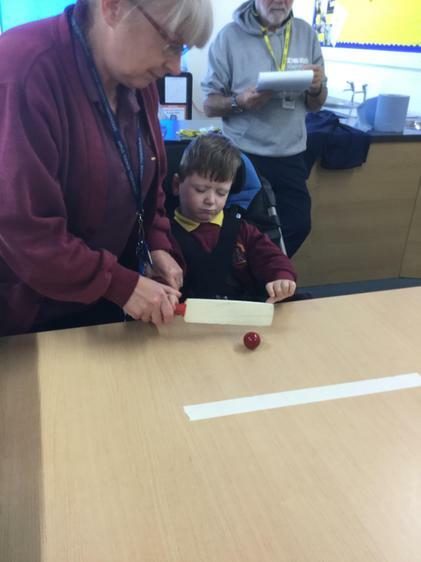 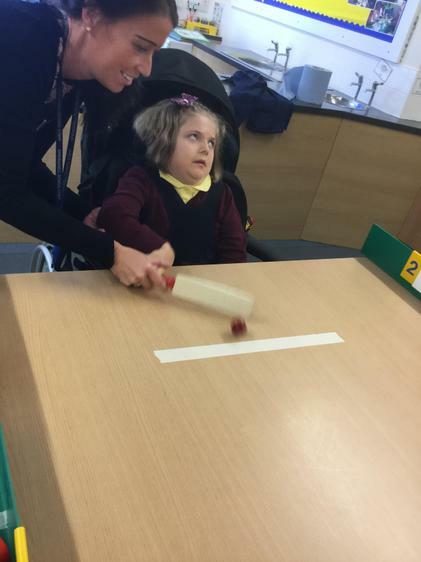 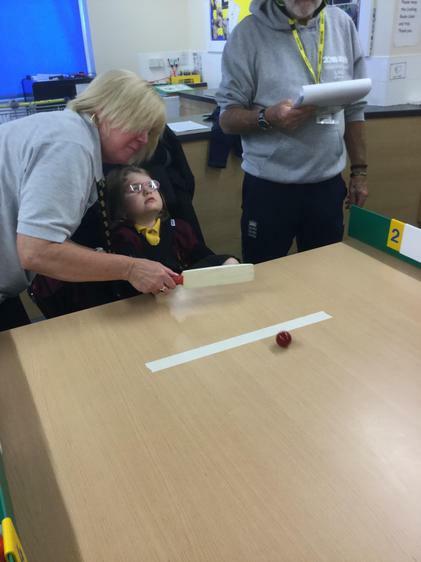 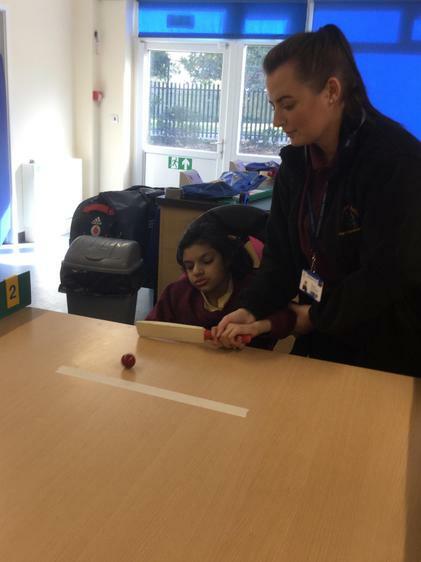 · CHALLENGING All teaching staff have high and realistic expectations of the pupils and with specialised, inclusive teaching — progress is evident. 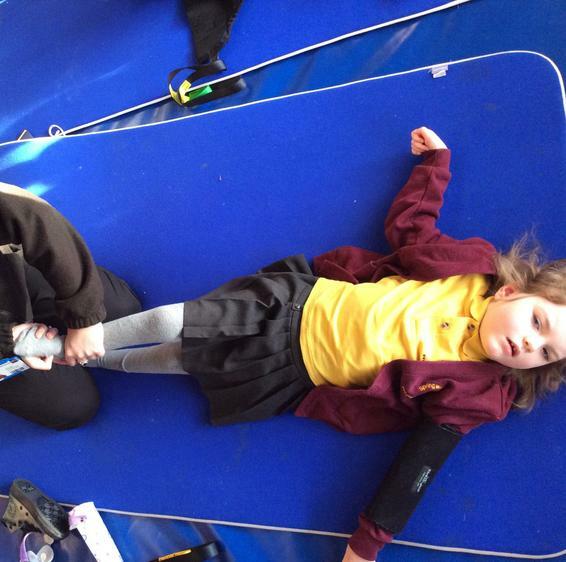 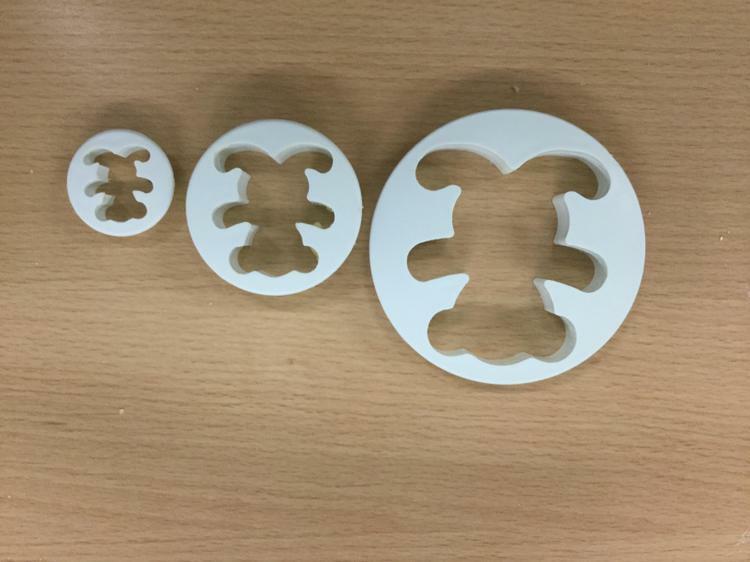 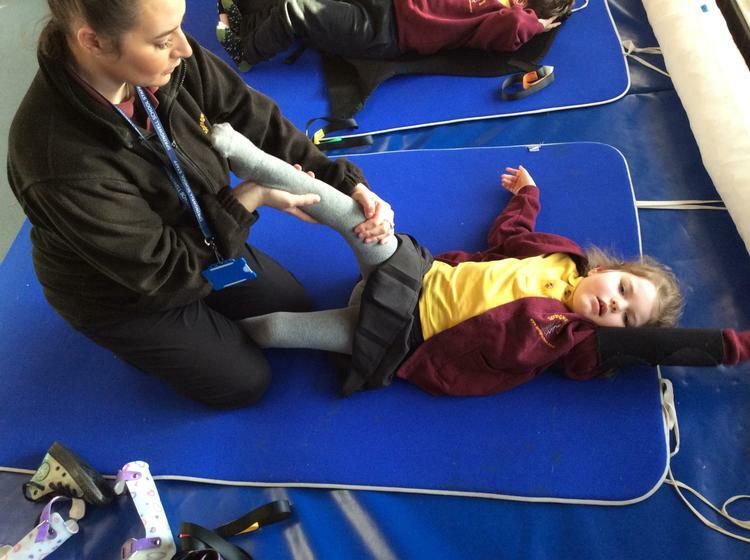 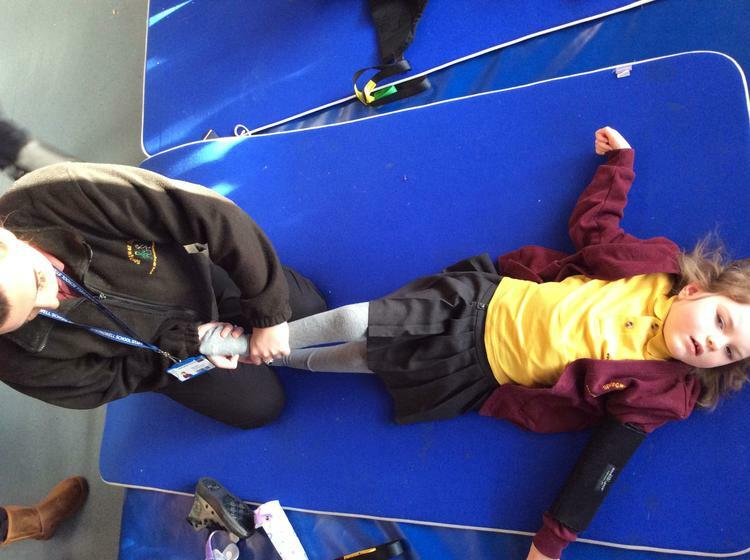 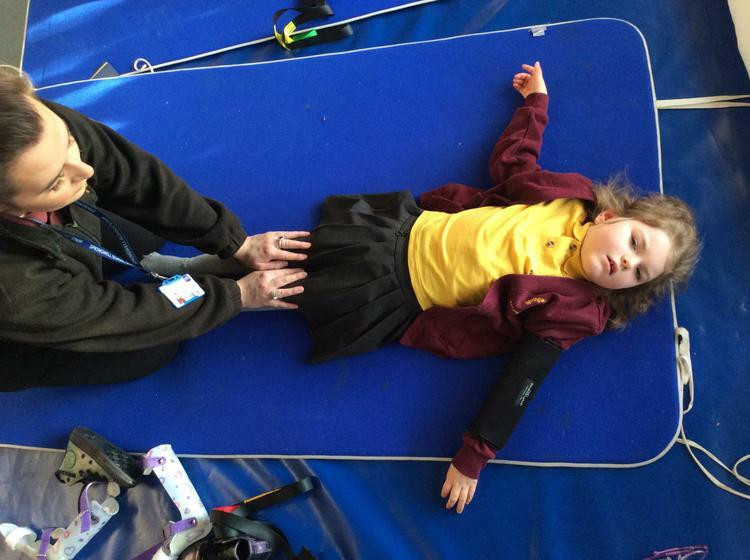 · FOCUSED Shared targets from EHCP, physiotherapists, SALT etc. 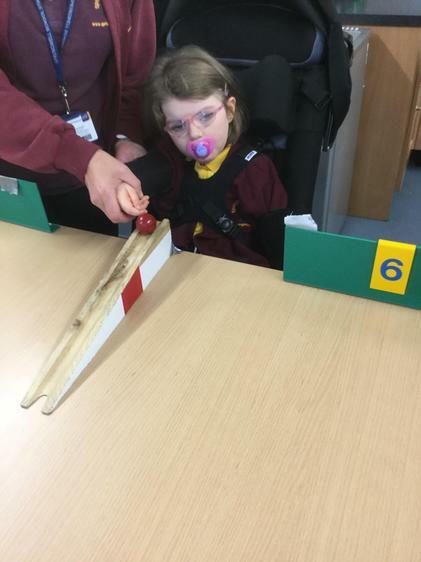 are central to the pupils provision. 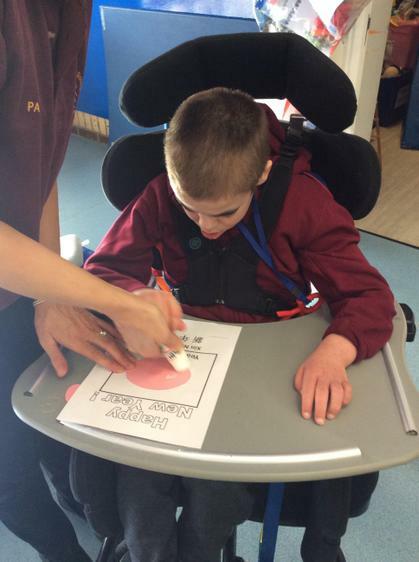 All the children will have a (PLP) Personalised Learning Plan. 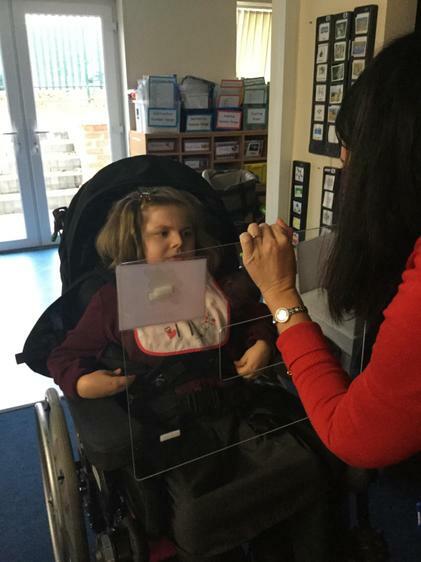 This plan will include all the targets your child will be working towards and it will include targets from everyone who works with your child in school e.g. 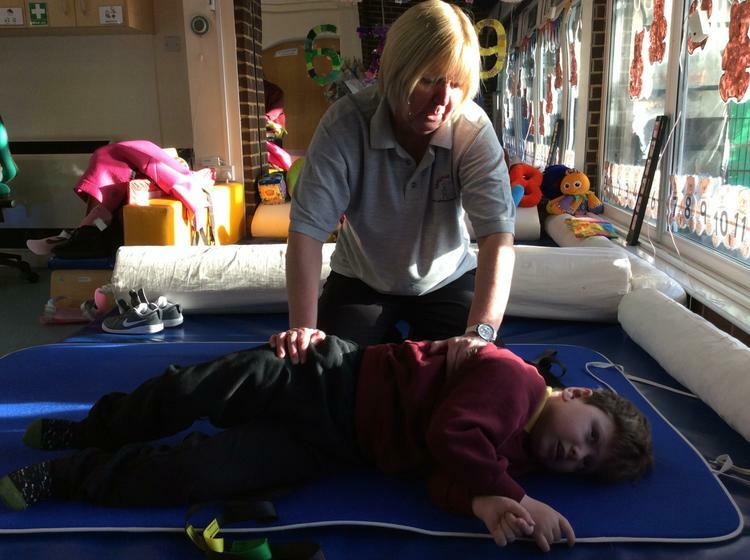 physiotherapy targets, occupational therapy targets, speech and language targets and targets from visual impaired teacher if applicable. 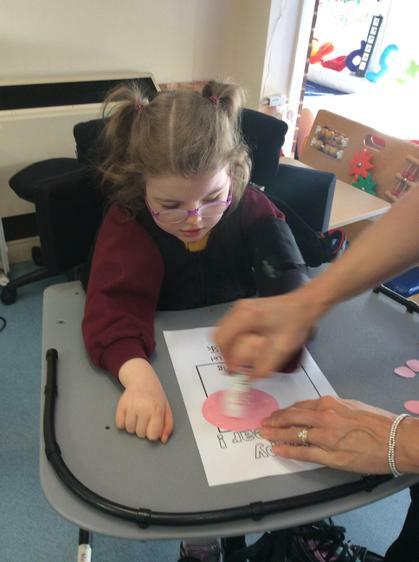 The PLP will reflect the same targets that will be included in your child’s Educational Health Care Plan (EHCP). 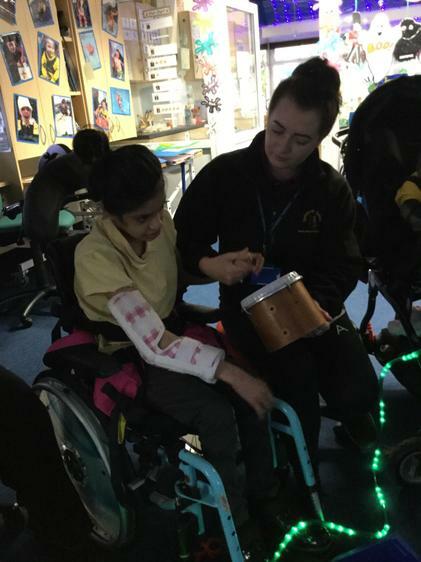 Our Sparkle Curriculum, endeavours to provide our pupils with motivating experiences and activities that will ensure a high level of engagement. 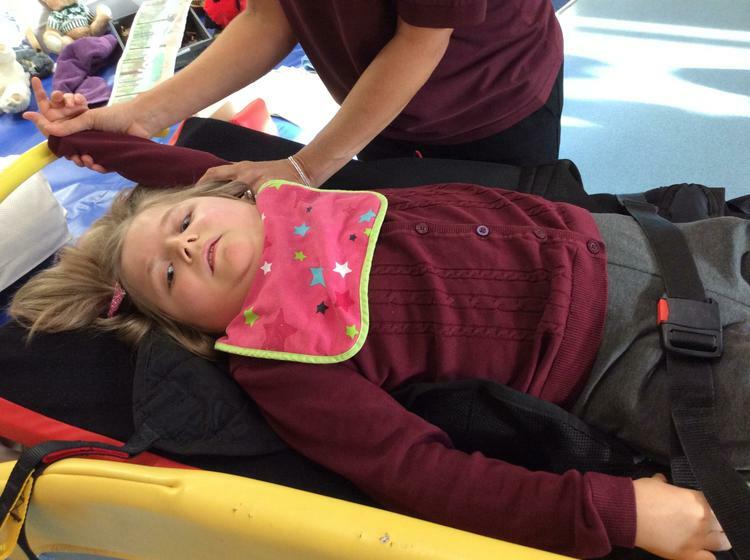 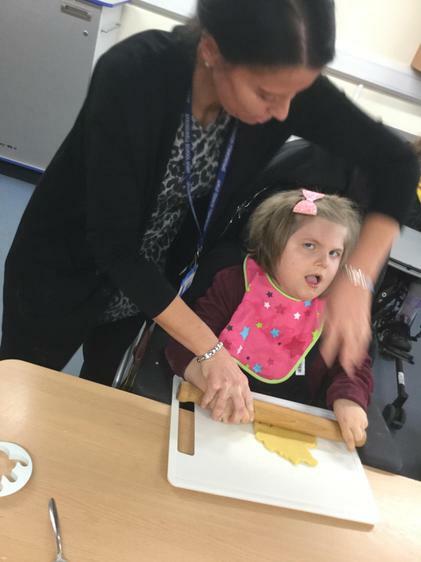 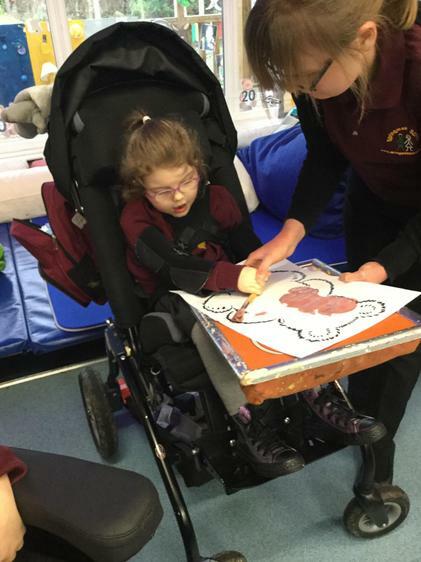 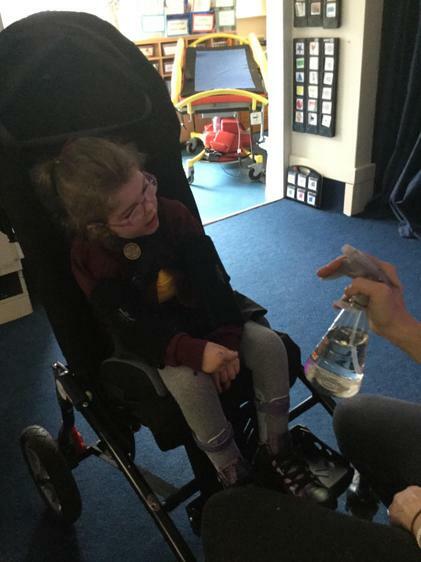 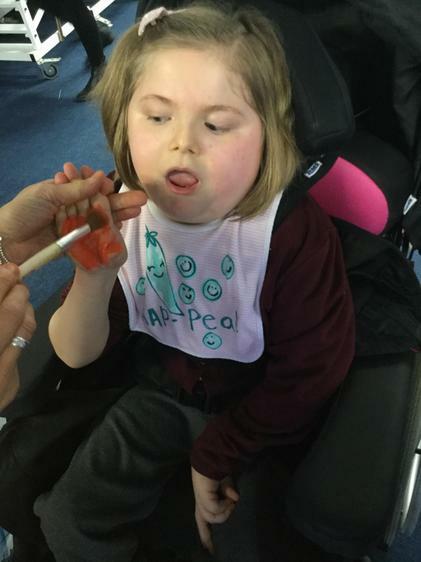 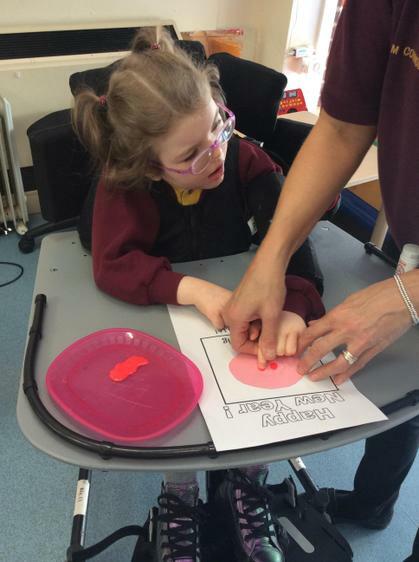 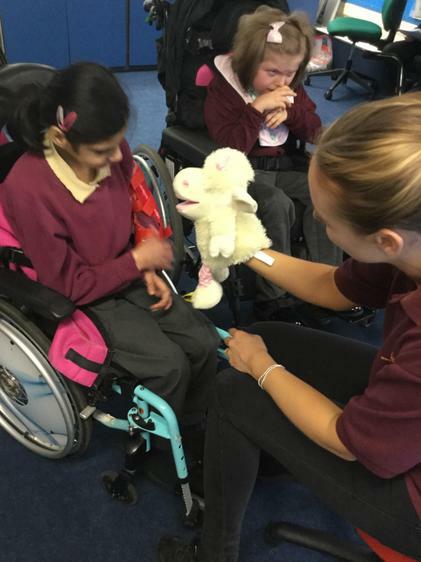 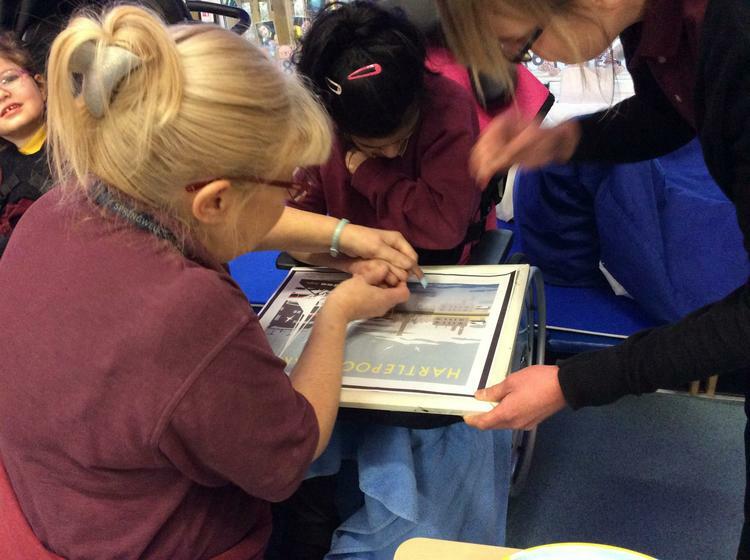 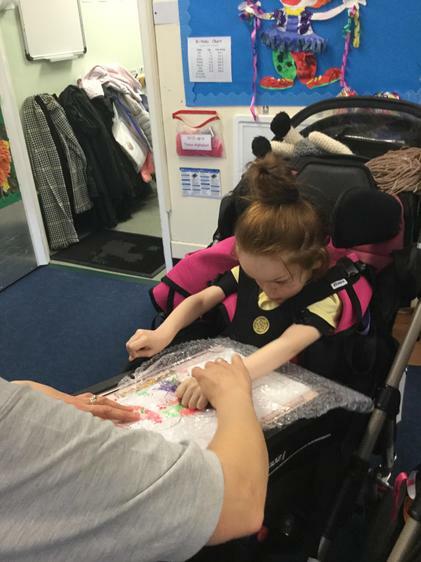 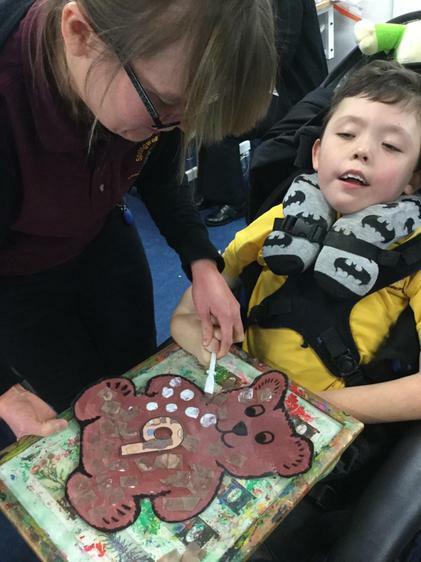 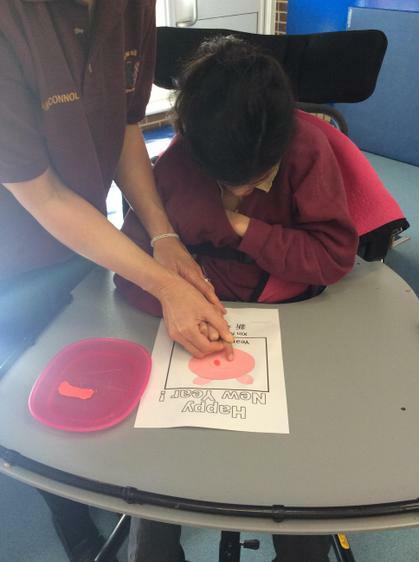 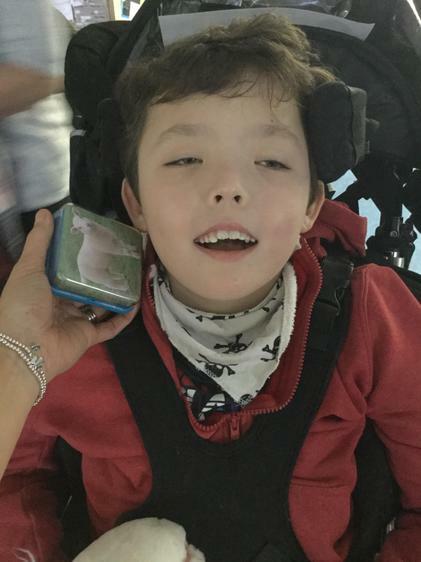 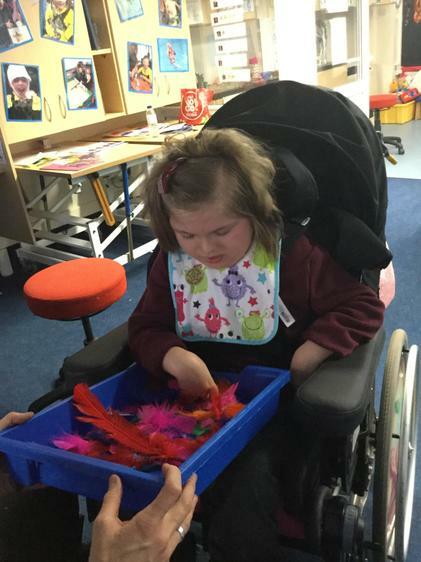 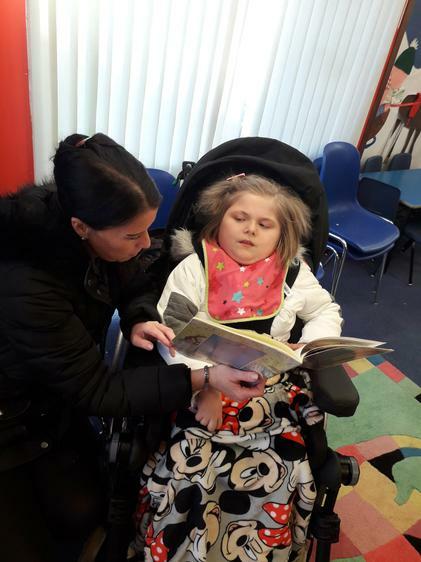 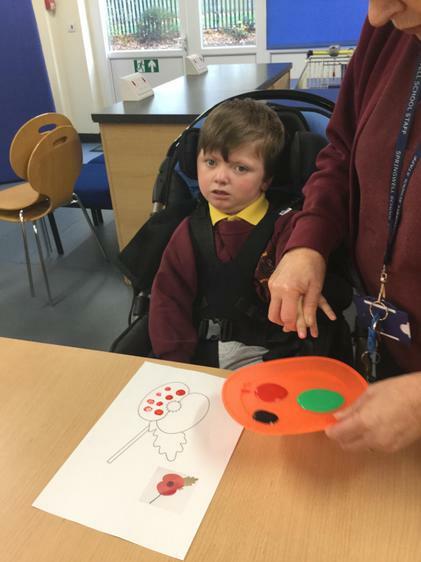 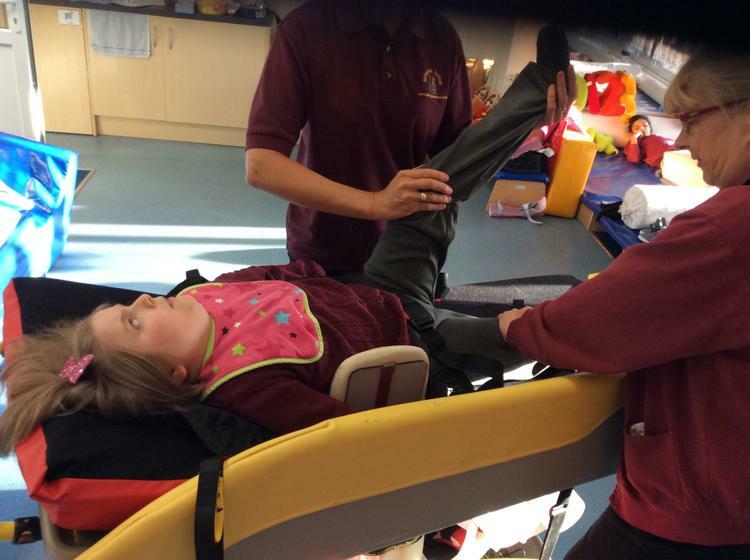 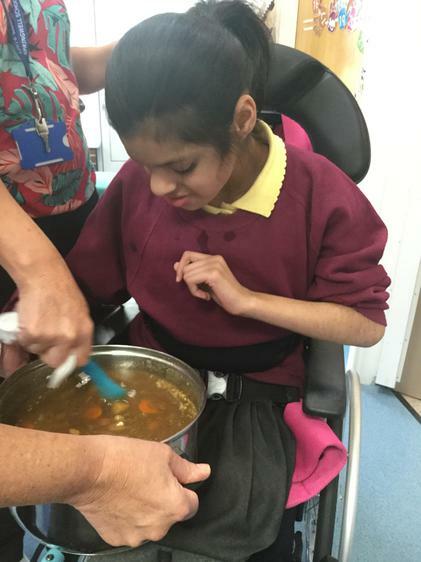 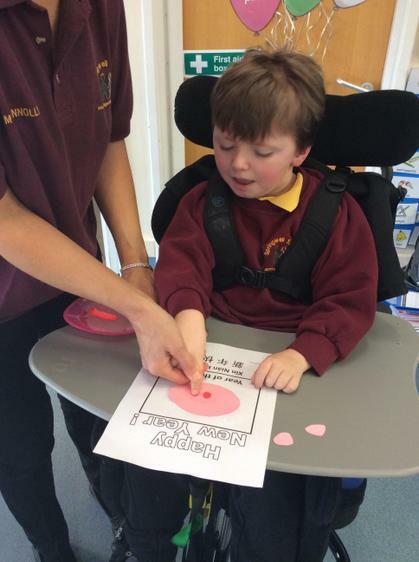 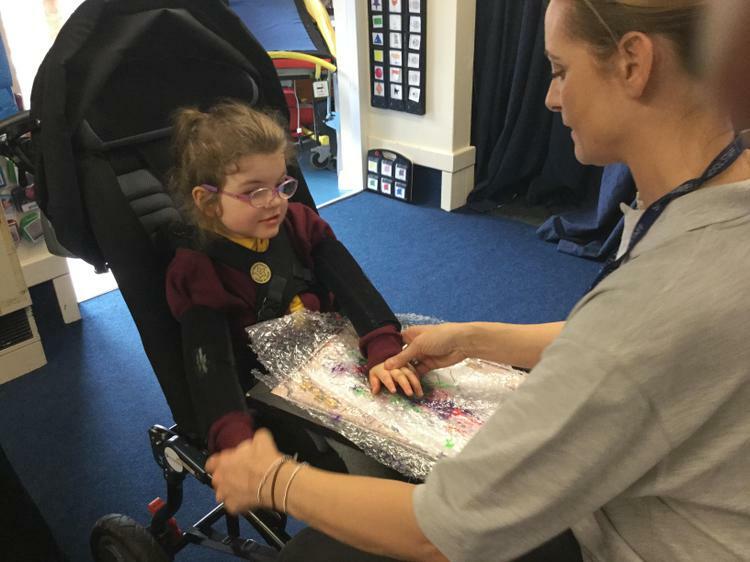 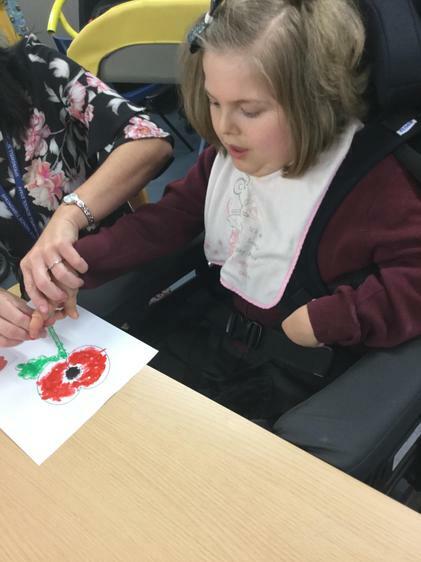 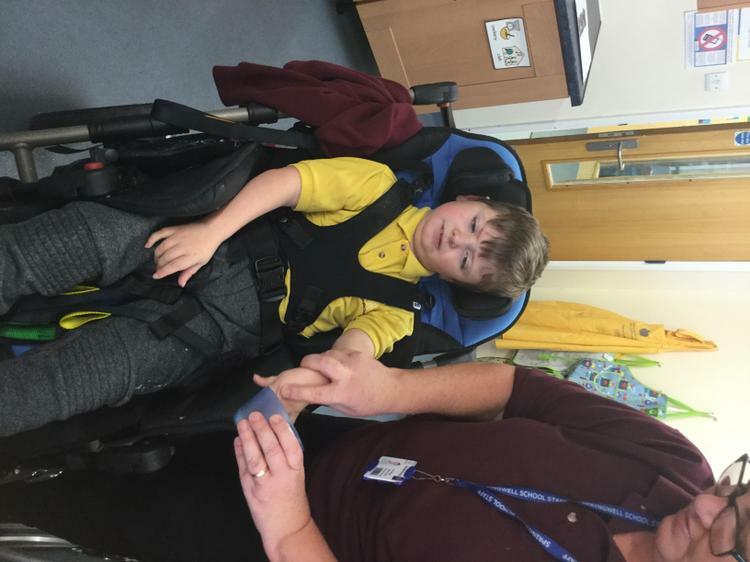 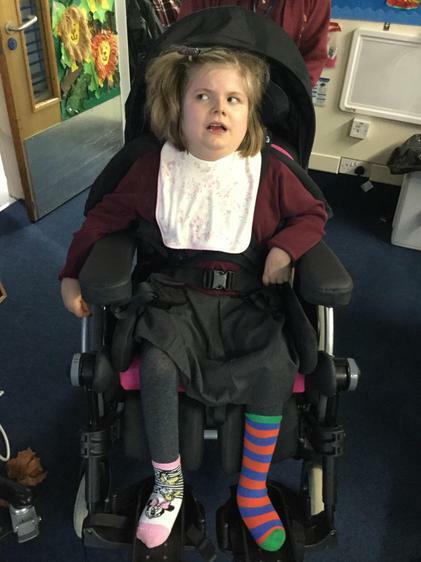 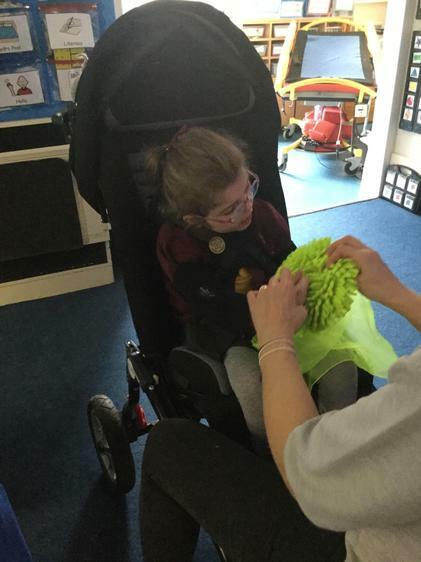 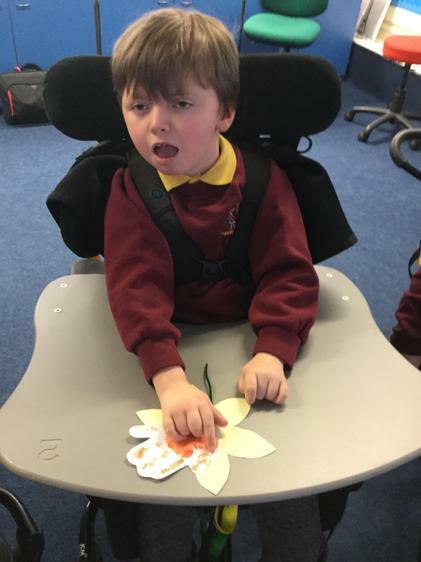 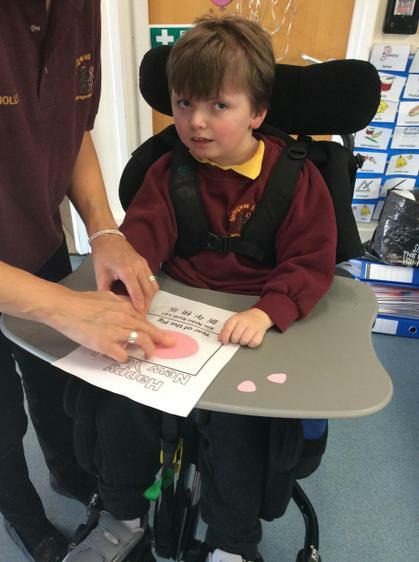 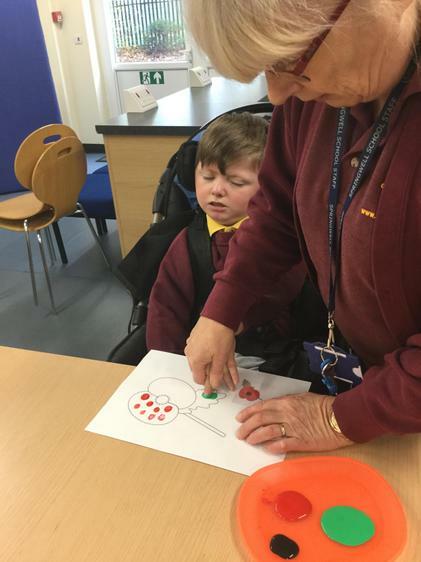 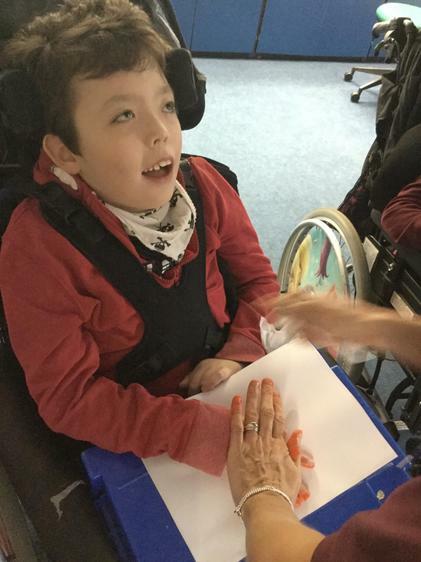 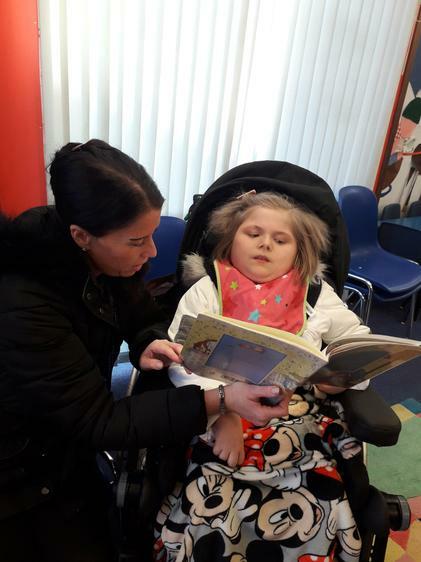 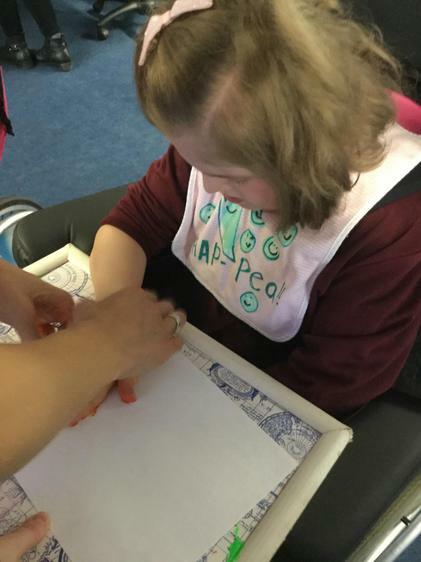 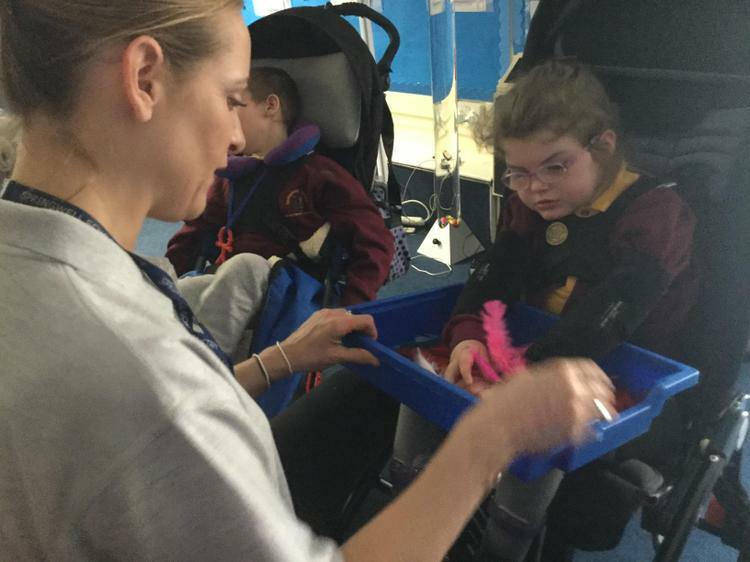 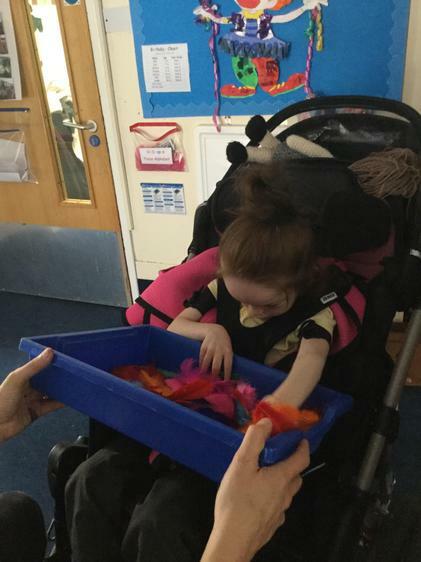 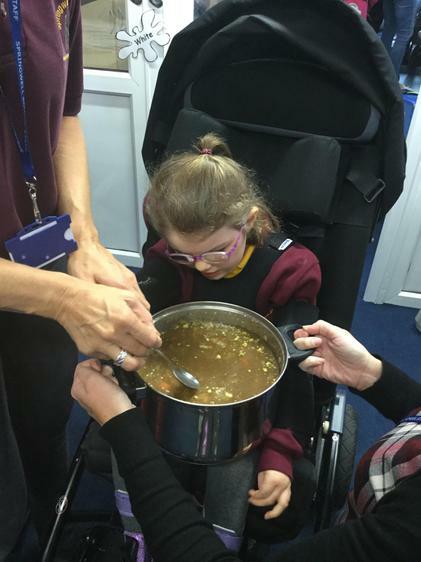 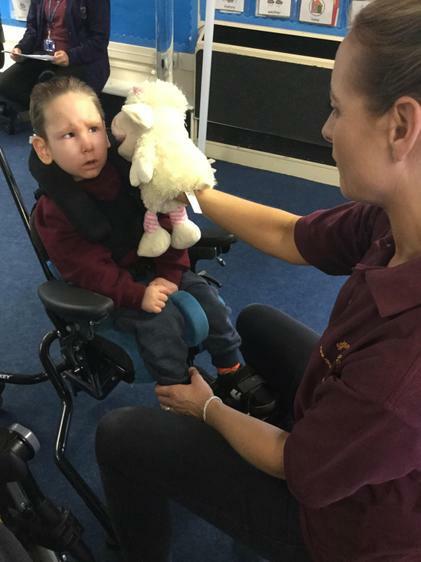 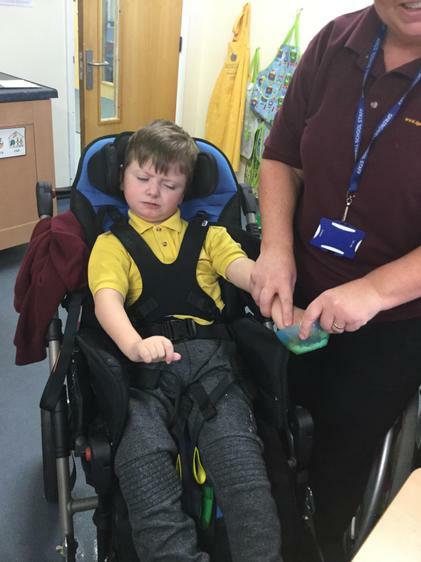 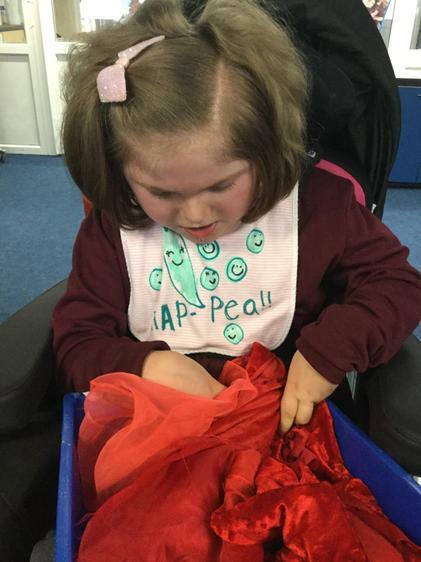 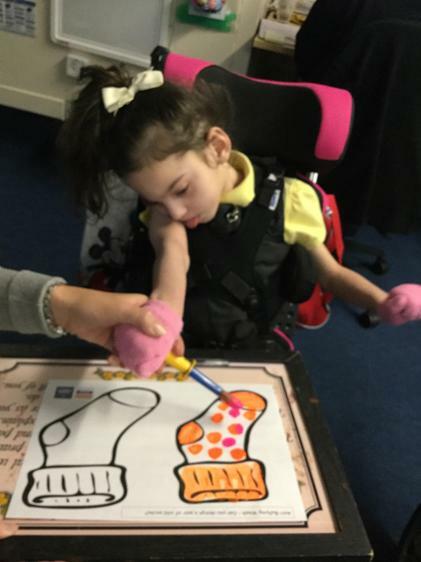 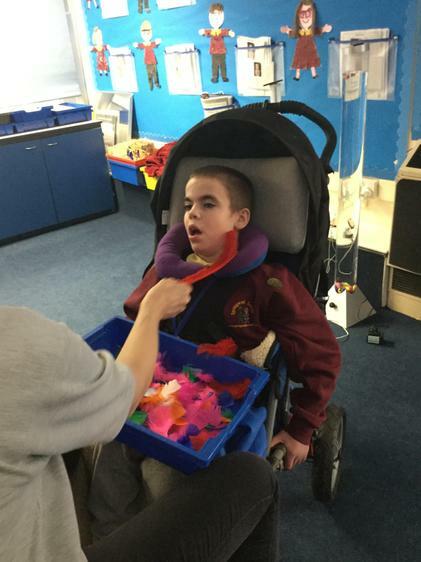 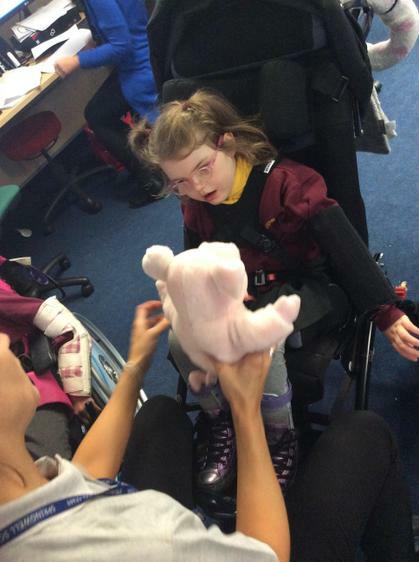 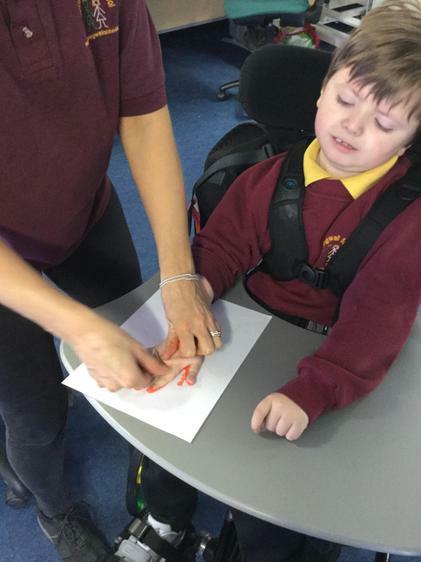 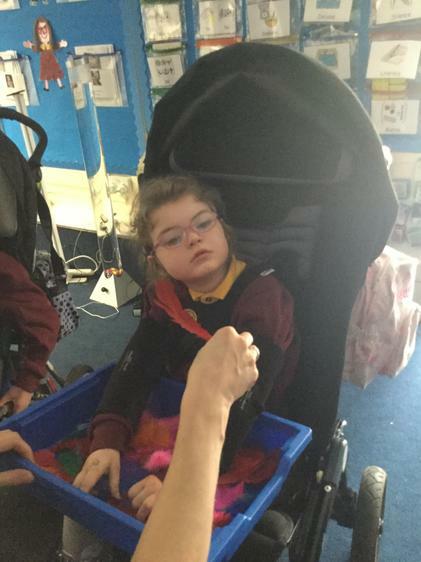 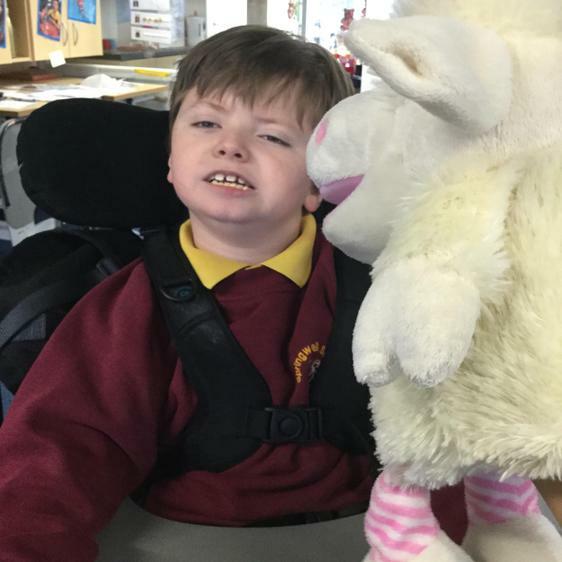 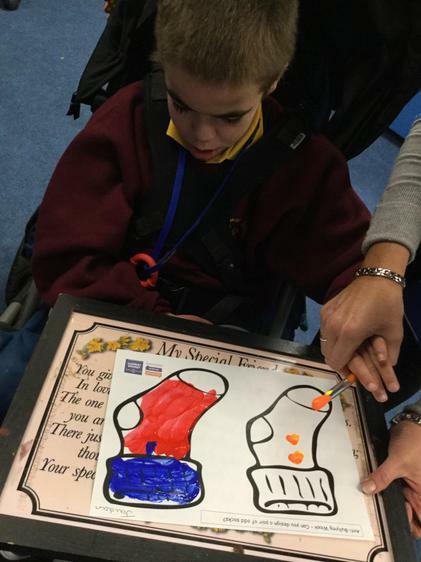 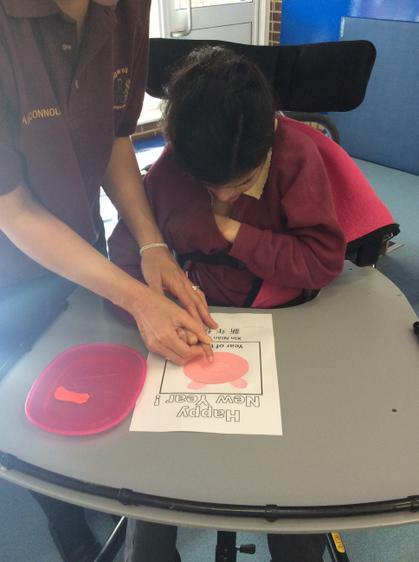 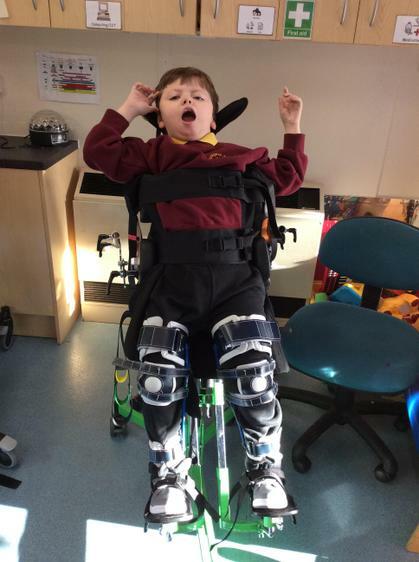 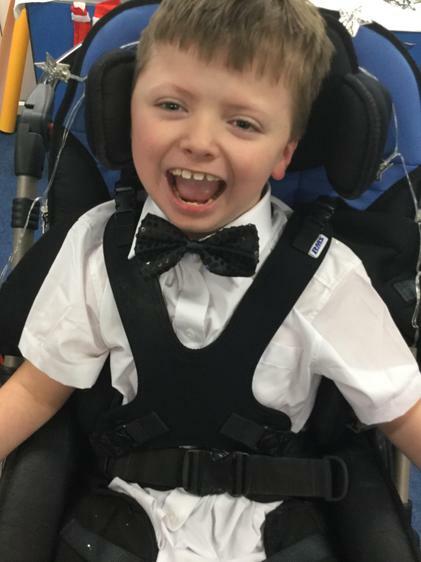 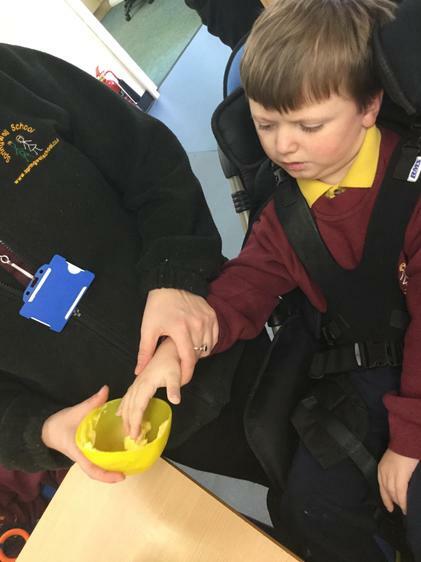 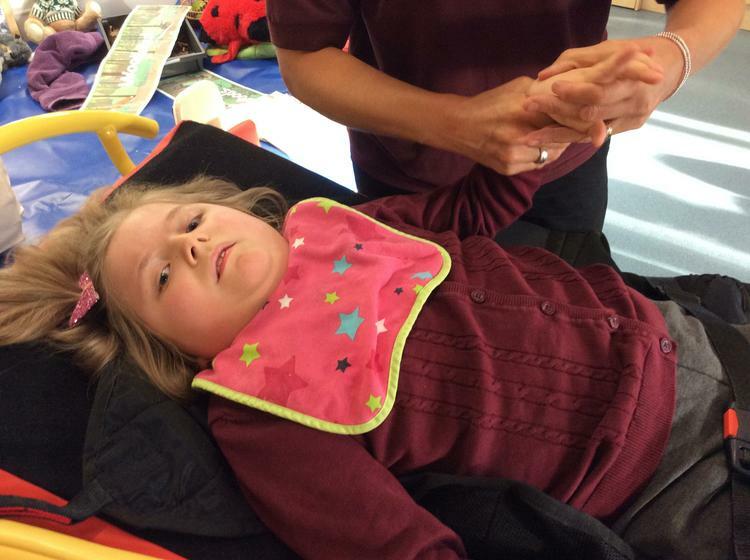 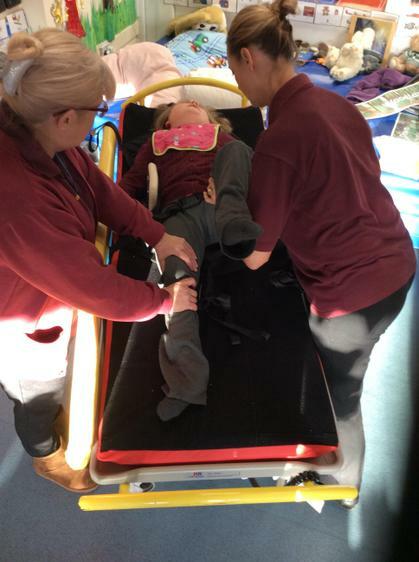 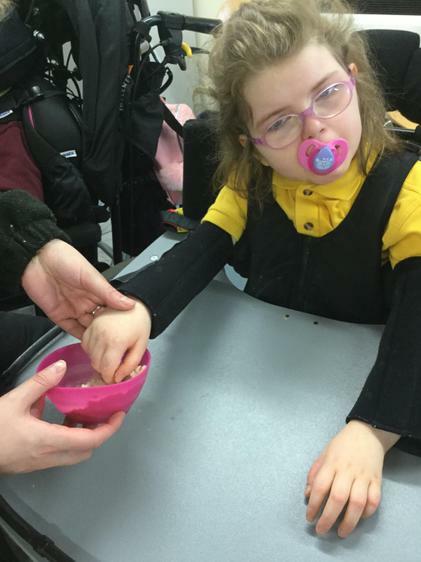 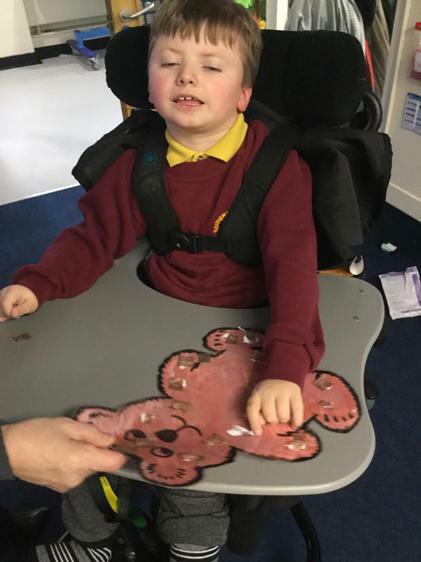 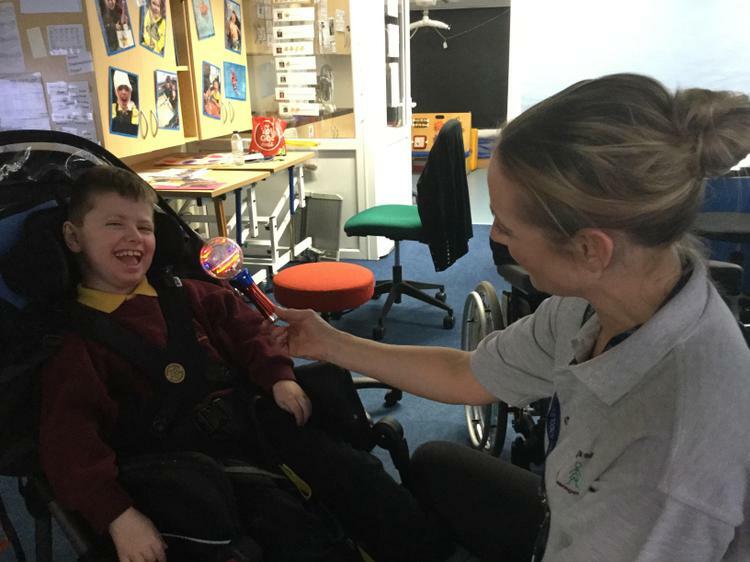 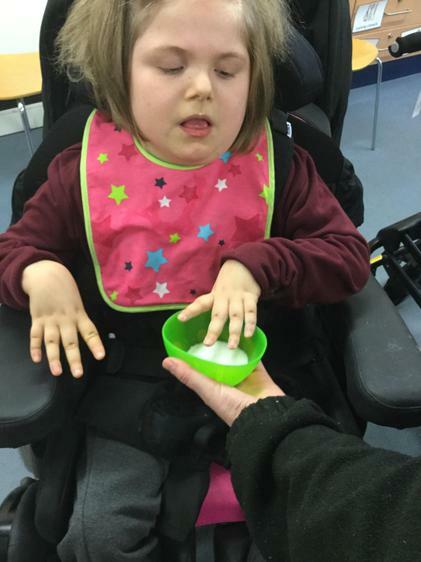 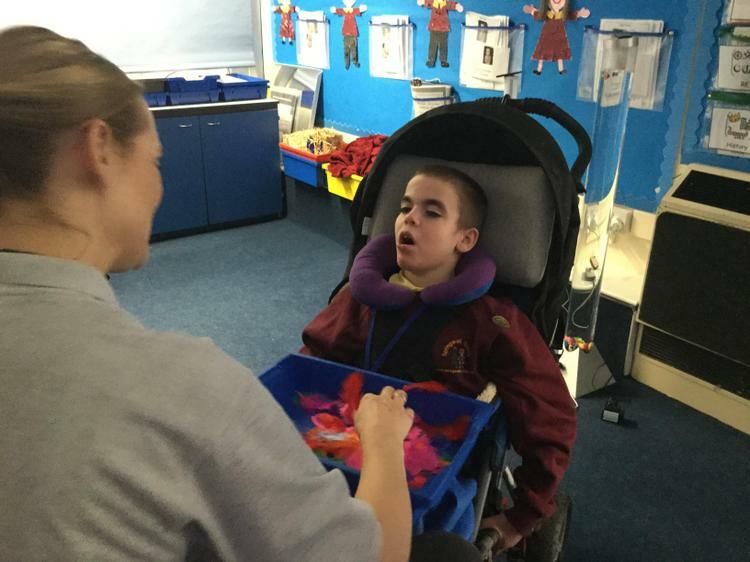 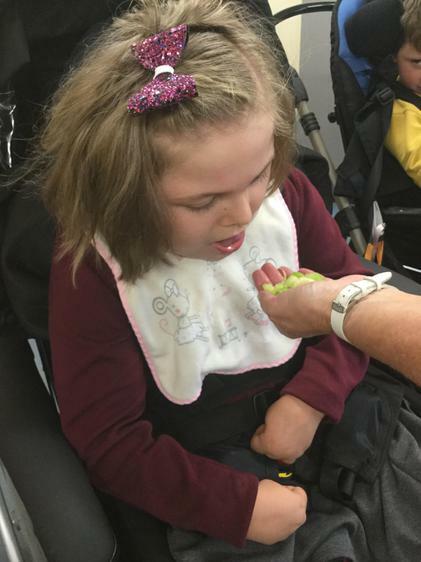 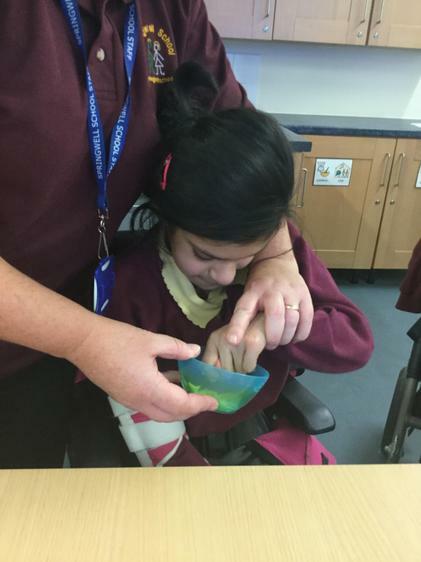 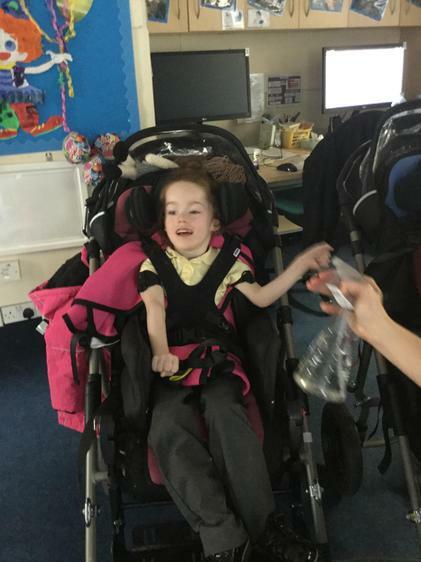 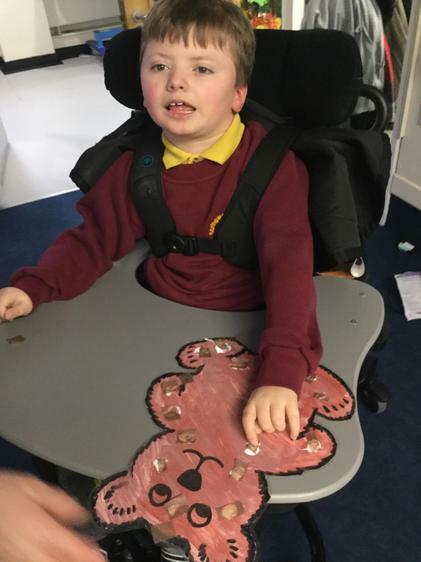 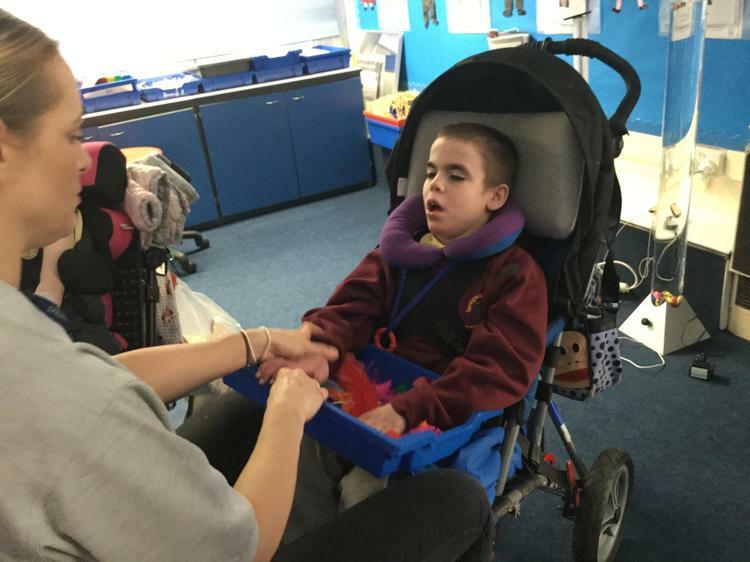 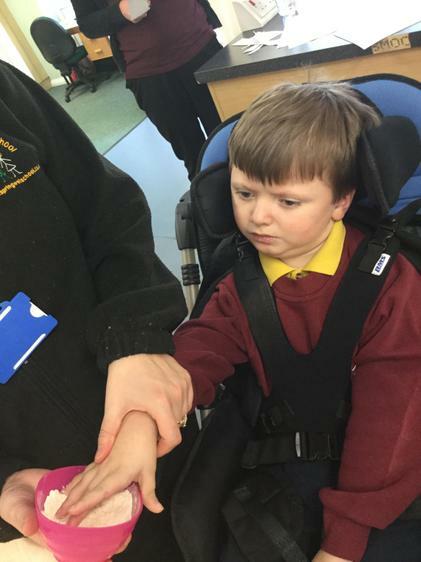 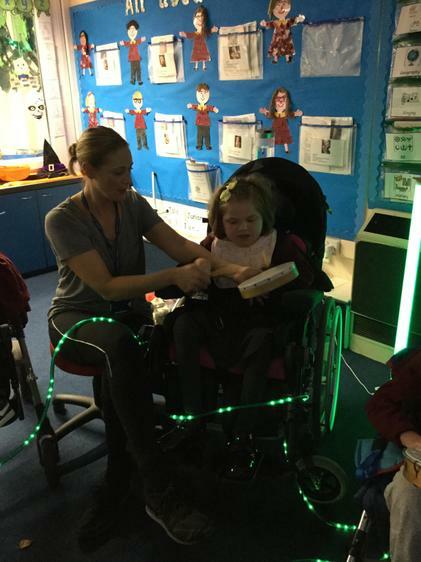 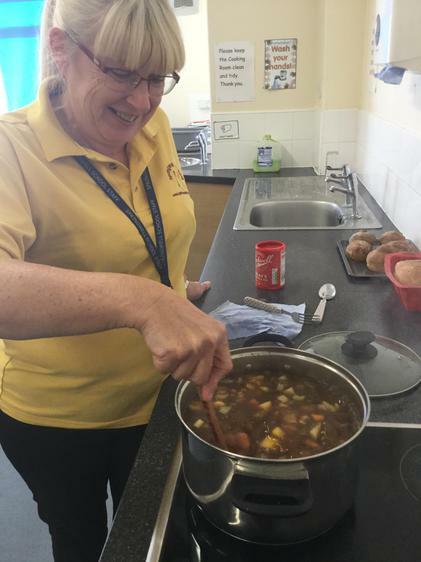 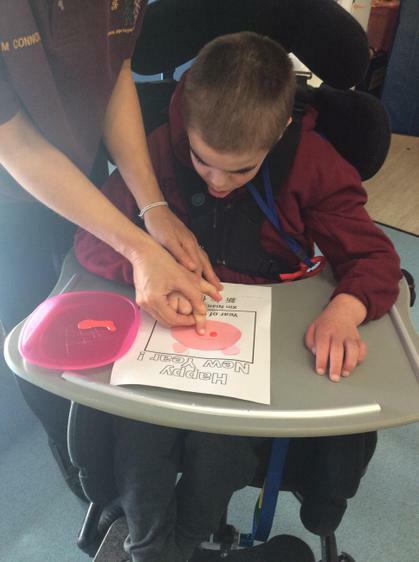 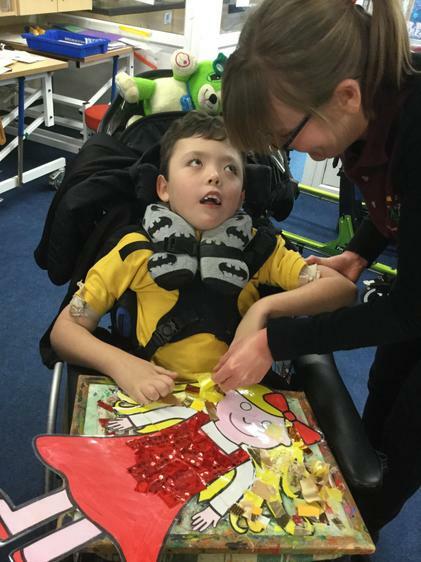 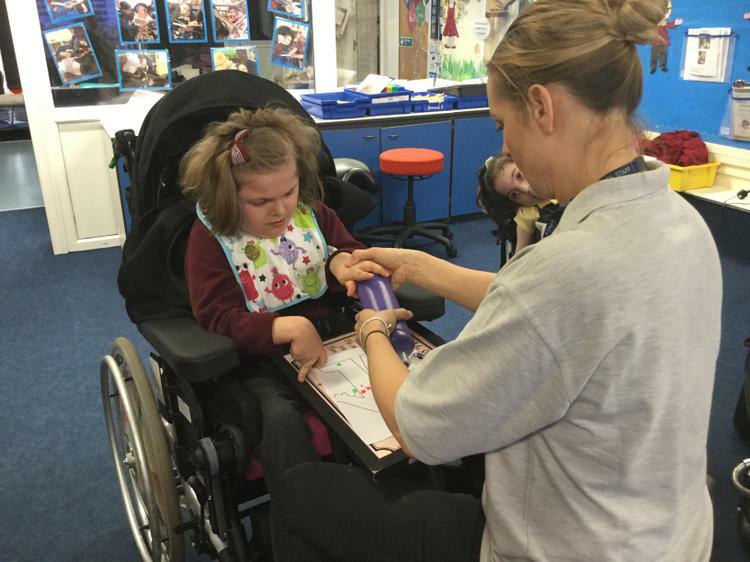 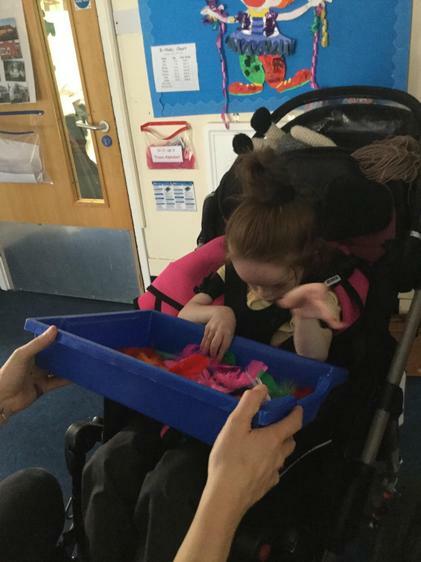 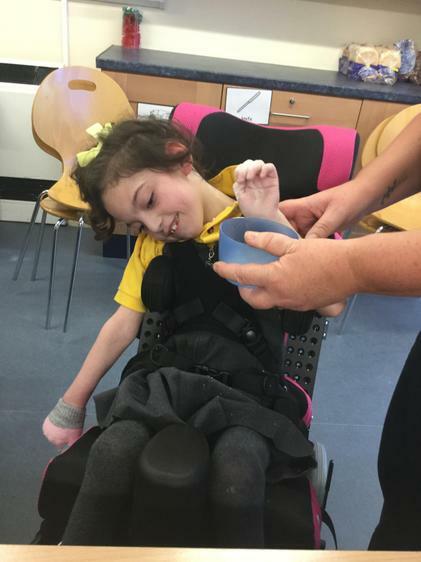 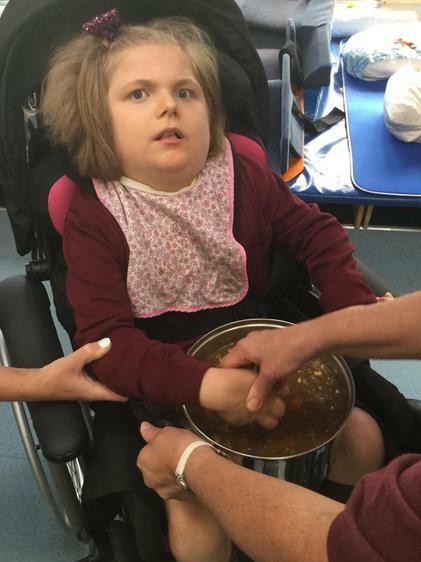 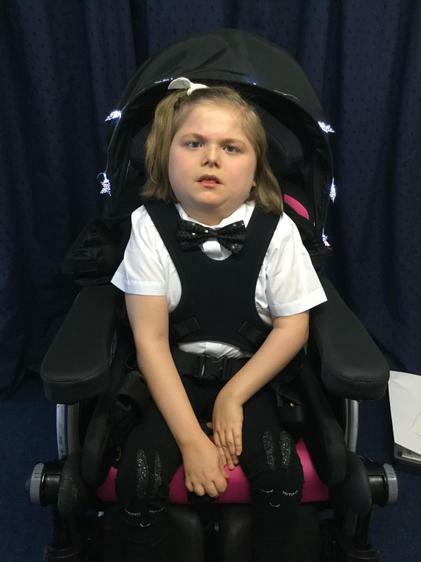 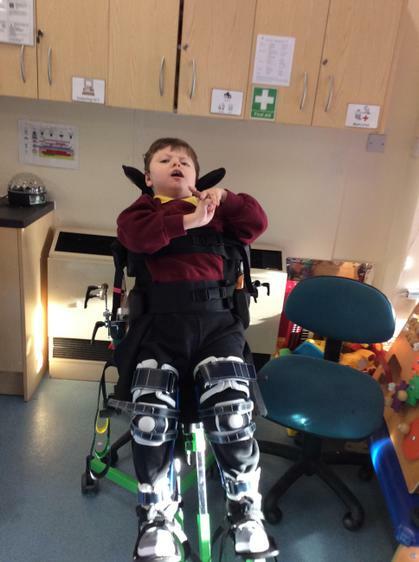 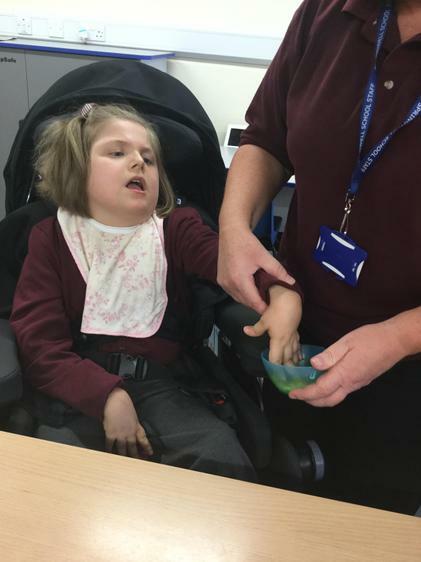 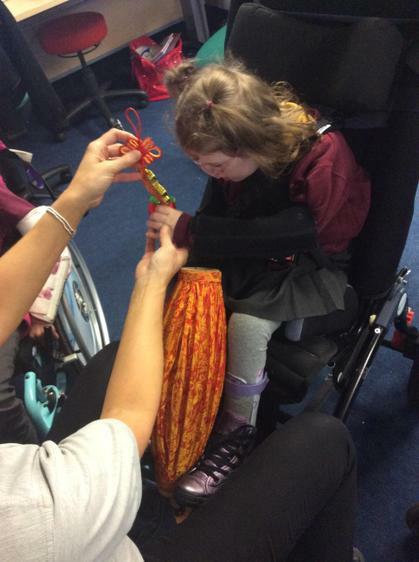 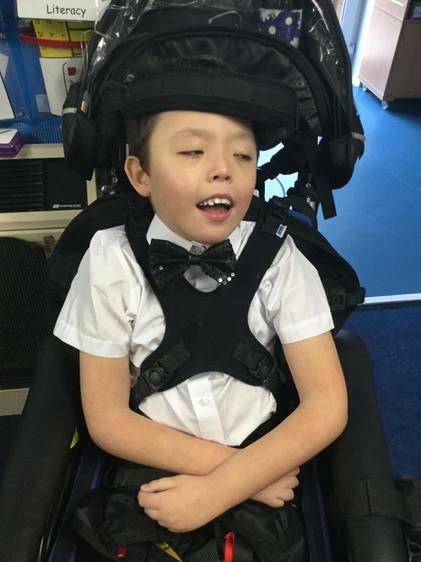 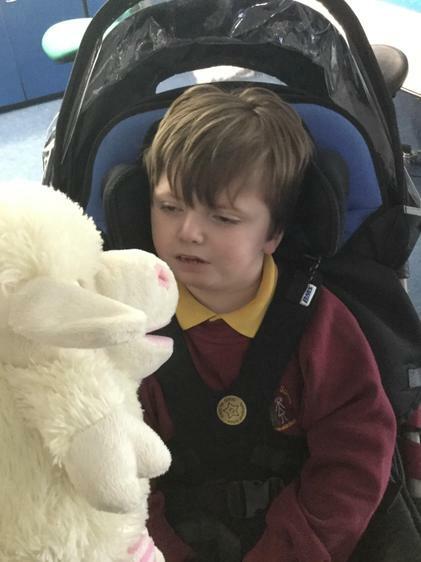 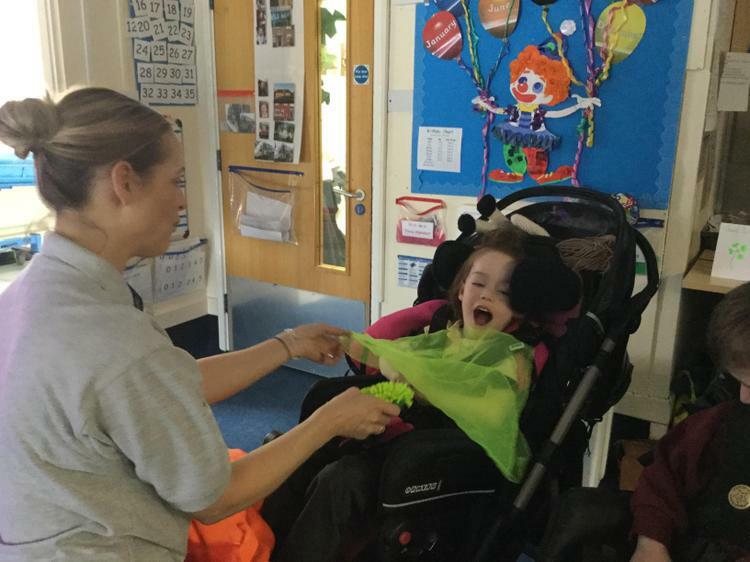 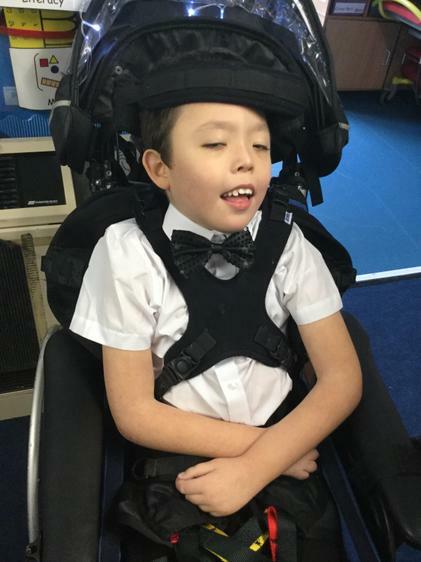 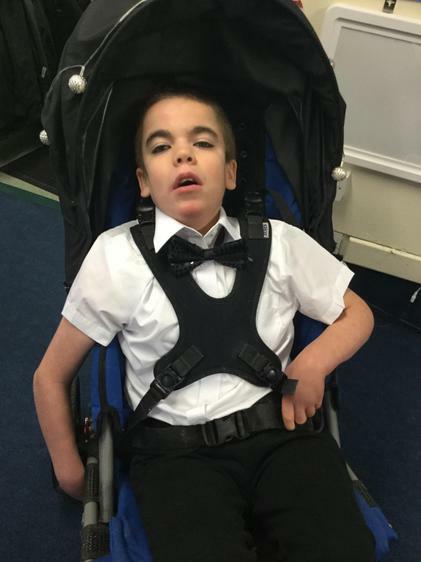 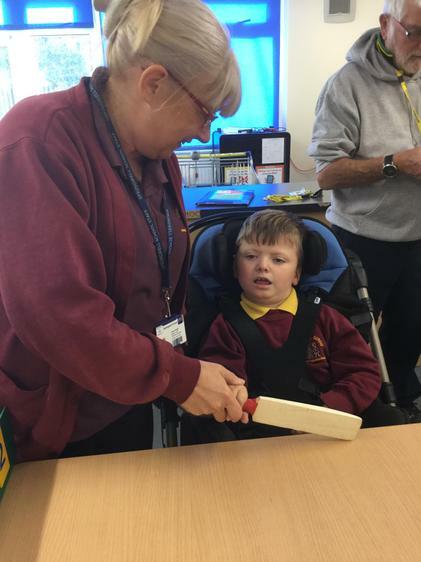 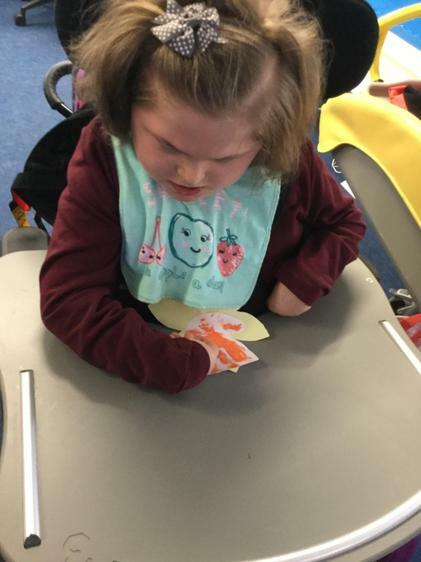 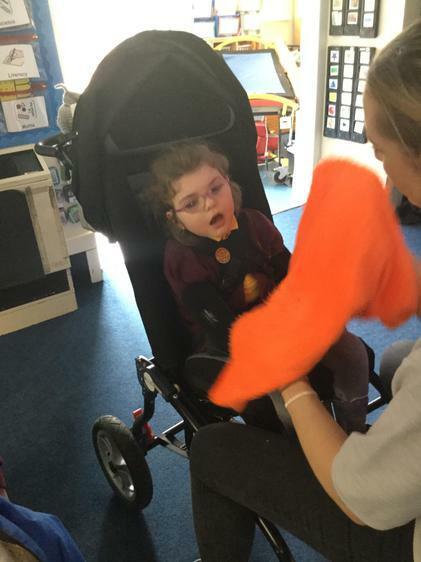 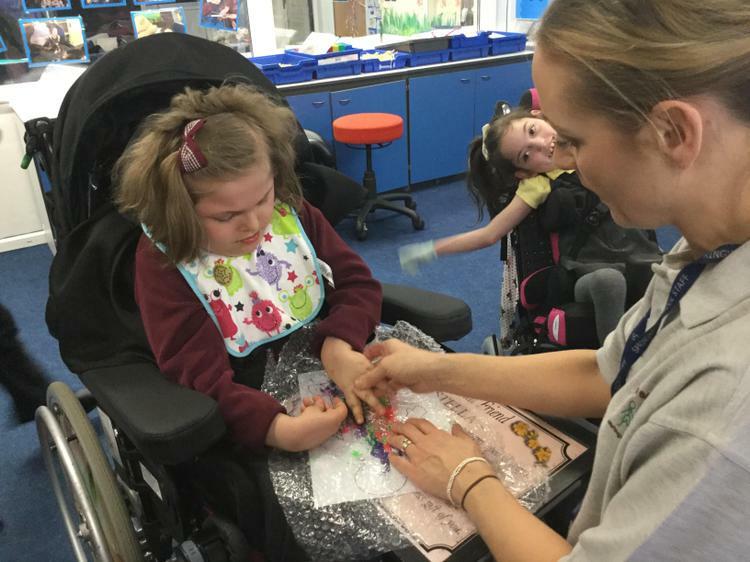 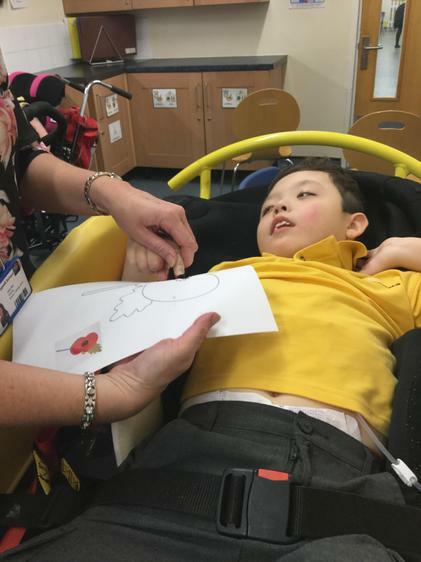 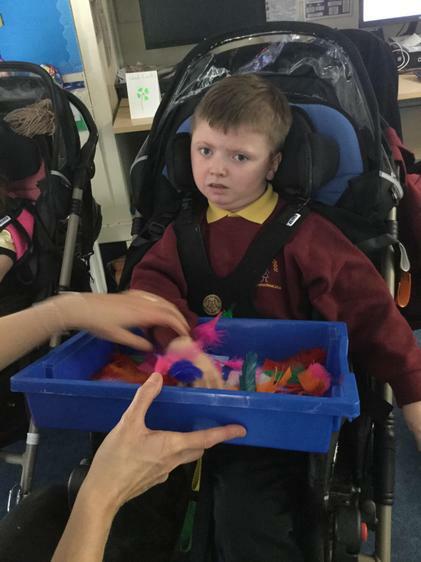 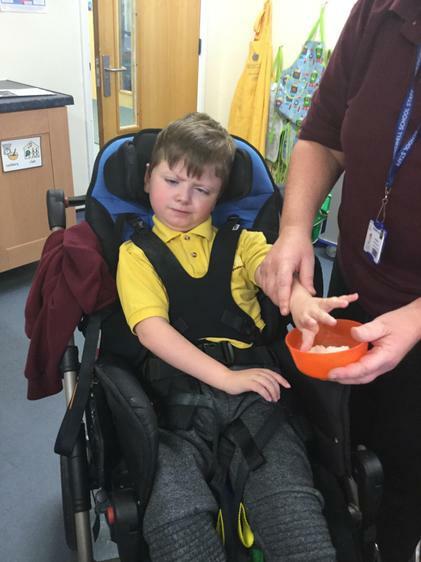 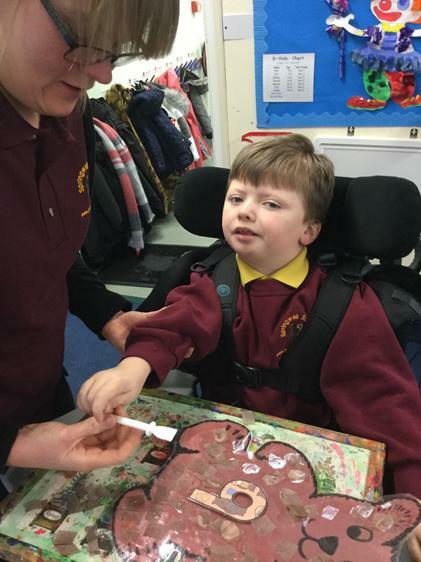 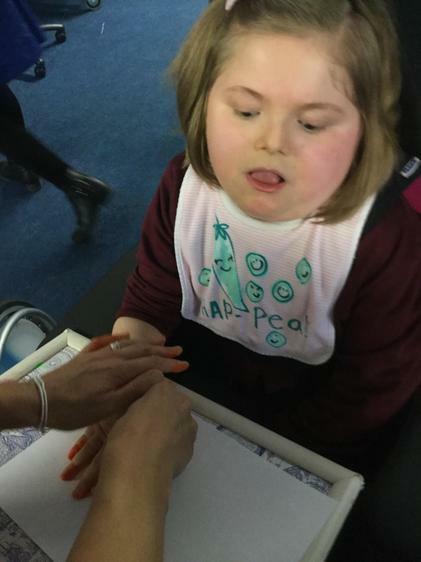 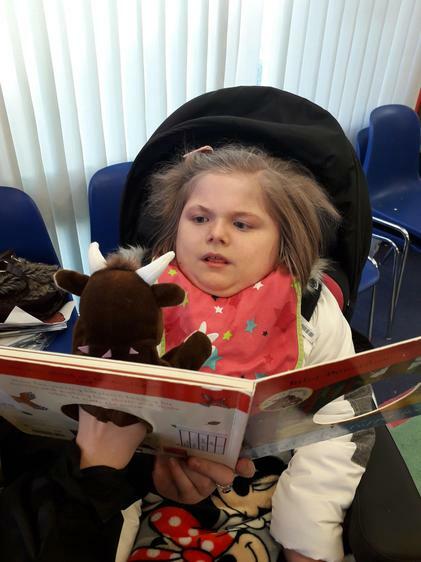 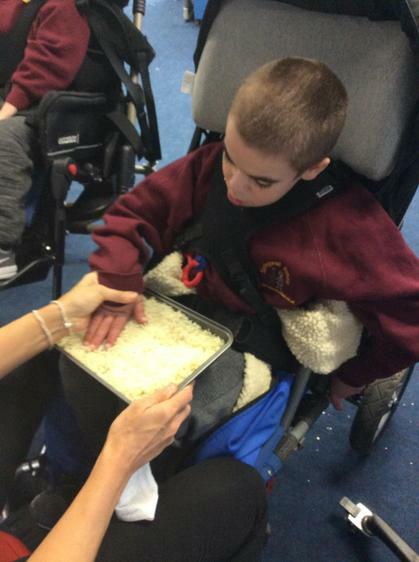 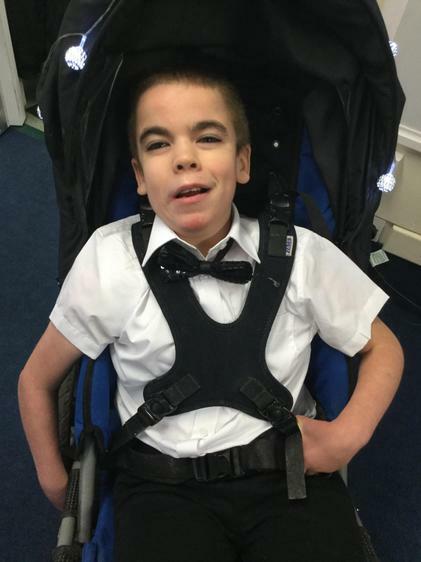 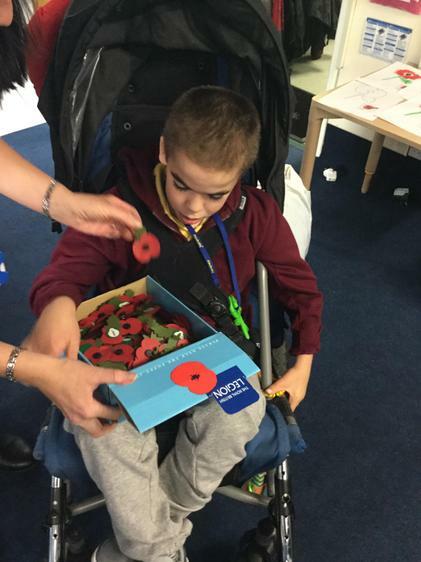 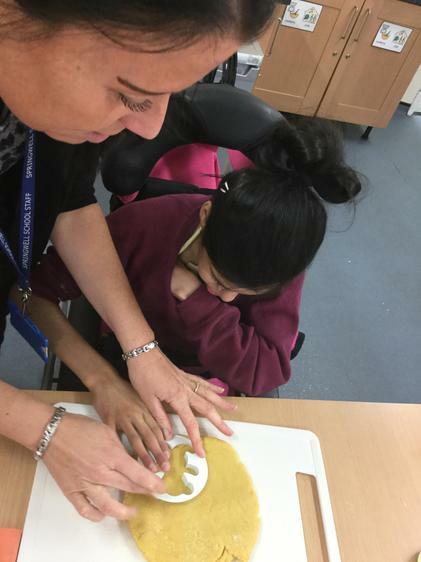 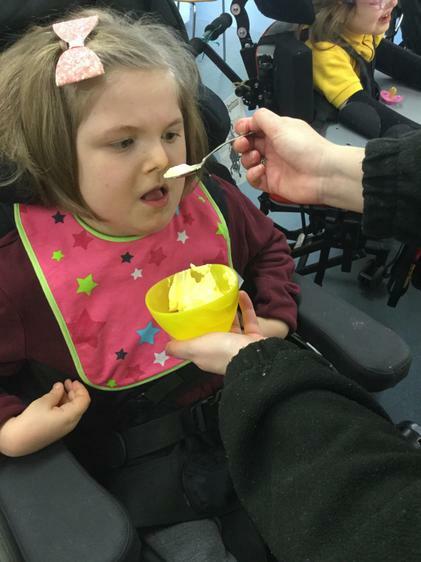 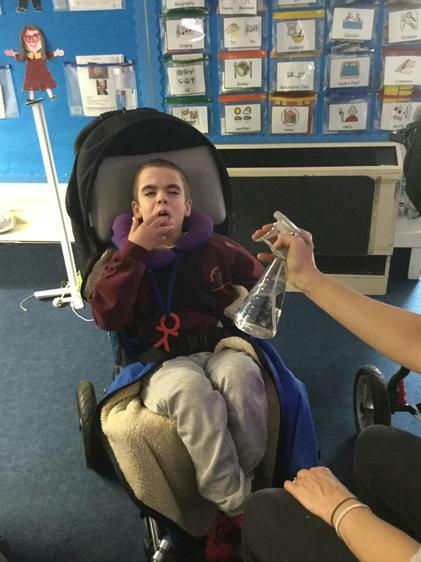 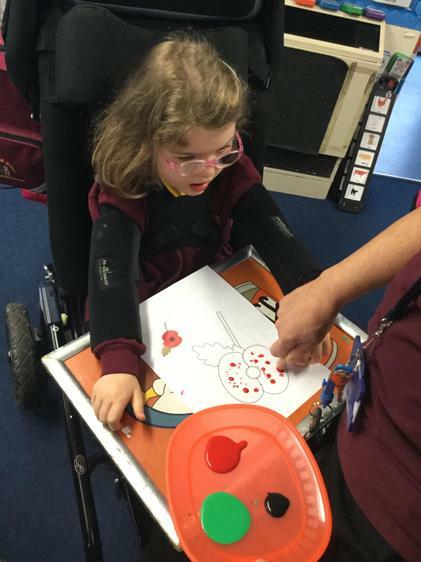 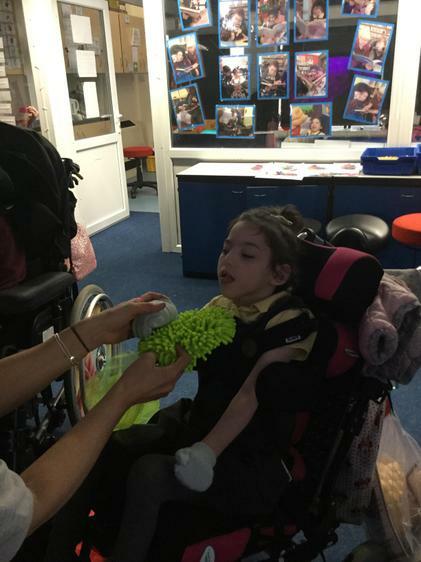 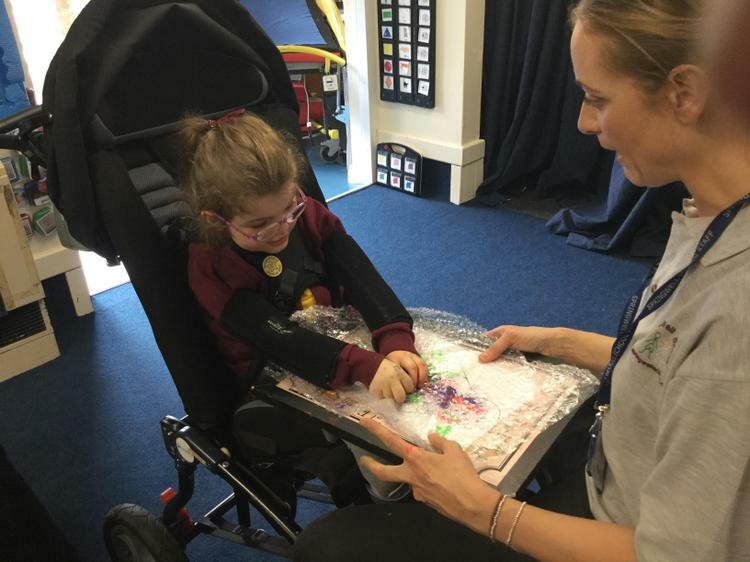 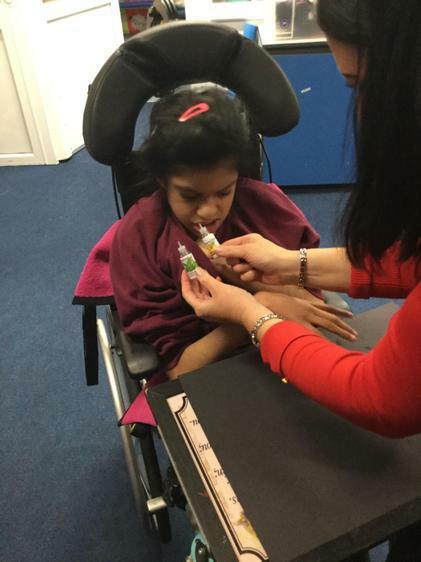 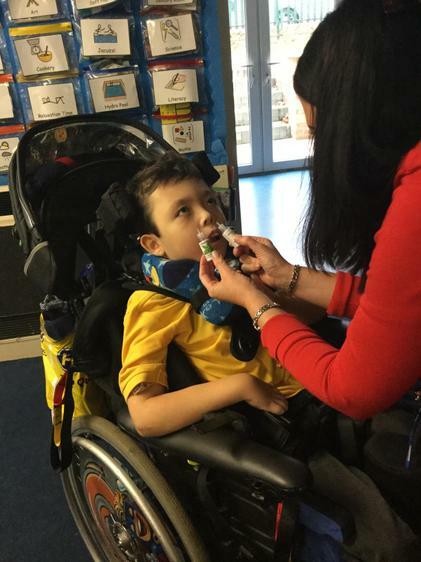 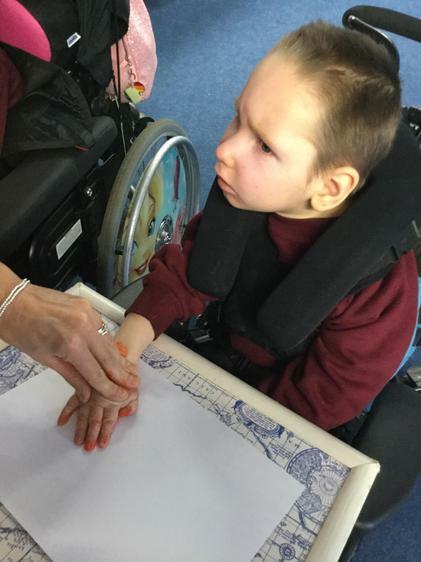 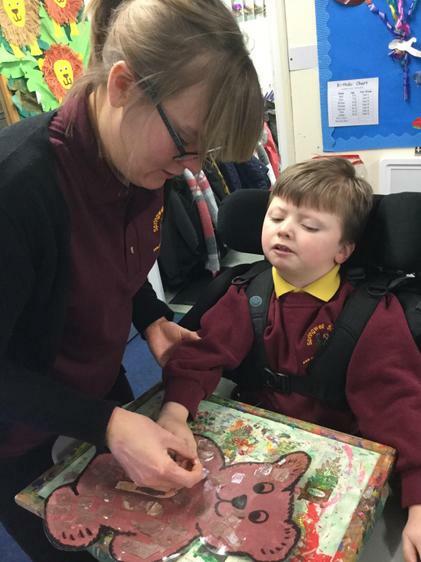 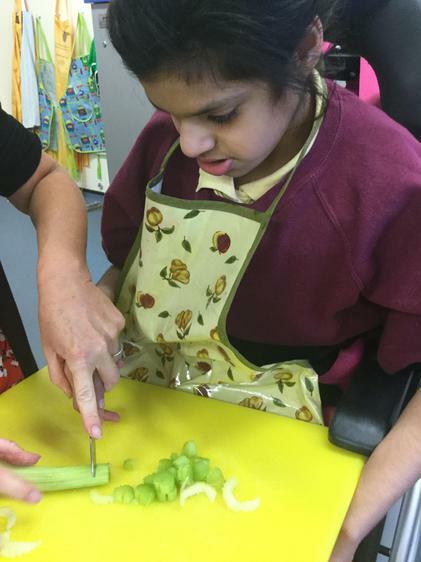 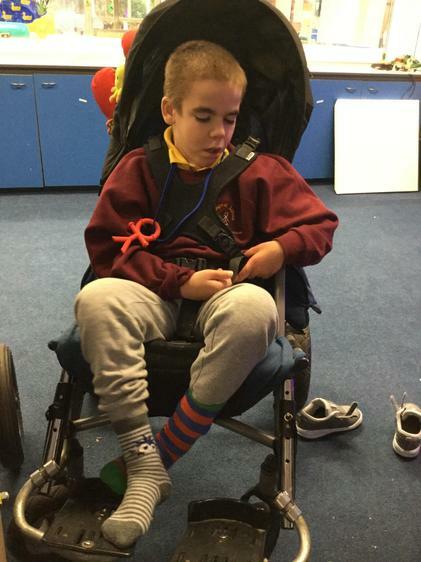 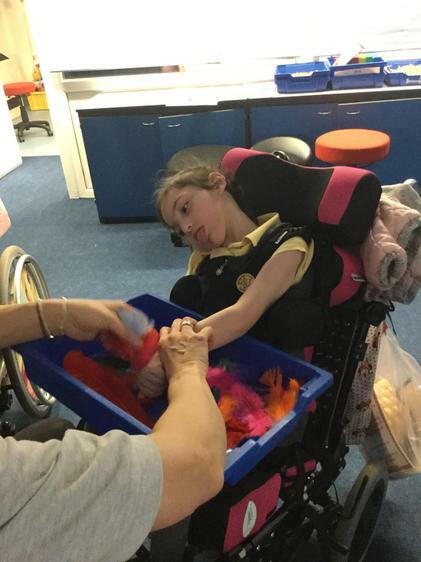 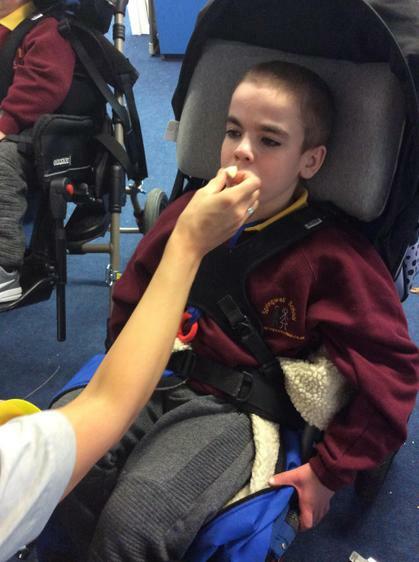 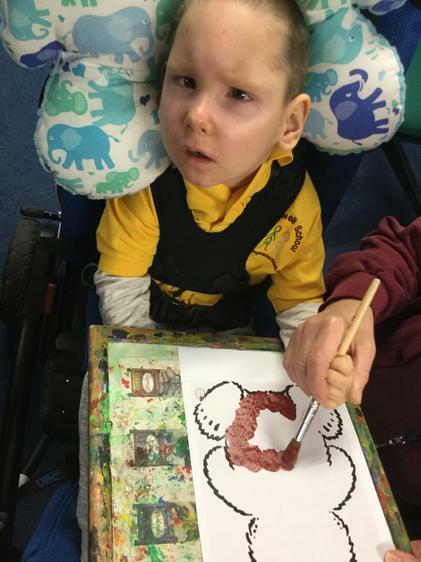 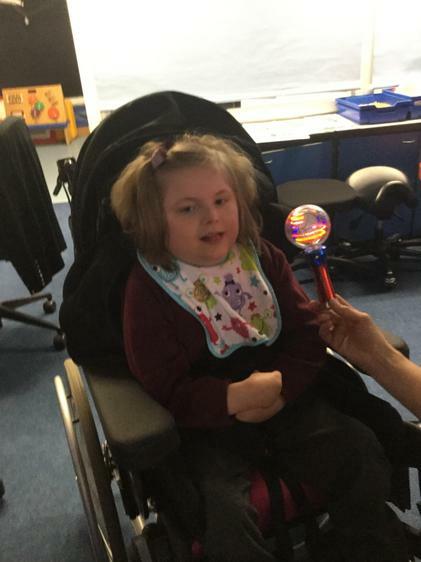 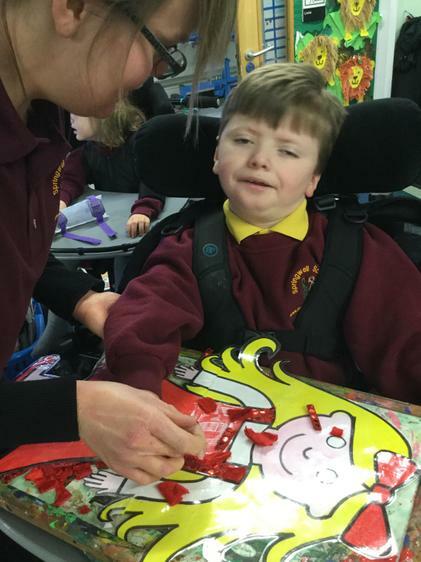 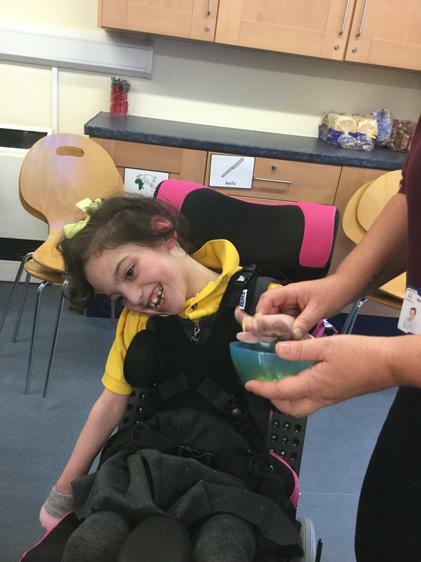 Pupils following the sparkle curriculum require a high level of adult support, both for their learning needs and also for their personal care. 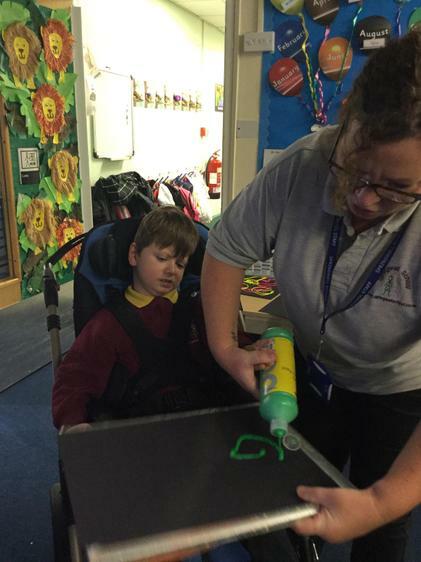 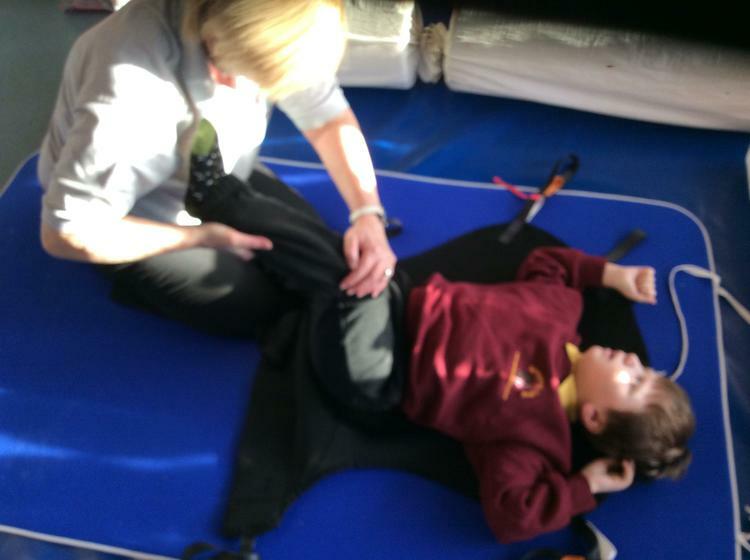 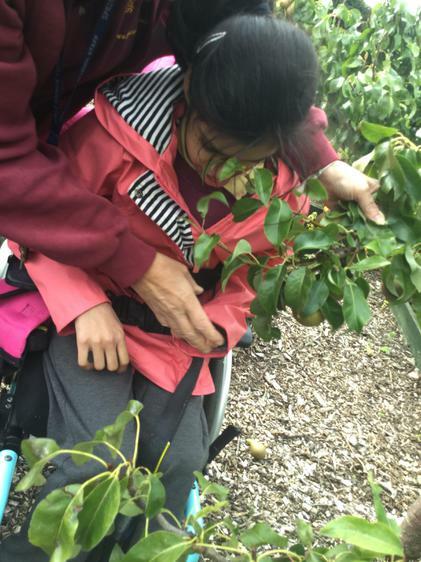 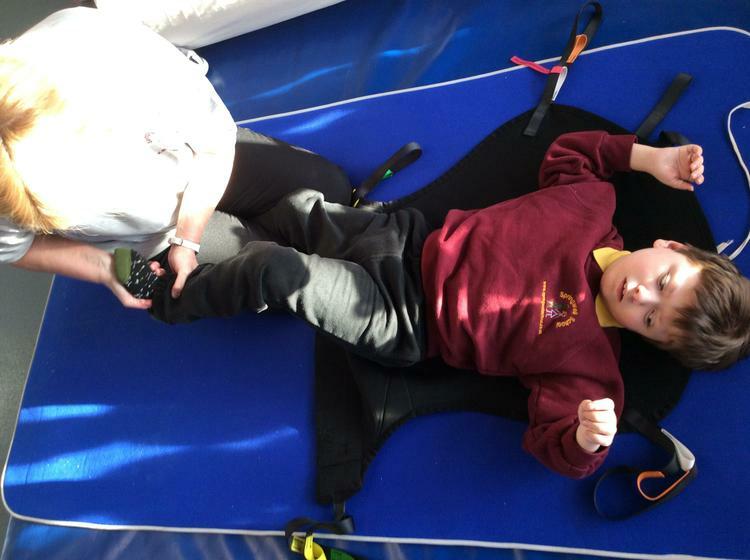 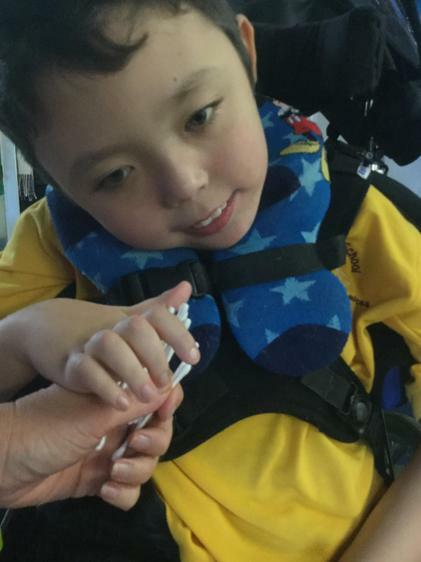 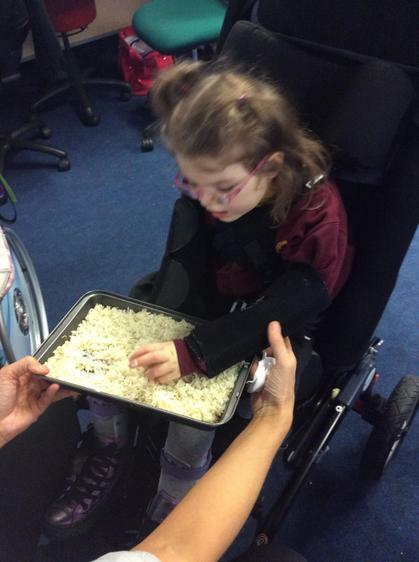 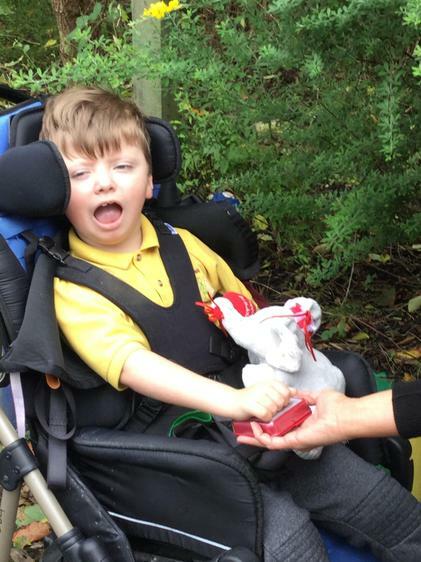 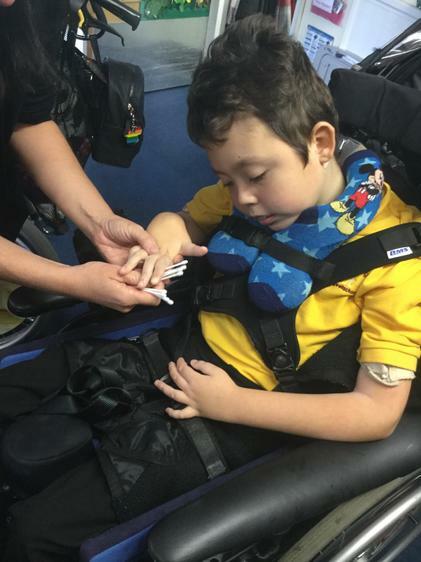 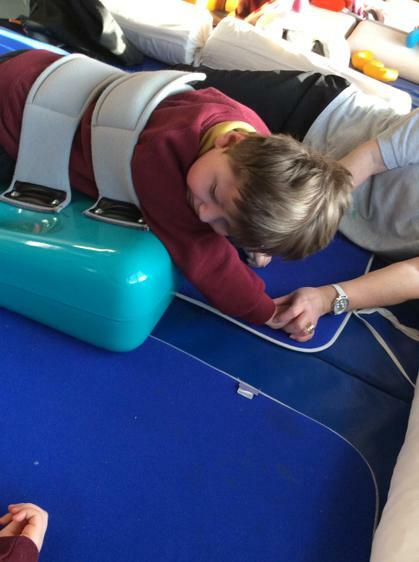 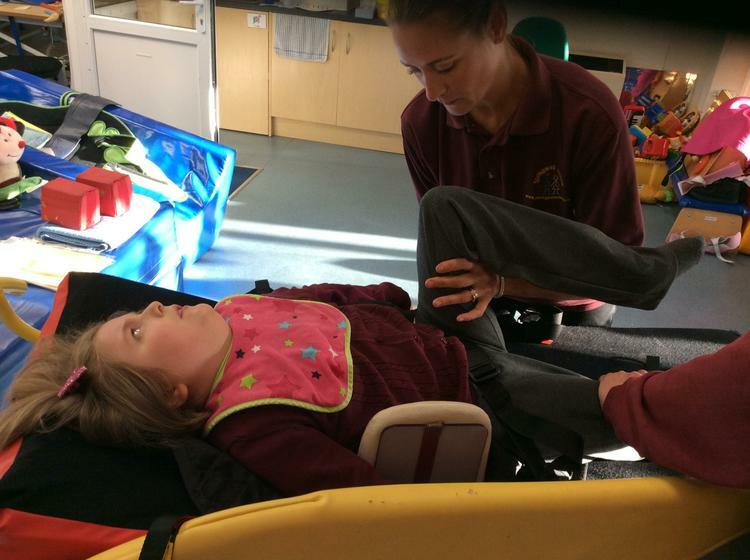 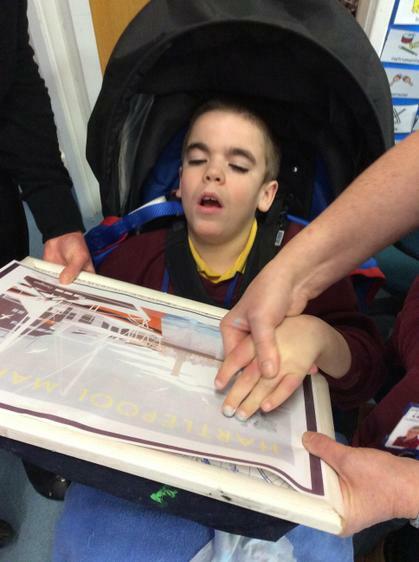 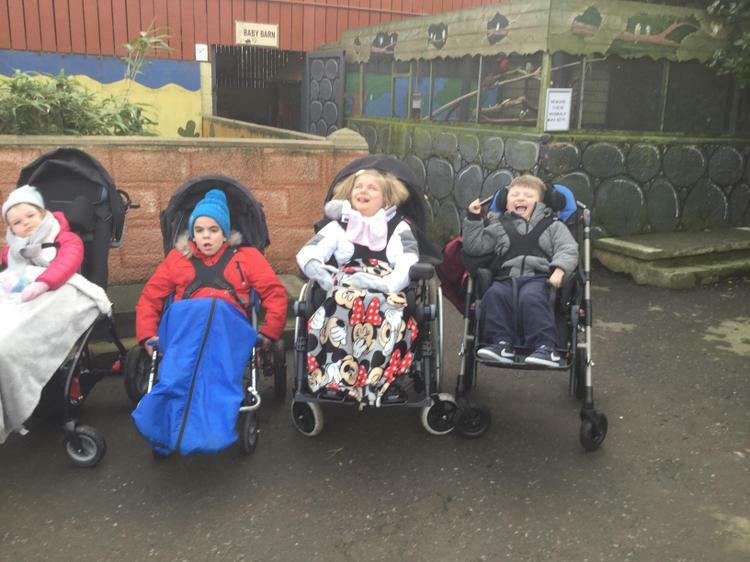 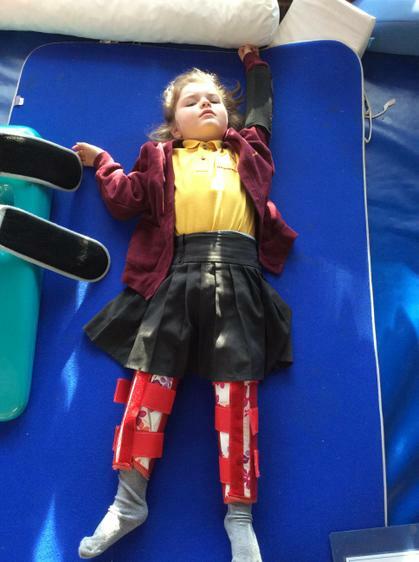 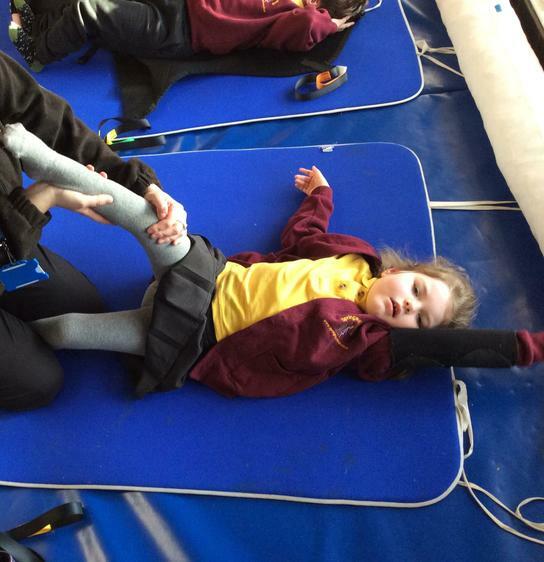 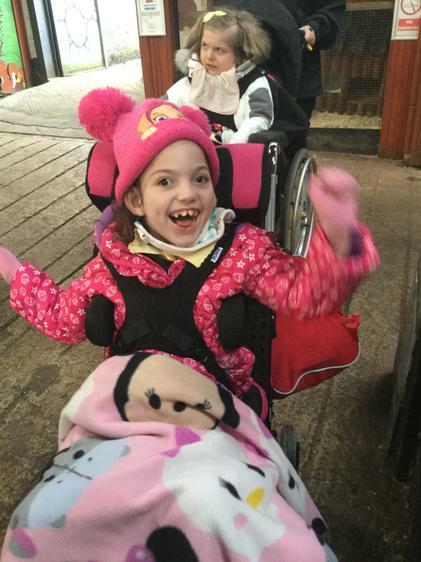 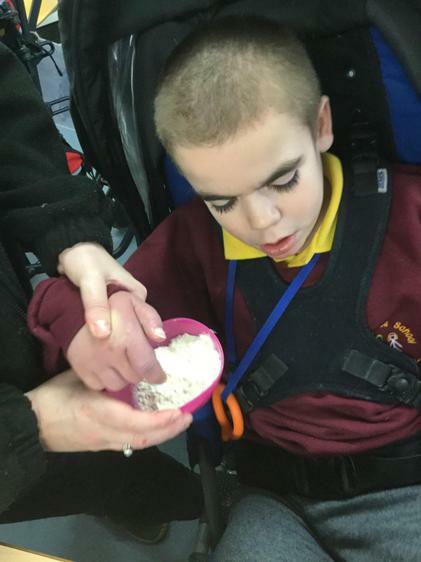 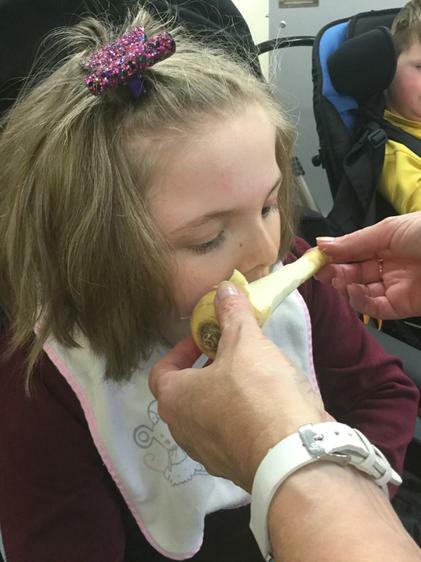 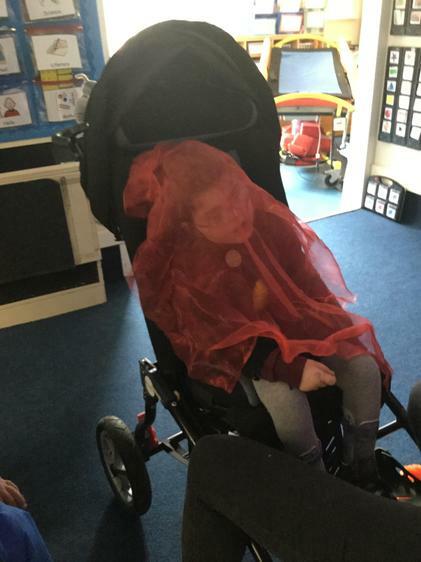 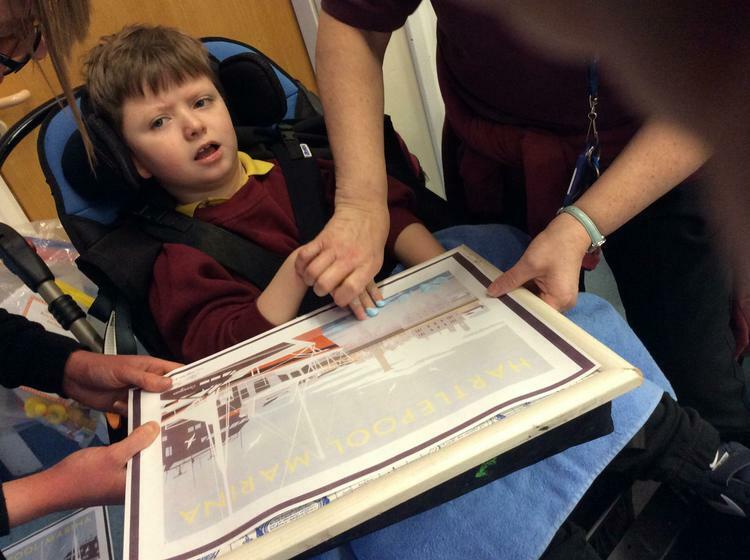 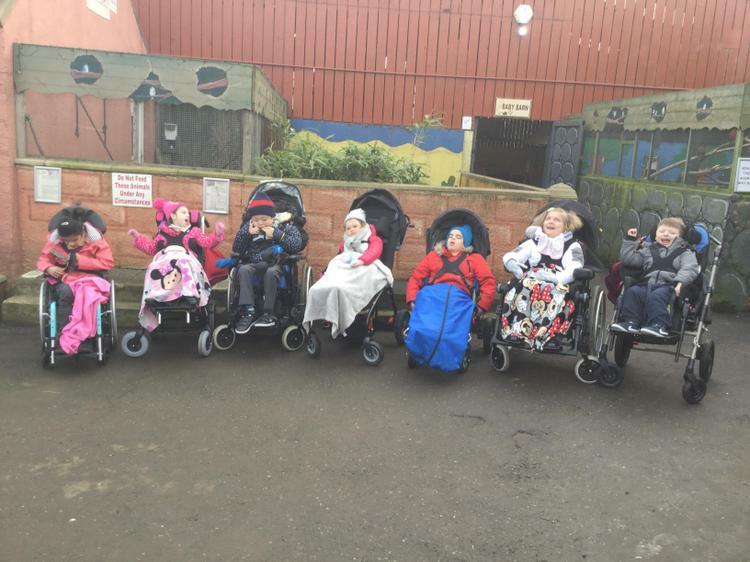 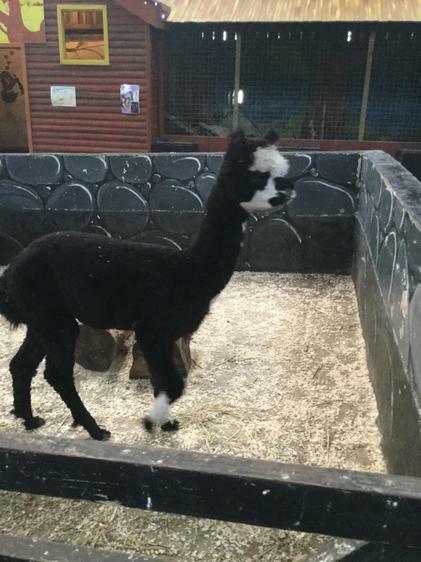 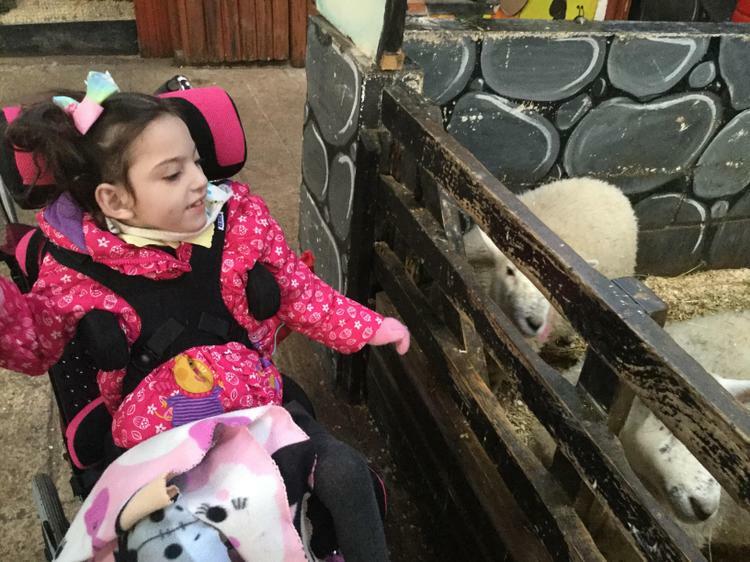 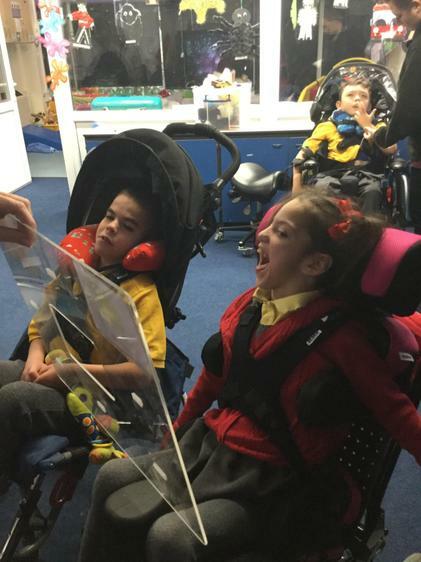 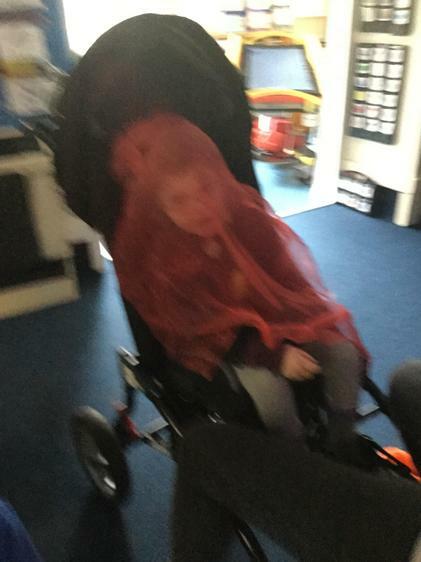 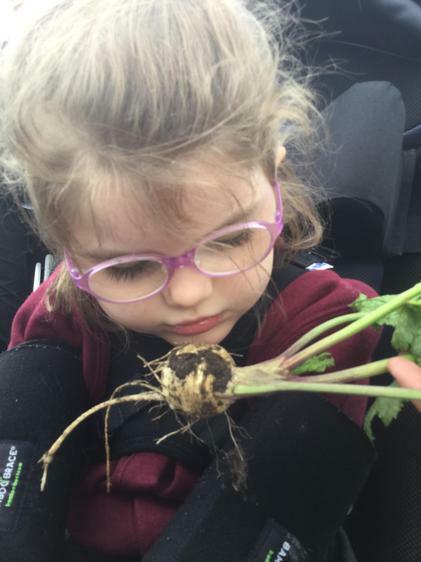 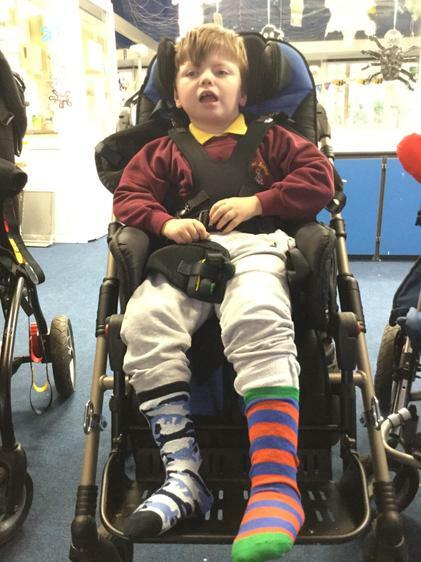 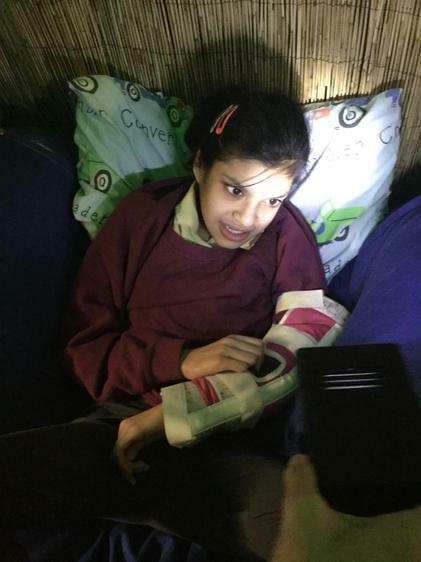 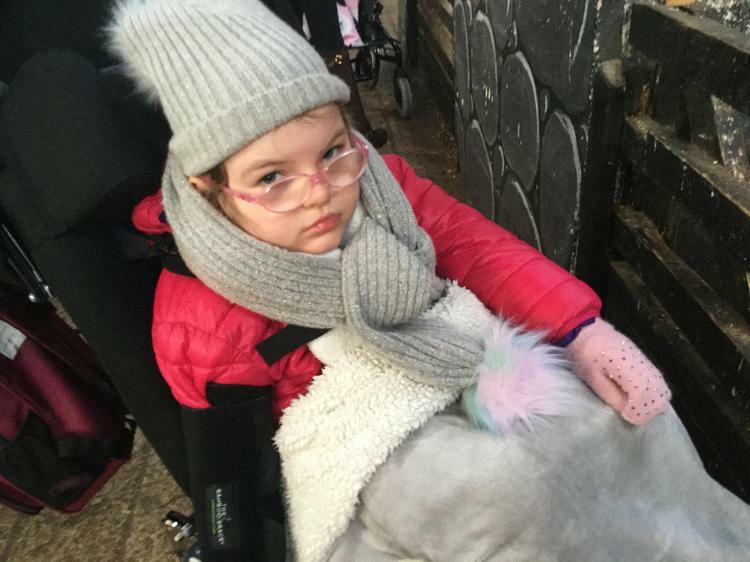 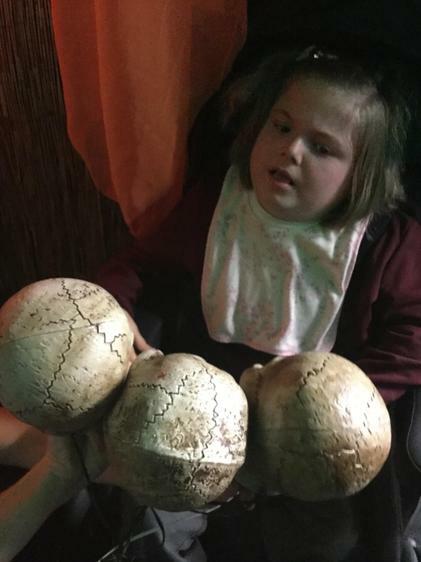 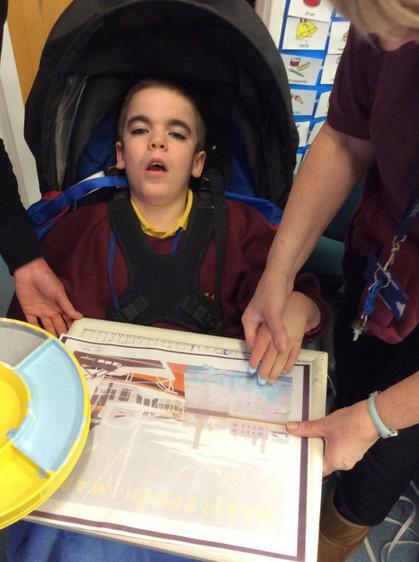 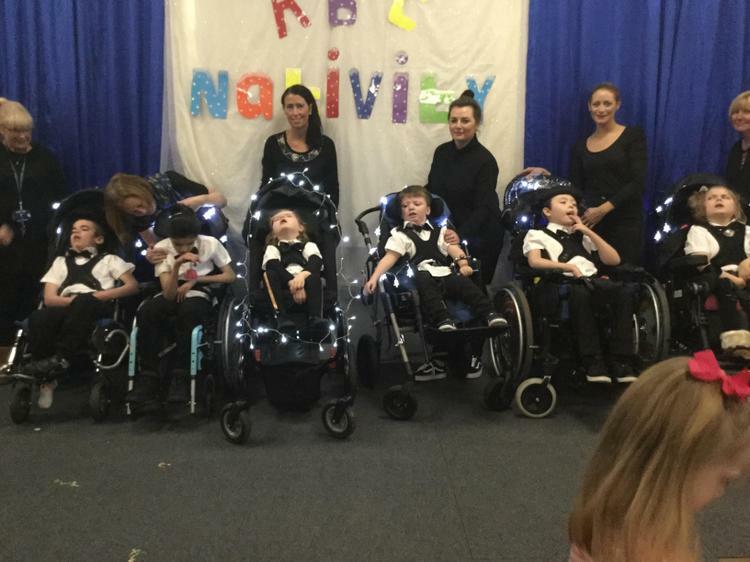 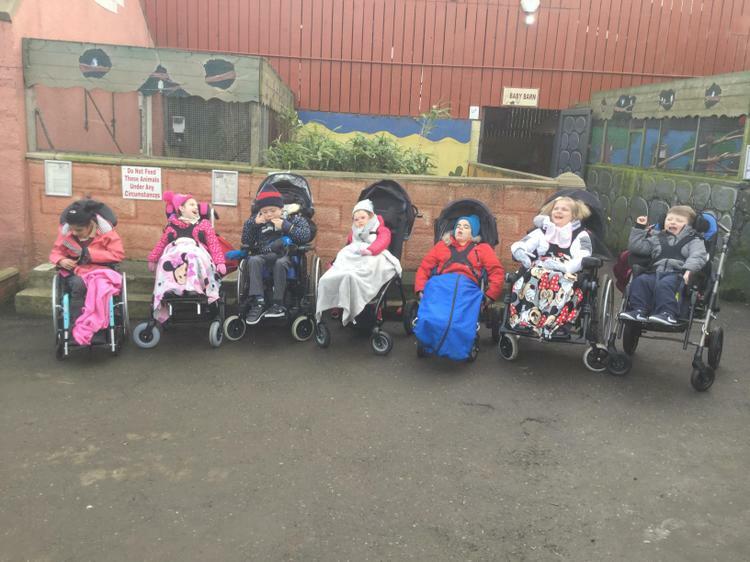 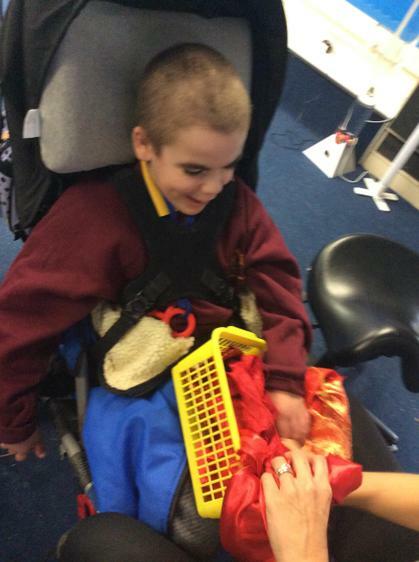 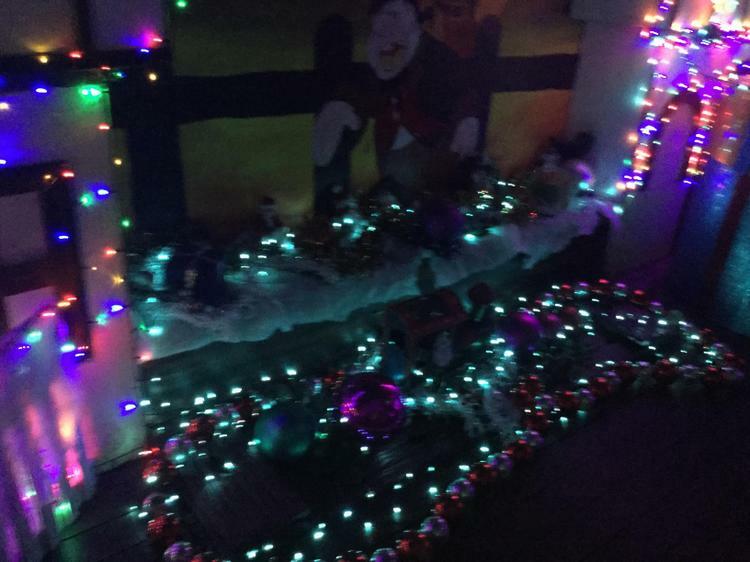 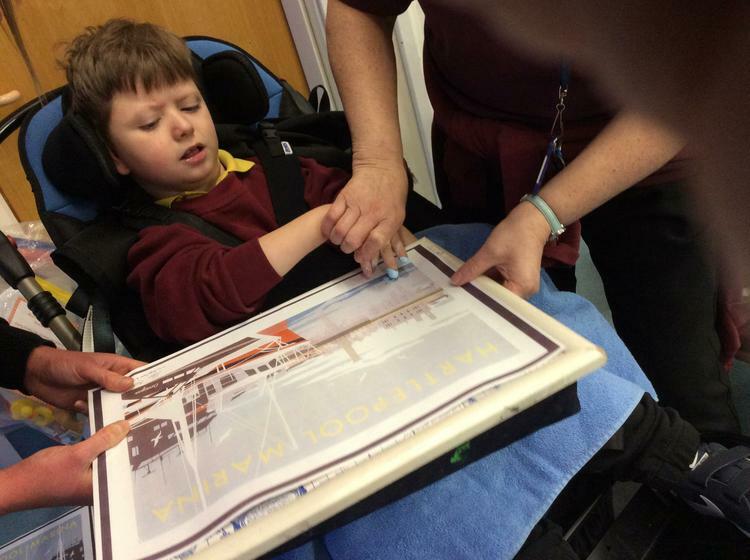 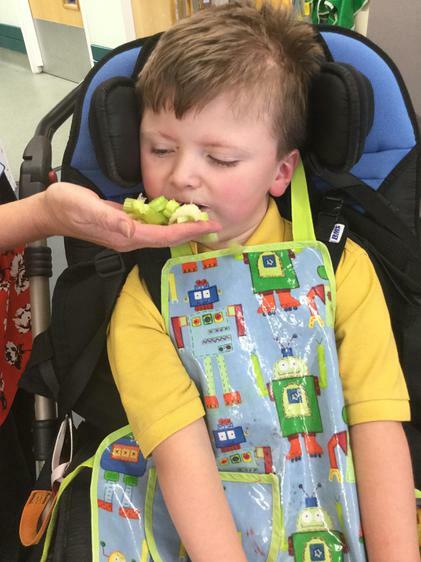 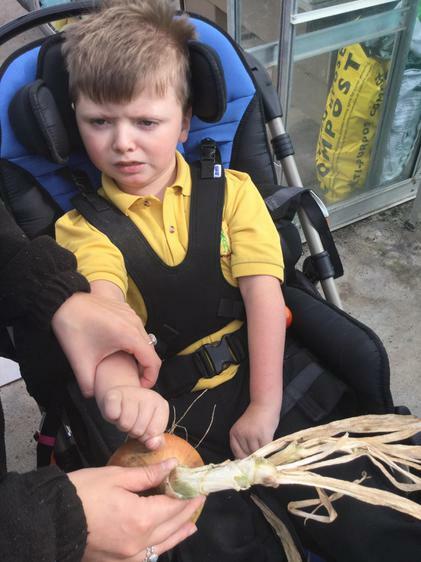 They need sensory stimulation and a curriculum broken down into very small achievable steps. 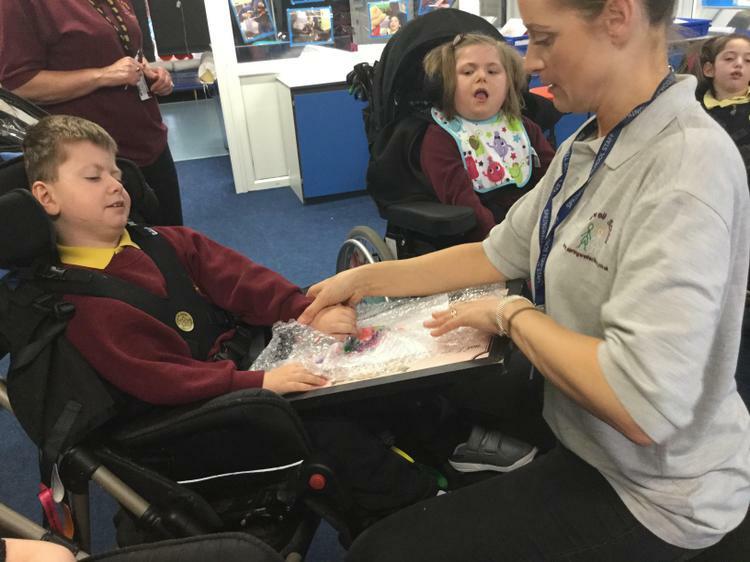 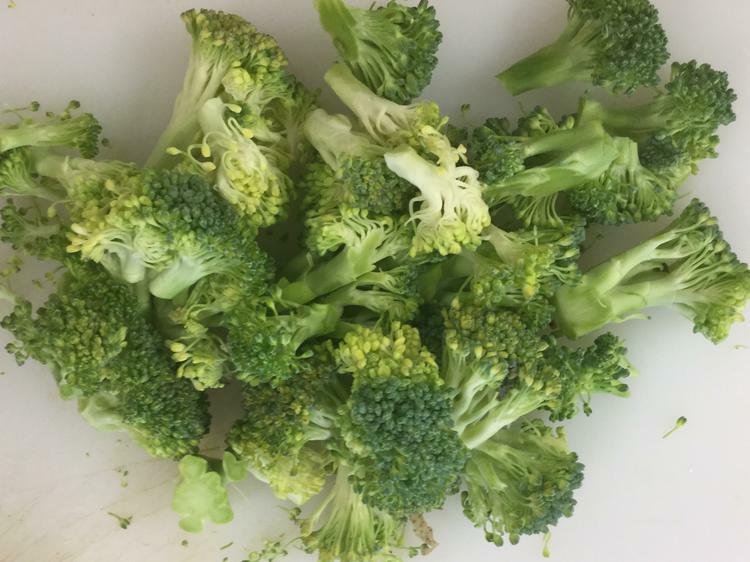 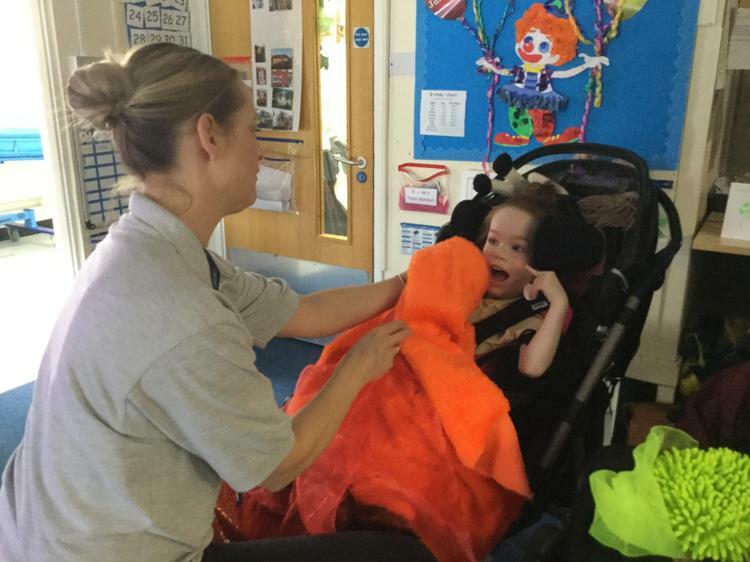 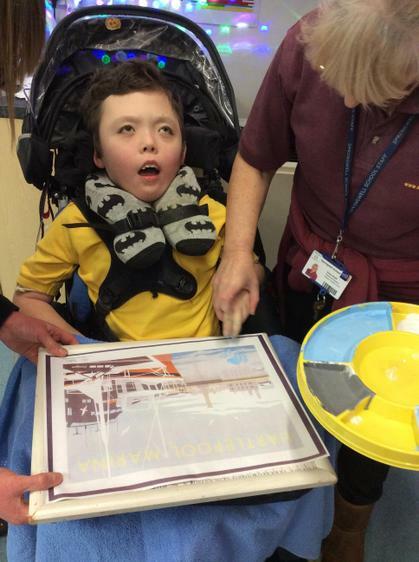 This new curriculum will predominantly be made up of sensory themed learning and therapeutic activities. 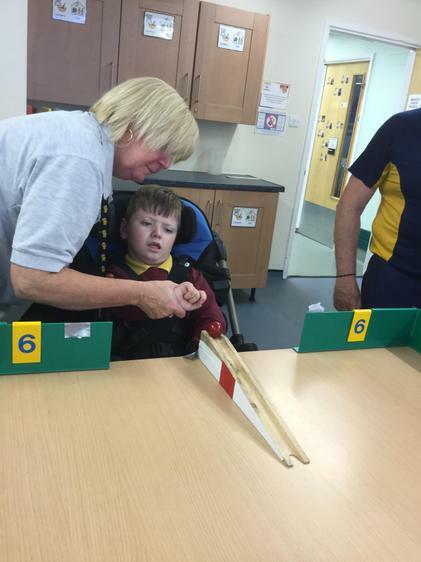 More time will be spent on more beneficial, holistic and individualised activities e.g. 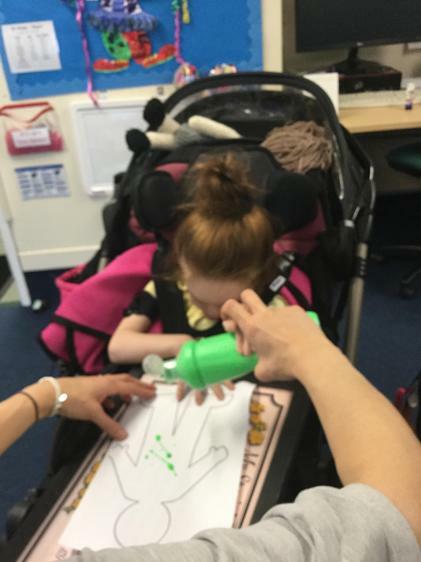 positioning in specialised equipment, visual stimulation, hand and finger work (exploration – sensory play), therapies, movement, relaxation, Tac Pac, story massage etc. 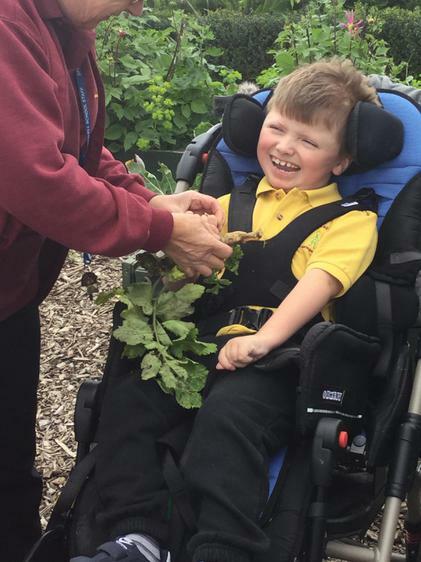 For more information on our new 'Sparkle Curriculum' please read this leaflet. 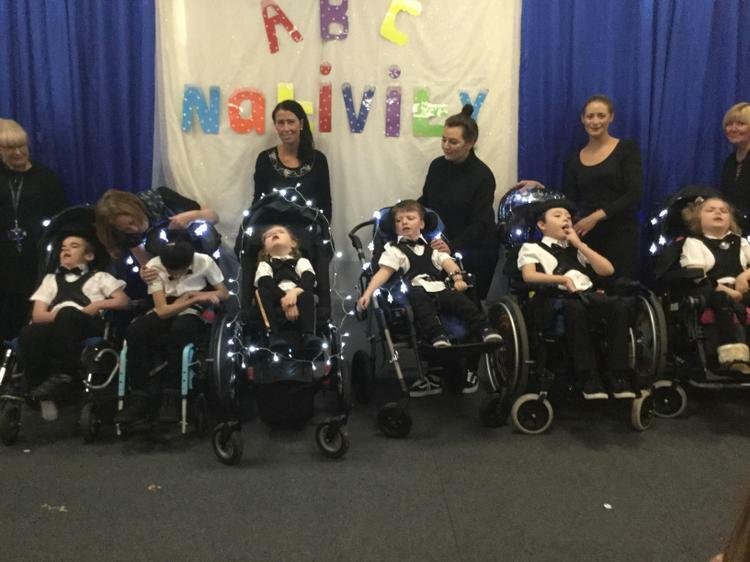 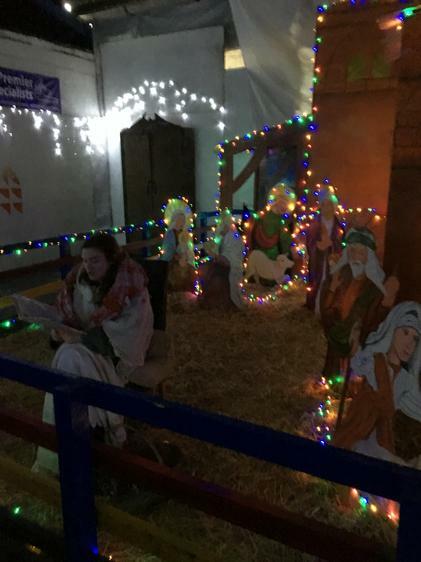 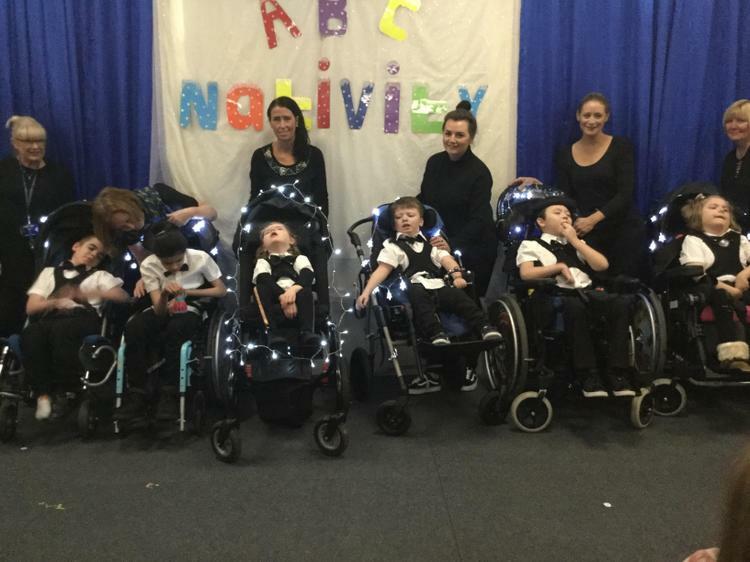 13.12.18 Our ABC Christmas Nativity! 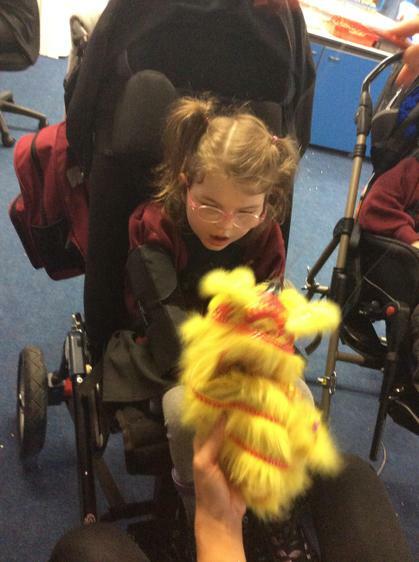 The children in Lion Class were all little super stars! 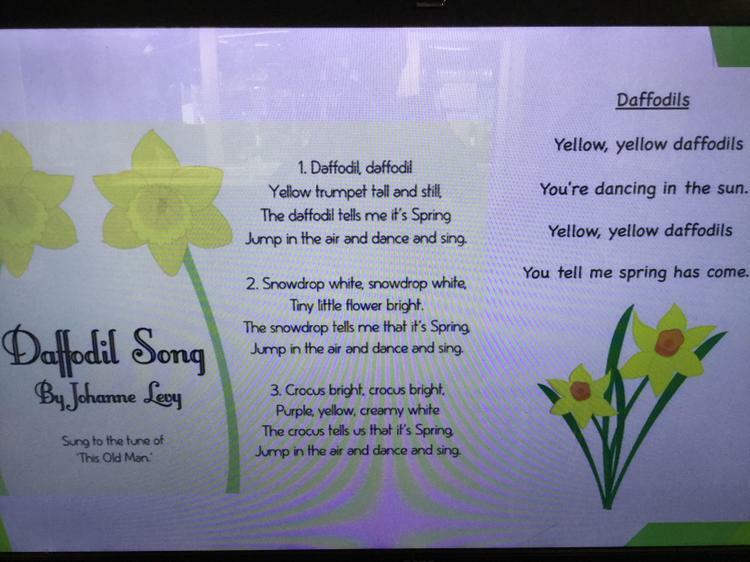 Our Class Nativity Song: "Sing with me!" 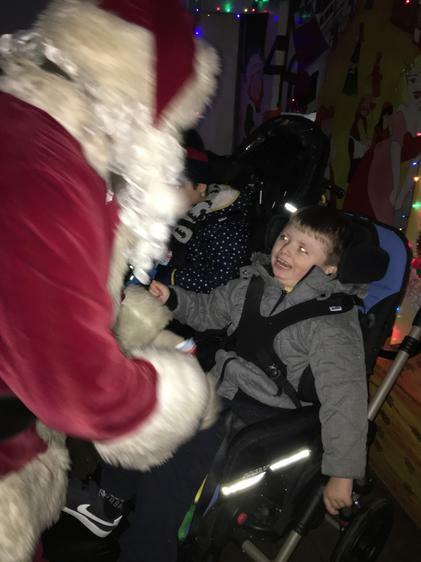 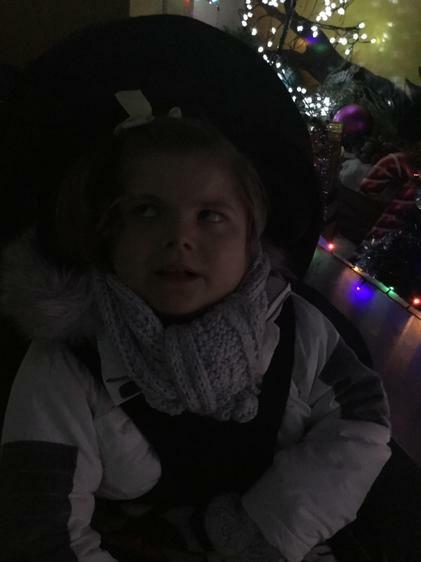 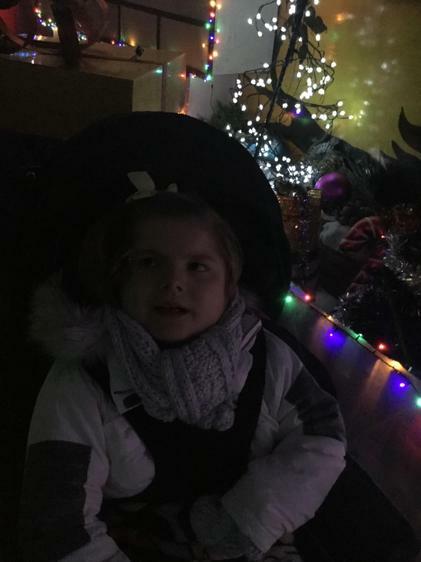 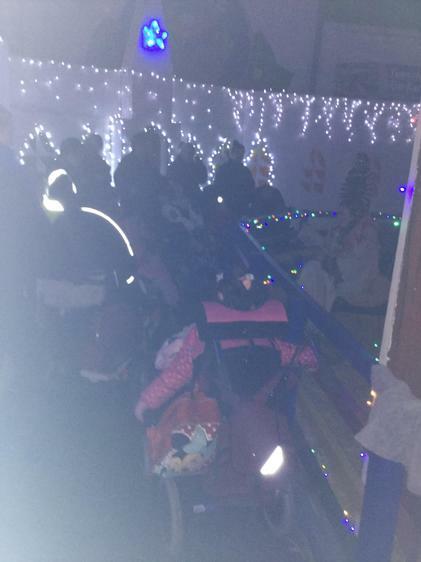 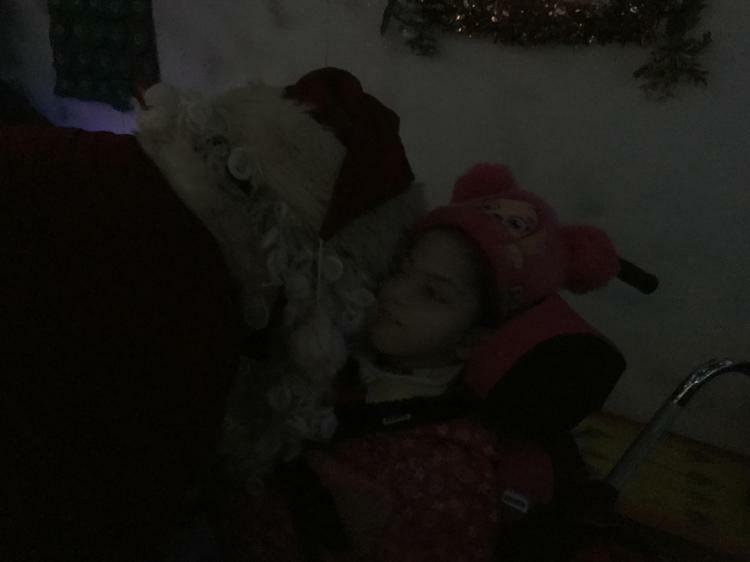 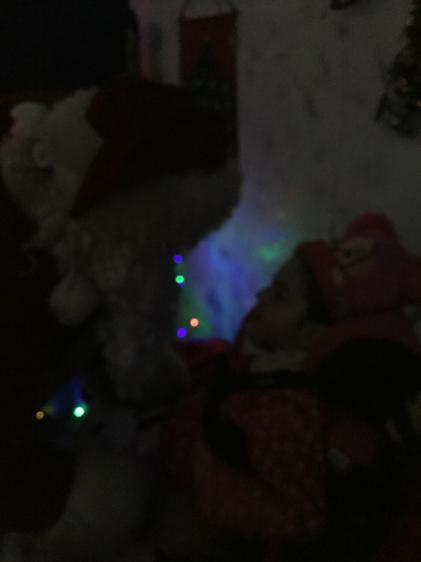 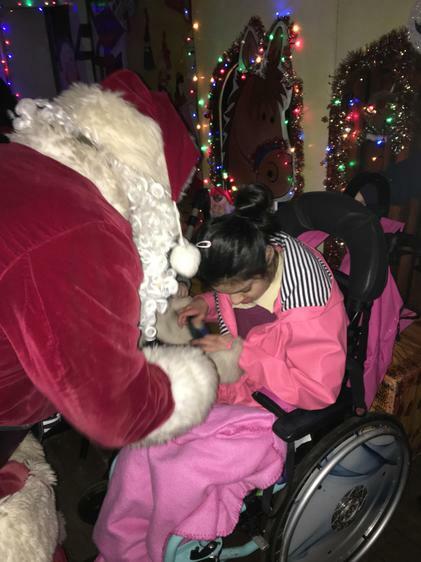 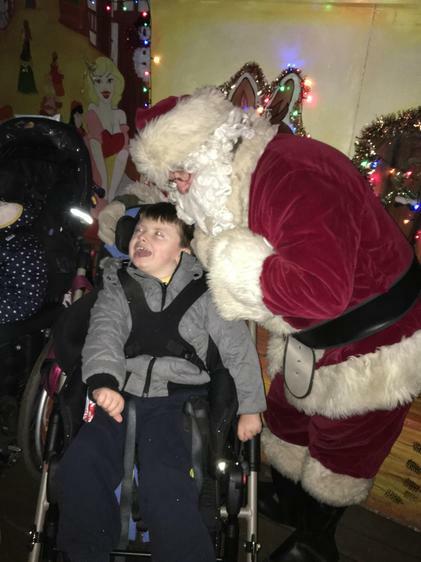 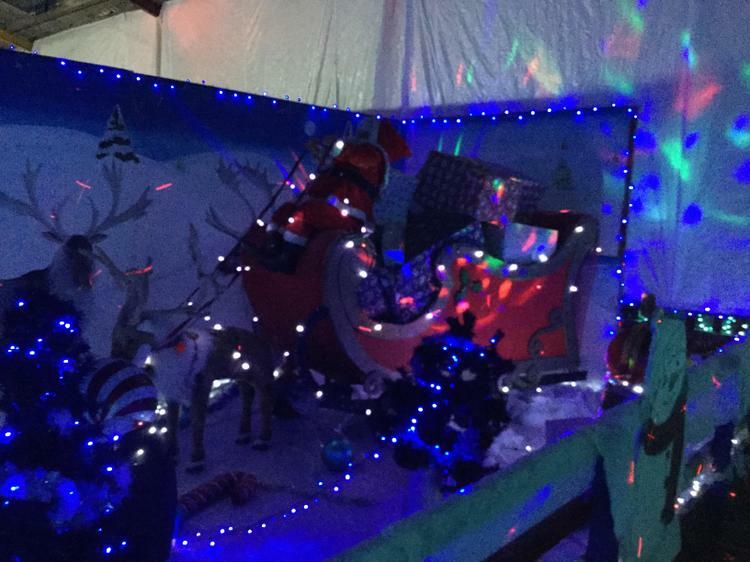 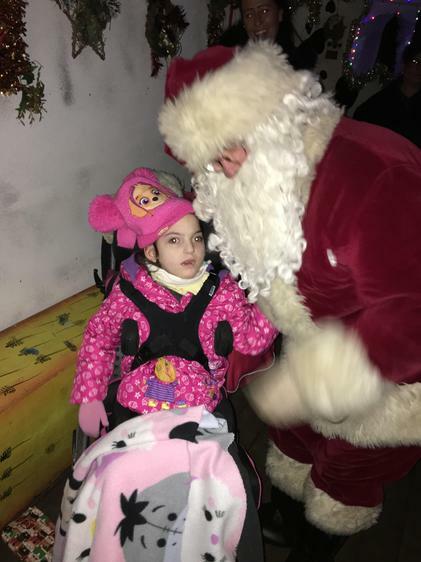 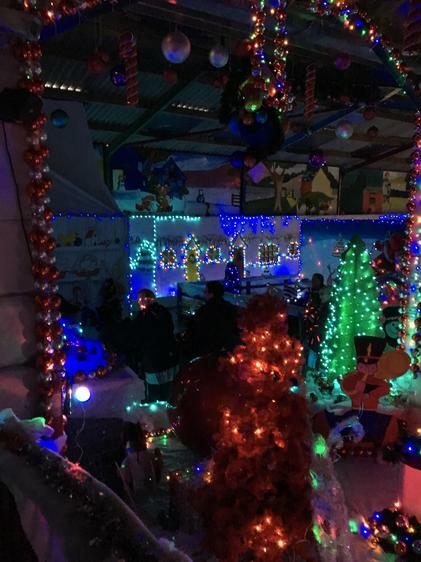 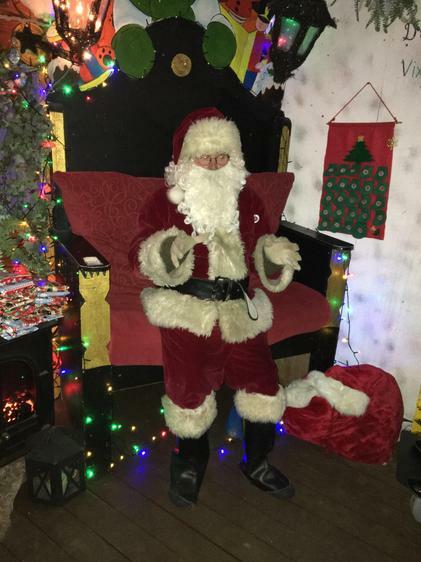 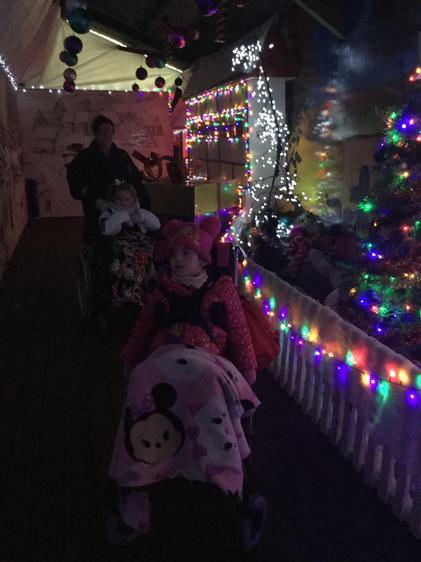 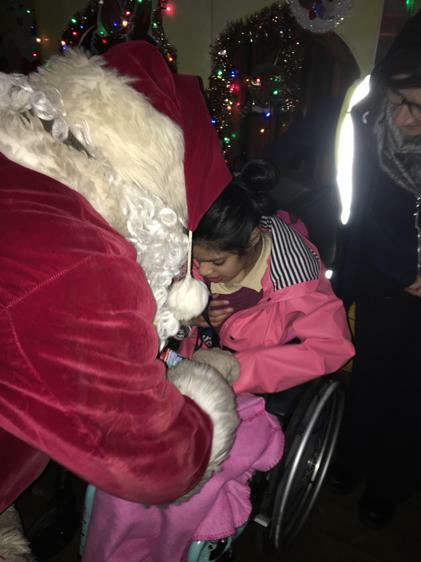 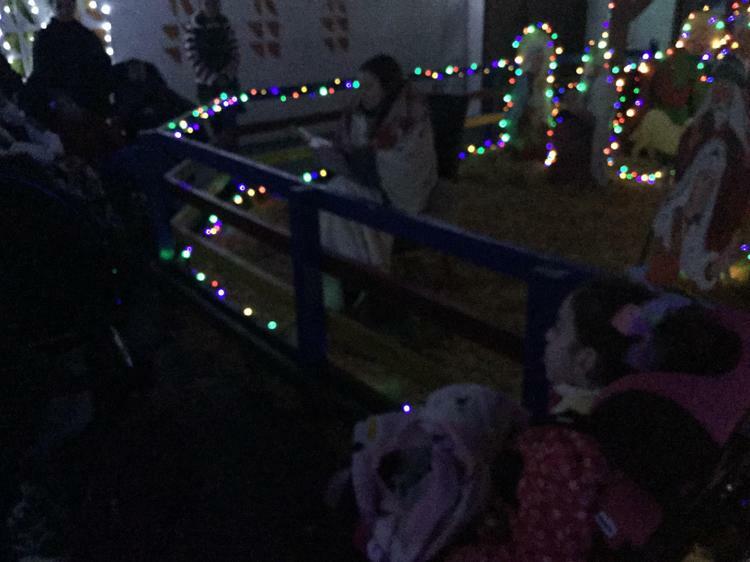 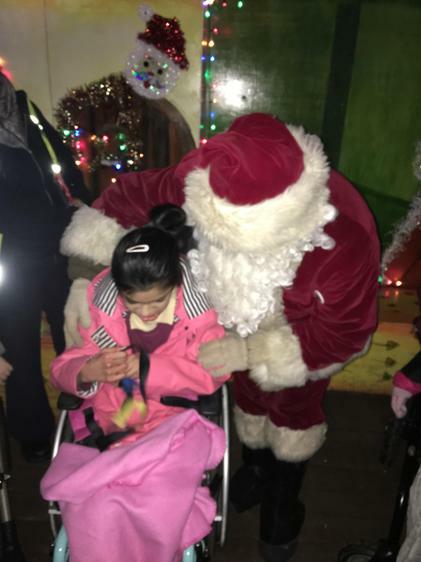 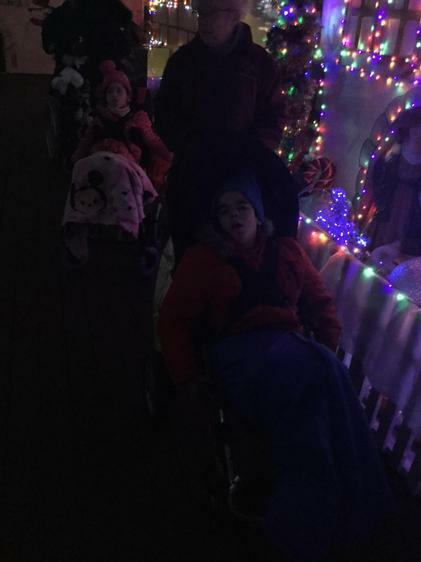 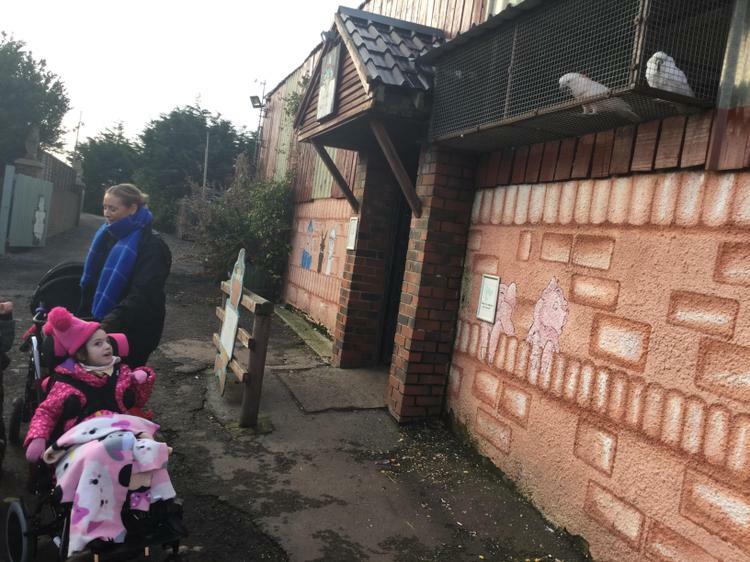 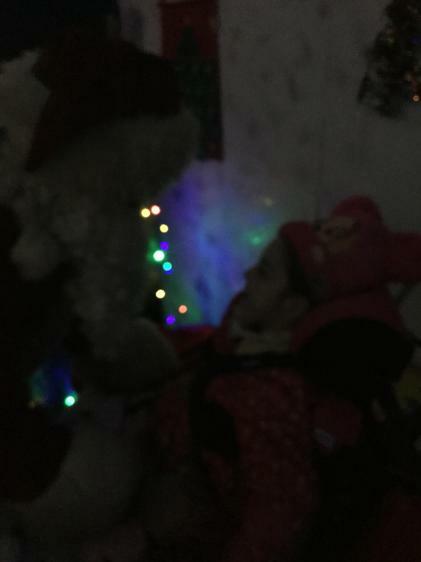 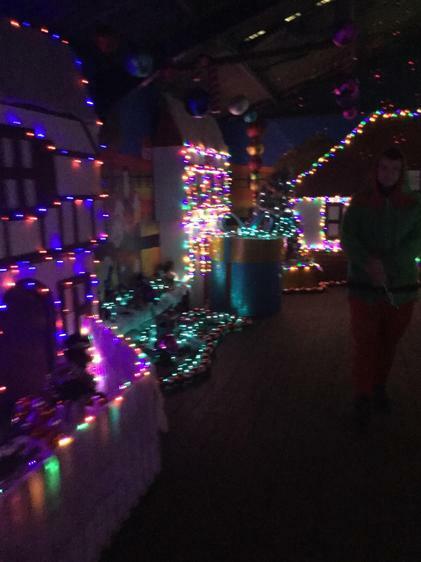 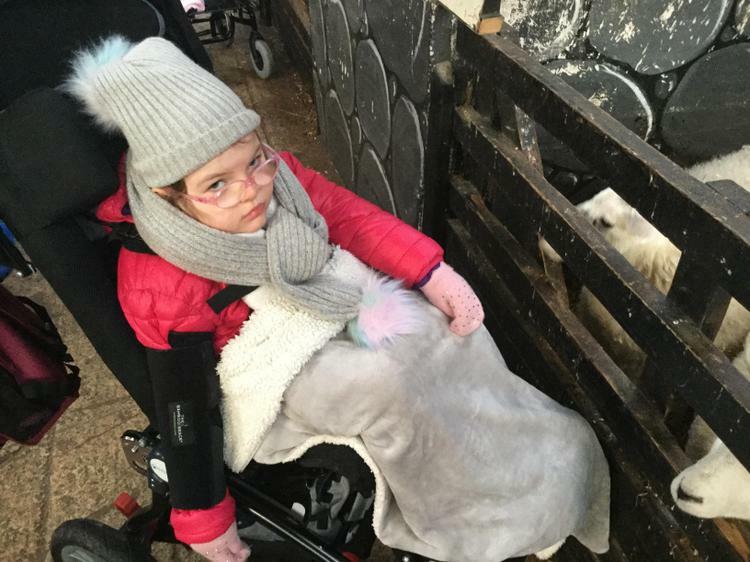 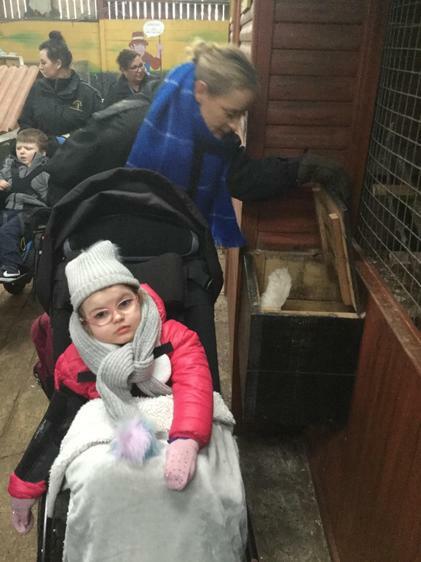 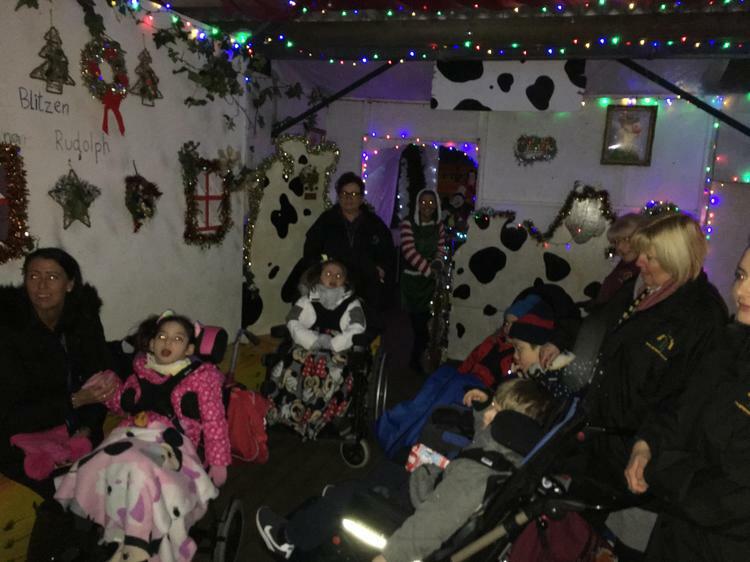 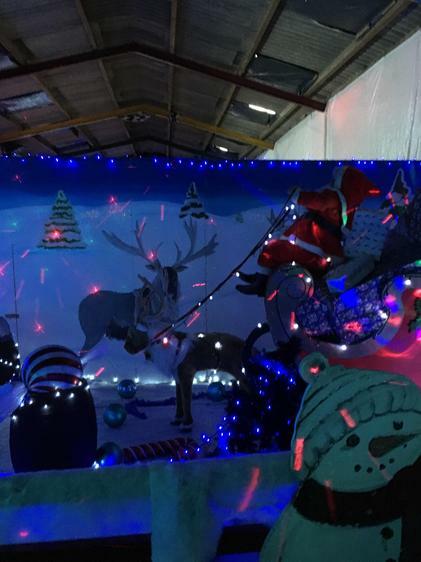 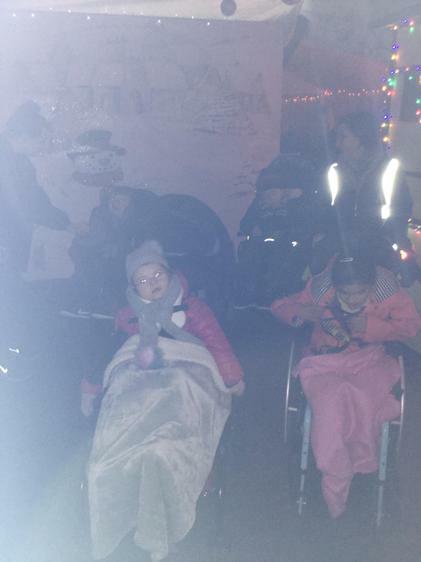 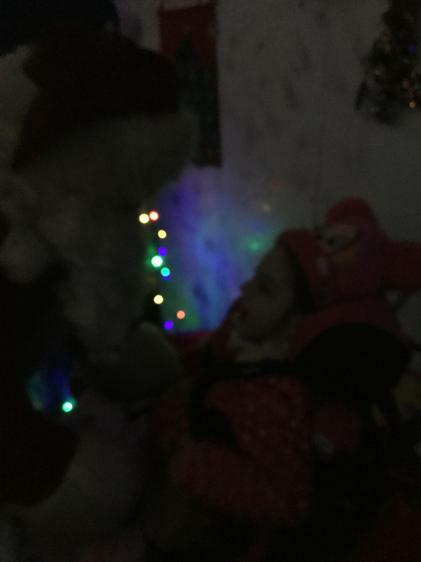 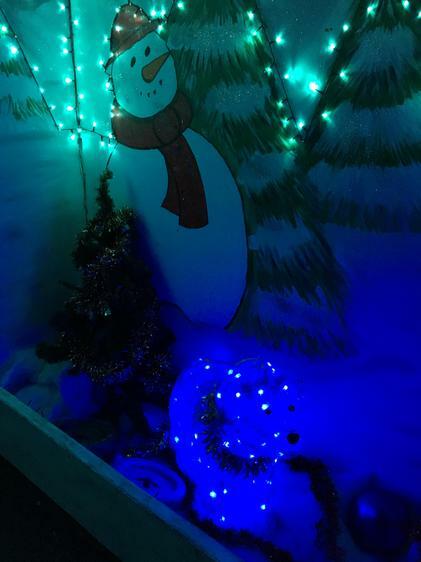 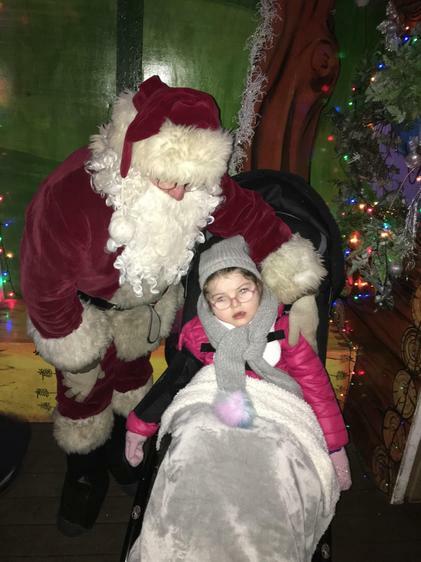 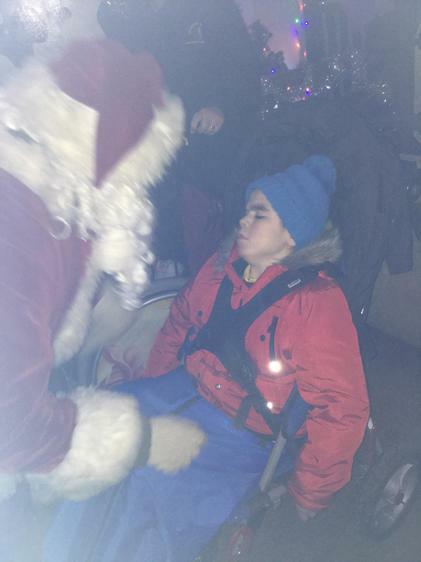 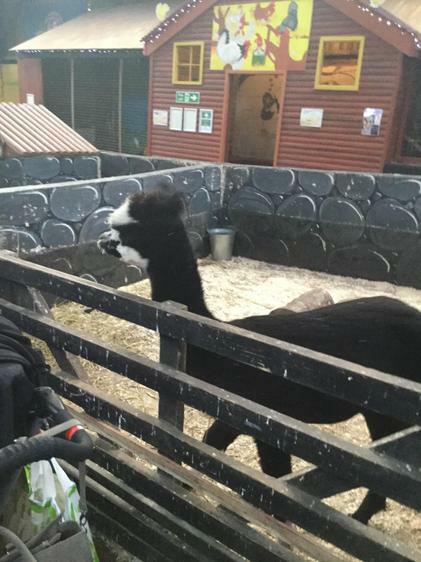 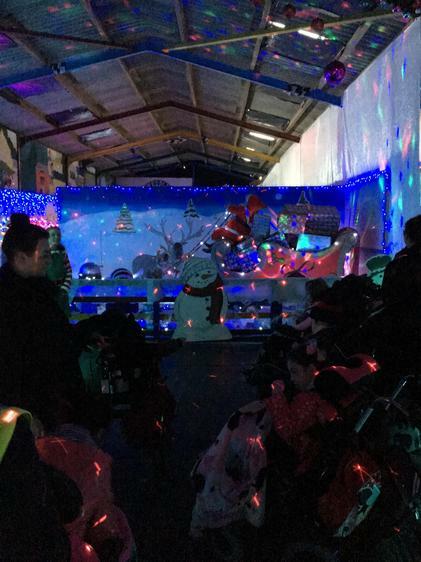 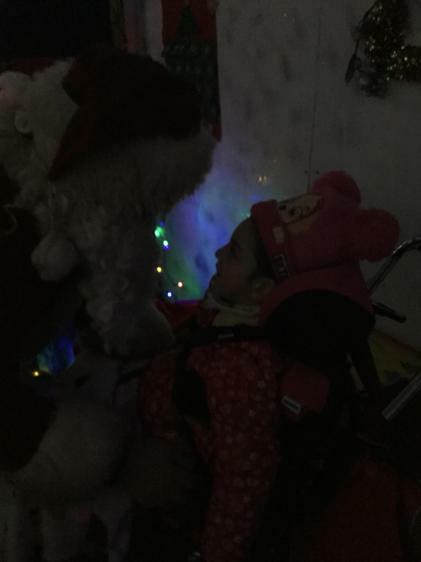 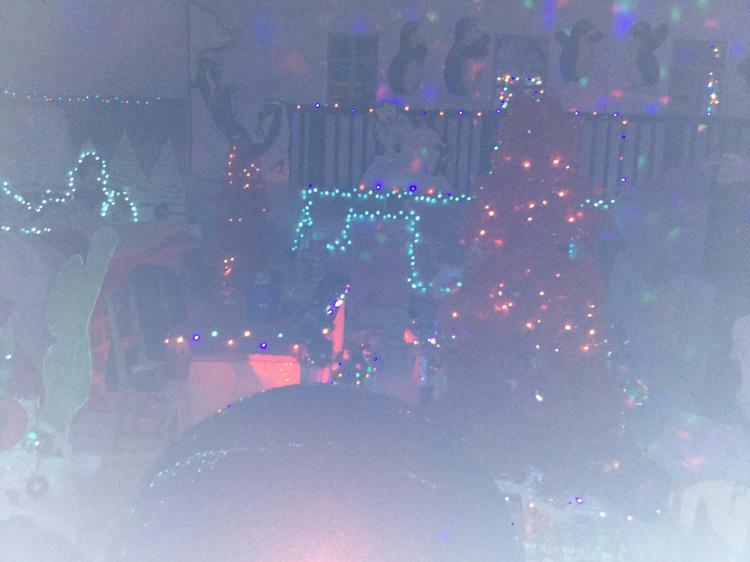 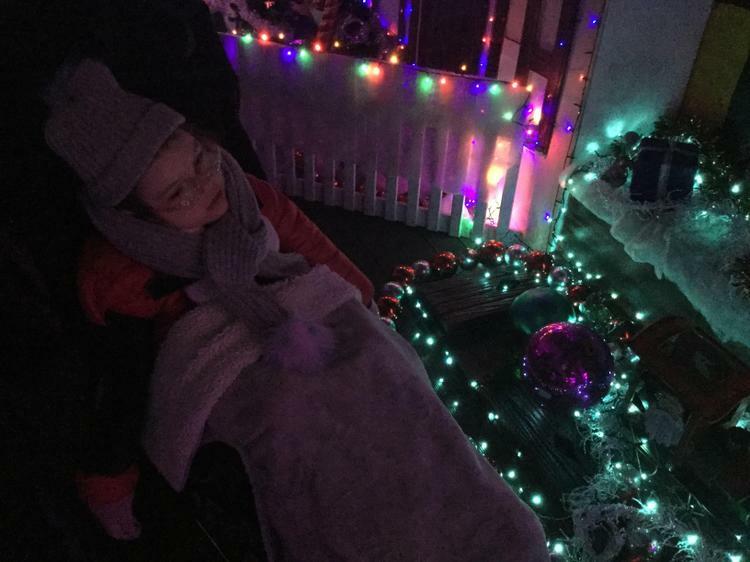 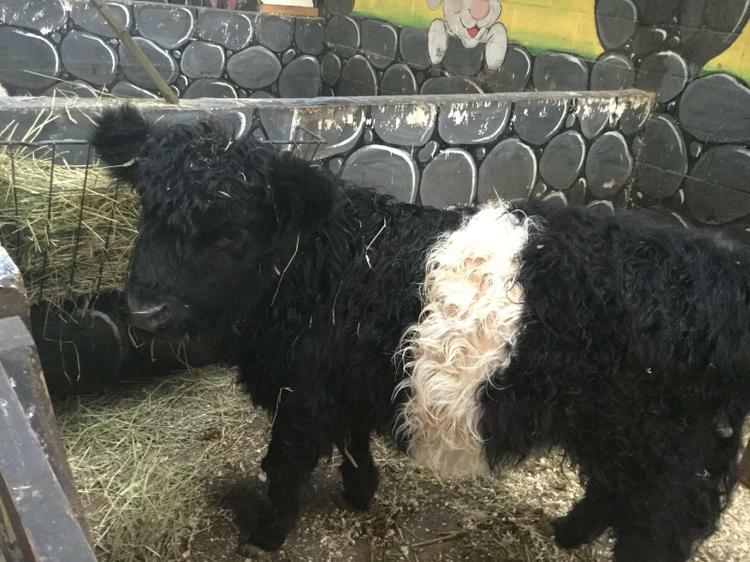 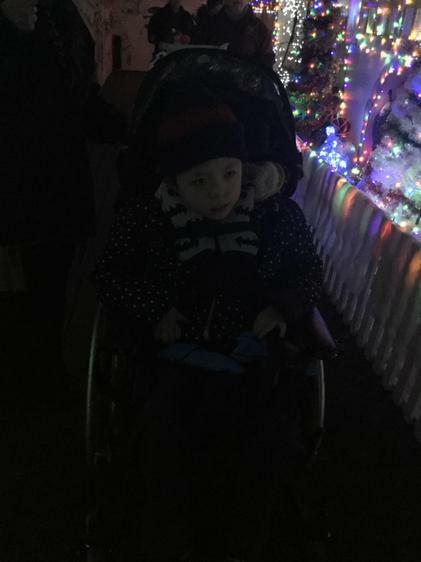 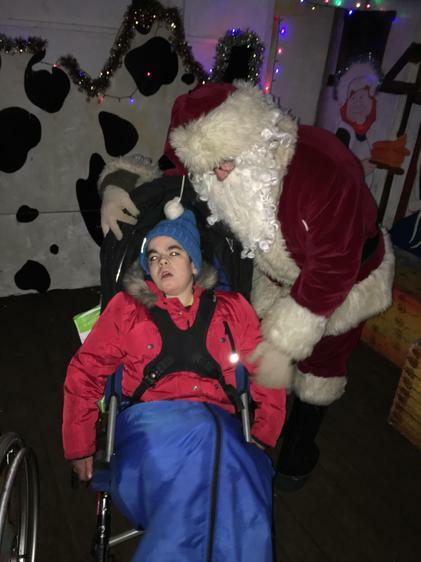 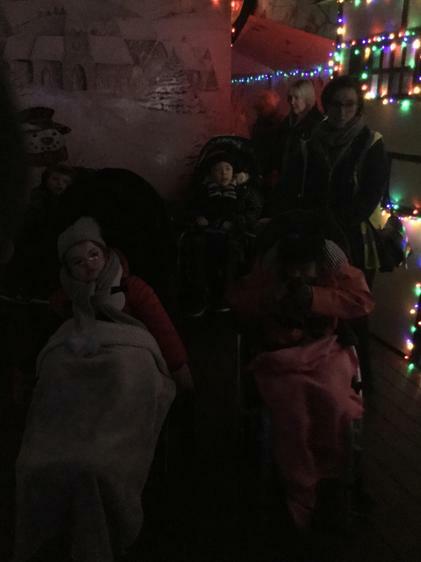 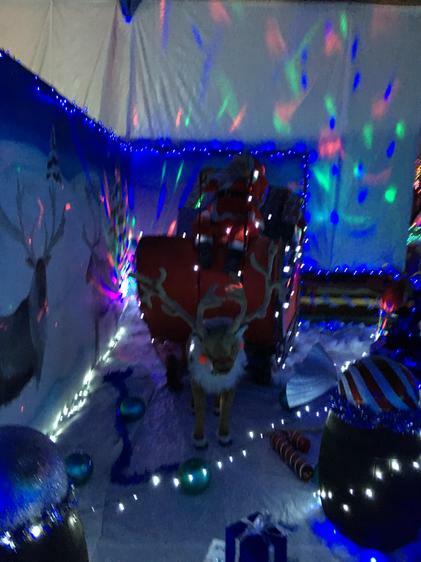 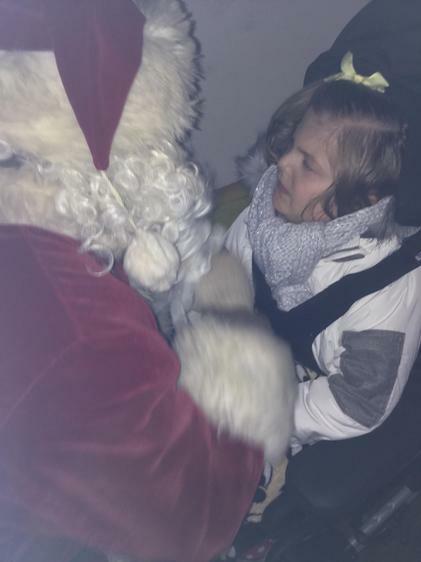 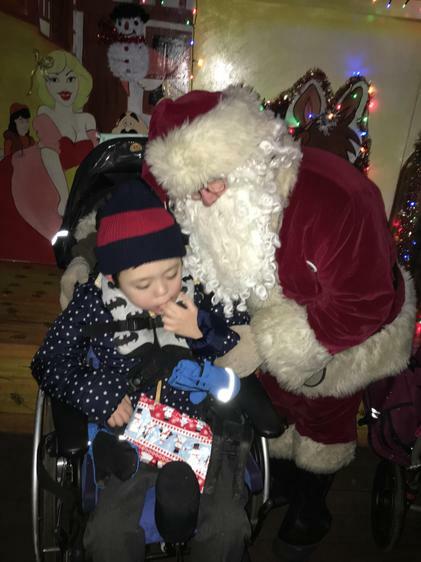 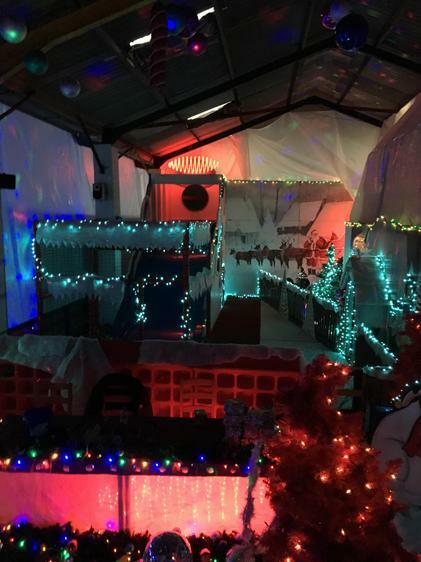 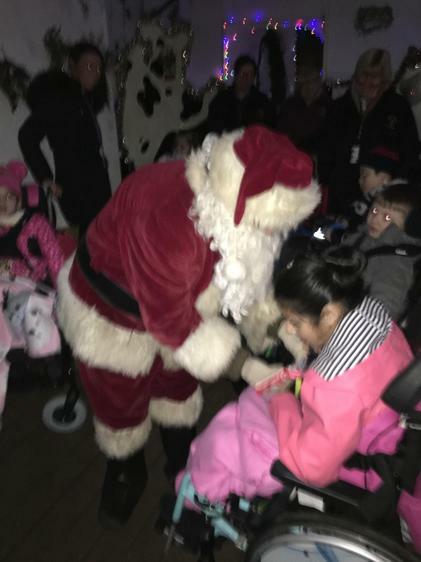 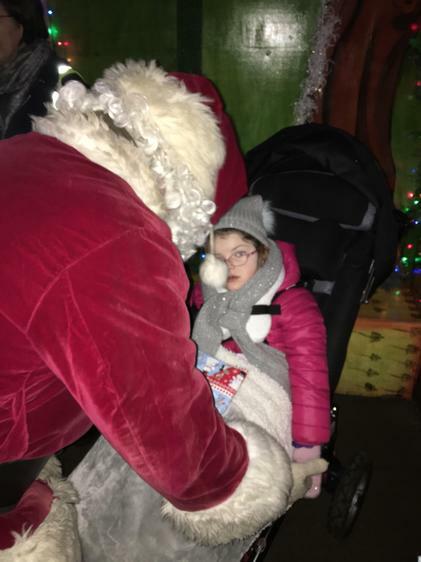 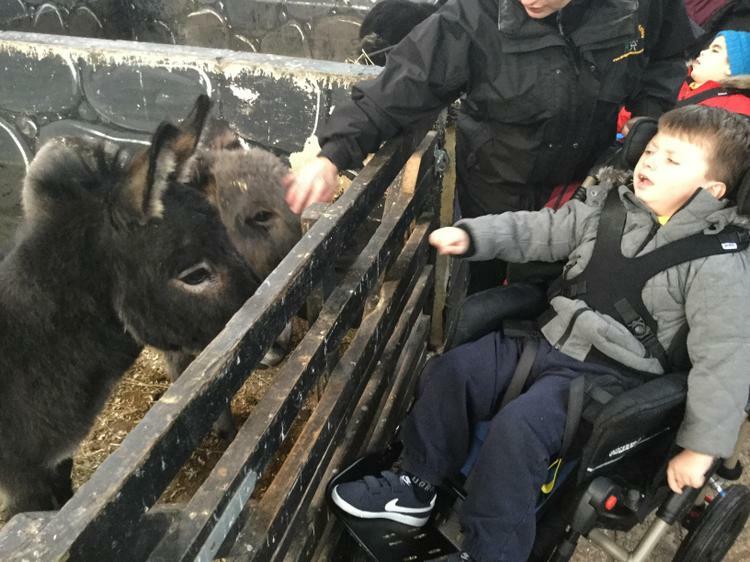 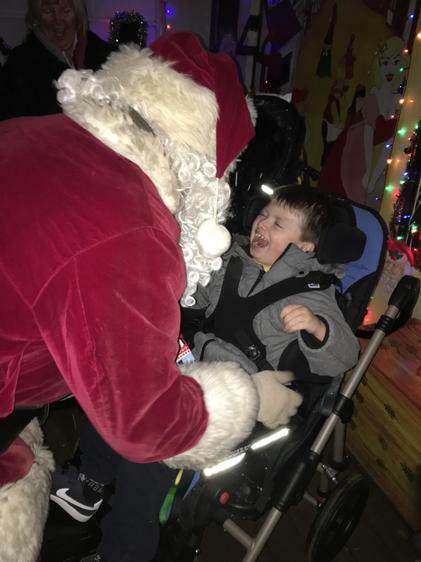 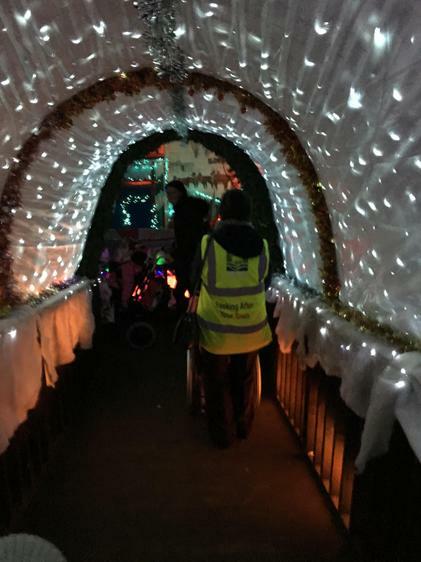 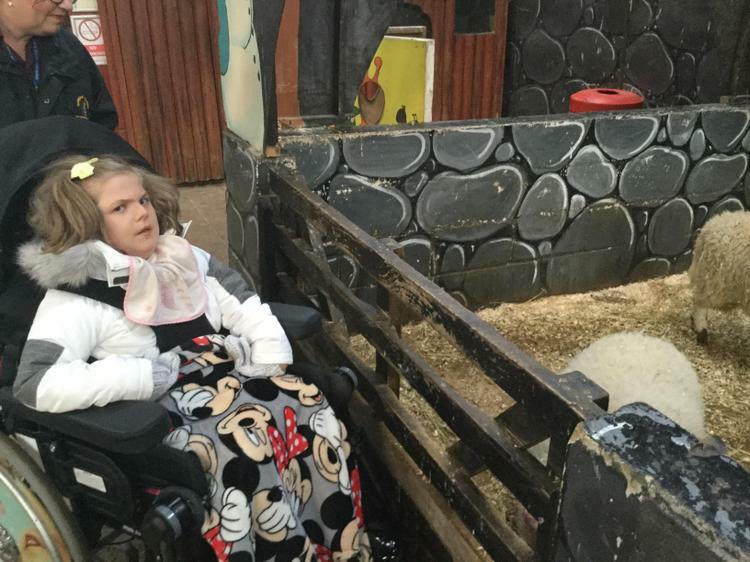 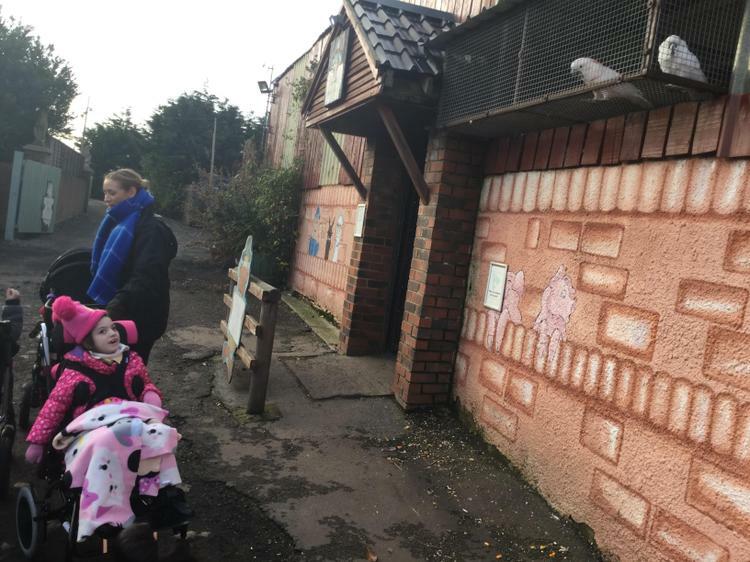 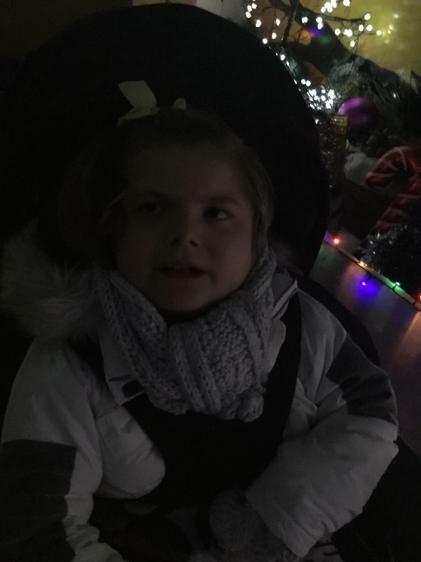 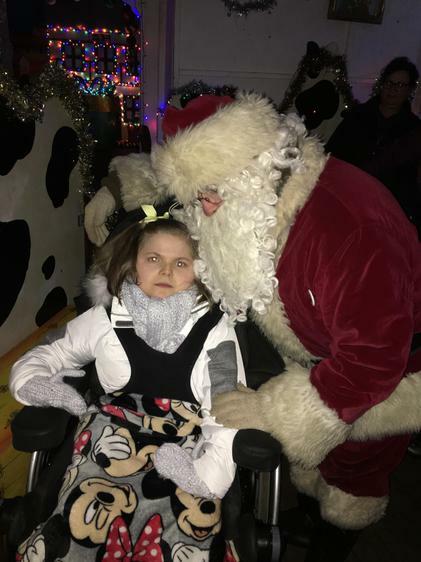 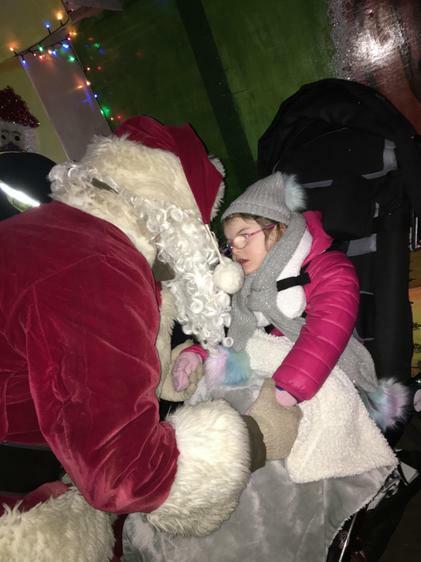 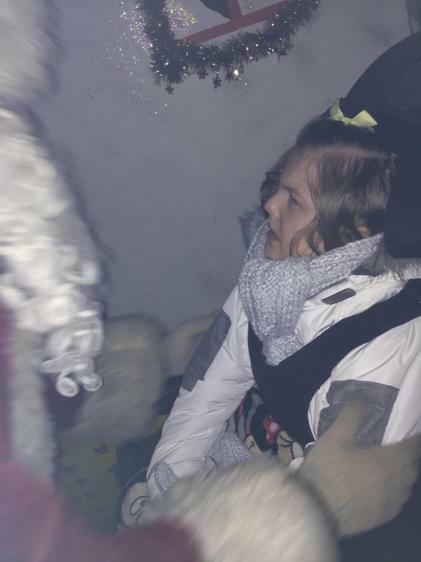 12.12.18 Visiting Santa at Tweddle Farm - Santa's Grotto was magical! 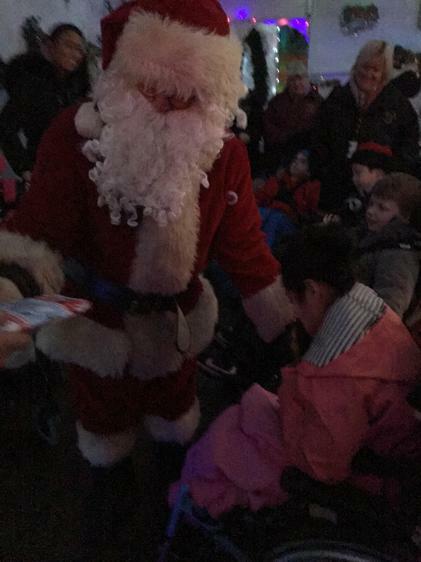 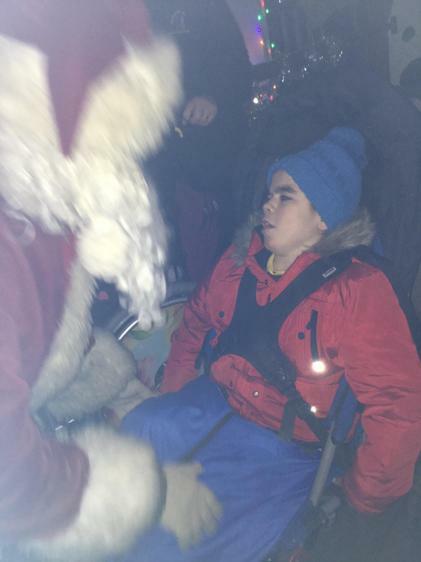 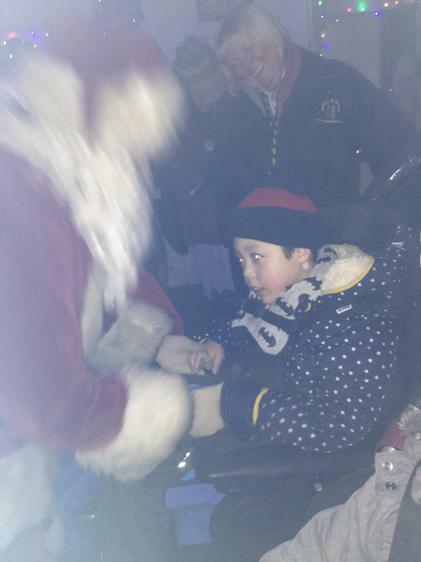 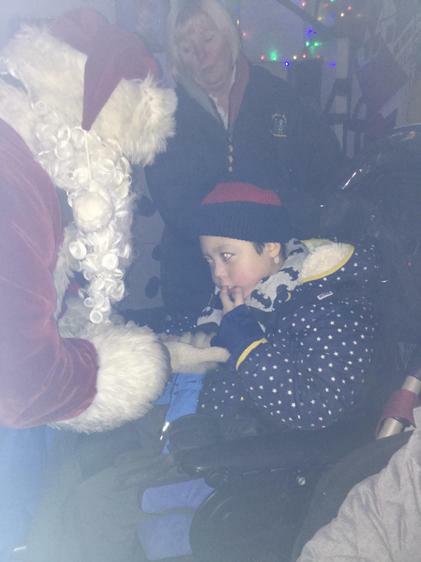 All the children were delighted to meet Santa Claus! 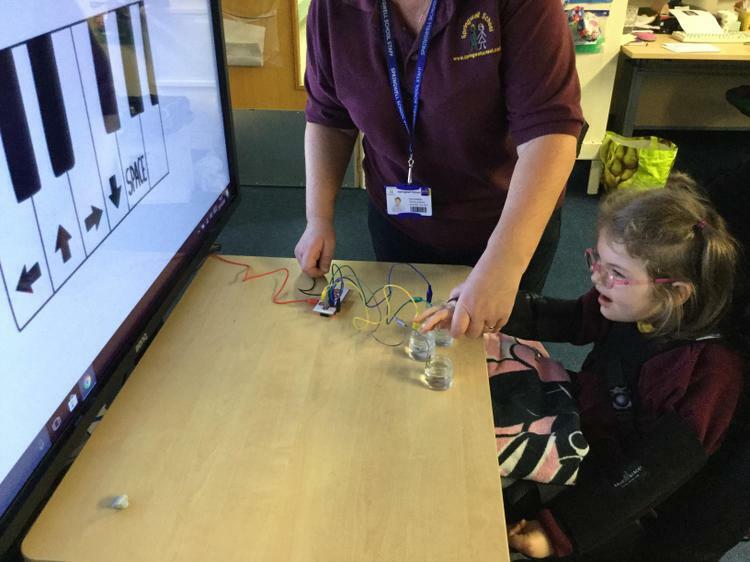 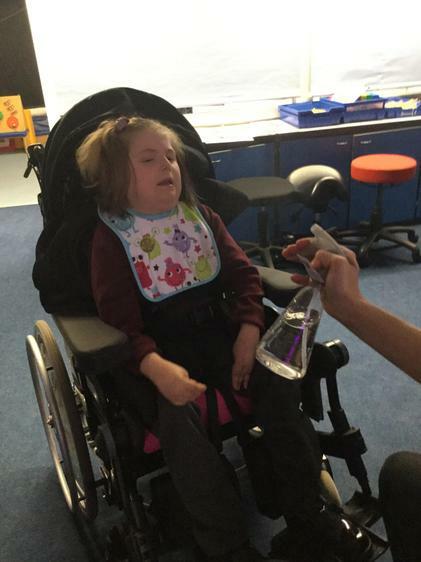 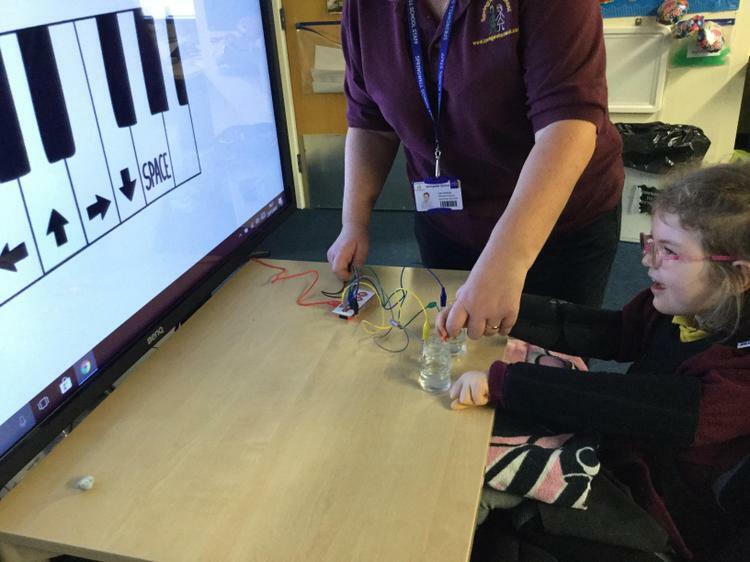 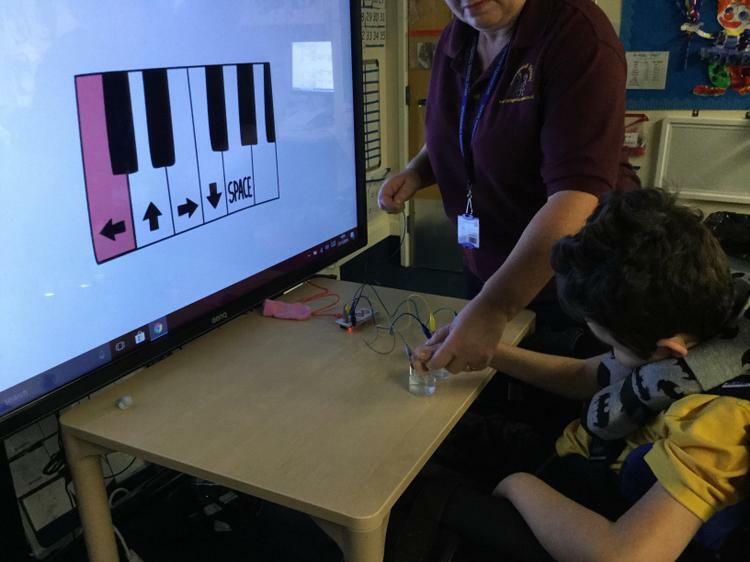 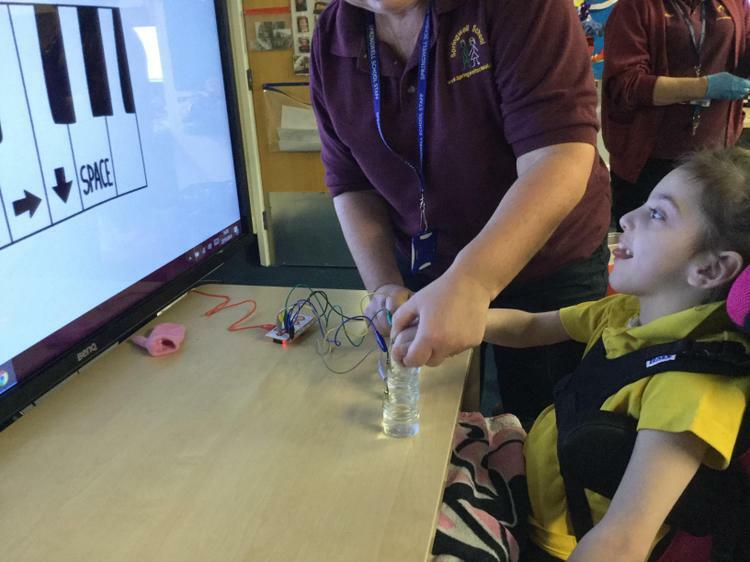 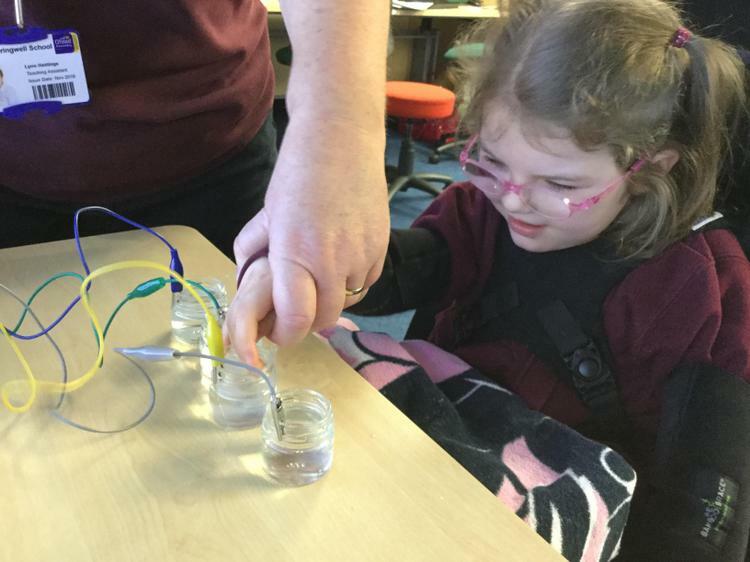 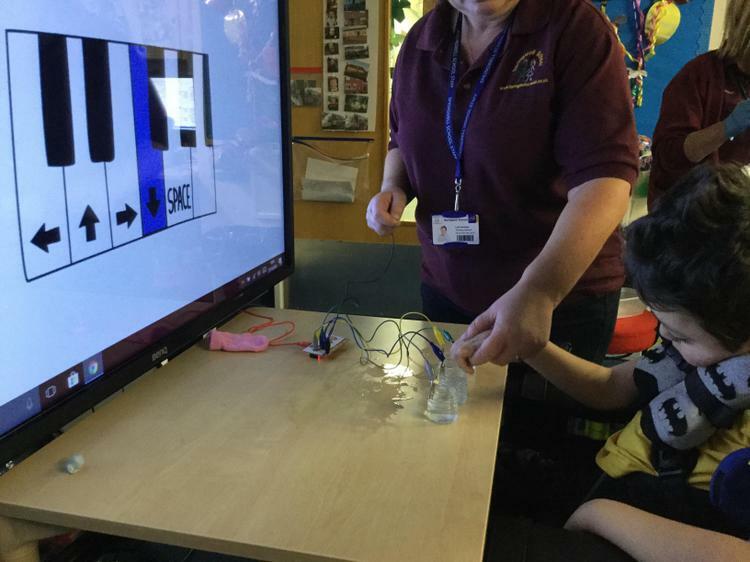 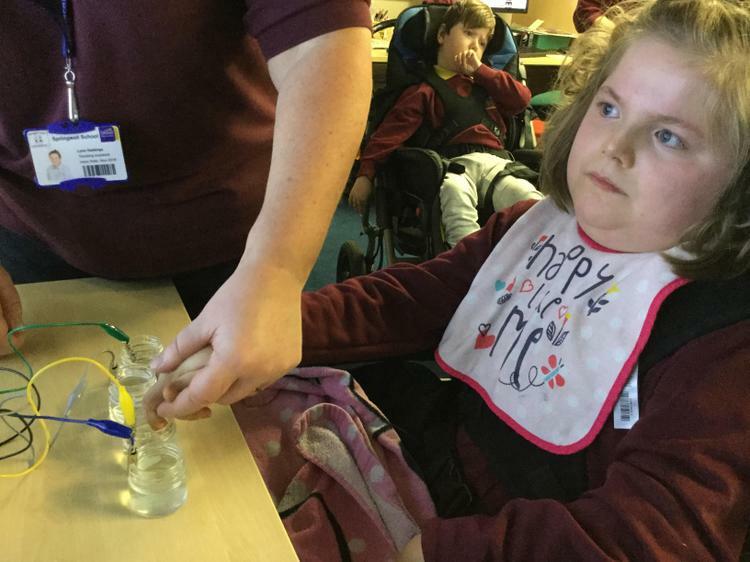 Coding Week 29.11.18 PLAYING A WATER PIANO The children enjoyed dipping their fingers into jars of water in turn to activate the musical notes on the virtual piano. 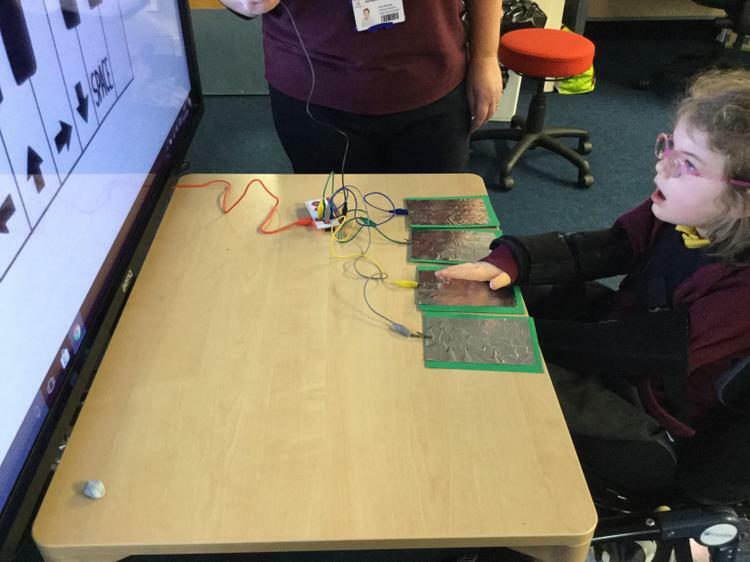 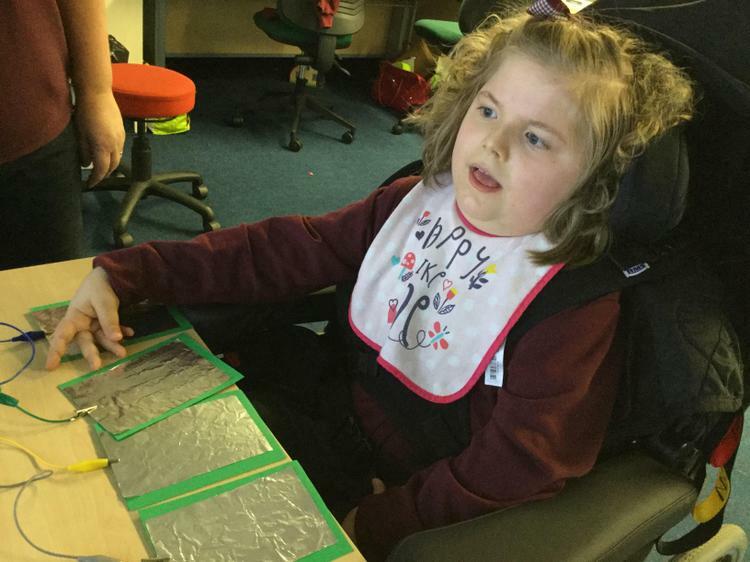 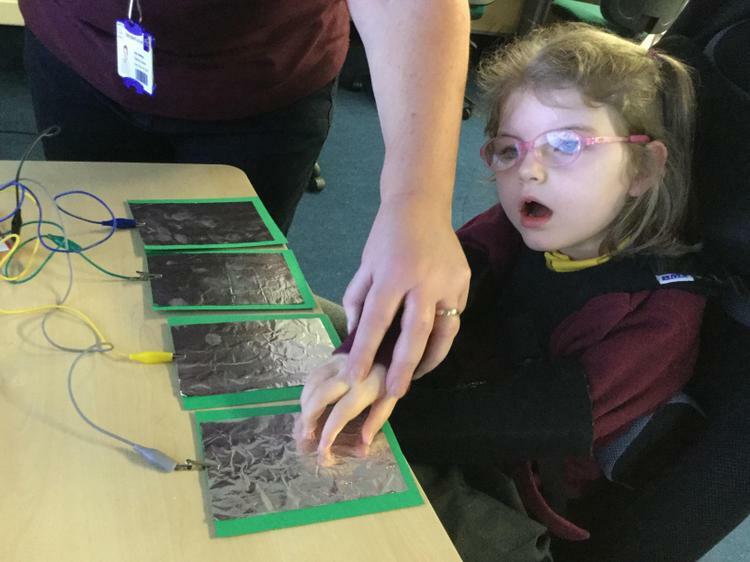 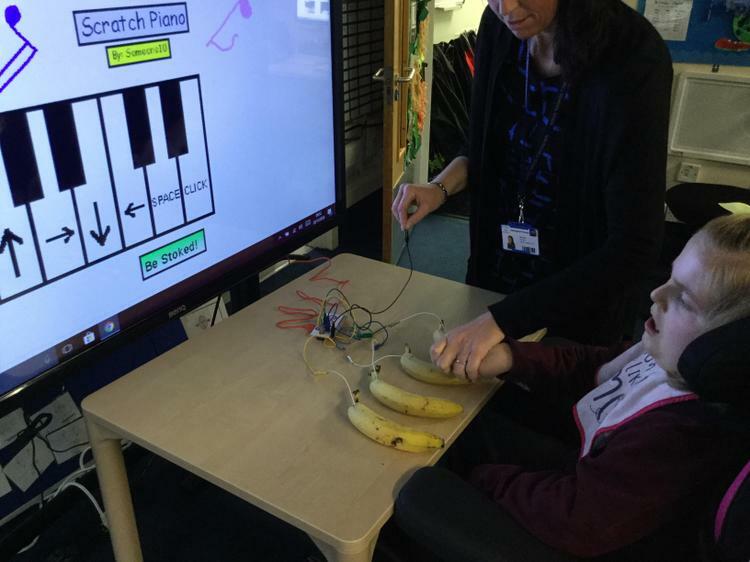 Coding Week 28.11.18 The children enjoyed pressing the tin foil keyboard using the MaKey, Makey kit to activate the musical notes on the virtual piano. 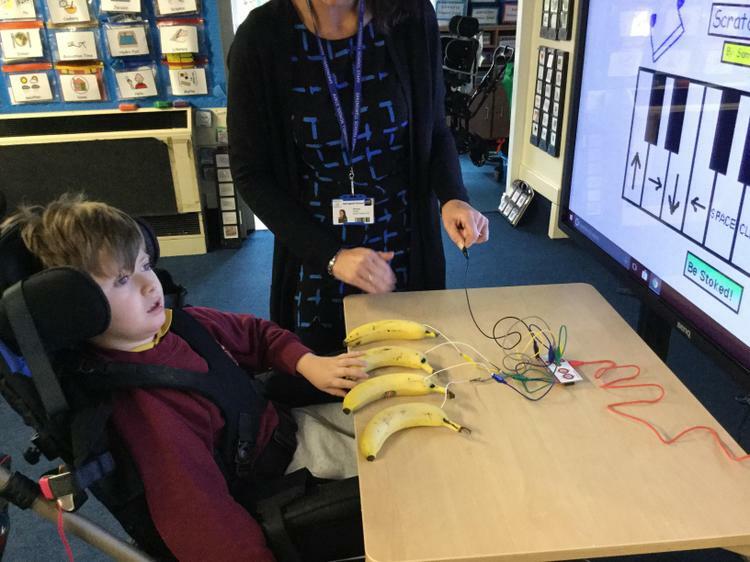 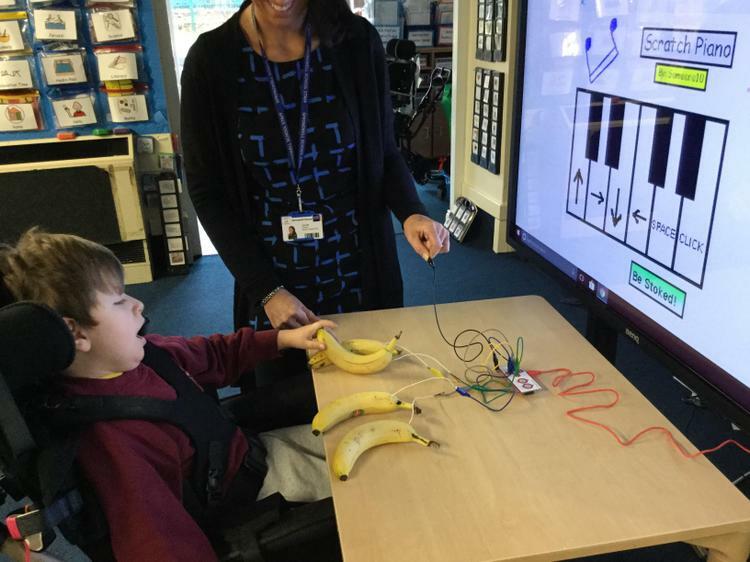 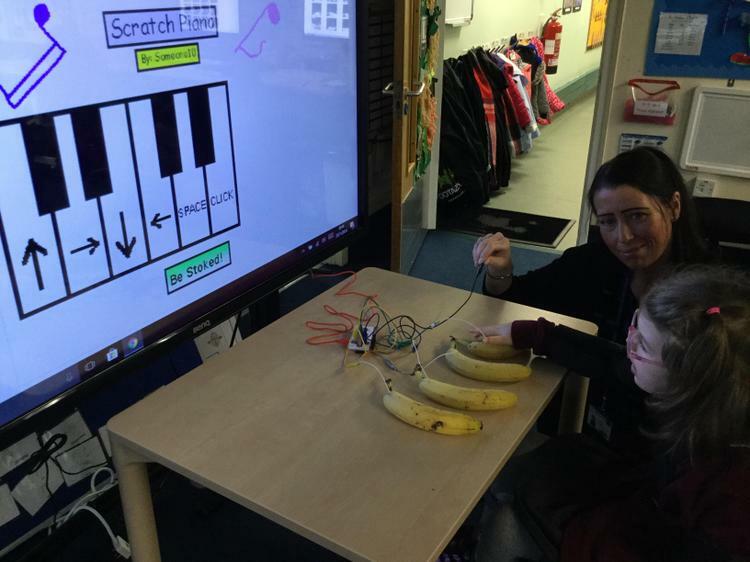 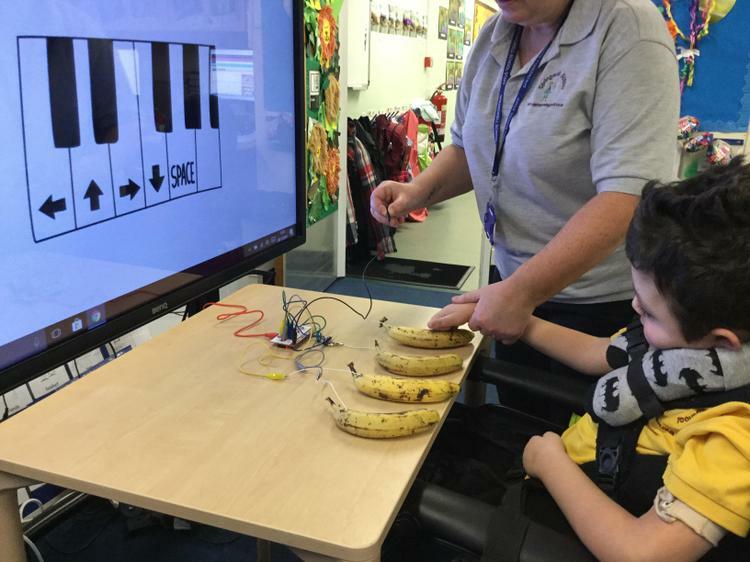 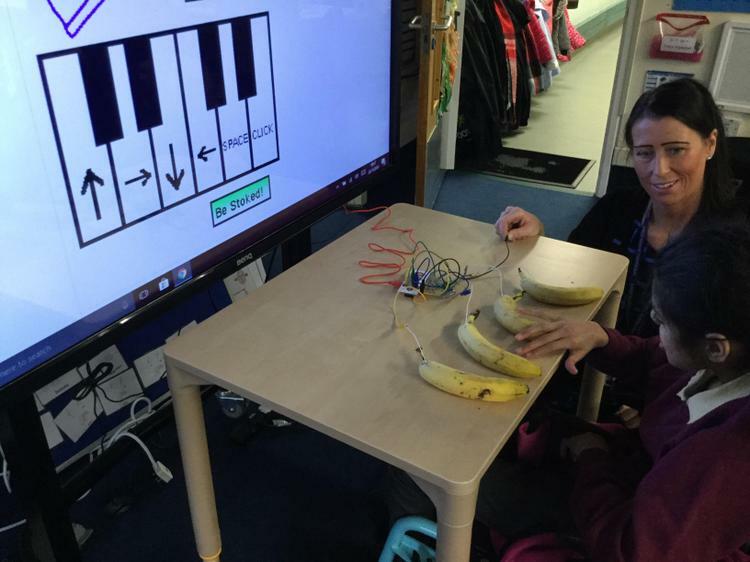 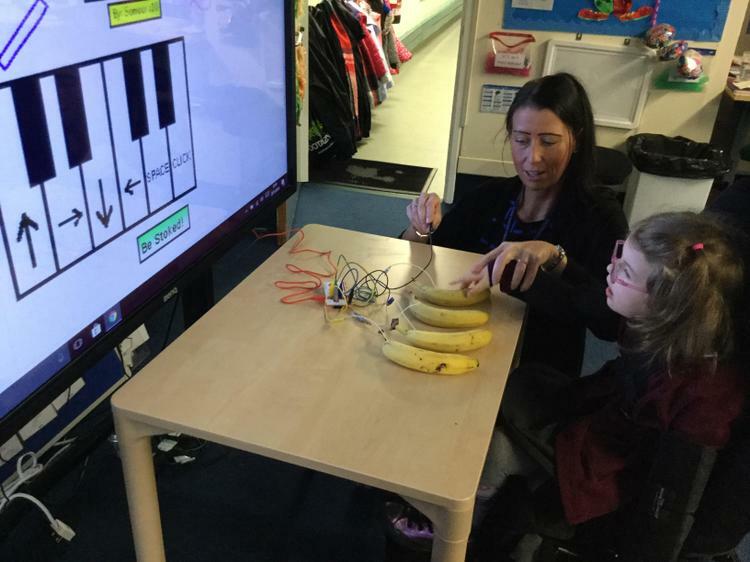 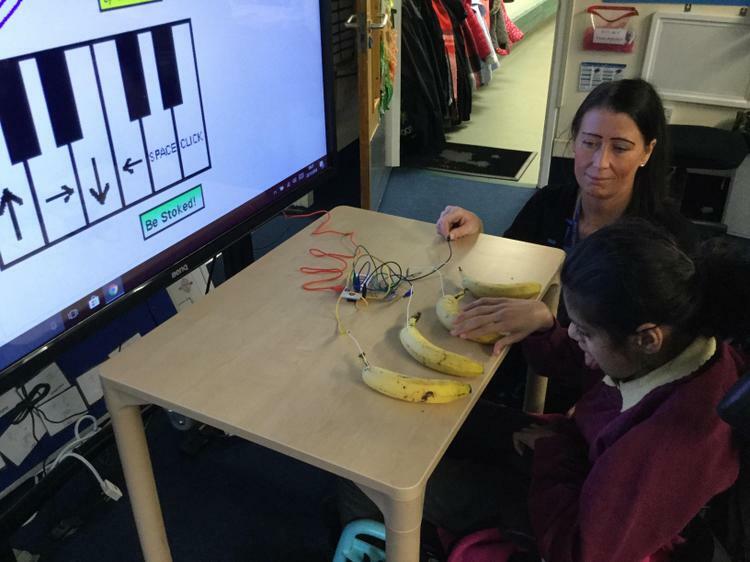 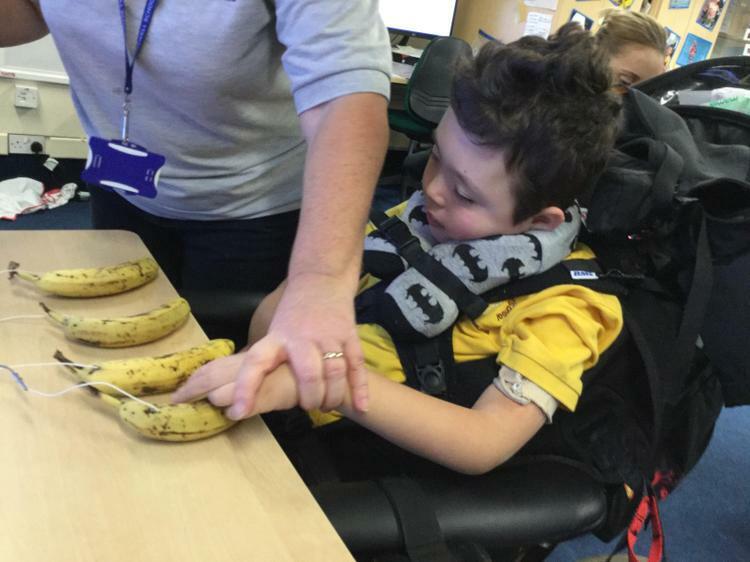 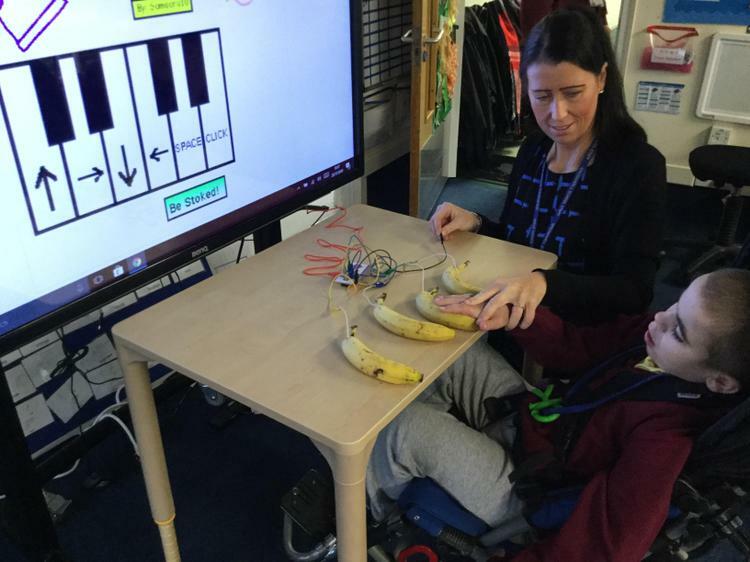 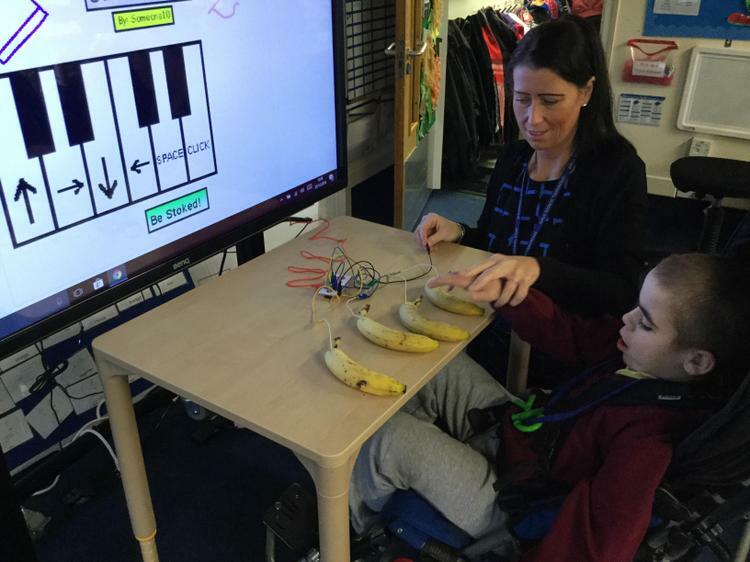 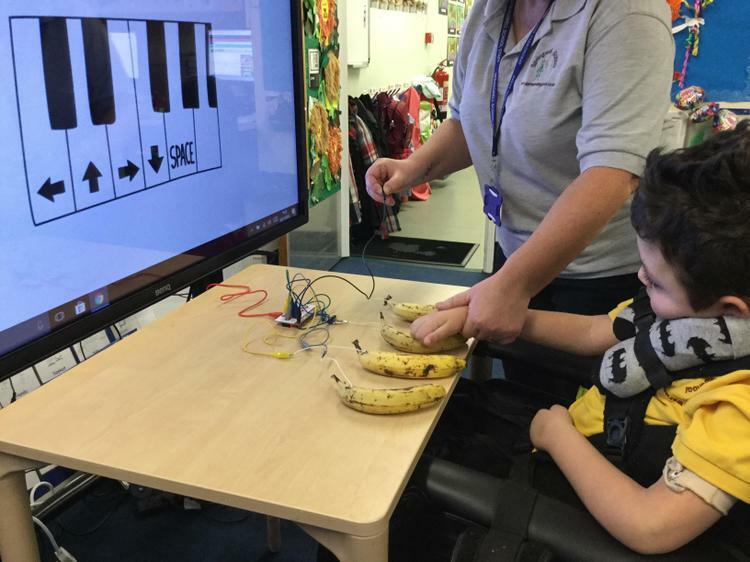 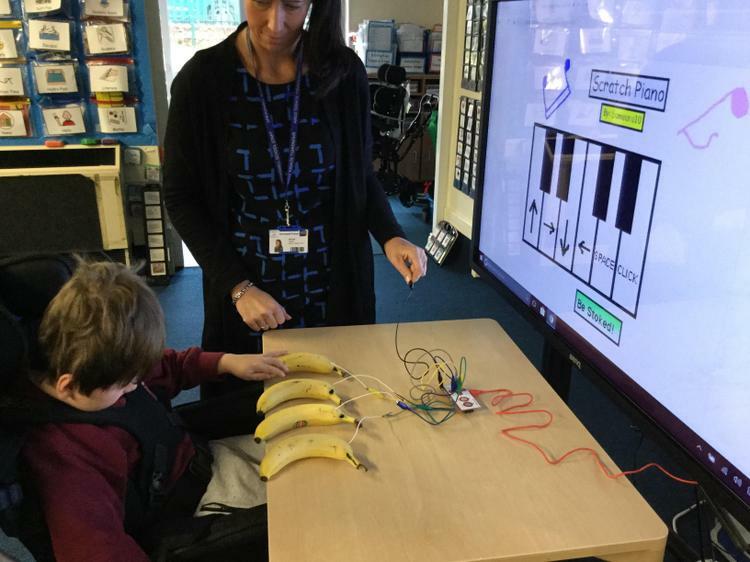 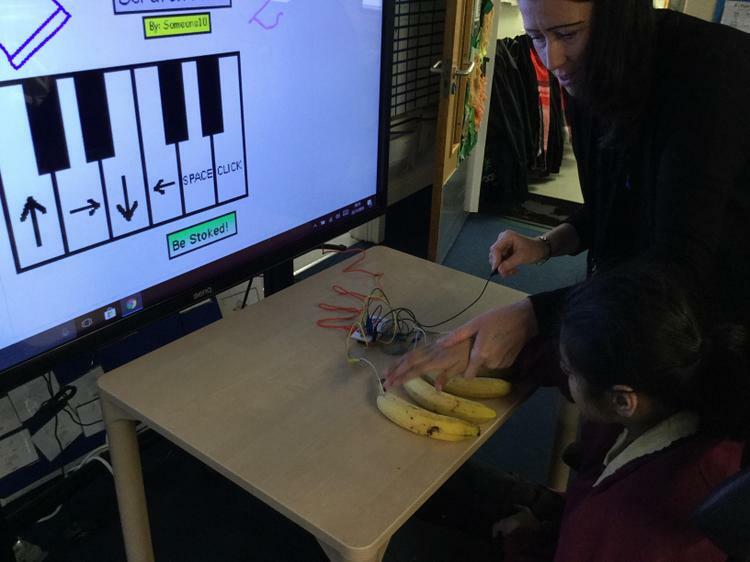 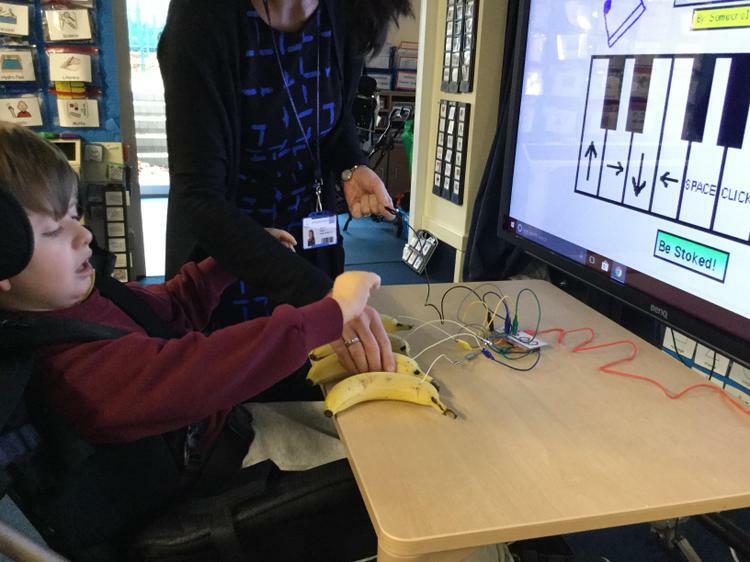 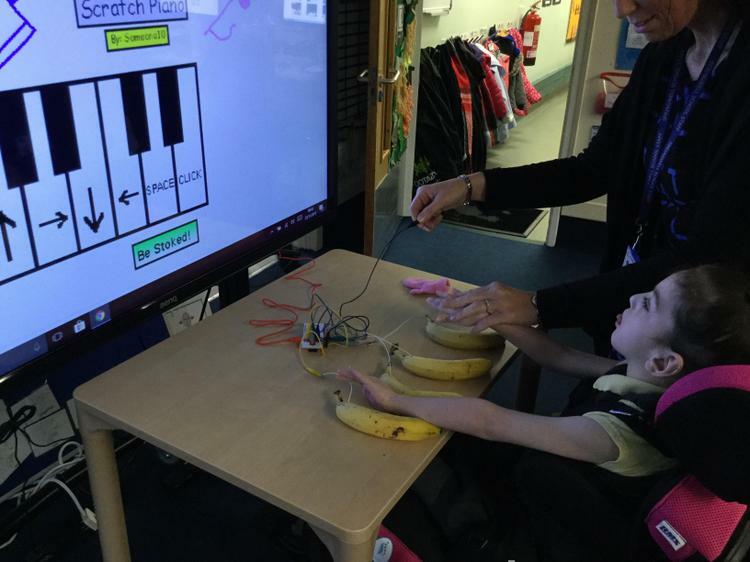 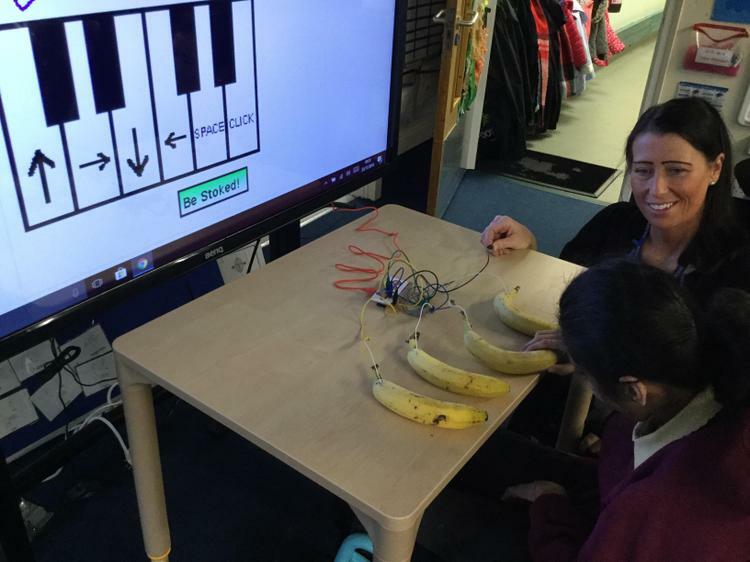 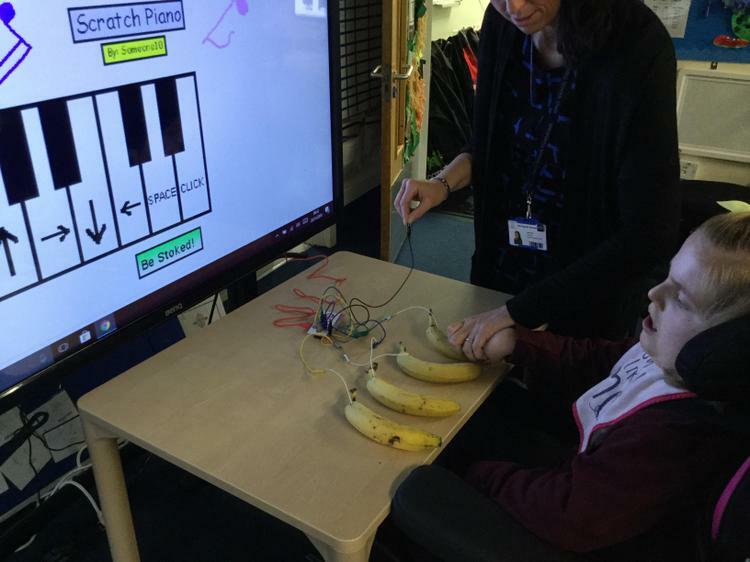 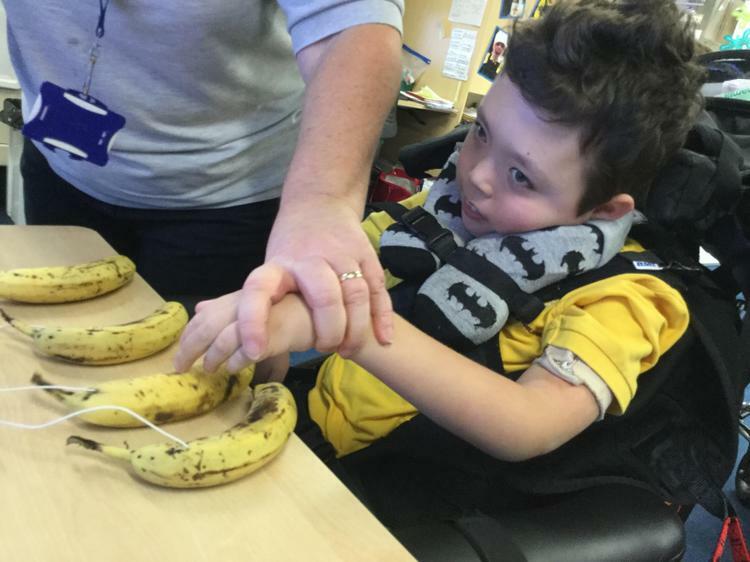 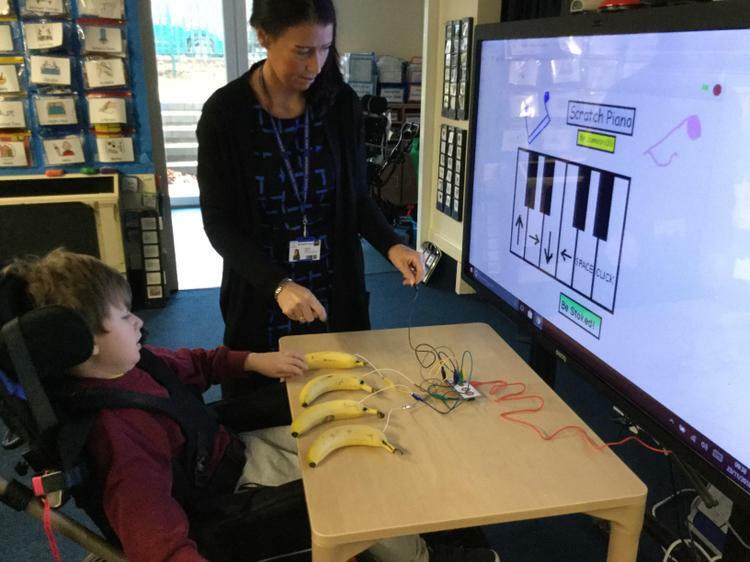 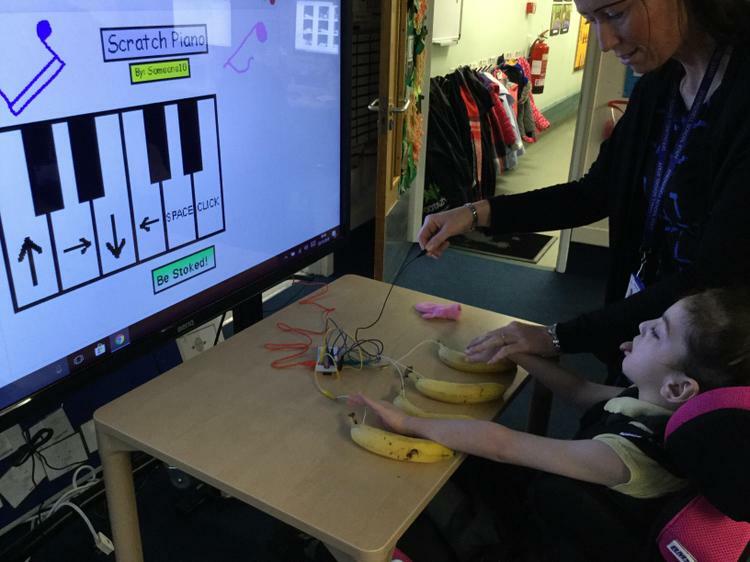 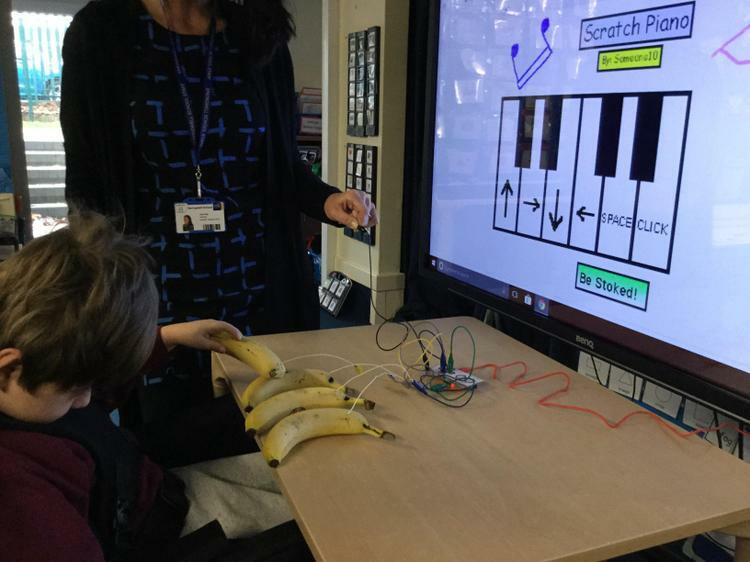 Coding Week 27.11.18 The children enjoyed pressing the banana keyboard using the MaKey, Makey kit to activate the musical notes on the virtual piano. 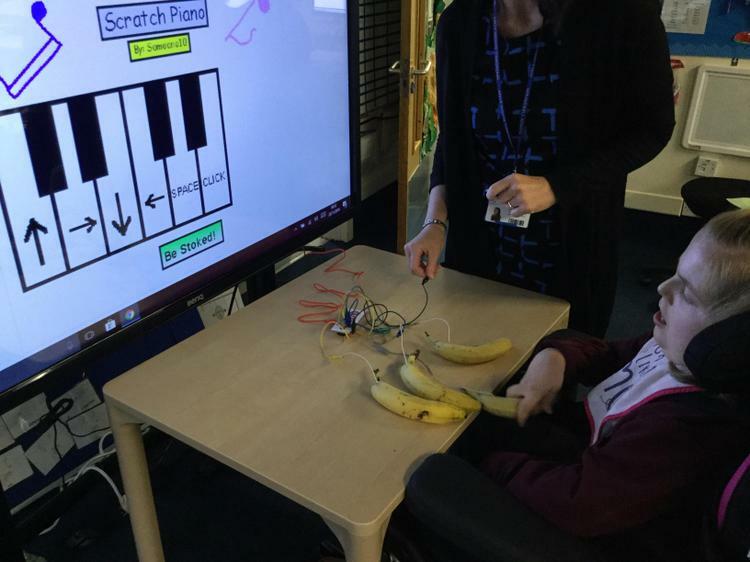 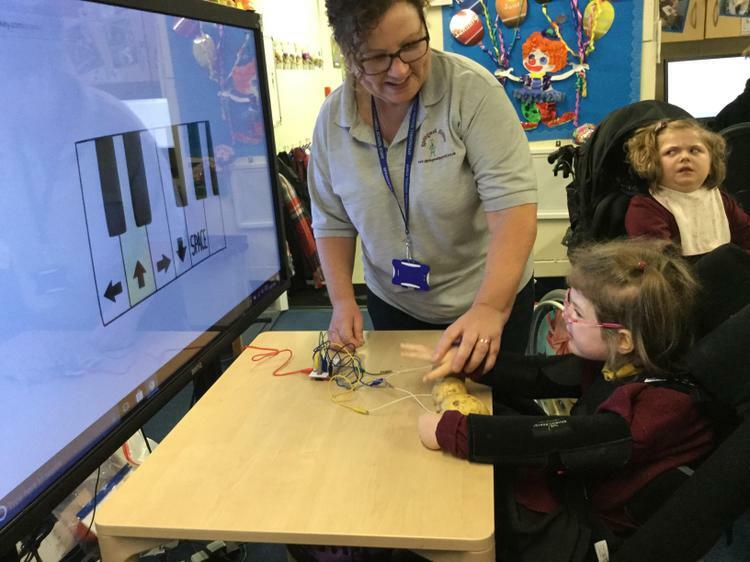 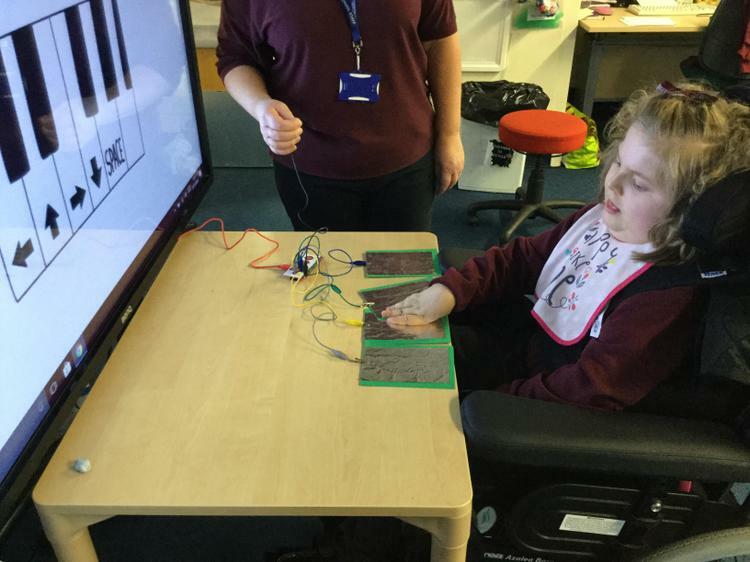 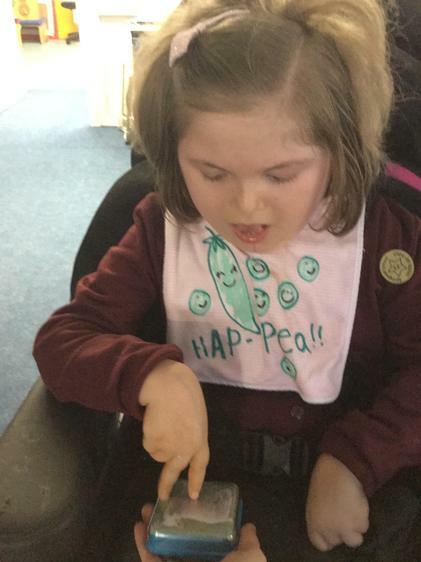 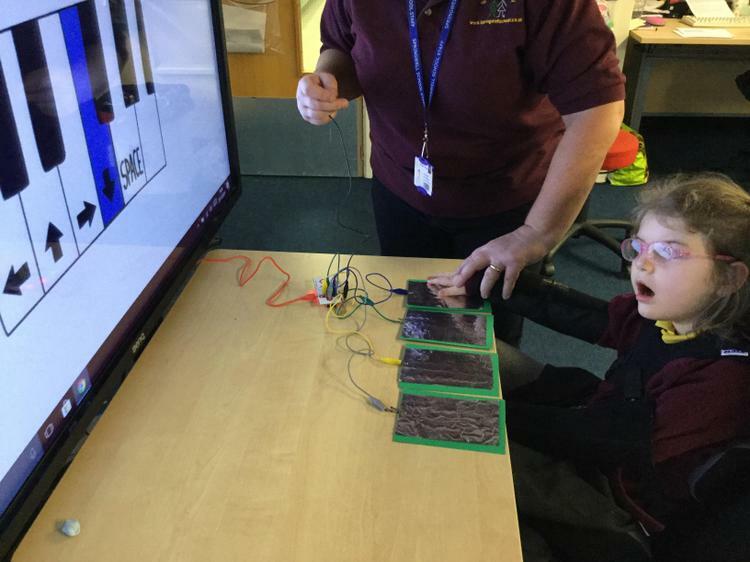 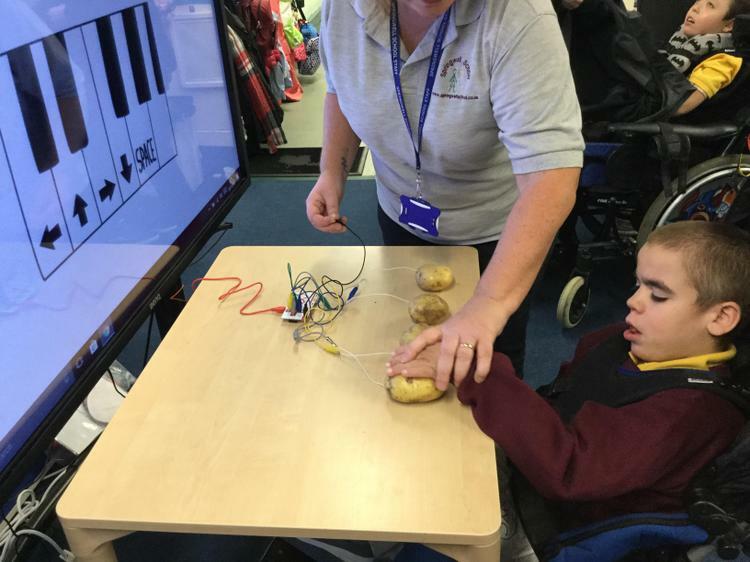 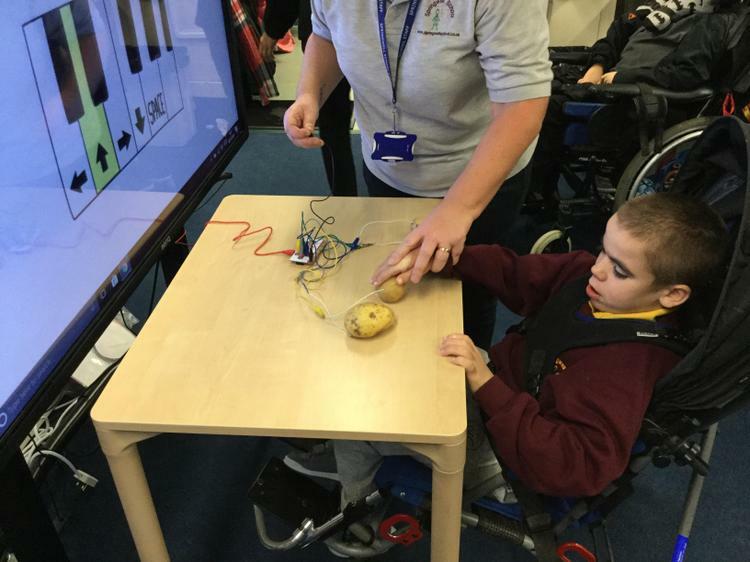 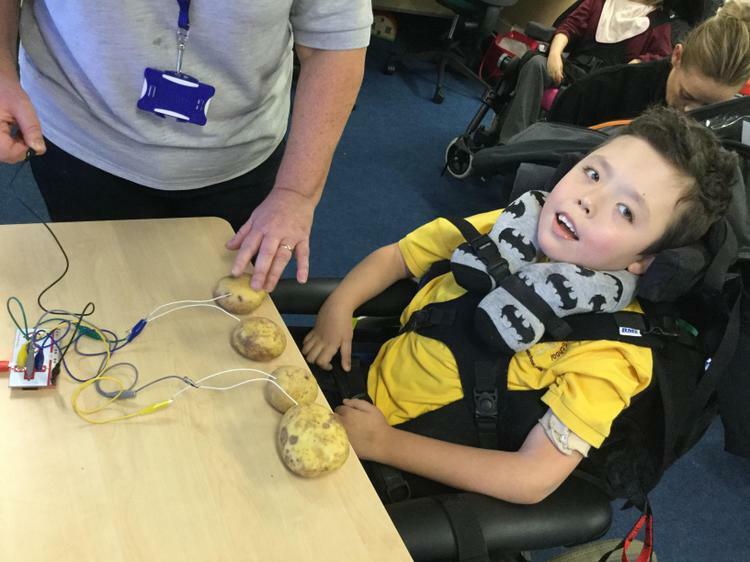 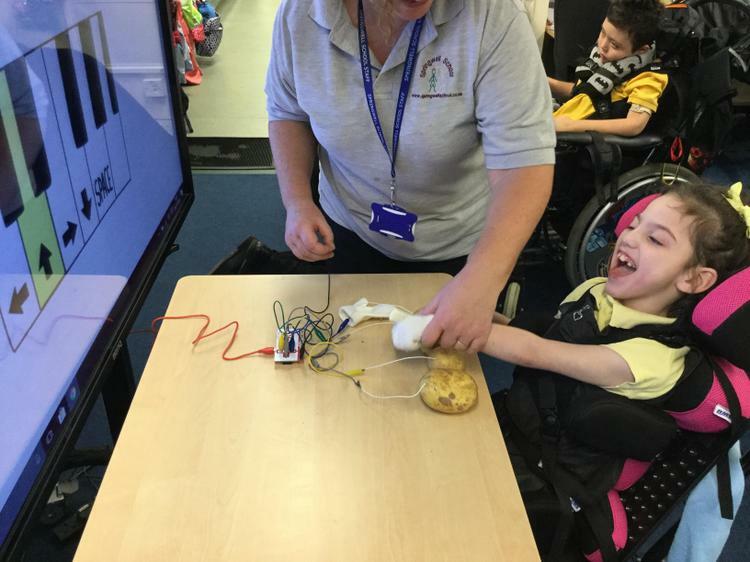 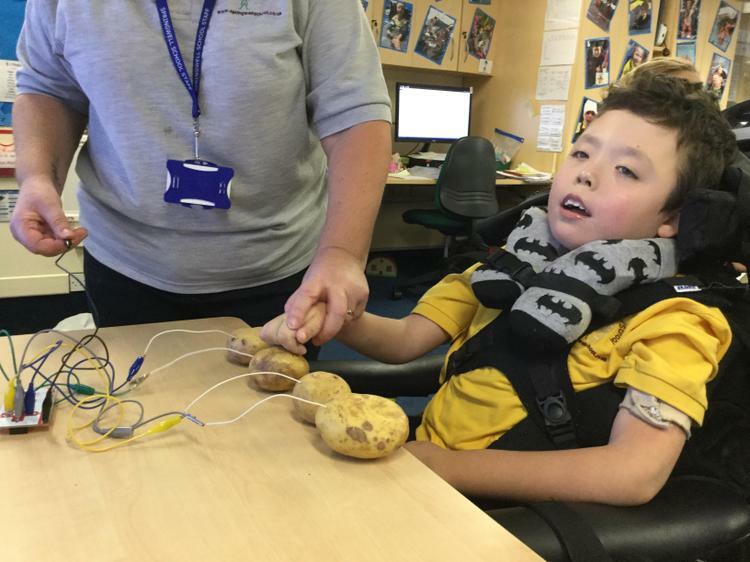 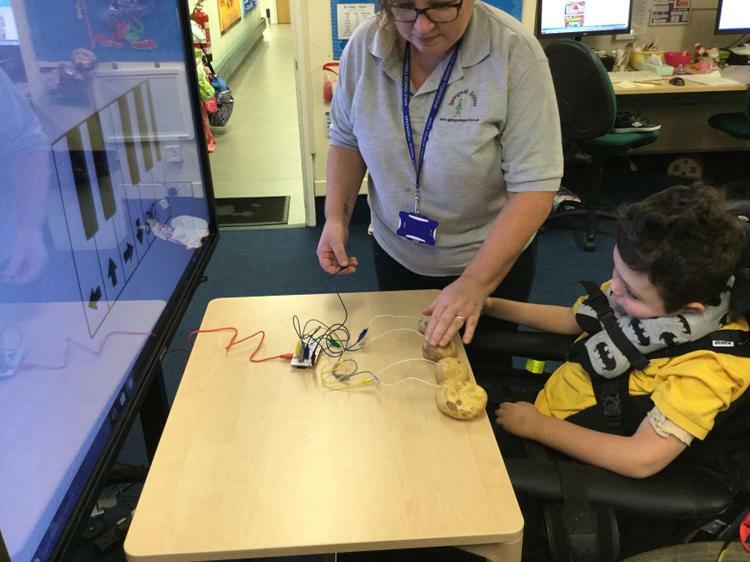 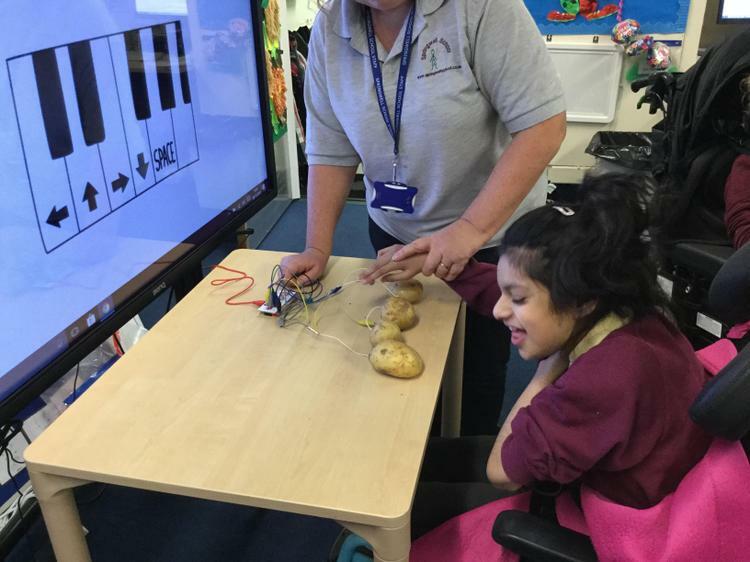 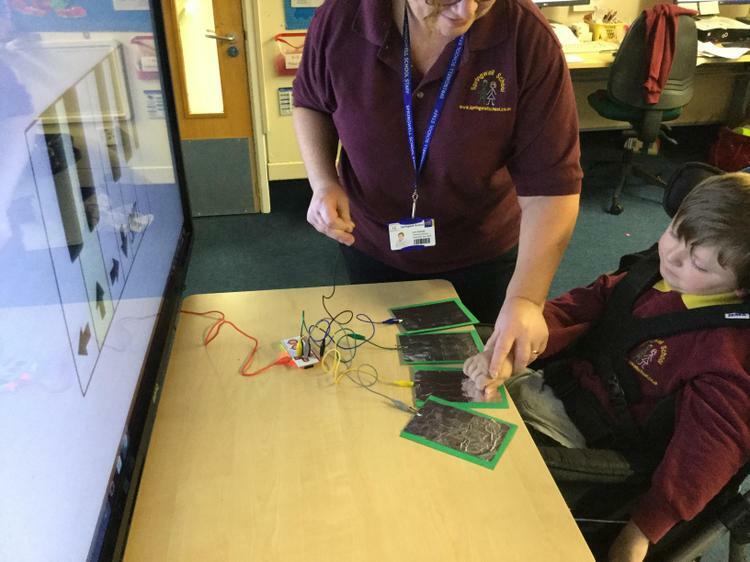 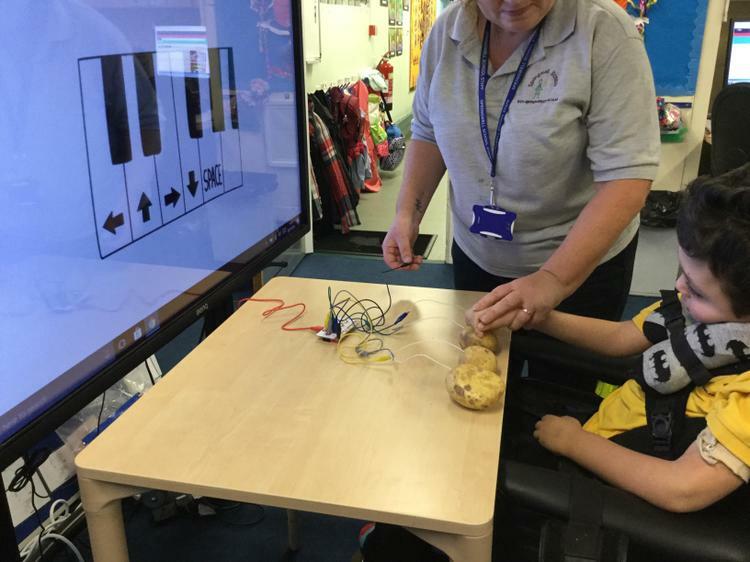 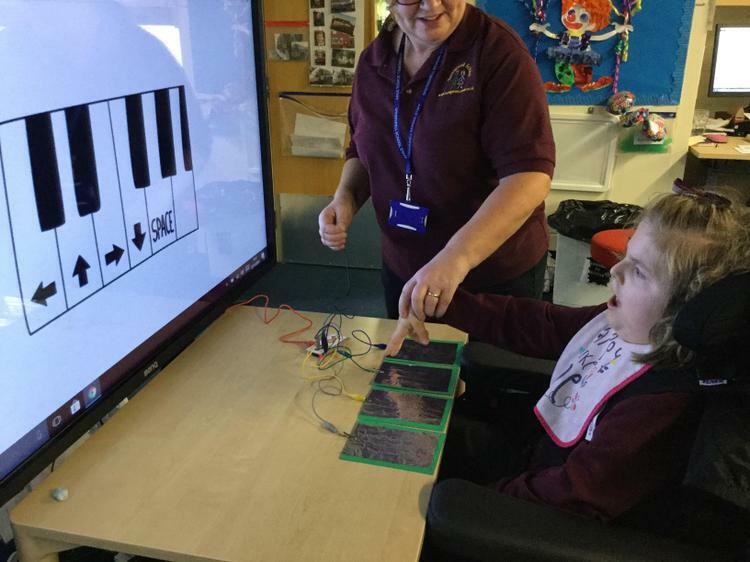 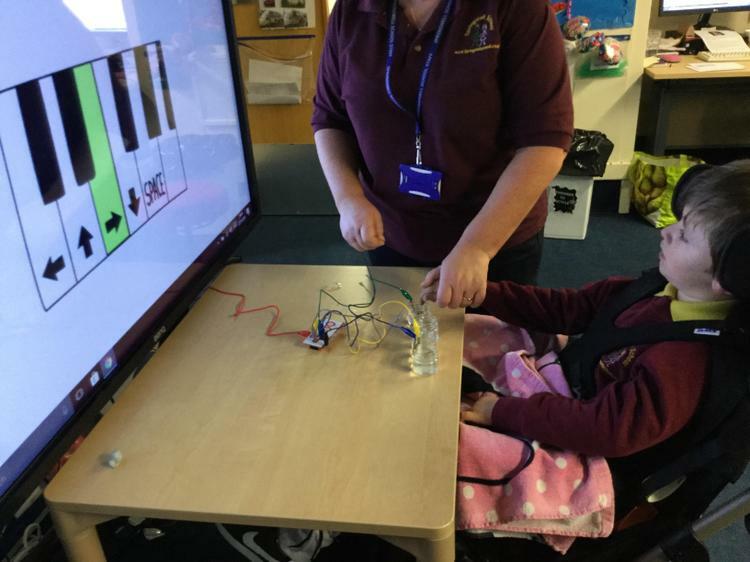 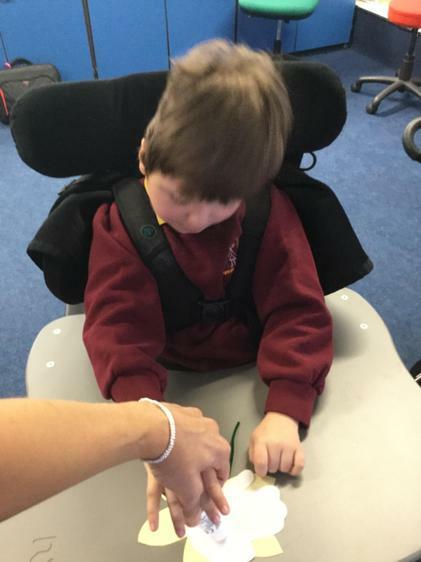 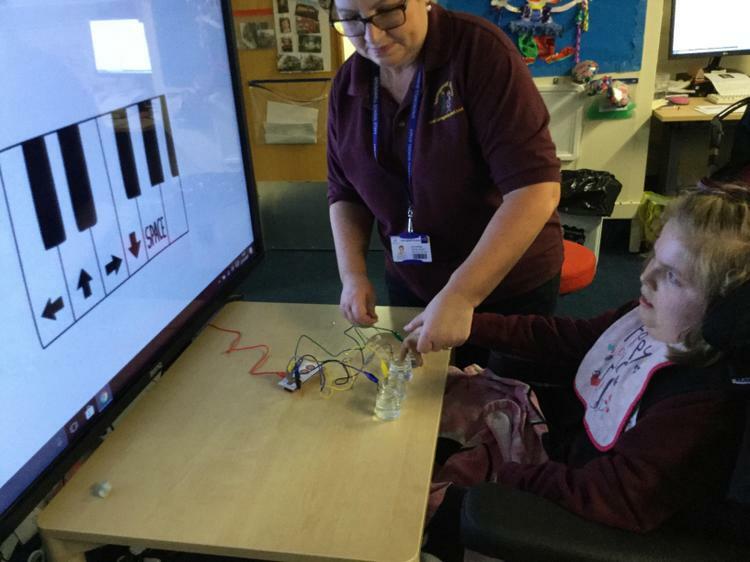 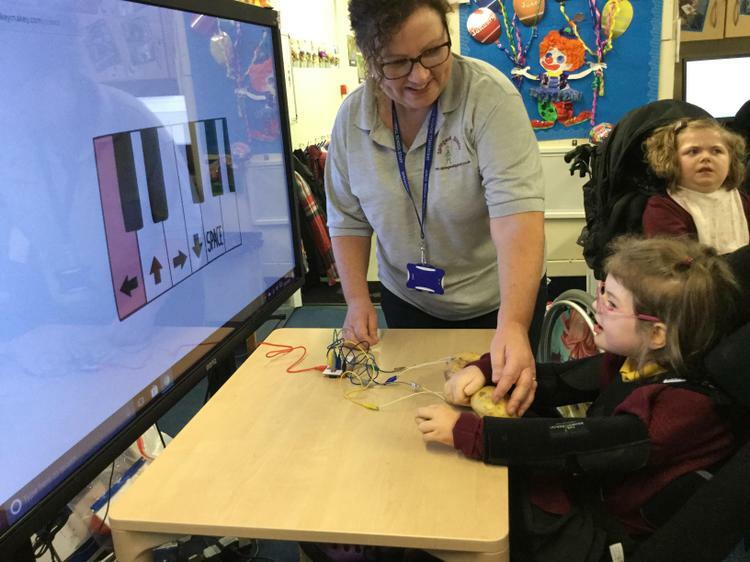 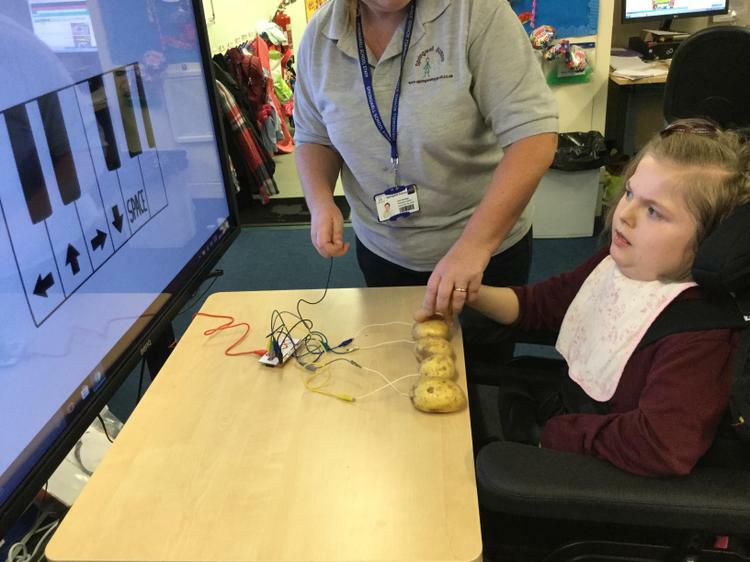 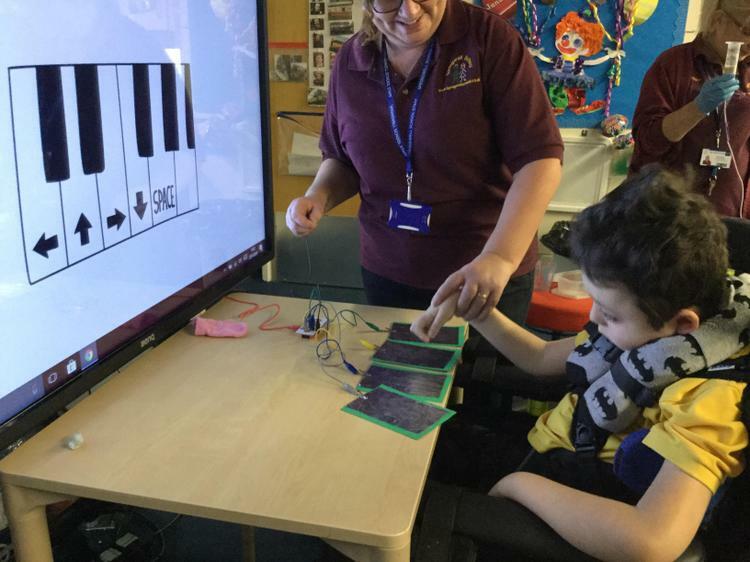 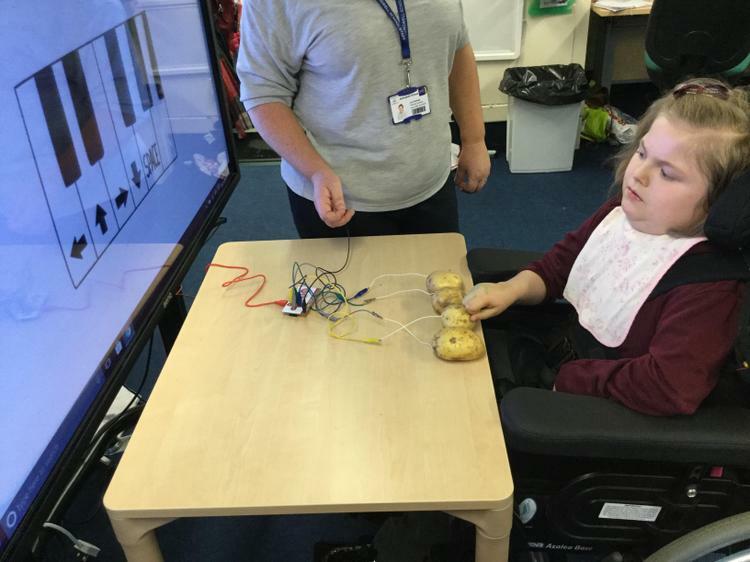 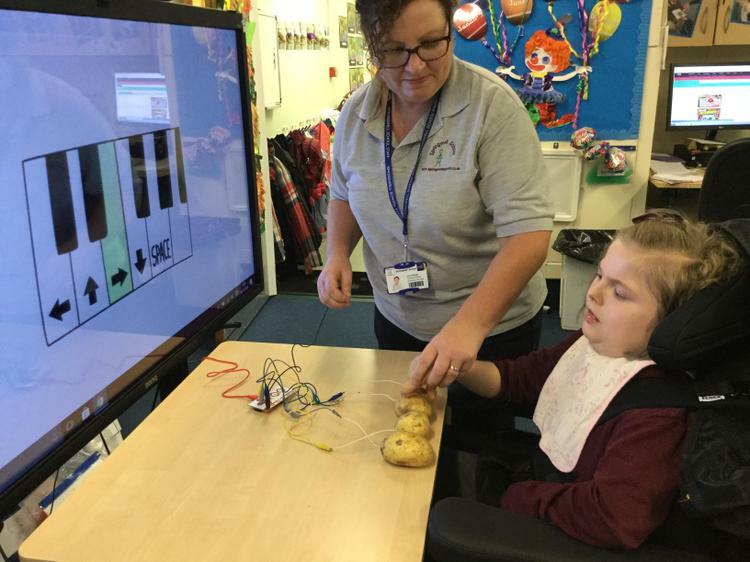 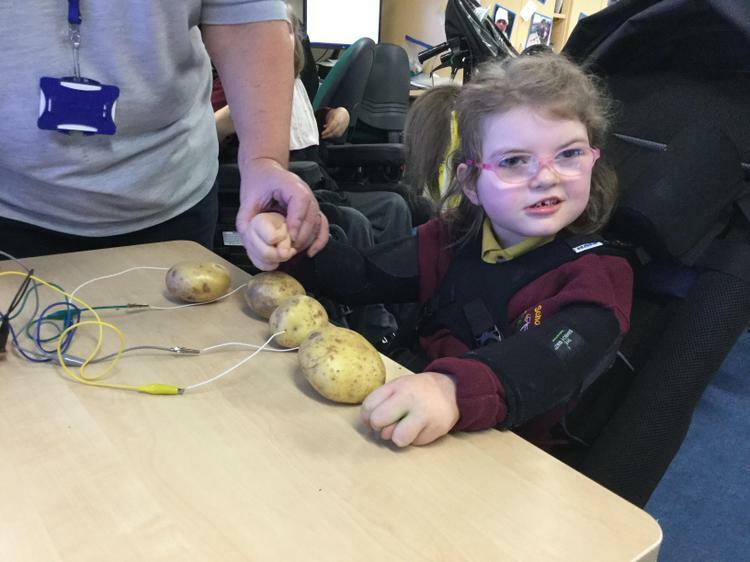 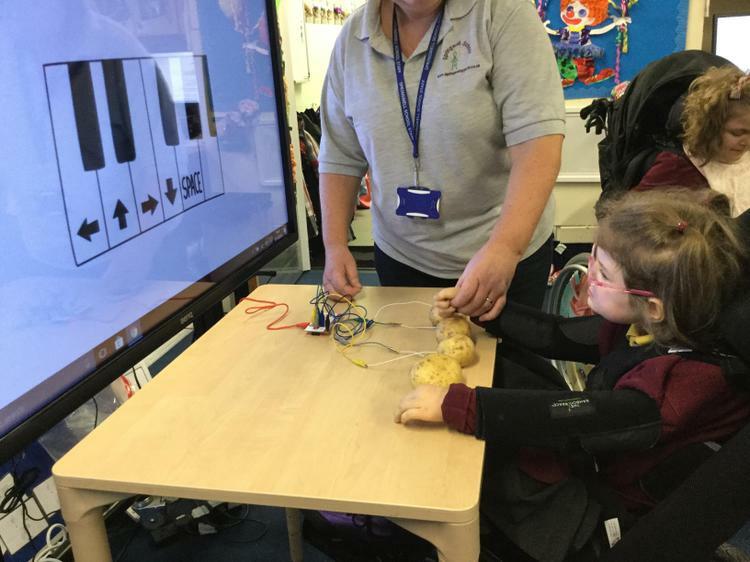 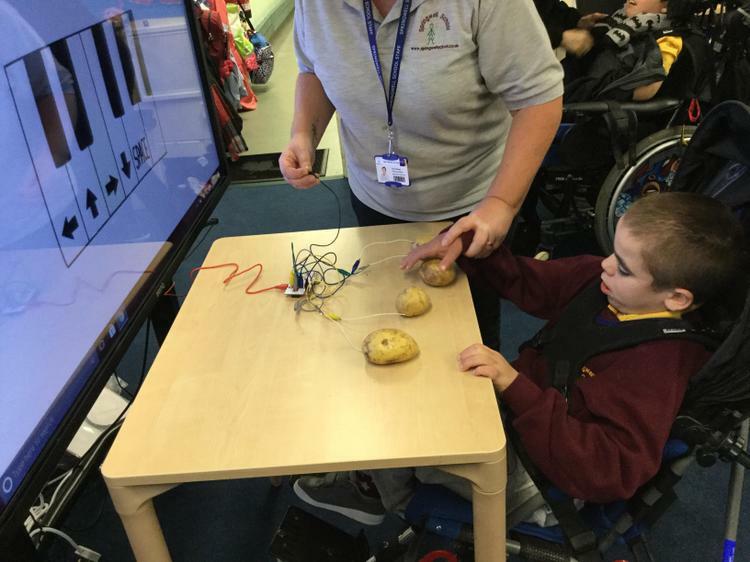 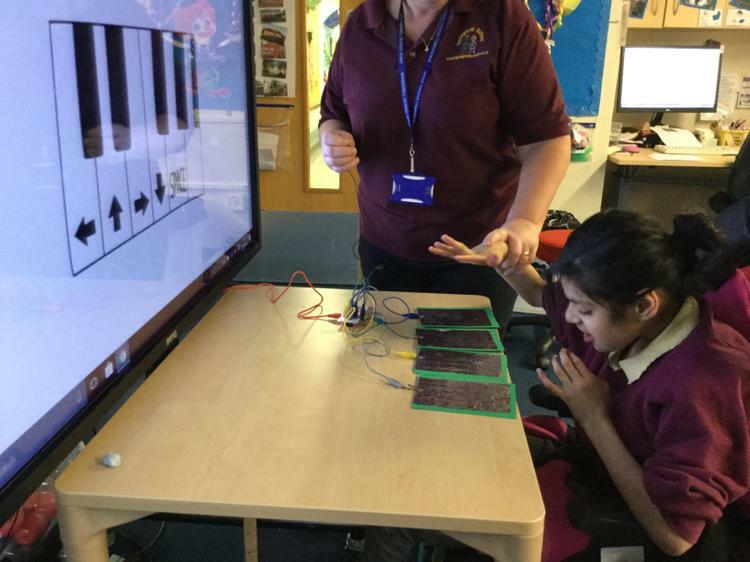 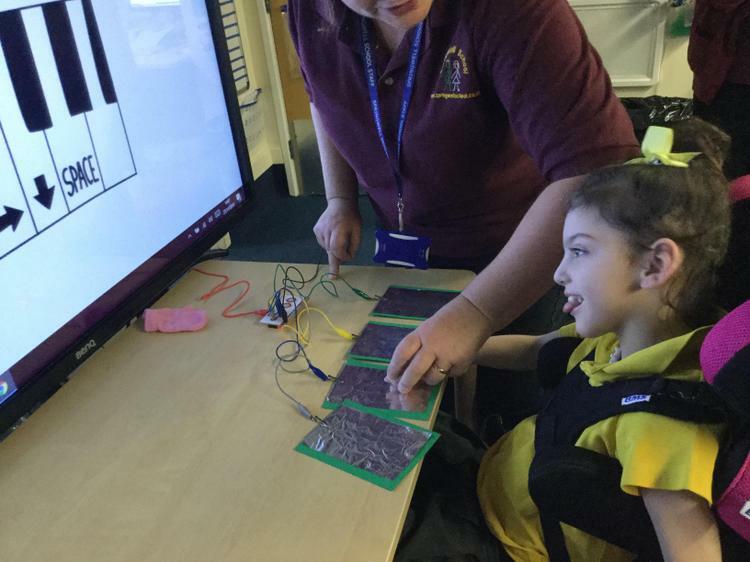 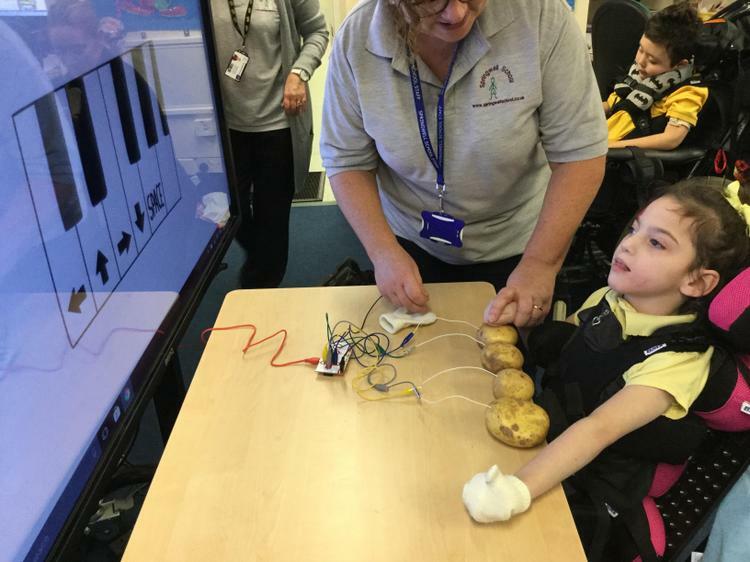 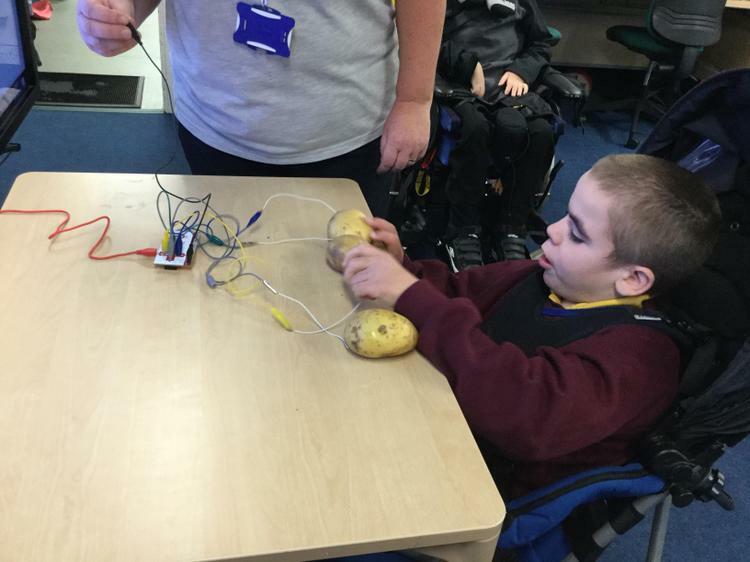 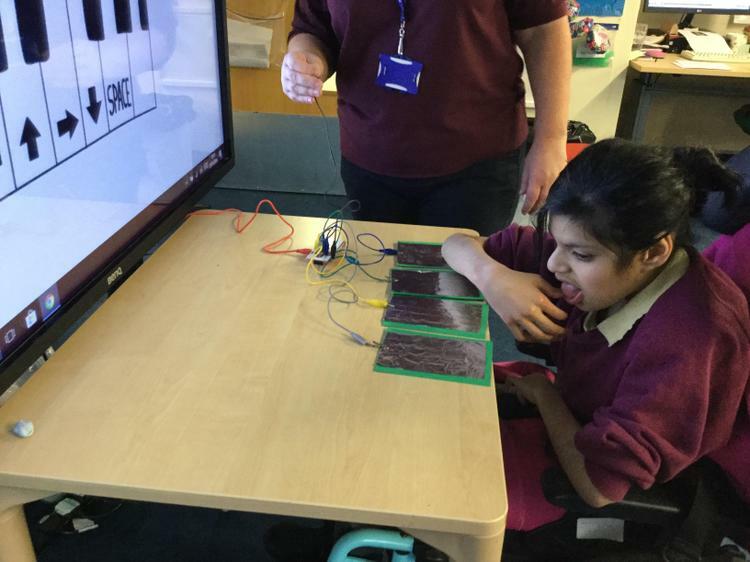 Coding Week 26.11.18 The children enjoyed pressing the vegetable keyboard using the MaKey, Makey kit to activate the musical notes on the virtual piano. 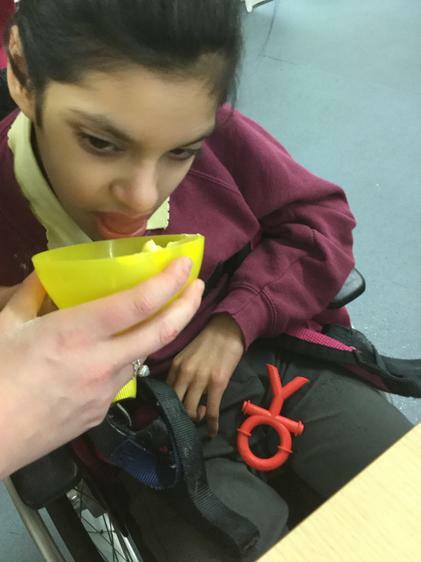 This is "Healthy and Active Lives - Class Assembly" by jane on Vimeo, the home for high quality videos and the people who love them. 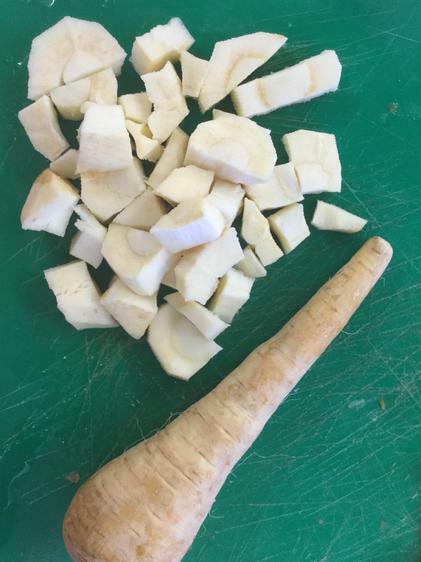 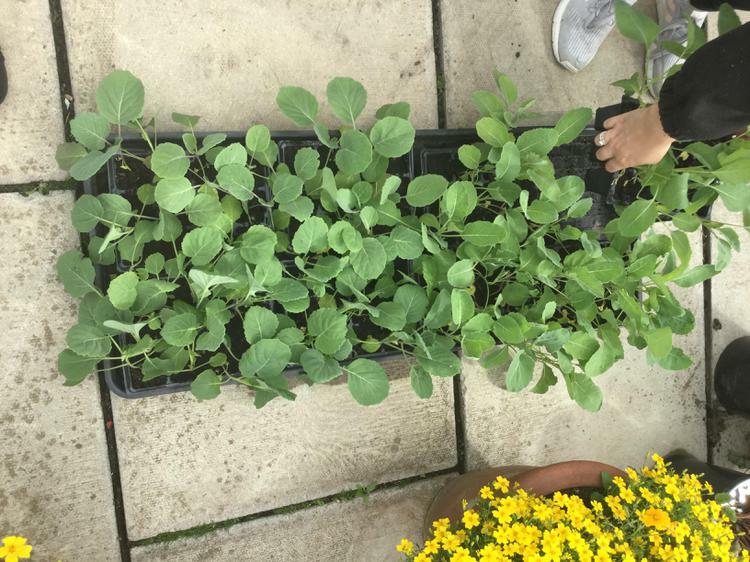 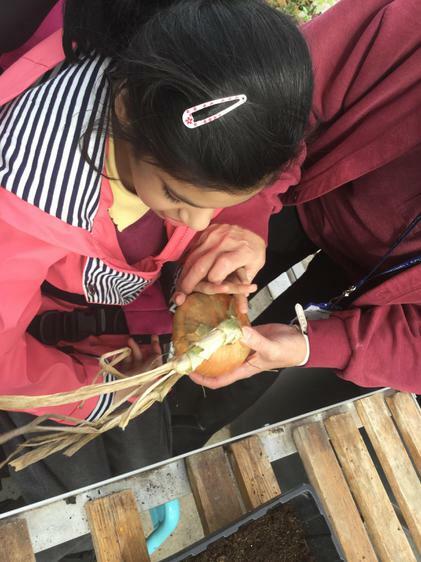 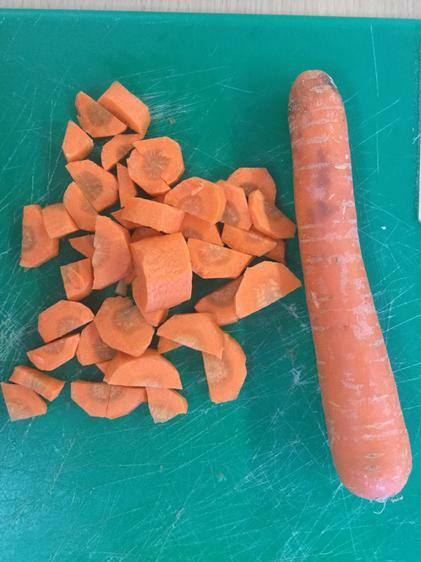 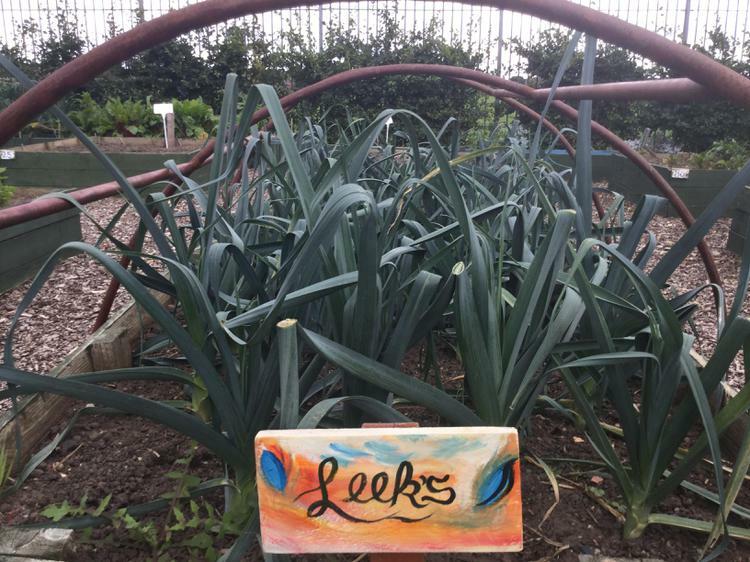 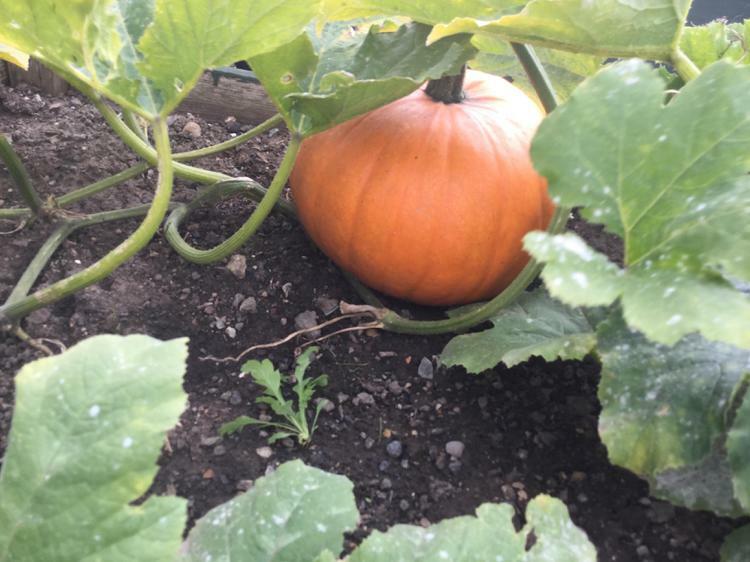 Geography - Visiting Waverley Terrace Allotment - Where does our food come from? 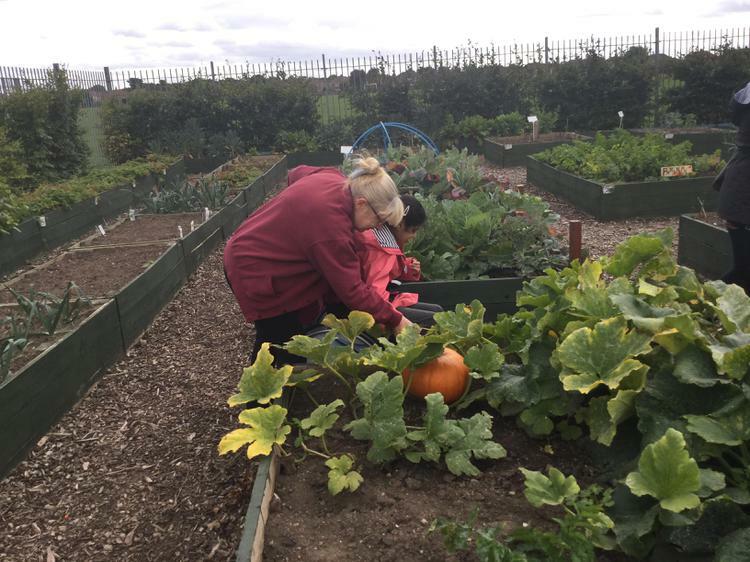 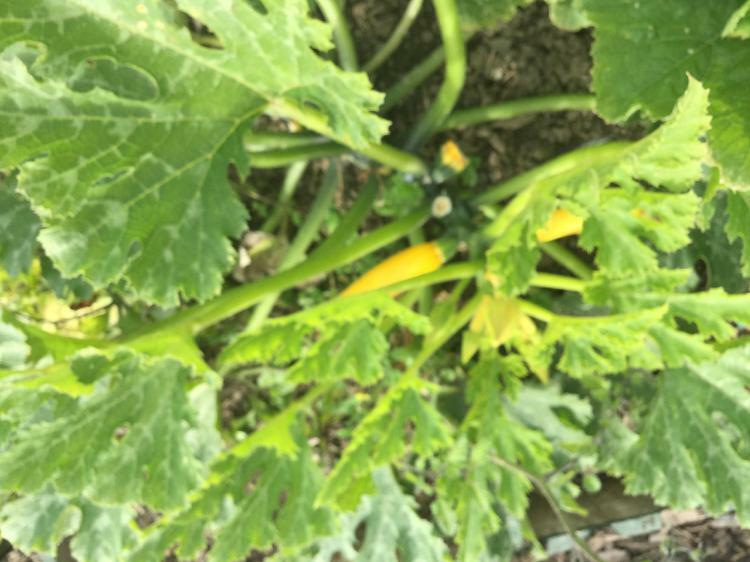 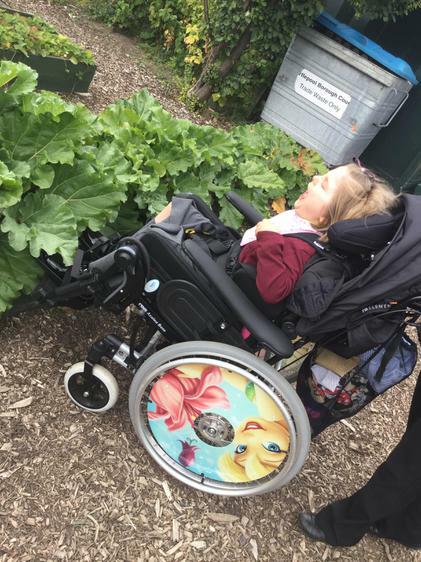 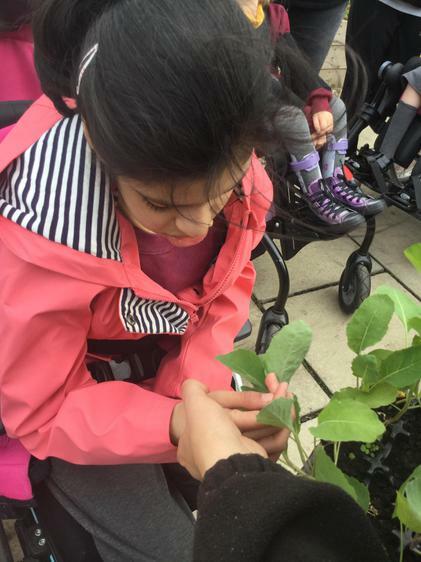 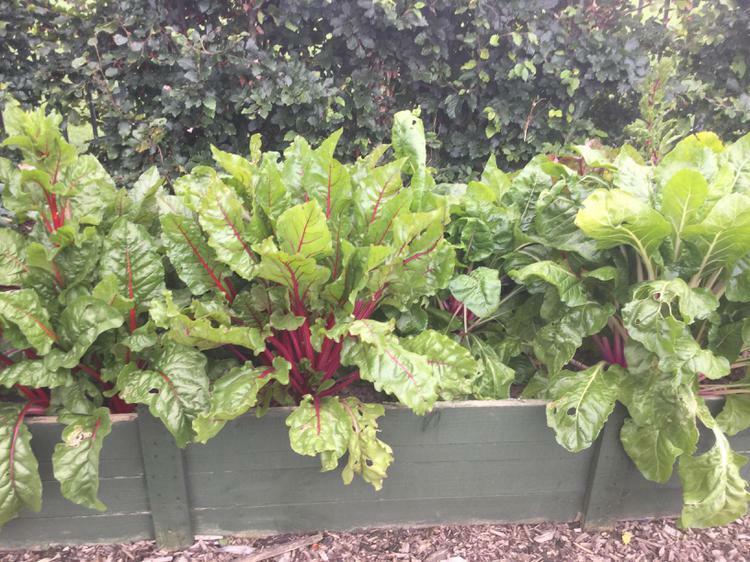 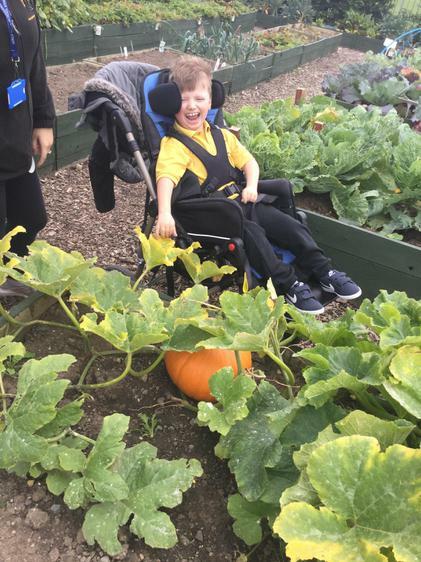 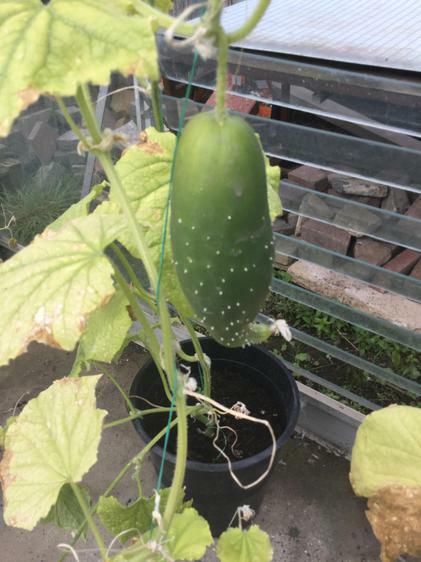 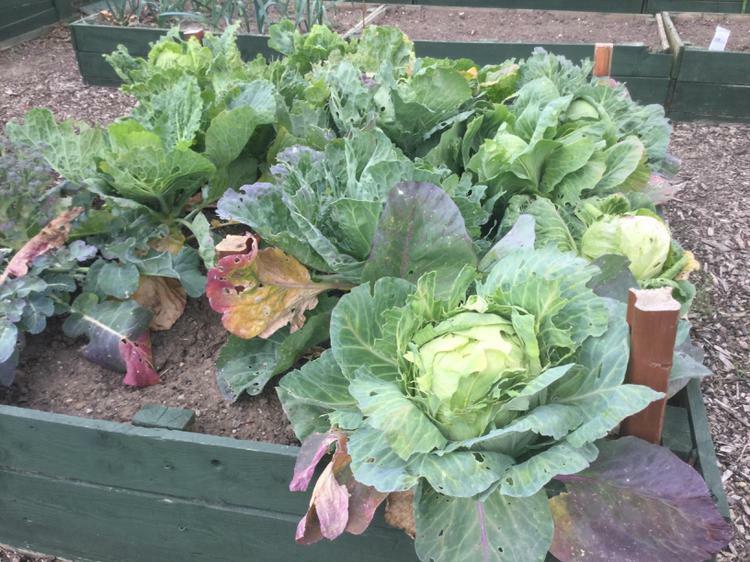 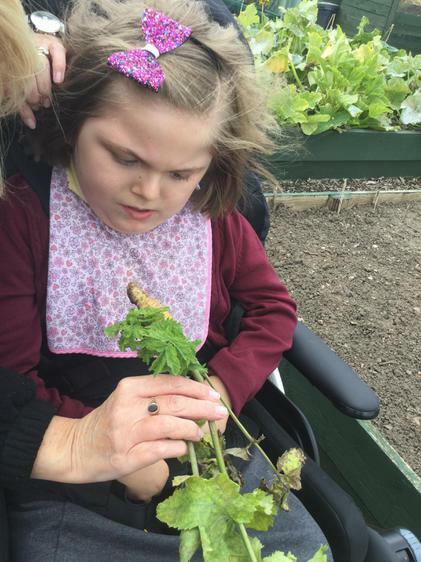 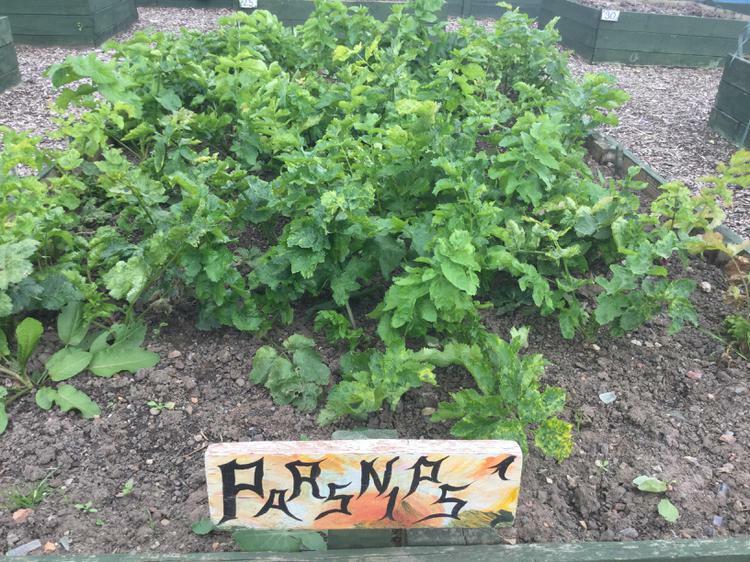 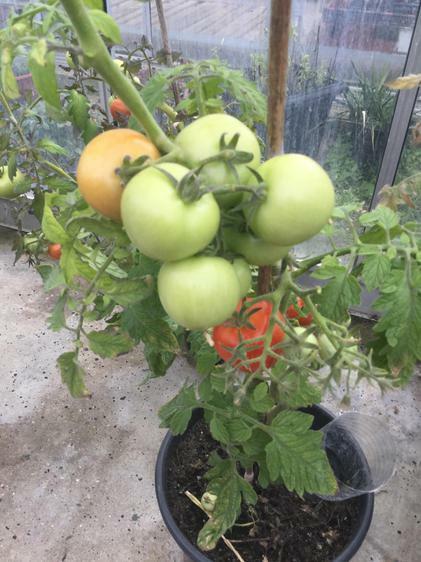 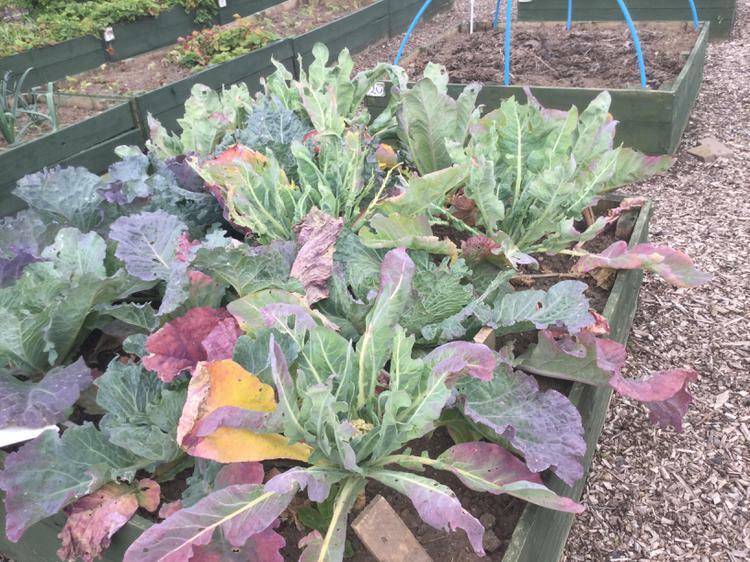 Exploring different vegetables growing in the allotment (13.09.18).